It happened again! The plan was to give the car a thorough vacuum and wash on Saturday, pack it full on Sunday and pull out bright and early on Monday February 11th. But that all changed on Saturday morning. "What if we left on Sunday?" Carol asked. "Well," I replied, "Maybe we could go as far as Binghamton New York to shorten up that long drive to Wytheville Virginia." 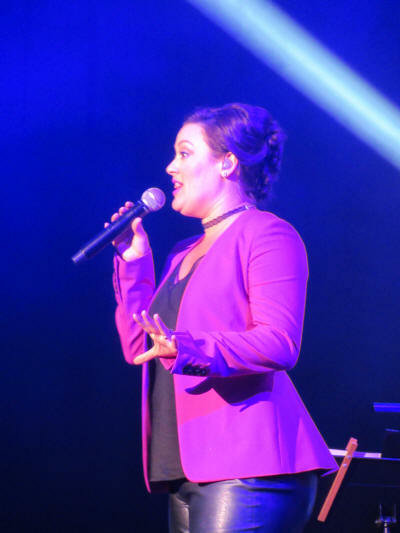 "No," she said, "What if we went all the way to Wytheville on Sunday instead of Monday, then went to Brunswick Georgia on Sunday rather than Monday. 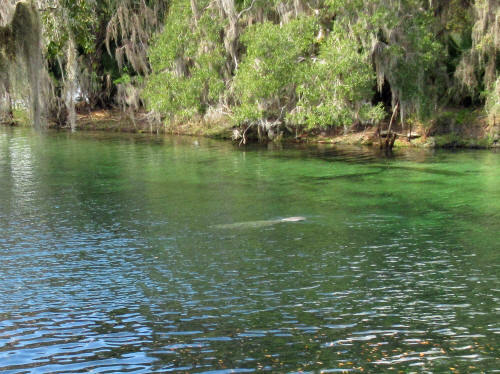 That would let us spend a night near Blue Spring State Park and we could see the manatees that live there." "SOLD!" I cried. I got right on the phone to make all the changes and set up the reservations we needed. Then we both scrambled around franticly as we tried to get everything ready for an early departure! I rolled over and opened my eyes at 3:45 in the morning. I was surprised to see light shining in from the hall. Carol was up and had the kitchen lights on! I picked up my tablet from the bedside table and sent her a Facebook message, "Can I go outside and play?" Her reply was immediate, "I thought you'd never ask!" 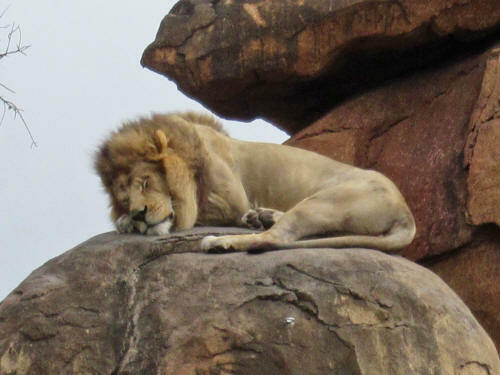 We had gone to bed early and Carol had trouble sleeping. She had been up since 3:00 a.m. and was planning to call me at 4:00. We got ourselves, and the three dogs, prepared as quickly as we could. 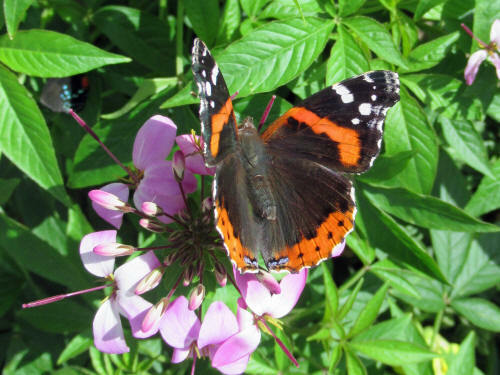 The things which would have frozen overnight in a cold garage were tucked into the spaces we had left for them, some cold drinks and sandwiches went into a couple of small coolers and we pulled away at 5:00 a.m. It was a full hour earlier than I had expected. There was absolutely no line at the border and after two very quick questions we were southbound and the US Customs Officer was once again engrossed in his paperback. We encountered a bit of 'lake-effect' or 'lake-enhanced' snow in the snow-belt zone between Watertown and Syracuse New York. It slowed us down to about 50 MPH instead of our normal 75 MPH, but we soon drove out of it. There were periodic showers all day and a few times it rained quite hard, but traffic was very light and we made very good time. The dogs settled in fairly quickly. We learned last year on our way to Fort Wilderness that things worked out best if Jak was able to curl up in a box that was strategically place so that it forced Blue to stay in the middle of the back seat. Jake just goes with the flow, so he's OK wherever we put him. 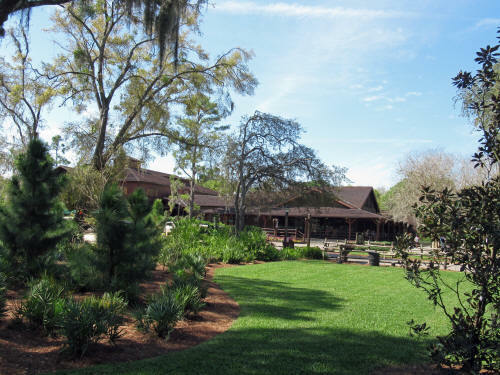 We stopped at a few rest areas to walk the dogs, stopped to refuel the car several times, and enjoyed a couple of Carol's sandwiches for lunch during one of the rest area stops. The miles seemed to fly by! We hadn't expected to get to Wytheville until about 7:00 p.m. but because of our early start and the light traffic, we rolled up to our motel at 4:45. Once we were checked in we spent some time with the dogs; they needed a good stretch and so did we! We really enjoy a Chinese restaurant in Wytheville so I drove over and picked up a take-out dinner while Carol fed the puppies in the room. After a tasty dinner we settled in front of the TV and watched a bit of the Grammy's . . . but by 9:45 our long day on the road, 733 miles of travel, had caught up to both of us! We were off to bed early! Once again we got an early start. I was beginning to rouse when I rolled over and noticed that Carol was also awake. "What time is it?" I yawned. She looked at the clock, it was 5:15 so we decided to get another early start. I had a quick shower, then took the dogs out while Carol got their breakfast ready. I had a toasted bagel at the motel's complimentary Continental Breakfast and when I got back Carol and the dogs were all set to go. We loaded everything in the car and pulled away at 6:30 a.m. By 7:00 we were heading down that seven mile-long hill at Fancy Gap Virginia. There are four or five runaway truck ramps along the slope and we plummeted down at 70 MPH in a light fog. It's really odd to me that Carol was always frightened to go down that hill in the motor home, even at 63 MPH on a clear and perfect day, but on a foggy day she didn't have a care at 70 MPH in the car. Very strange! We had our only slowdown of the day as we approached Charlotte North Carolina. 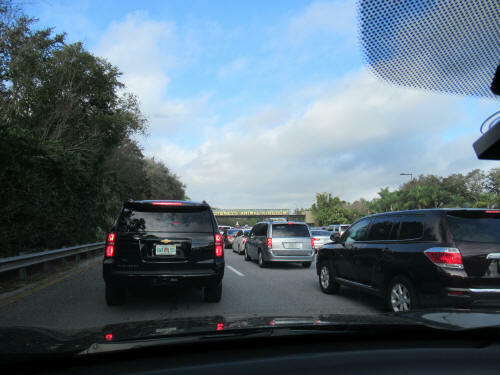 It was about 8:15 a.m. and we agreed that construction and rush hour is a bad combination. But we soon got to the I-485 bypass, skirted the city and crossed into South Carolina. 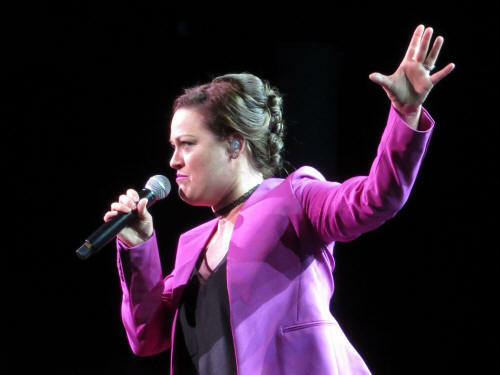 From there on the day was flawless. There were a few light showers, just enough to rinse off the car and flush away all the salt residue from yesterday! As we passed by Columbia South Carolina Carol said, "Wow, look at that!" and pointed over at the northbound lanes. Two large semi trucks had just collided and slid to a halt. Both had jack-knifed and the cab on each was obliterated. There was wreckage scattered everywhere so it was hard to tell if any cars were involved, but it's hard to imagine how any vehicles nearby could have avoided damage. We were very lucky that we weren't there while it was in progress, but we passed by before the collision began to bring traffic to a halt. 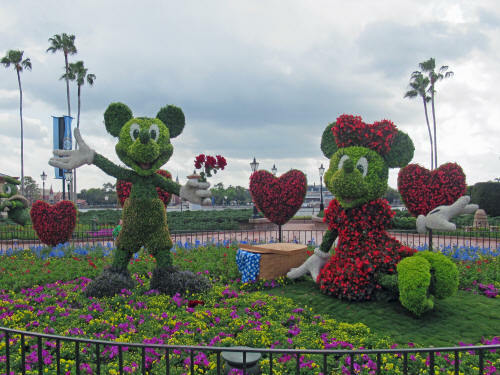 There had to have been fatalities and our hearts go out to the families! Once again we had a few gasoline stops, a few rest area stops and we ate a quick homemade sandwich for lunch along the way. Our only shopping stop was at a tacky roadside fruit stand in Georgia. Yes, Georgia is the "Peach State" so we allowed ourselves to be suckered by a series of splashy roadside billboards. 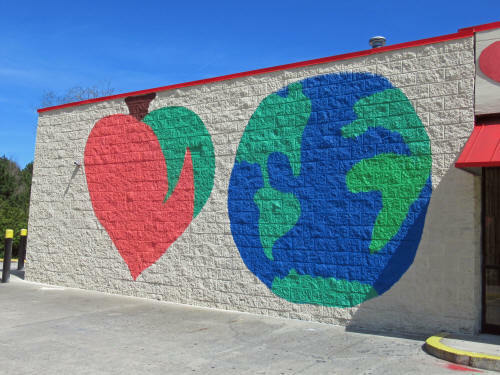 It turns out that the "Fabulous Peach World" shop the billboards proclaim is actually a lean-to set on the eastern wall of a gas station. While it wasn't as 'fabulous' as we were led to believe . . . we did enjoy tasting a few of their samples and we bought a jar of very nice peach jam. Then our 453 mile drive was over; we pulled into the hotel at 2:45 but our room wasn't ready yet so we improvised! We unloaded the dogs and tried to give them a bit of exercise as we waited. Their tennis balls are buried in the back of the car, beside the spare tire and under hundreds of pounds of our vacation gear. Rather than unpack it all to pull out a ball we tried to amuse them by tossing a pine cone. As you might expect, they weren't terribly impressed! 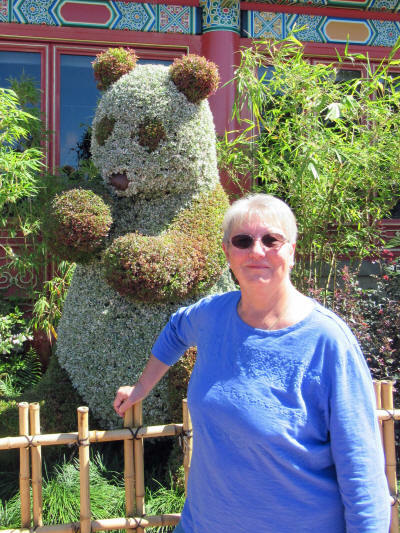 We hopped back in the car with the pups and went off in search of a Post Office outlet so Carol could mail a few things to her aunt in Reno Nevada. Our GPS gave us explicit directions to a Post Office about 2 miles from our hotel, so off we went! We pulled into a gravel lot, as the GPS directed . . . and spent a few minutes looking around. There was no USPS office in sight. In fact there was no office of any kind in sight, just a couple of derelict sheds. I pulled the car around to the front of one of the sheds and Carol hopped out of the car to look around. After a few minutes she spotted it two doors down the street. She walked over and I followed in the car. I waited a few minutes then Carol came back and chuckled as she told me the story. The Post Office shares space with a Lube Shop and Car Wash. As the postal clerk took care of Carol's needs she also had to solve problems for the car detailers and answer questions from the grease monkeys. Gotta be the strangest Post Office ever! 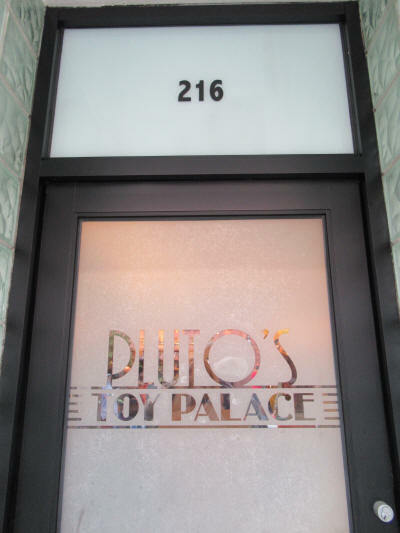 We made a quick stop at a Dollar General where Carol picked up a proper toy for the dogs and when we got back to our hotel the room was ready. We spent a while settling in and resting with the dogs, then went out and tossed the new toy for them until they were pooped! After two days in the car they were happy for some exercise. We kept a close eye out the window, watching the dogs who waited in the car while we had dinner at Popeye's just down the road from the hotel. We enjoyed a quiet night of television, and we even stayed up later than 9:45! I think it’s a corollary of Murphy’s Law . . . The morning when you have absolutely no reason to get up early always follows the night when you have insomnia! We were up by 5:45 and savoured a few cups of coffee while we browsed on our computers and caught up on the news of the past few days. Carol took the dogs out for their first walk of the morning, then I took them out again a while later. I had a toasted bagel at the Continental Breakfast just off the lobby while Carol fed the puppies, then we loaded them up in the car. It was 7:30 when we pulled onto southbound I-95. 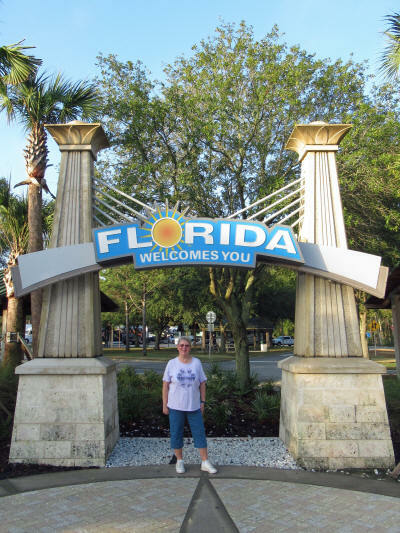 We crossed the Florida State Line at 8:00 and as usual, pulled into the Florida Welcome Centre for a glass of orange juice. Somehow the Minute Maid always tastes better there than it does at home! 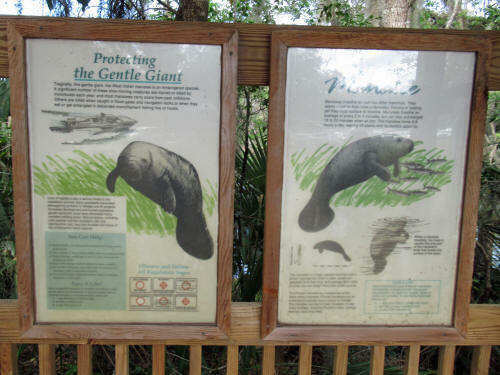 I asked one of the attendants in the Tourism Booth about the manatee at Blue Spring State Park. She said, “Ah yes, you can read all about that in the State Park brochure.” as she pulled one off the shelf and handed it to me. Carol unfolded it in the car and discovered it was nothing more than a map, showing how to find the park. It didn’t tell us what to expect! Google told us a great deal more than the Welcome Centre did! Just a few minutes later she cried out as she spotted some wild hogs along the side of the road; it looked like a mother and two young ones. How did she know they were wild hogs? Silly question, it was obvious because they were dressed in black leather! 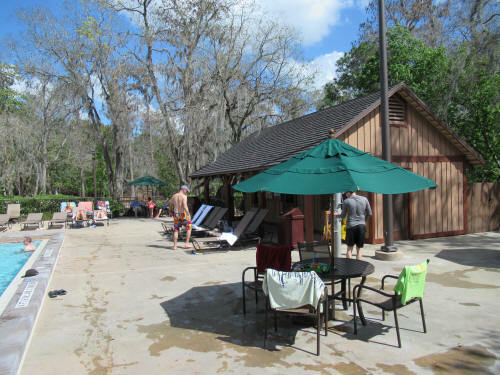 By 9:45 we had arrived at Blue Spring State Park, about 5 miles west of I-4 near Orange City. 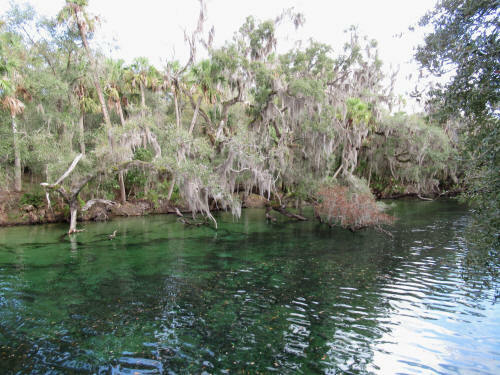 The park is situated along the shore of the St. Johns River and contains a fresh water spring that feeds water into the river. 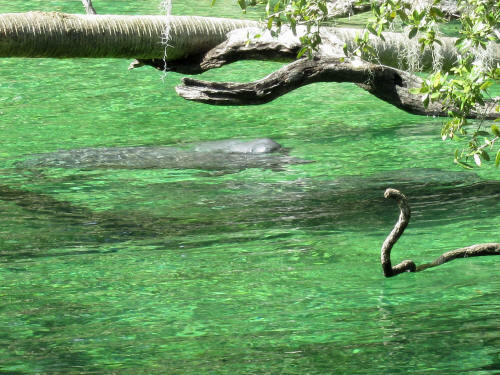 The spring water is a constant 72° year around and in cold weather manatee from the river flock to the park to find shelter from the cold in those warm spring waters. 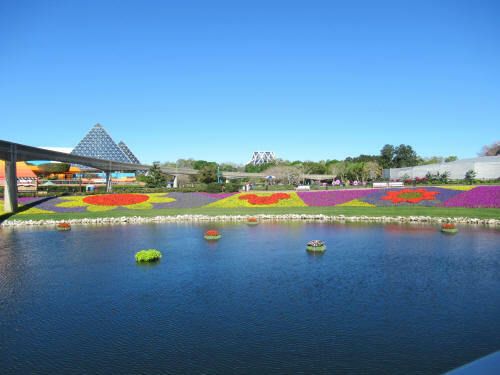 The park’s web site describes it like this! Alas, that is not what we saw today. 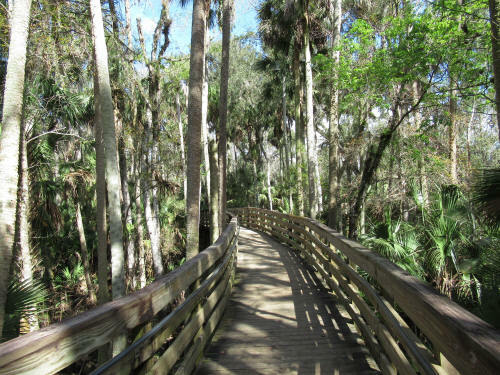 The 2,600 acre park is stunningly beautiful! 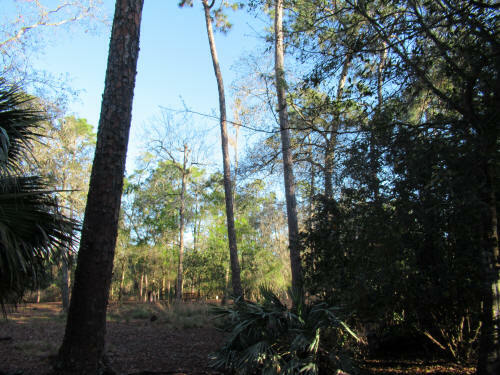 Tall old oak trees are draped with Spanish moss and they provide an almost continuous canopy over the warm water spring and the 1/3 mile-long boardwalk that follows the stream from the St. Johns River to the lagoon where the spring boils up from below. 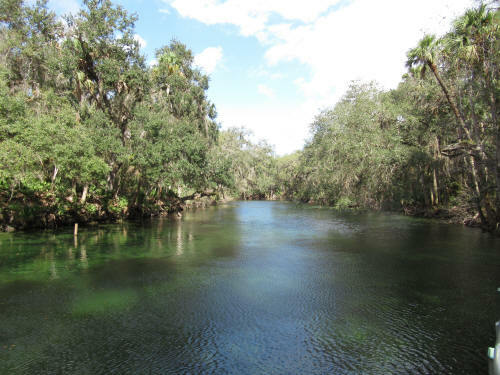 On our walk upstream from the river to the spring we didn’t see a single manatee. 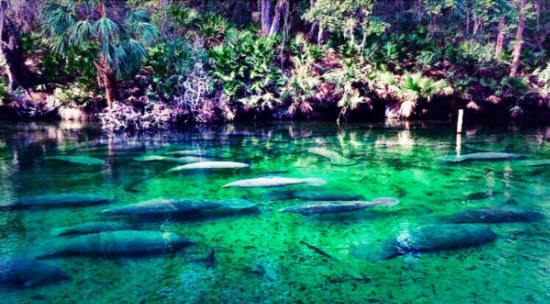 There were plenty of fish and a few turtles, but none of those interesting sea cows we had come to see. It was apparent that on an 82° day the water was warm enough for them in the river. We walked the banks of the stream from one end to the other, then Carol went on her own to the spring. 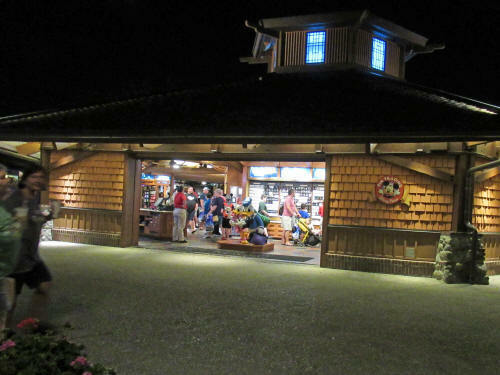 Dogs weren’t allowed along the final leg of the boardwalk as it approached the lagoon where the spring boils, so I waited by the gift shop with the dogs while Carol went off to the spring, just to be sure there were no sea beasts hiding there. Sure enough, there were none! We were dejected as we approached the parking lot. just after noon. 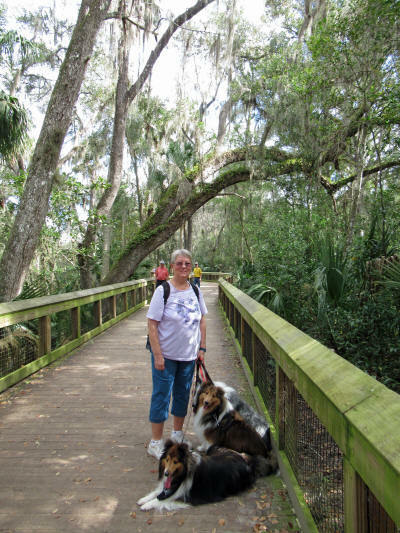 We stopped at a picnic table to give the dogs a drink before loading them back in the car, then on an impulse we popped into the boardwalk viewing station closest to the river. As I took a picture of some cormorants perched on a fallen tree I spotted a couple of large grey blobs under the surface . 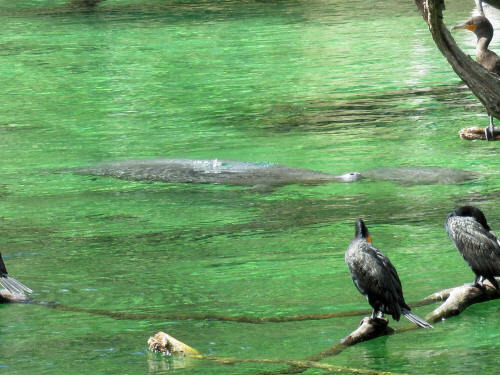 . . it was a mother manatee and her calf. Hooray! We stood for about a half hour watching. They barely moved, but we saw them each rise and break the surface to breathe several times. Carol was craning her neck to spot a turtle the folks beside us were talking about when she spotted a big grey tail out in the middle of the stream. 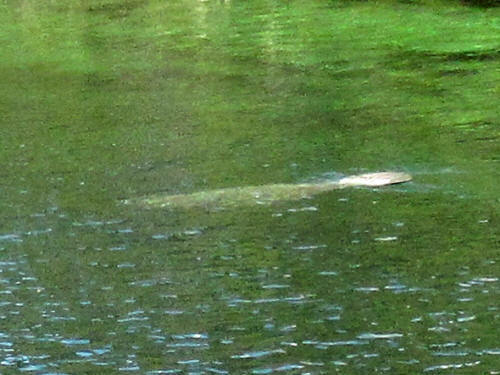 It was another manatee and this one was on the move, heading toward the river. I’m sure glad we made that impulsive stop along the boardwalk before we left. We weren’t shut-out after all! 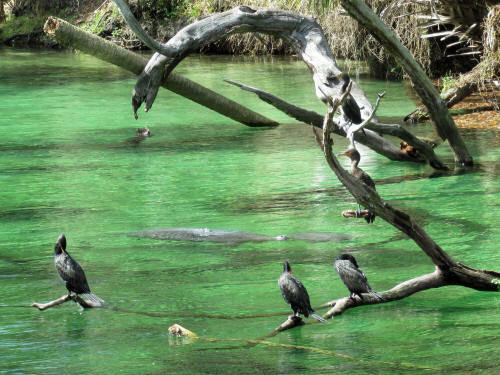 Hopefully we will have a chance to get back to Blue Spring someday . 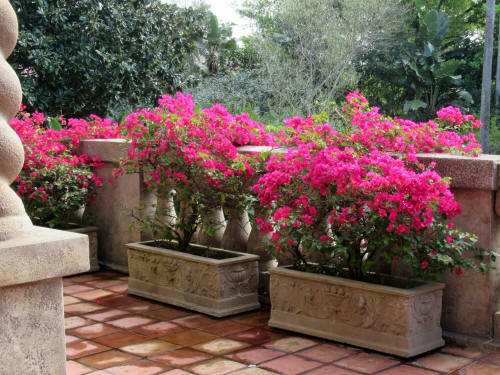 . . and we’ll definitely plan to go in cooler weather! 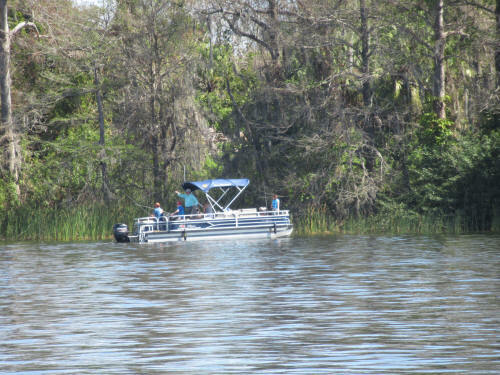 It was after 1:00 when we left the park and headed to Lake Mary, about 15 miles further southwest along I-4. We pulled off at Exit 98 where our home for the night, La Quinta Inn & Suites, is located. Hey! Look! It’s Chik-fil-A . . . we love Chik-fil-A! Let’s have lunch. 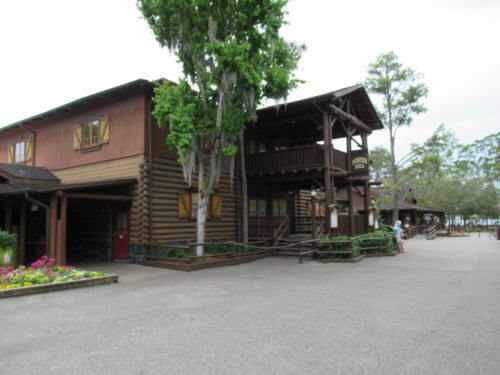 I headed into the restaurant to pick up our lunch while Carol chatted with the front desk at Disney’s Fort Wilderness Campground. They were trying to find a campsite that our three dogs would be happy with! 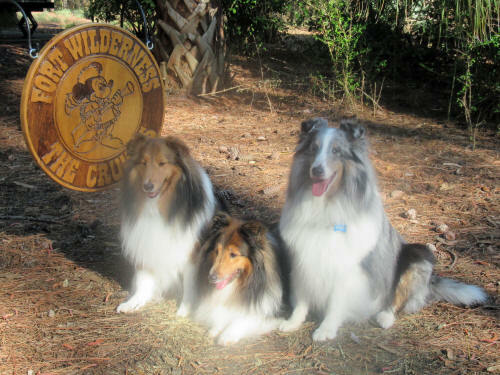 The boys decided years ago that campsites which are surrounded by cypress trees are not happy places for long-haired dogs. Those pesky cypress fronds lead to a lot more combing than Jak, Blue and Jake like! So we’re heading back to the 800 loop tomorrow and we’ll be in a campsite we’ve stayed in before. All is good! 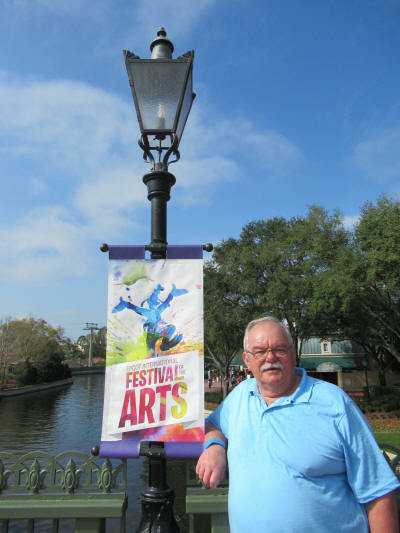 I made a quick shopping foray at Home Depot to pick up a few extra parts for Mickey Mouse lamps then we headed to our hotel. Our room was ready and we were all checked in and settled by 3:30. The dogs were bushed after their three days on the road and the long walk at Blue Spring, so we all enjoyed a soothing nap! There was a thunderstorm and quite a downpour while we rested. By 6:00 p.m. the dogs had been fed and walked again, it was time for the humans to go in search of dinner! 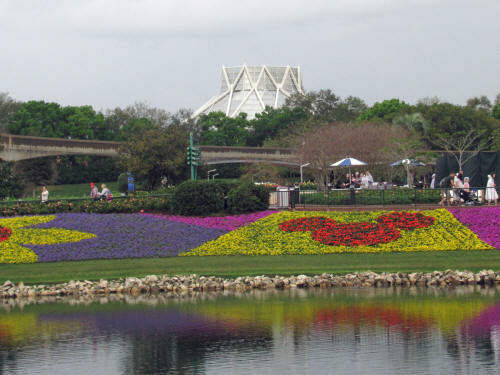 We drove up and down Lake Mary Boulevard, just a few blocks from our motel, and saw every fast-food chain. Nothing seemed to appeal to us! Then we spotted BurgerFi . . . we didn’t know what that was! It turned out to be great! We sat outside on the patio where we could keep an eye on the dogs who were snuggled in their familiar spots in the back seat. Aren’t they cute? Carol looked them up on the Internet while we waited for our food. It’s a small local chain with five outlets in the Orlando area. Carol had a cheeseburger; I had a bacon cheeseburger and we shared a combination order of fries and onion rings. BurgerFi was a good choice, the food was terrific! We took our ‘road-warrior dogs’ home and settled in for the night at about 7:30. 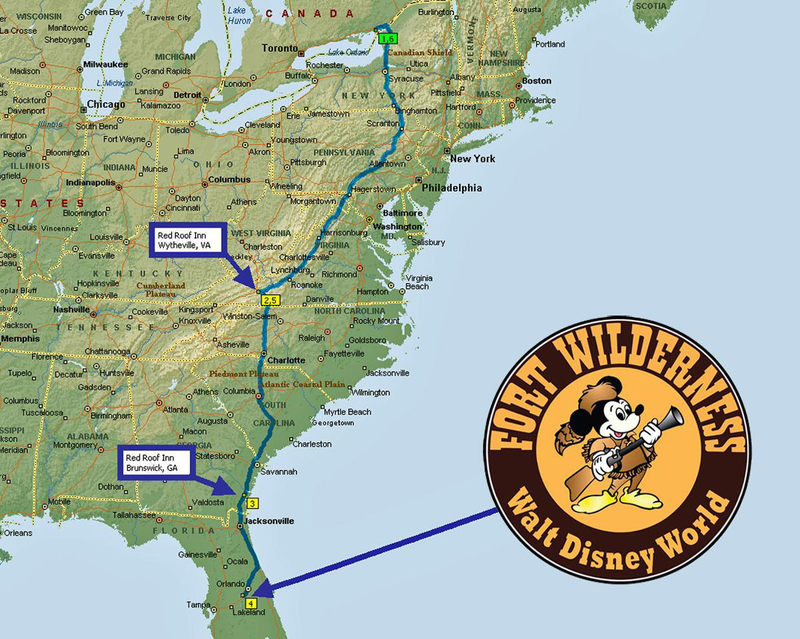 We have a quick 38-mile drive to Fort Wilderness tomorrow morning. I’m sure the dogs will be happy to stay out of the car for he next three weeks! Golf cart rides only . 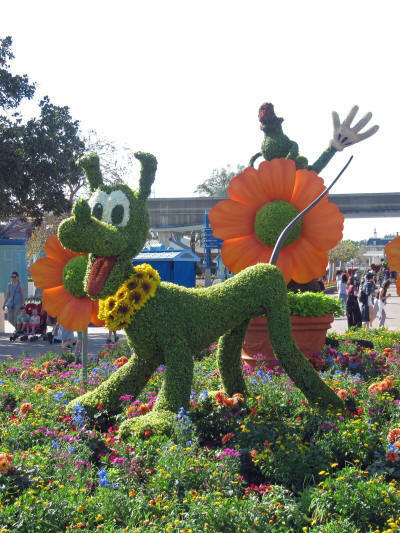 . . Yip, Yip, Hooray! Today we slept in . . . until 6:30. 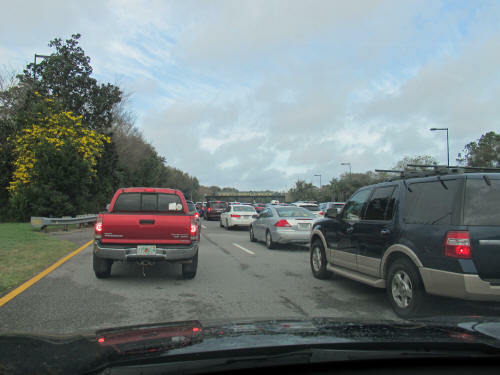 There was no need to rush; we really didn’t want to approach Downtown Orlando until 9:00 a.m.. The endless construction on I-4 is now entirely focused on downtown Orlando and the morning commute is absolutely terrible! So we took it slow and easy. I took the dogs out for a stroll in the rain, then once their business was done we enjoyed a few cups of coffee in the room. I headed to the lobby for breakfast while Carol fed the dogs, then we slowly re-packed the car and loaded up the dogs. It was about 8:45 when we pulled onto I-4 at Lake Mary. The 38 mile drive took an hour and a quarter. 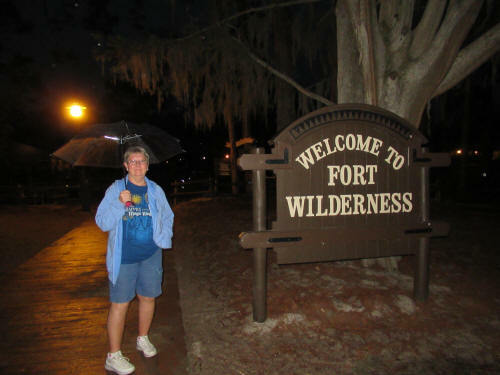 It was 10:00 when we pulled into Fort Wilderness in a light drizzle. 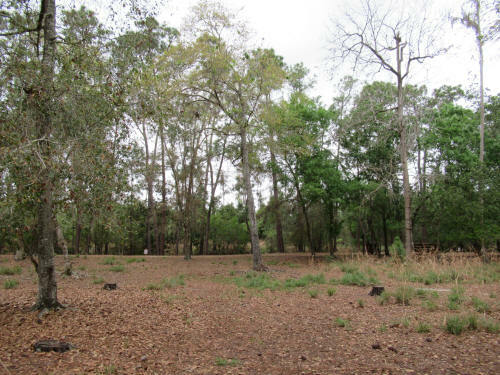 Carol had used the online check-in option, so we drove directly back to our assigned campsite, #833 and found that it was empty and clean. 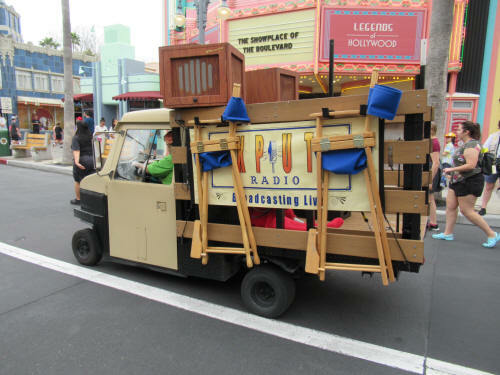 As we sat in our car looking at the site the cast member who takes care of the 800 look cruised past on her golf cart. She confirmed that the site was ready for us, she had just let the front office know, so we should be getting our text message very soon. 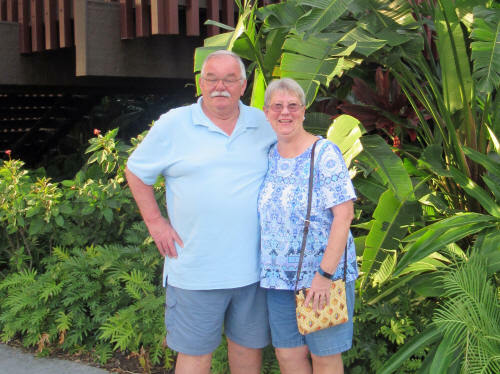 We decided to head to the nearest grocery store to pick up a few essentials, then hurry back to see if we could help Mike and Terri with the set-up. We pulled in at about 11:00 a.m. and they were getting ready to pull out. They were all finished, and the trailer was all hooked up and waiting for us. We chatted for a few minutes then they were on their way. The dogs recognized the trailer immediately . . . it’s the same one we had last year. They all hopped up the steps and assumed the sleeping positions they had gotten used to last year! Carol went inside and got to work. I pulled everything out of the car and handed it up the stairs to her; she stowed everything away. 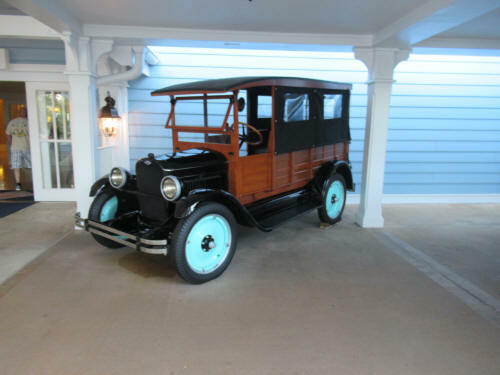 Once the car was empty I assembled the three Mickey Mouse lamp posts we brought along, stretched rope light strings along the sides of the campsite’s concrete pad, laid out the patio mat and set up a timer for the lights. Carol made us each a sandwich for lunch and after we had eaten she joined me outside. We hung a string of lights on the awning and then moved the picnic table. By 2:00 p.m. we were all done! The place is looking good! We went out to pick up our rental golf cart, then took a few minutes to relax with the puppies. 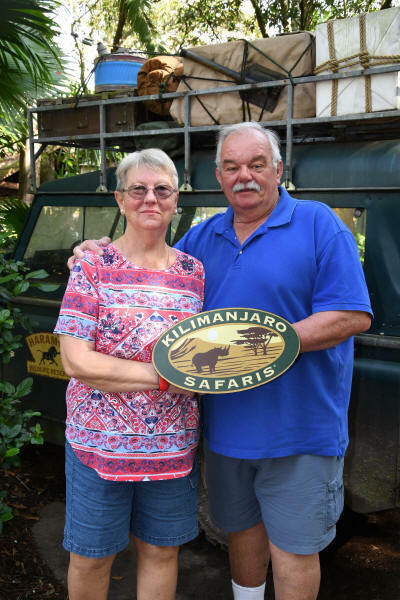 Our friends Scott and Judy have been vacationing here for 17 days and are leaving for home tomorrow. 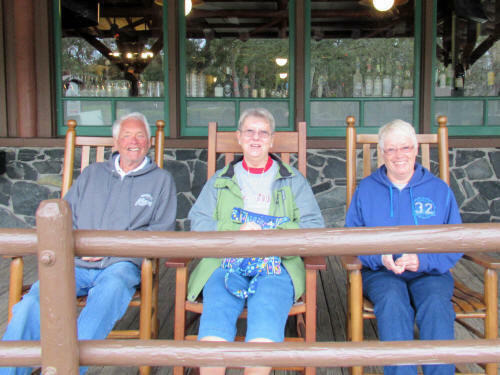 We had arranged weeks ago to meet them for dinner today so at 3:15 we drove the golf cart to Pioneer Hall where they were waiting on the veranda in a couple of ever-so-cozy rocking chairs. 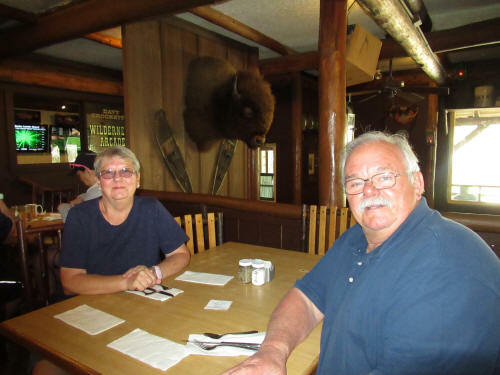 We spent about an hour back at our campsite catching up on all the fun they’d been having, then at 4:45 we boarded the golf cart once again and headed to Trail’s End for our 5:00 p.m. dinner reservation. We enjoyed a good meal and a few more laughs with old friends. 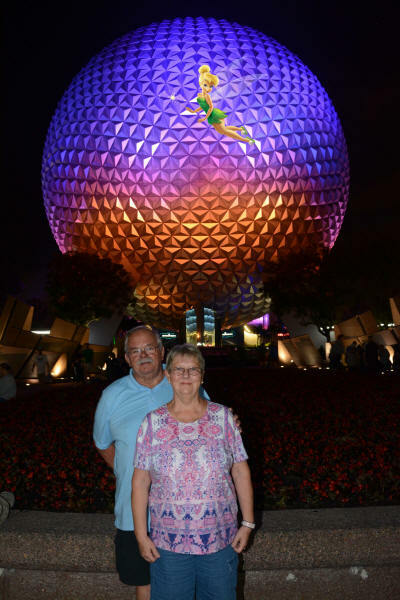 It was a terrific way to spend our first evening at Disney! 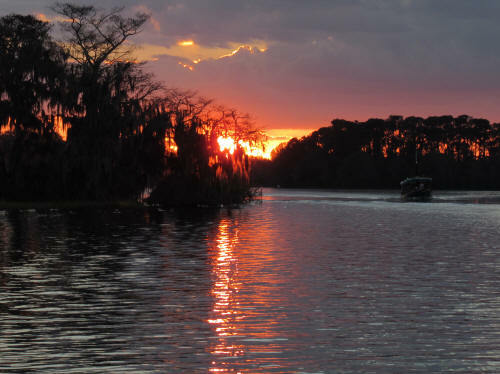 After dinner we enjoyed a fabulous sunset over Bay Lake before riding in the golf cart back to our campsite, then transferring to the car to drive Scott and Judy back to their hotel. 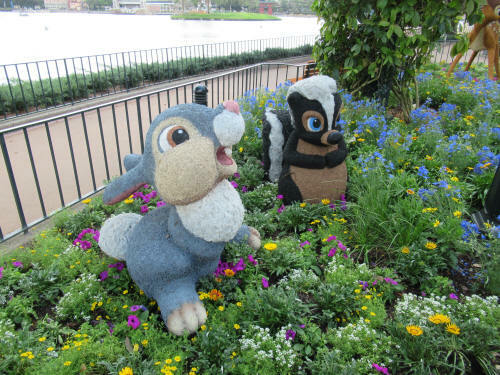 They’ve been staying at Port Orleans French Quarter which is almost next door to the campground. 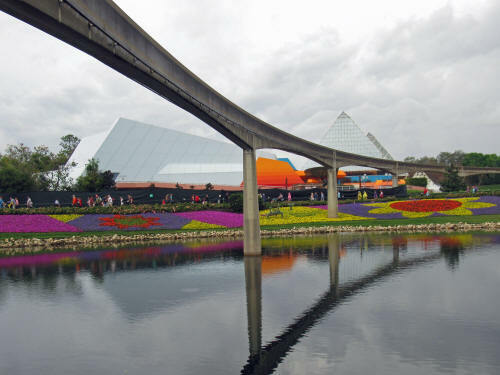 If they took the boat to the Magic Kingdom then the bus to their hotel it would have taken about an hour. We had them home in five minutes! Once we were back to The Fort I sent a text message to Tom and Krista from Sackville New Brunswick. They are fellow Canadians and fellow Disney campers. 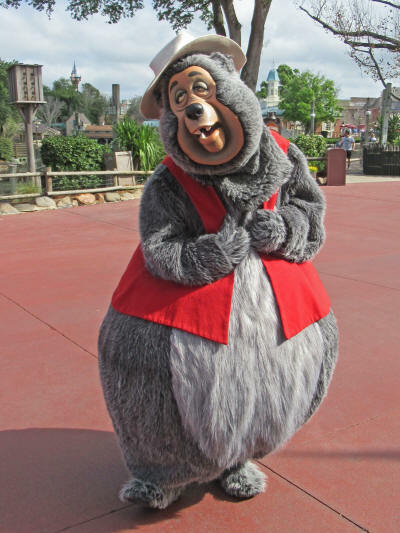 We have met them several times in the past here at Fort Wilderness. 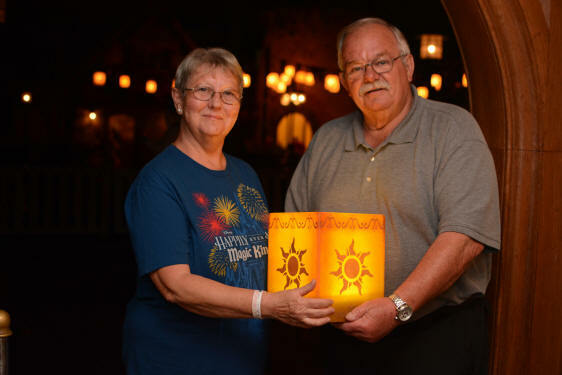 They are leaving in a few days and wanted to pick up a Mickey lamp before they left. After a short visit with Tom and Krista we settled in for a quiet night with the dogs. This will be a stressful night for them as they re-adjust to the noises of the nightly routine. 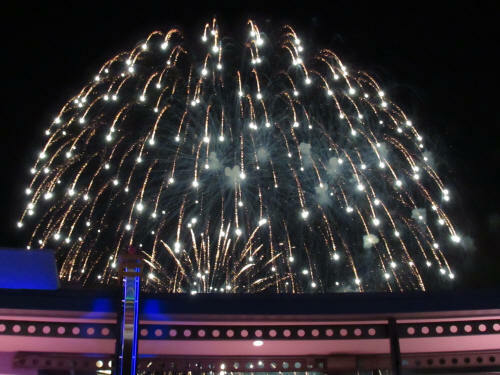 Two separate fireworks shows and the nightly water pageant keep them on edge for the first few nights, but they quickly get used to the routine. It wasn’t long before we were yawning right along with the dogs. Sleep came early! We slept in until 6:45 a.m. and before long we were both sitting outside, behind the trailer, watching the dog-walk trail that follows the canal directly behind us. There’s always something going on back there. Sometimes it’s squirrels scampering, or turkeys wandering. 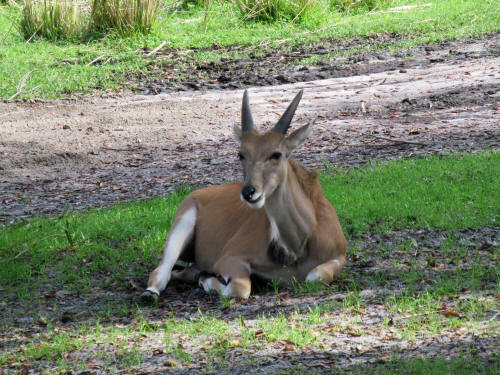 Sometimes we spot a few deer or armadillo and there are regular Segway tours! It’s a very peaceful way to greet the day! 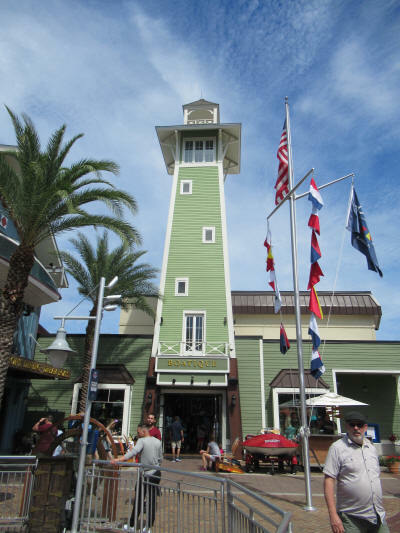 We walked the dogs again at about 8:45 and hopped in the car to head off to Disney Springs. 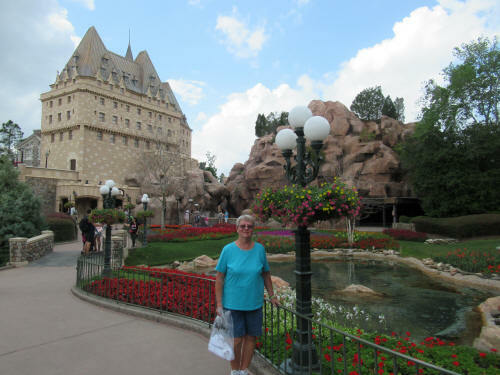 Carol had a voucher for a 5-day pass she got by cashing in some Air Miles reward points. 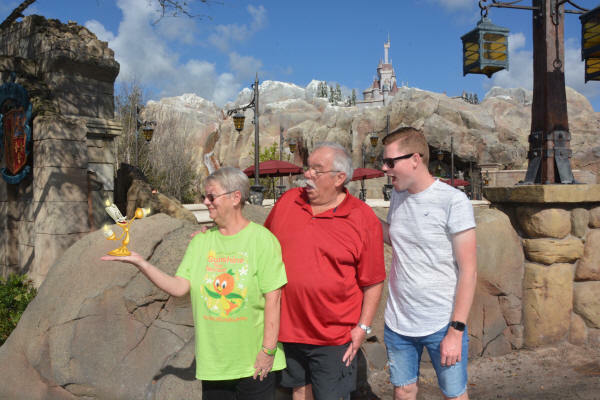 She needed to visit Guest Services to swap that 5-day pass for an Annual Pass. 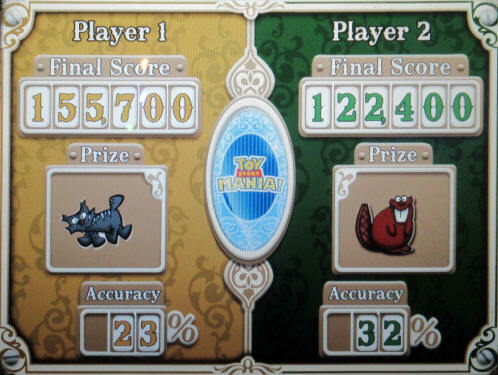 We had a nice breakfast at Earl of Sandwich, then made a quick stop at the Pin Station. There was a new release that morning and Carol had to pick one up. 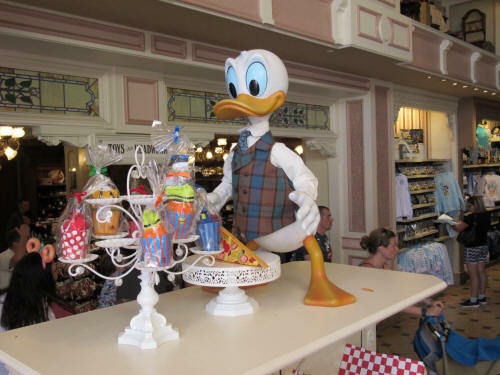 Then off we went toward Guest Services with a few quick browsing stops along the way. Guest Services was crowded by the time we got there, and we waited close to an hour before they finally called our names. Marlene from Kingston Jamaica took good care of us. 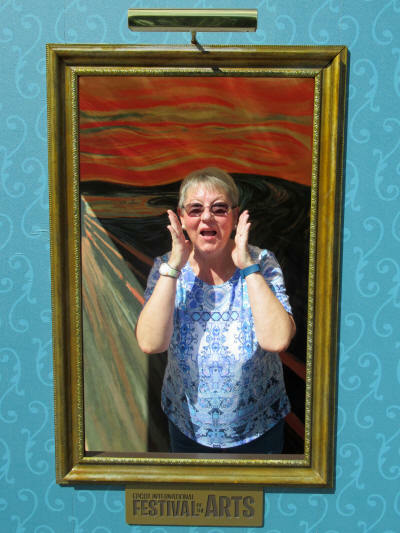 It took a while, but it worked out well, they gave Carol a credit of $315 toward her $952 pass. 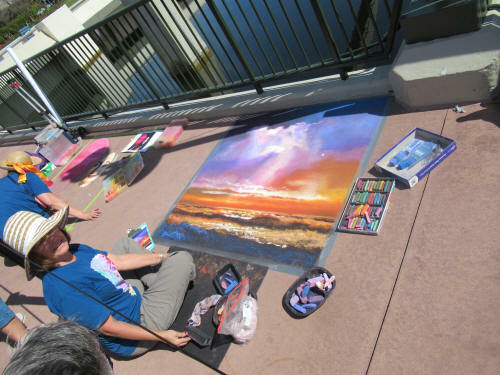 She studies all the angles and takes advantage of every discount she can when buying tickets. Carol often describes her strategy to me . . . but it always sounds like Sheldon Cooper when he talks about string theory. 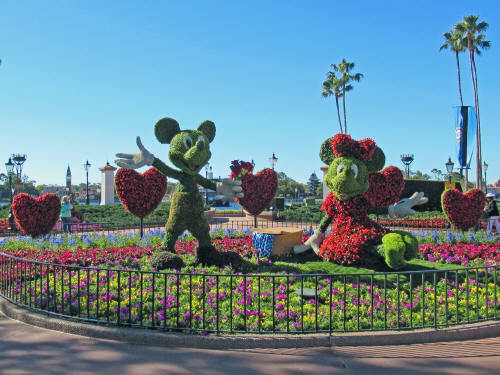 I guess that means that my Valentine really is a ‘Disney ticket genius’! 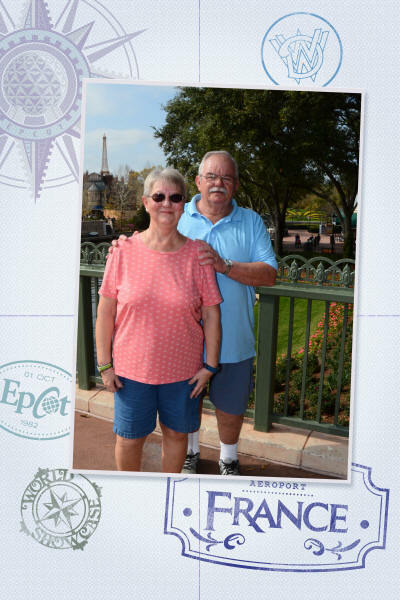 Once she had the annual pass then they began the process of matching the FastPass+ booking Carol had made using my Annual Pass with equivalent ones on Carol’s new pass. You would think this should be easy to do . . . but it’s not! It had to be done one at a time and it was 12:30 before the process was complete! 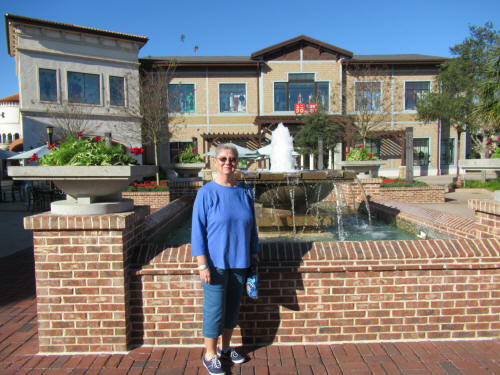 Carol stopped at the Forever After shop, near the Lime Parking Lot, and picked up the Alex & Ani Lady and the Tramp bracelet she had been reading about, then it was time to head back to the dogs. 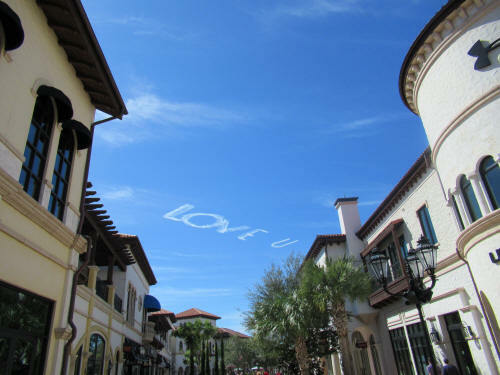 The skywriters were putting up a personalized Valentine message from me to Carol as we left Disney Springs! When we got back to our campsite there was a note from John and Sharon, friends from Lakeside Ohio. They had dropped by while we were out. 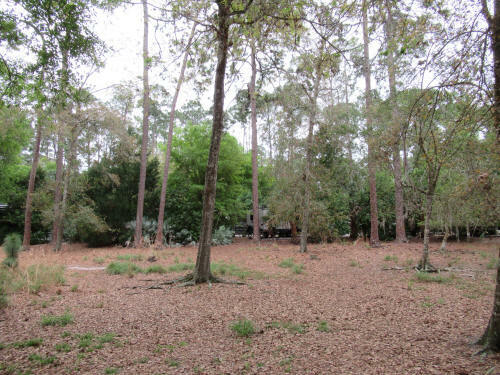 We enjoyed sandwiches in the lawn chairs behind the camper, then loaded dogs in the golf cart and drove over to John and Sharon’s campsite in the 1800 loop. They weren’t home, so we changed the names on the note they left us and stuck it in their door. 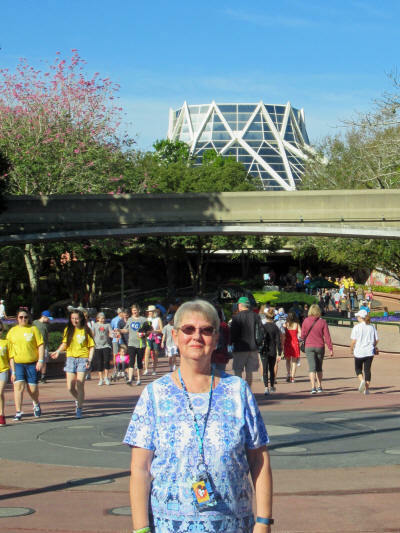 Carol shopped at both Trading Posts, the Meadow and the Settlement on our way back home. The dogs convinced us that it was time for a nap! Carol had just gotten up and I was beginning to rouse when John and Sharon rolled up on their bicycles. 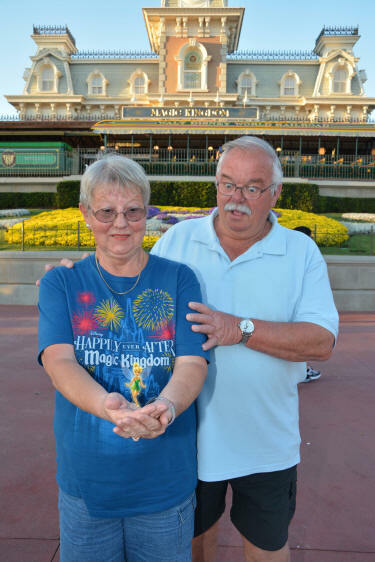 They had been to the Magic Kingdom and were just heading home. We sat on the patio and visited with them for about an hour and then Blue began to remind everyone that it was dinner time for the dogs. He can get pretty insistent! 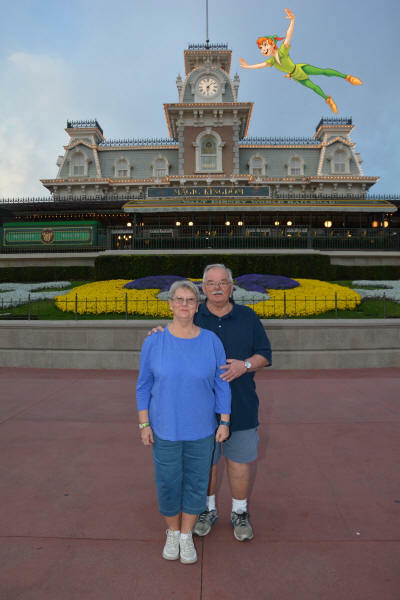 John and Sharon rode on home, we fed and walked the dogs and by 6:00 p.m. we were on the boat to the Magic Kingdom. We picked up Sorcerer Cards as we passed the Fire Hall then found a table at Casey’s Corner for dinner. 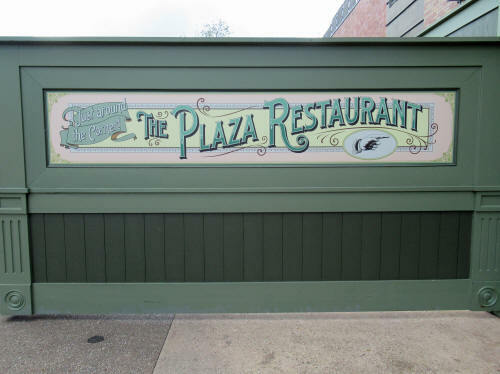 When Carol saw the line in front to the restaurant she said, “Yikes!” We gave our table to another family and carried on. 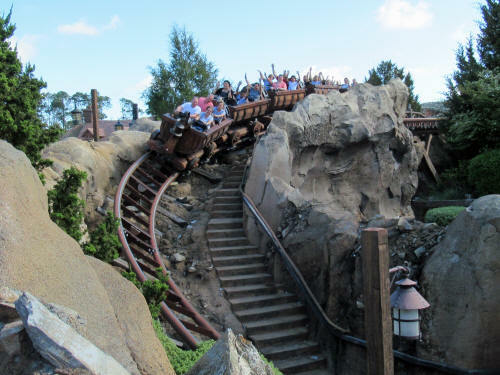 We had a FastPass at the Mine Train and couldn’t wait for that line! 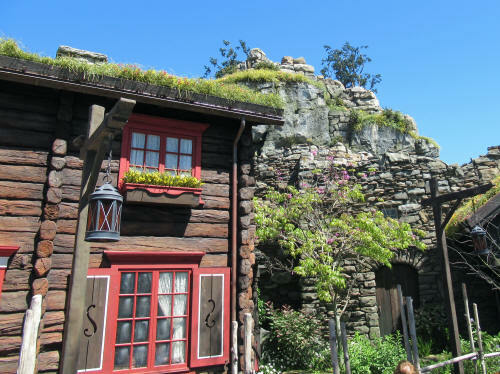 We walked through the castle and stopped for a hot dog and a bratwurst at Friar’s Nook, just across from the Seven Dwarfs Mine Train. It was good, don’t know why we don’t stop there more often! By the time we were finished dinner the end-time for out FP+ was approaching so we hurried across the concourse and joined the line. 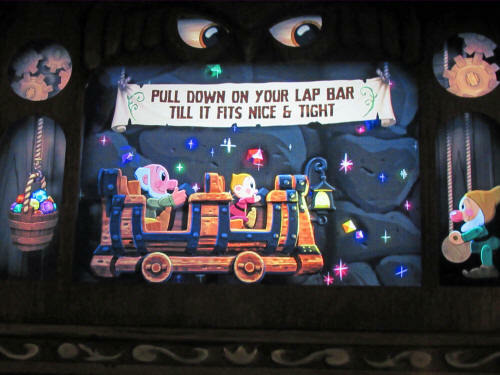 It really is a cute ride and we both prefer it at night, our eyes adjust much better to the light when we go indoors to the mine scene! 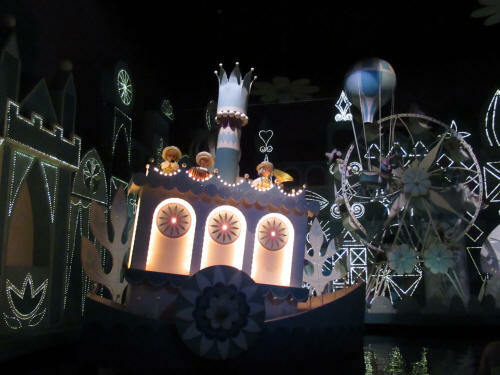 When we finished the Mine Train it was still too early for our FastPass+ at Peter Pan so we rode It’s A Small World. We have a new camera this trip and I fiddled a bit with the low-light setting. It seems to take decent low-light pictures. 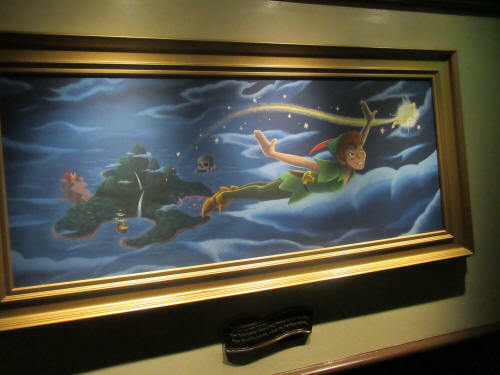 Then we took our spin through the recently refurbished Peter Pan’s Flight attraction. 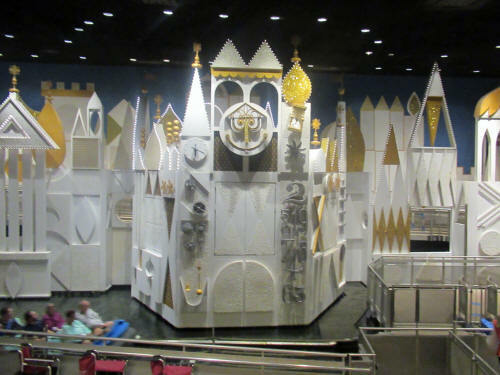 It’s been repainted and brightened up a bit, but it’s still the same old classic ride we’ve been enjoying for decades! 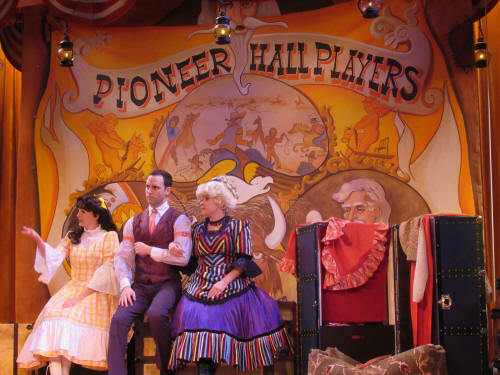 We took a stroll through Frontierland where Carol looked at pins while I grabbed a pineapple float at Aloha Isle. 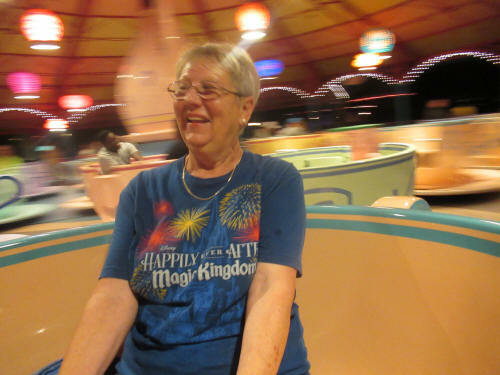 Carol went directly to Sunshine Terrace for a Citrus Swirl and we sat on a park bench and enjoyed them while we watched the Happily Ever After fireworks display. Then it was time to go! 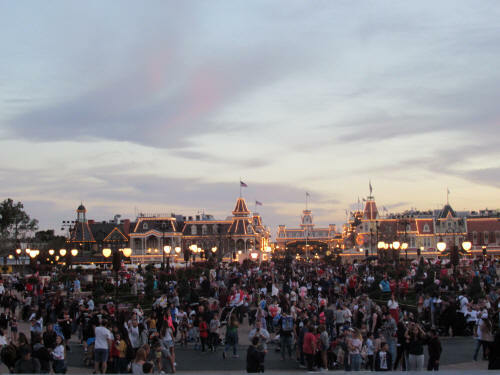 We rushed to Main Street to beat the crowd, then used the backstage shortcut to Town Square. We boarded the boat back to the campground and were home with the puppies at 9:30. After a bit of TV it was bedtime! 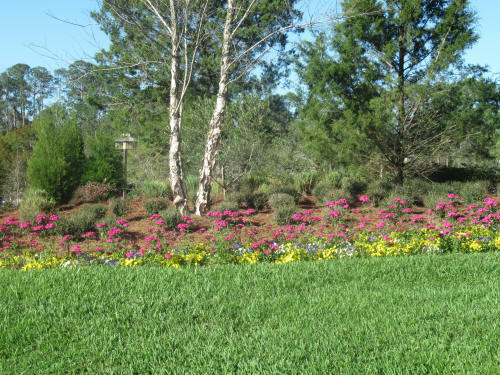 We were up at 7:00, walked the dogs and enjoyed a pot of coffee before we left for EPCOT at about 9:00. 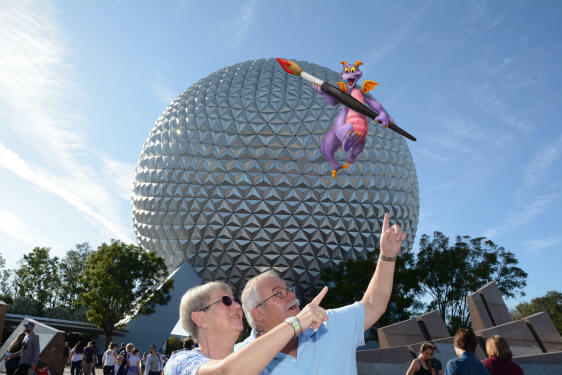 Naturally our first stop was Pin Central but there was nothing new available for Carol so we carried on to Mouse Gear where we picked up the new Figment Passholder magnets. 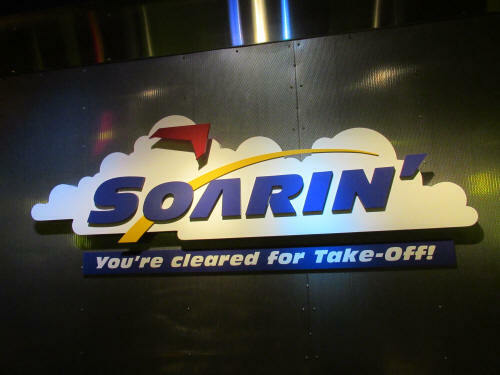 Then it was time for our FastPasses at Soarin’. 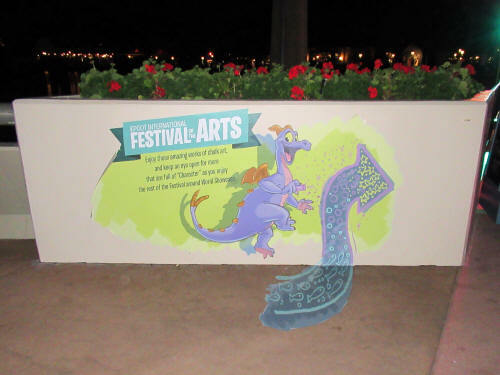 We wanted to see some of the Festival of the Arts displays so we strolled down the main concourse from the fountain toward the Port of Entry shops. 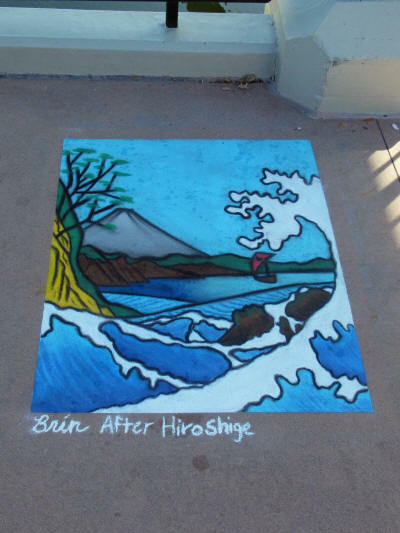 There were some chalk artists busy crafting some amazing creations along the way! 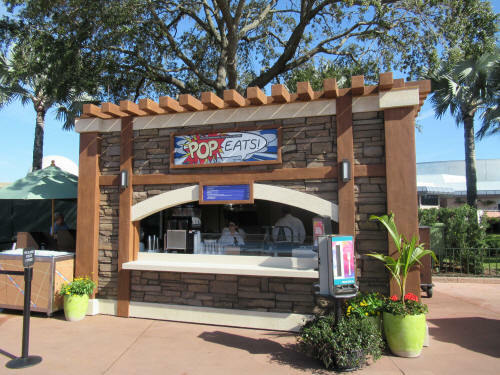 As we rounded the corner and turned toward Mexico the Pop Eats kiosk caught Carol’s eye. 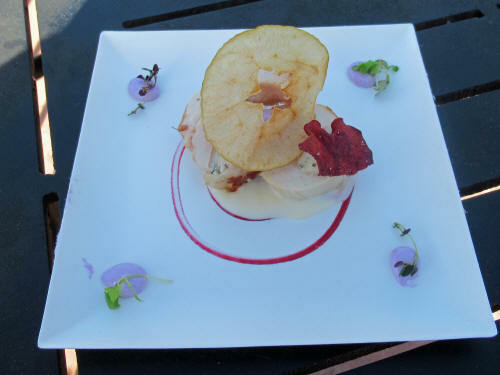 Gastronomic arts are part of the festival too, and we stopped to enjoy Sous-Vide Poulet Rouge Chicken Roulage. It’s a very tasty dish with chicken, sage and warm brie. World ShowCase wasn’t open yet so we wandered our way to Odyssey where they were just beginning to set up for a cooking show. 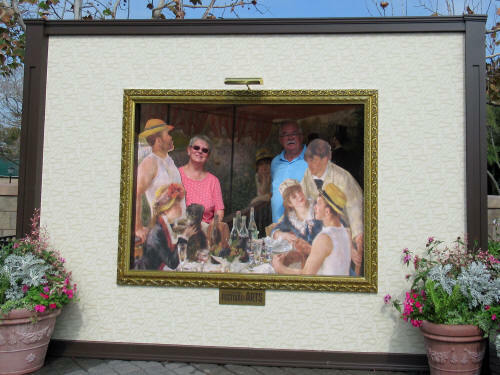 The Painter’s Palate kiosk was open so Carol picked up what they called a Trio of Savory Croissant Doughnuts. Nope, they were nothing like doughnuts! 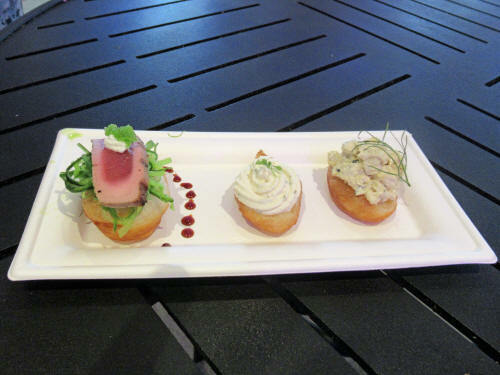 The biscuit topped with boursin cheese and garlic was nice, the one topped with chicken salad was OK but the one topped with seared tuna went directly in the trash. 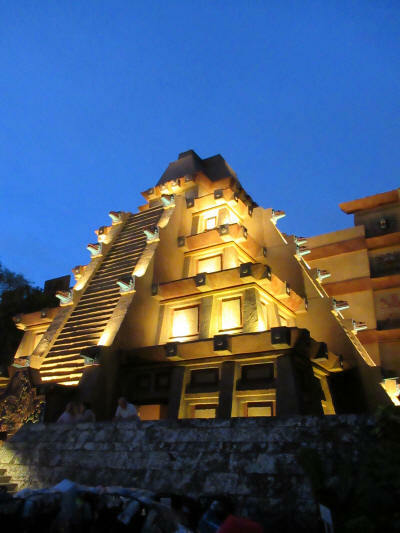 We stopped to watch the opening ceremony at Mexico. It wasn’t much more than a commercial for Margaritas. 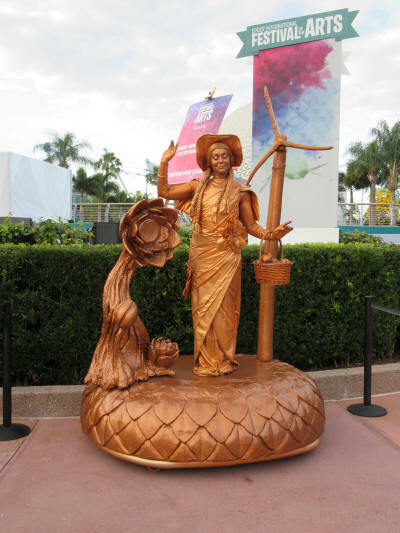 We slowly strolled around World ShowCase enjoying the Art exhibits and snapping a few pictures. At Norway we stopped in the bakery; Carol ordered a Troll Horn, a nice sweet-creamy cone shaped pastry and I tried a Lefse, a Norwegian churro-ish thingamabob . . . the cone was good the churro wasn’t. As we passed through Germany the Werther’s shop cried out to Carol (as it always does) so she bought a bag of caramel corn to bring home. When we reached Morocco we caught one of the Friendship boats. We were the only guests aboard for our voyage to Canada. 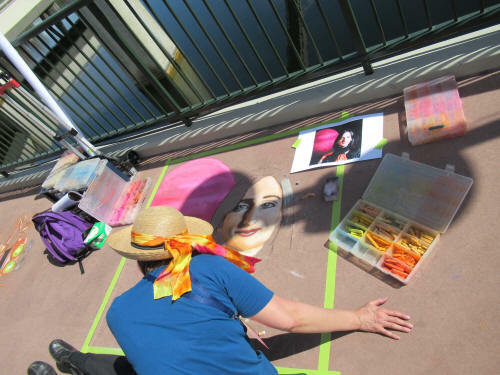 We browsed both of the shops at Port of Entry after landing, then enjoyed a bit more of the chalk art along the concourse. It was 12:45 when we left the park, We were home to dogs at 1:00 p.m.
We enjoyed a quiet afternoon. We sat out in our lawn chairs, overlooking the dog walk and canal, and watched the dog walkers, wild turkeys and Segway tours pass by. Jake was very proud of himself when he treed a squirrel! He bounced and yipped under that tree for about five minutes! Carol fed the puppies a bit early and we walked them along the canal before leaving for dinner at 5:15. 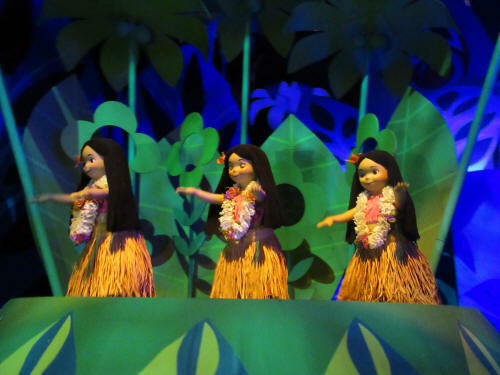 It was another terrific meal at ‘Ohana. Although we were a bit disappointed with the salad, it’s now spinach which we don’t enjoy at all in a salad, the rest of the meal was as good as always! Our serving team of Bridget and Mauricio were good, the food arrived at just the right time and we never felt rushed!. Our last stop of the day was at a nearby Publix supermarket where Carol picked up some groceries. We were home at 9:00 and watched some TV. We seem to have hit our stride; we were up at 7:00 and followed our typical routine . . . coffee, shower, feed and walk the dogs then head to a park. 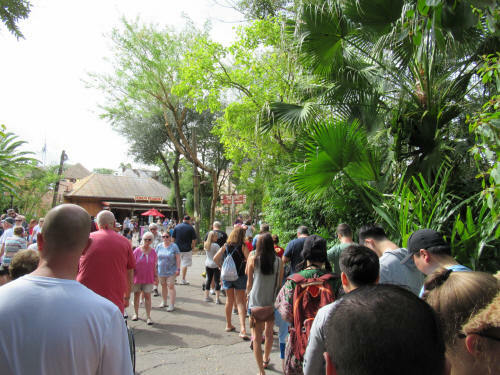 By 9:00 a.m. we were at the gate standing in a huge line for entry to Animal Kingdom. 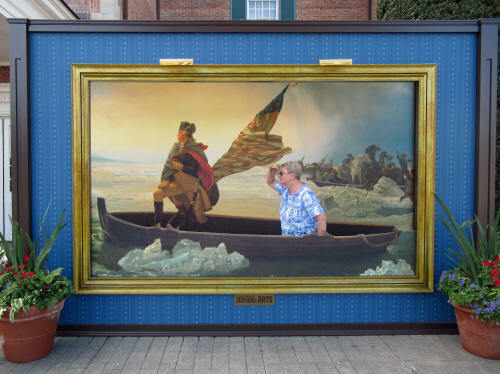 It’s President’s Day Weekend and that means it’s a people-bomb for Disney. The crowd was HUGE! 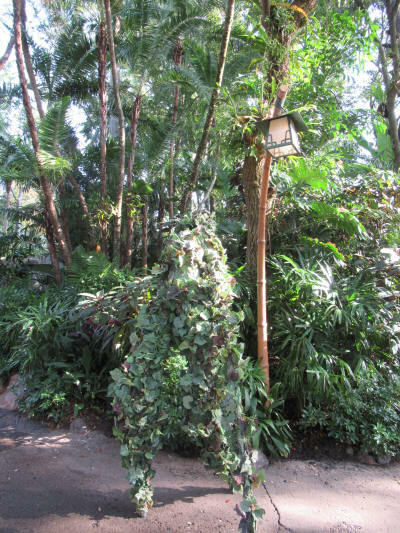 Once we got through the mob scene we took right-hand trail to Discovery Island, that’s where DeVine often performs in the morning. 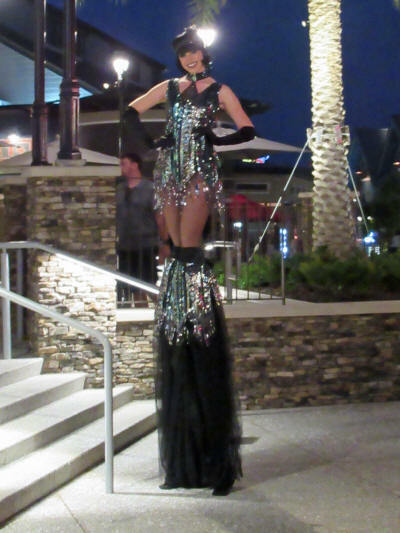 Sure enough, she was out and Carol got a few good pictures of the amazing stilt performer. Just a bit further up the hill a colourful pair of macaws were putting on a show - squawking and fluttering their wings. 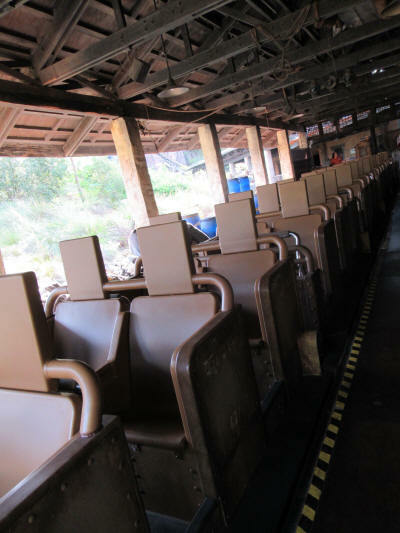 Because of the crowd we took the quieter route through Dinoland to Expedition Everest. 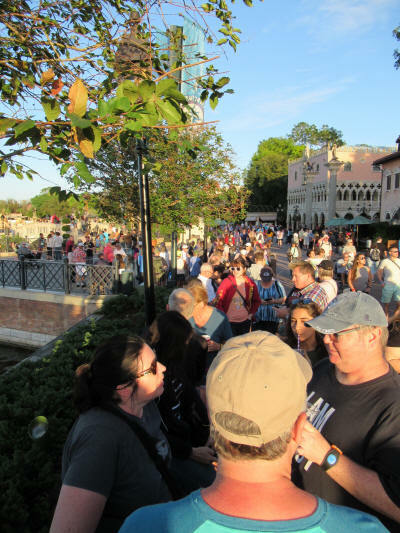 Yikes, there were throngs of people waiting outside the Standby Line entrance. 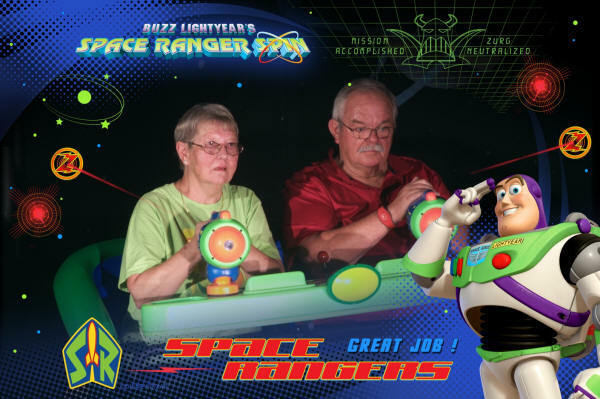 We were glad to have FastPasses. 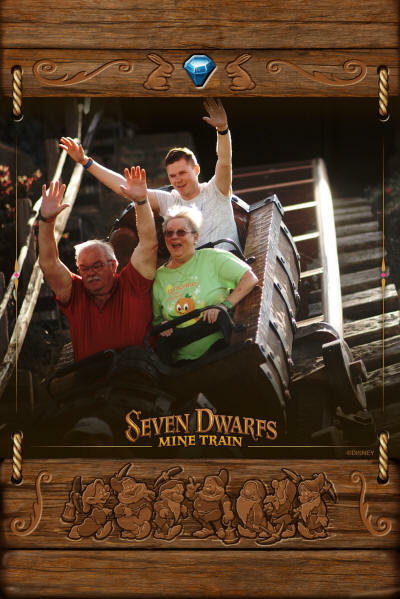 We asked for the front row and this time we didn’t have to wait for the next train, they just waved us down to row one. 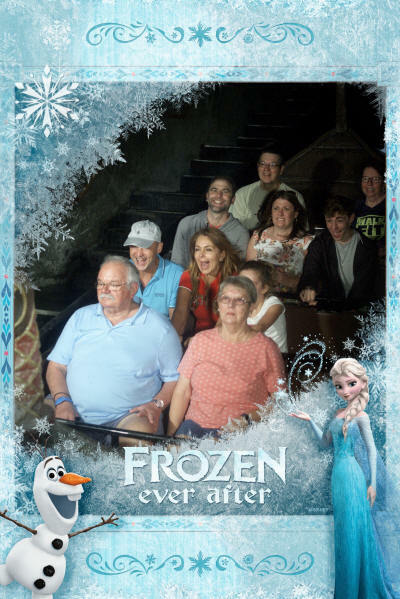 The ride is always better ‘up-front’! 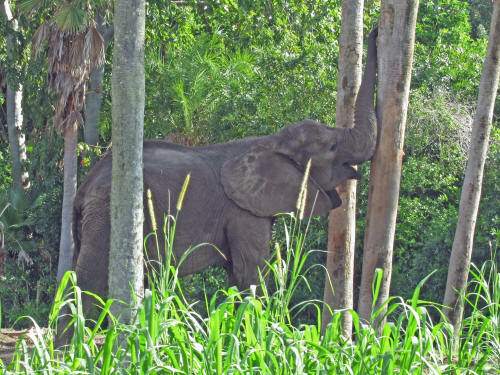 Our next FastPass was for Kilimanjaro Safaris so we hurried off toward Harambe Village. 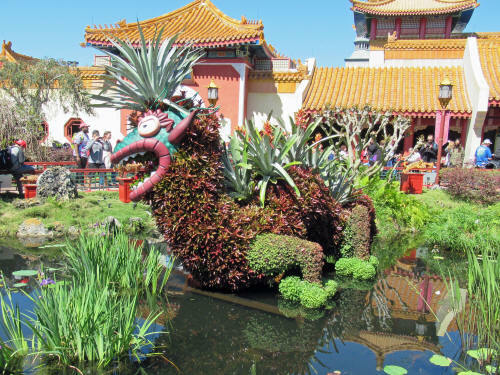 We spotted Kevin at the Asia gateway and stopped for a few pictures. 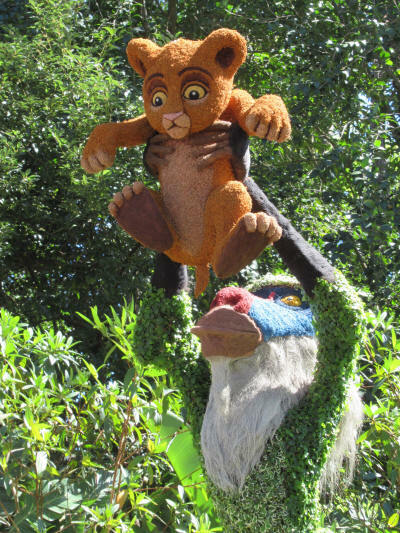 It was our first encounter with this new character in the park. 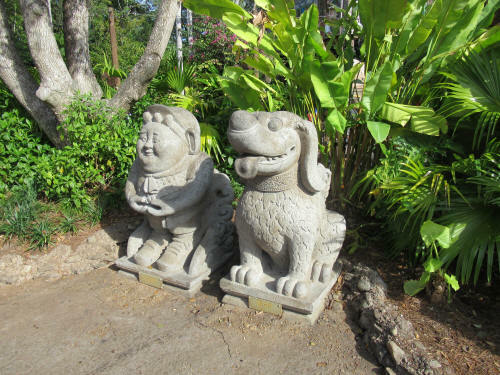 We also spotted a new statue, Russell and Dug, outside the theatre where the mediocre ‘Up: A Great Bird Adventure’ has replaced the great old ‘Flights of Wonder’ show. Sometimes change is not good! 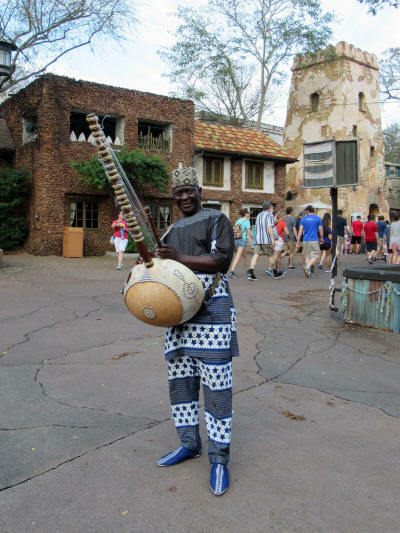 We paused for a few minutes to watch a musical performer in Harambe Village then went on to Kilimanjaro Safaris for a ride through Africa. 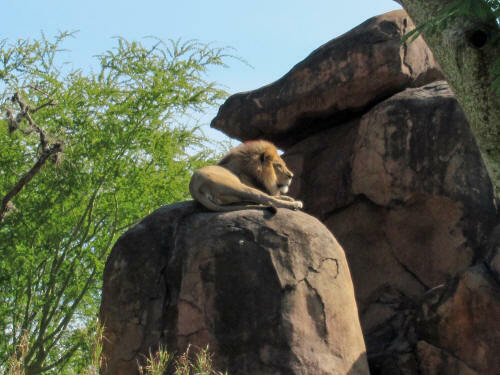 There were plenty of animals we did not see today, but some of the ones we did spot gave us a spectacular view! 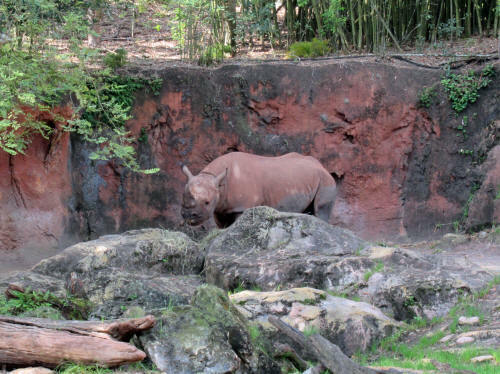 The Black Rhino usually stays toward the back but this morning he was right out front! 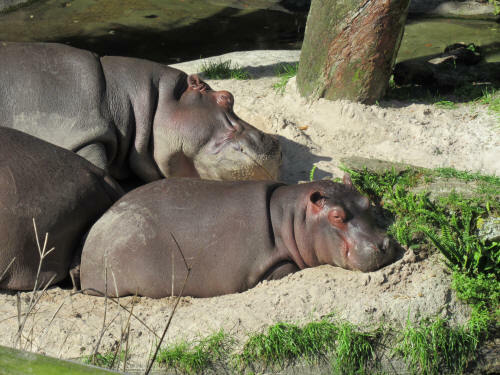 The new baby hippo and his momma were sleeping right out in plain sight beside the road. 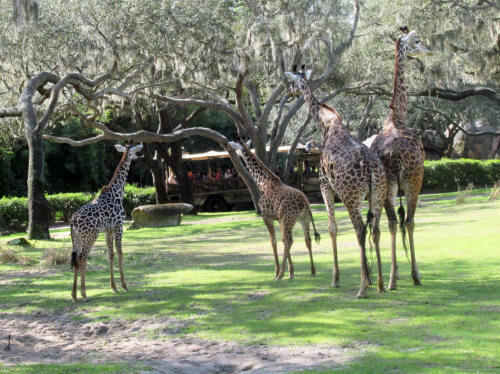 A pair of baby giraffes were cavorting with their mothers on the savannah. 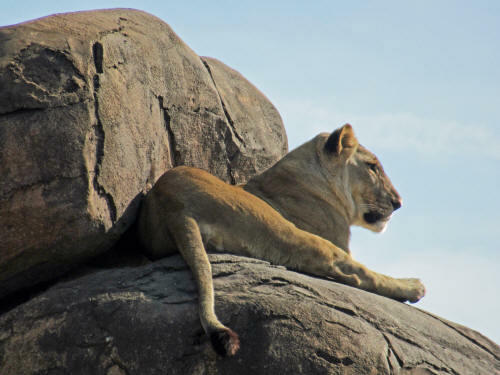 The highlight of the safari was the magnificent shot Carol captured of one of the female lions. 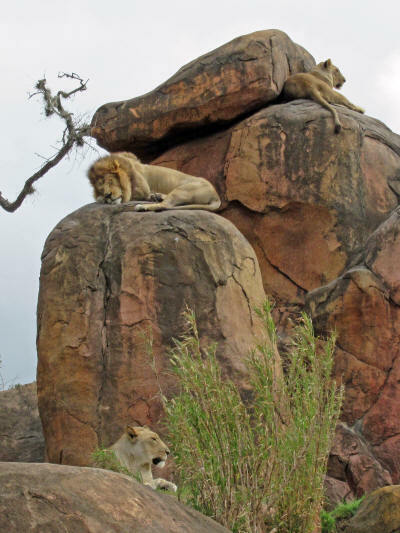 She was perched right up on the very top of the kopje rocks. 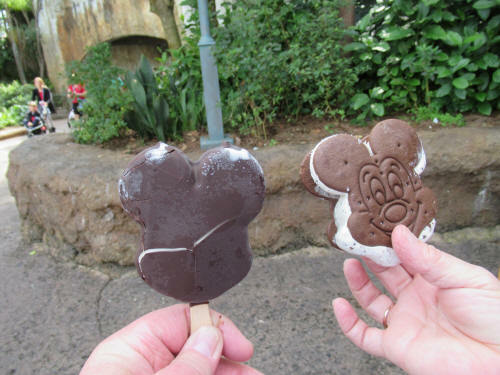 We stopped for a Mickey Bar and a Mickey Ice Cream Sandwich on our way to Pandora. 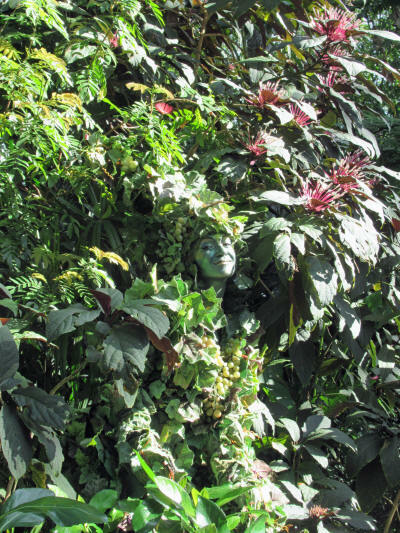 We had FastPasses for Flight of Passage. 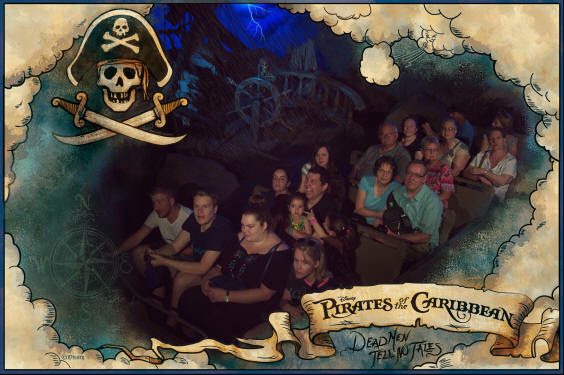 We chatted in line with a family who were riding for the first time, then rode our banshees directly beside them. It was fun listening to them after their ride . . . they sure enjoyed it! That was enough, it was time to leave the crowds behind! 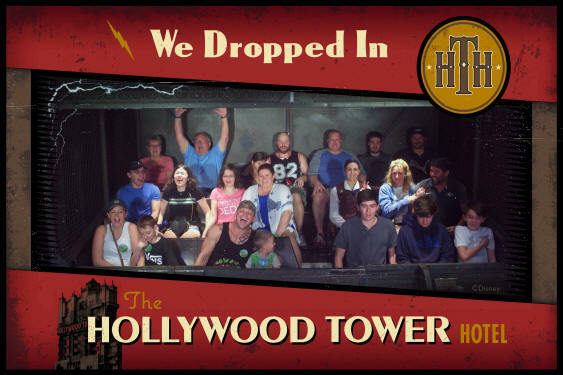 We left the park about 12:30. 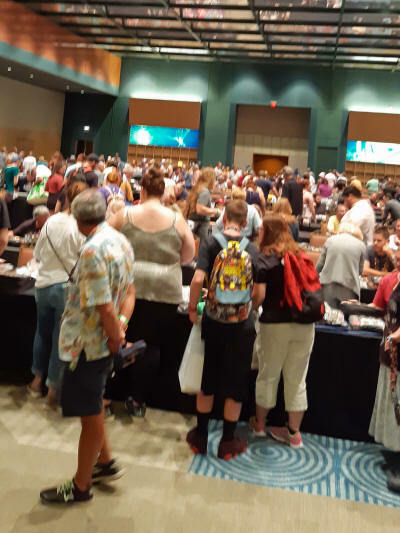 I dropped Carol at Holiday Inn near Disney Springs for a pin trading event then went home to let the dogs out. We all lounged outside until about 2:30 when Carol texted. She was done so I drove over and picked her up. We were just entering the campground when friends Curtis and Alek texted they were on the way. 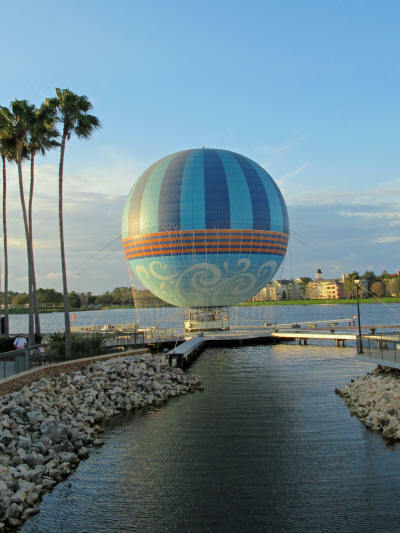 We dropped off the car and took the golf cart to the parking lot, picked them up and chauffeured them to the marina where they sailed off to the Magic Kingdom. We had a quiet afternoon (nap). Curtis and Alek were back at 7:25; we picked them up at the marina and visited at our campsite for a while. 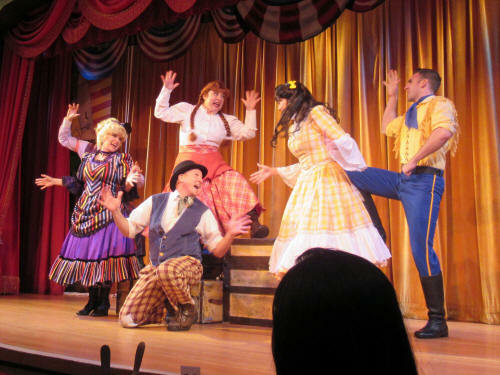 The four of us left at 8:00 for dinner at the Hoop-Dee-Doo Musical Revue. 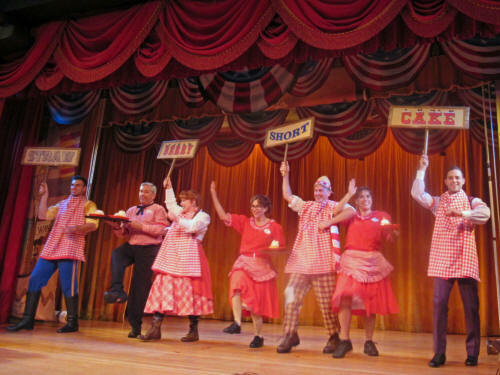 It’s a great old show and it’s virtually unchanged, still the same old corny jokes they’ve been using since the show opened at Fort Wilderness in 1971. It was a nice meal and we really enjoyed spending time and sharing experiences with Curtis and Alek. It was almost 11:00 p.m. when we dropped them off at their car in the parking lot and scurried home to our waiting dogs. Carol was up at 6:30 and I followed a few minutes later at 6:45. We enjoyed coffee outside, watching a cardinal flit around in the trees and shrubs beside our camper. The dogs lazed around beside us, cardinals don’t excite them at all. We spent a few minutes posing the dogs for some portraits. After the photo-shoot we rewarded them with a long walk along the walking trail that follows the canal directly behind our camp site. Jake treed two squirrels, but he didn’t even see the other 15 squirrels! We tossed the ball behind the camper to give them a bit more exercise . . . the guys are missing the off-leash dog park. 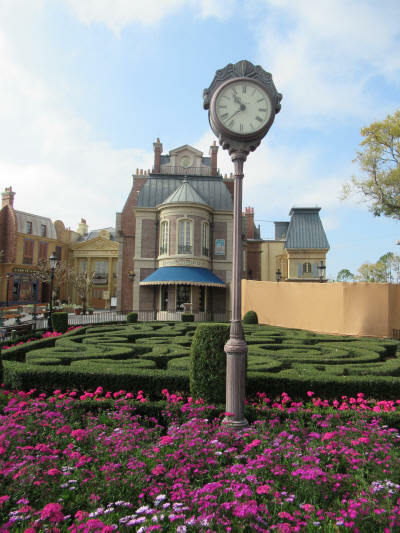 It’s being refurbished and will be closed for almost the exact dates of our stay! 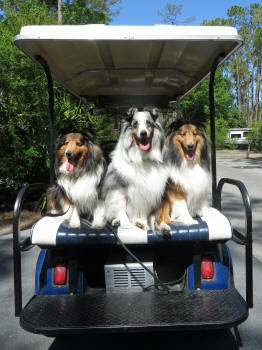 As a final treat for the pups, we loaded them in the golf cart for a ride. Jak was so excited about the golf cart ride that he tried to jump into the cart through the windshield. That didn’t work out too well for him! He wasn’t hurt though . . . just a bit embarrassed. 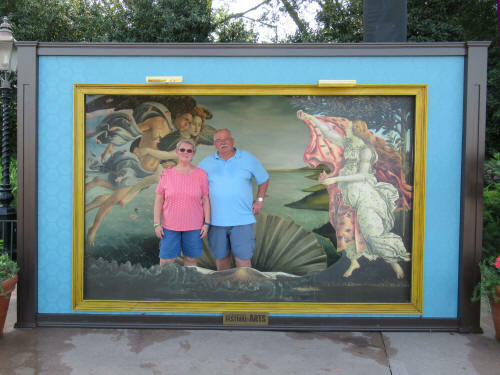 Once we finished touring all around the campground we closed up all the windows in the trailer, turned on the A/C for the dogs and headed off at 11:00 a.m. to meet our friends Al and Jane, from Missouri, for brunch at Art Smith’s Florida Homecoming. 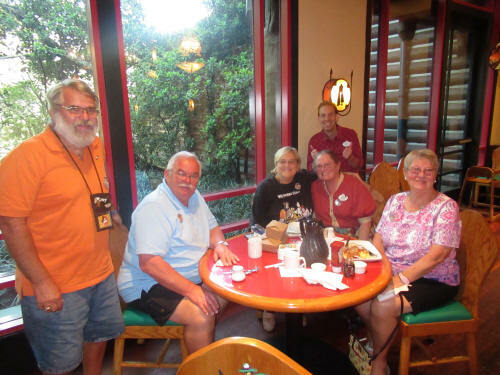 We had a really nice visit with them over some good food, then confirmed a date to hook up with them again for breakfast at Whispering Canyon Cafe. Our next stop was Wal-Mart where we picked up a few things that were on our shopping list to take back home to Canada in a few weeks. While our countries and our cultures are so similar in some ways I’m often surprised by the many differences, particularly in retail consumer products. Would you believe that we have friends who really prefer Heinz ketchup from Canada? It’s distinctly different from Heinz ketchup made in the USA! We were home with the dogs by 3:00 and enjoyed a nap! 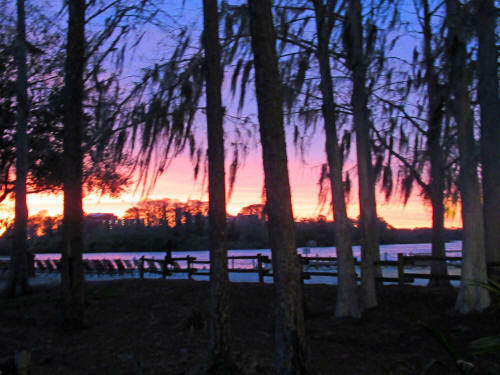 By 5:45 the dogs had been fed and walked and Carol and I took the golf cart to the marina. 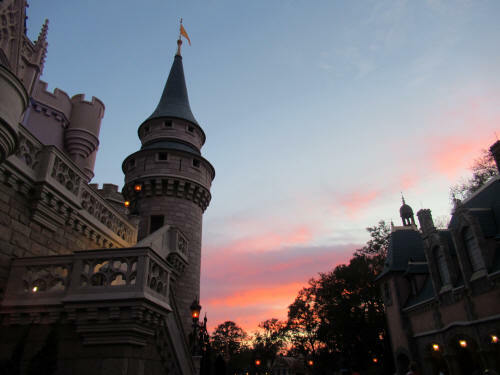 A beautiful sunset entertained us as we waited for the cruiser that would take us to the Magic Kingdom. The park was jammed . . . it was as busy as we had ever seen it! 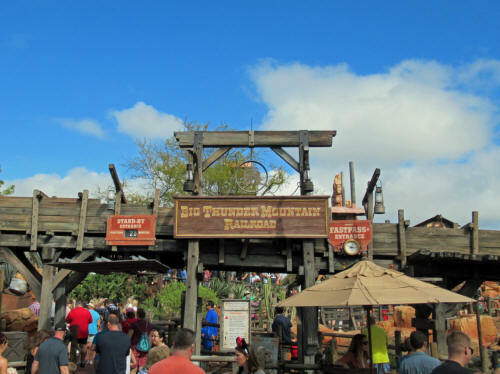 We walked directly back to Frontierland and joined the FastPass line for Big Thunder Mountain Railroad. 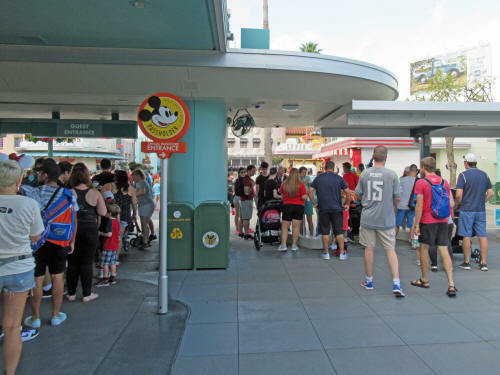 The FastPass queue extended well out past the normal ‘scan-posts’ and zig-zagged through a couple of corral loops, once again the longest FastPass queue we have ever seen for that attraction. Fortunately it moved quickly. 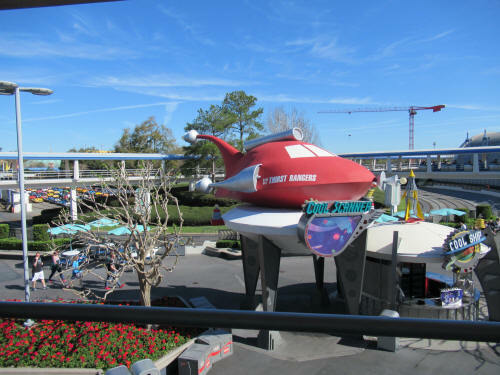 We were quick to decide that the park was just way-too-busy for us, so we hurried across toward Tomorrowland to use our FastPasses at Buzz Lightyear before heading home. 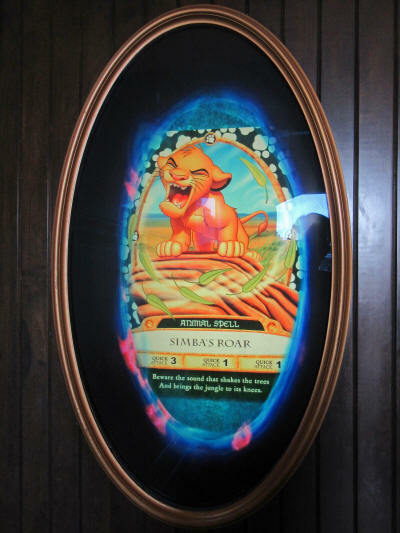 Along the way we stopped at Rapunzel’s to use the restrooms there. They were filthy! The floors were soaking wet, there were paper towels strewn everywhere, the first three towel dispensers I tried were empty, at the fourth one I was able to dry my hands. 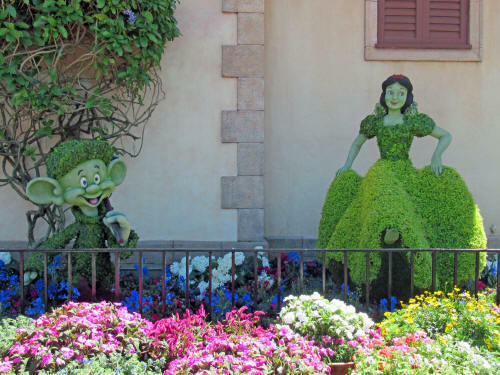 This is very ‘un-Disney’ and very disappointing! 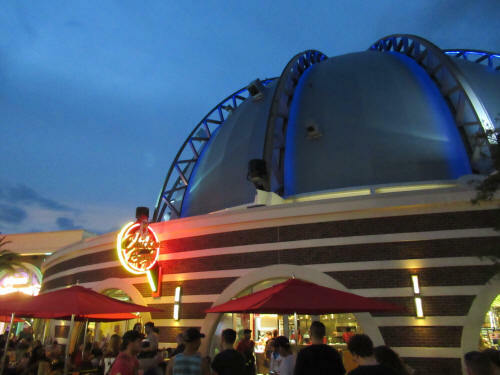 After our ride on Buzz Lightyear Space Ranger Spin we stopped for hot dog at Lunching Pad and we were both surprised when the ‘Happily Ever After’ fireworks show began while we ate. 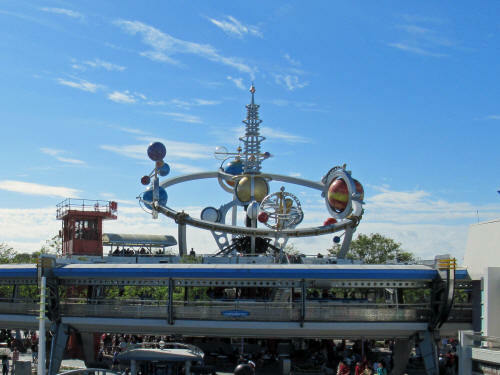 We watched the show from our table in Tomorrowland then rushed backstage to the boat dock. There weren’t too many waiting at the dock so we must have just missed the cruiser. In about 20 minutes a launch arrived and took us back to the campground. We were home at 9:10 and enjoyed a quiet night of TV. 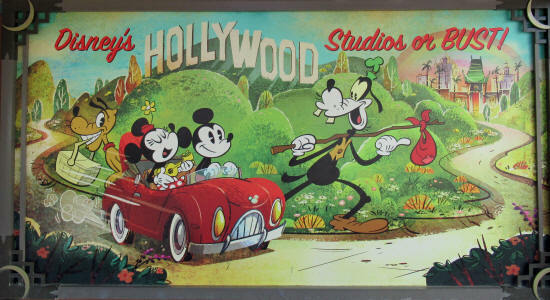 It was 9:00 a.m. when we pulled into the parking lot at Disney’s Hollywood Studios. It seemed that we drove all the way around the park to find the new entrance. 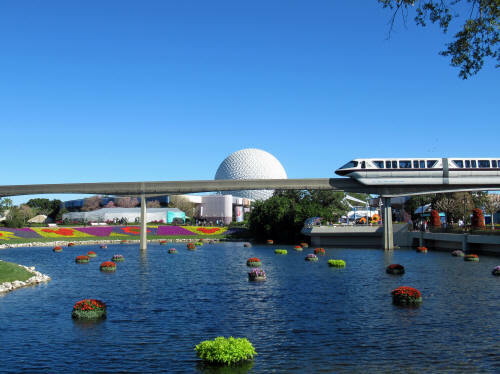 Everything has changed to make way the new Skyway system. Our minds are just boggled by the amount of money being spent to install it. We cannot believe that an oversized ski lift, with no air-conditioning, will ever move enough people to justify the cost. I hope Disney can prove us wrong. 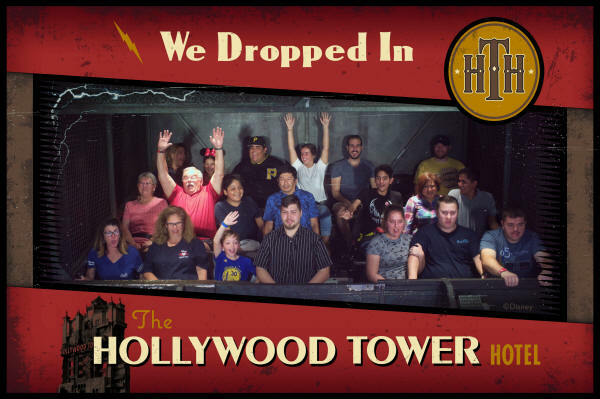 It was already hot and humid as we made our way down Sunset Boulevard toward the tower! 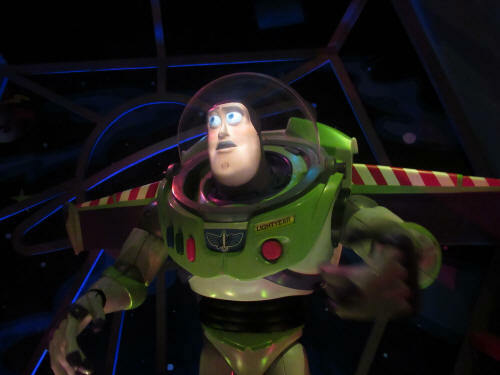 The standby line was 85 minutes long as we walked past and entered the FastPass line. 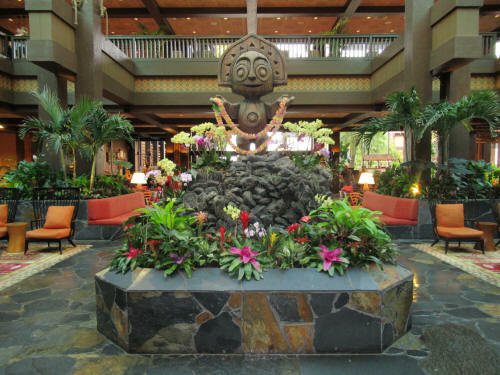 We passed through the lobby just a few minutes later and before we knew it we had filed through the boiler room and boarded our service elevator. It was another great ride! 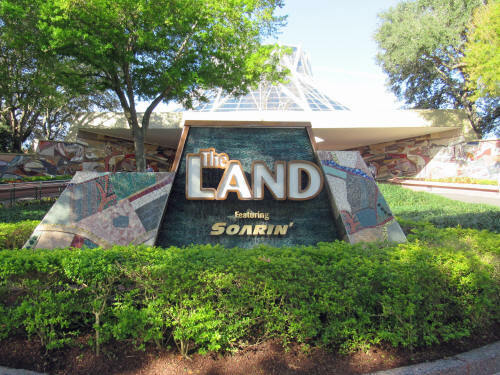 That standby line had risen to 95 minutes as we walked away! While we were walking down Sunset Boulevard Carol spotted a PhotoPass photographer with no one lined up, so we stopped for a few pictures. 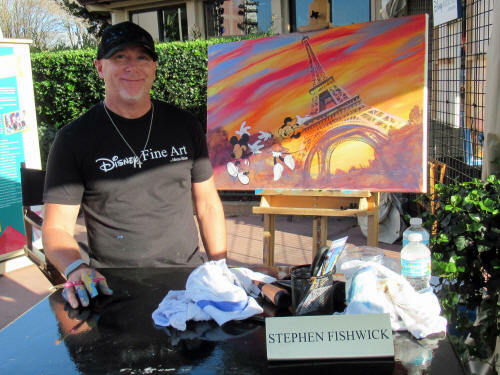 It was a magical Hollywood moment! We were a few minutes early for our FastPasses at Slinky Dog Dash so we stopped for a PhotoPass picture at the entrance, then spent a few minutes enjoying some of the unique scenery. Then it was time to join the FastPass line. 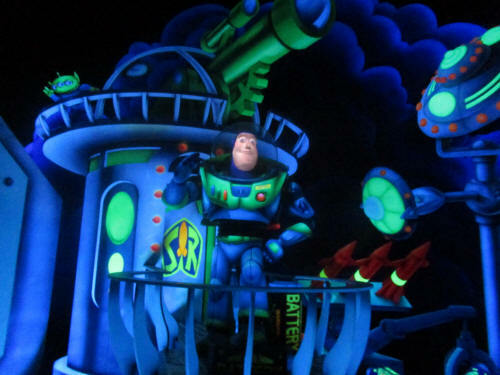 Once again, we were happy to have the FastPasses, the standby line was 135 minutes long! 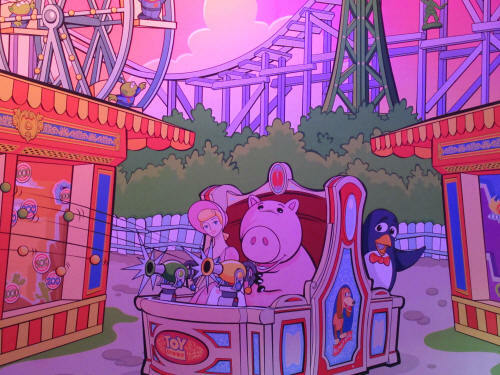 It’s a cute ride, a mild little roller-coaster, but it’s not something we would wait over two hours in line for! 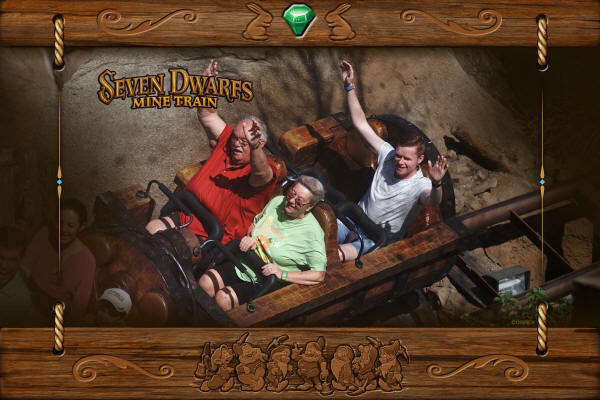 Once our ride was over we decided we had had enough. The park was jammed and it was uncomfortably hot and humid for us. We headed toward the exit. 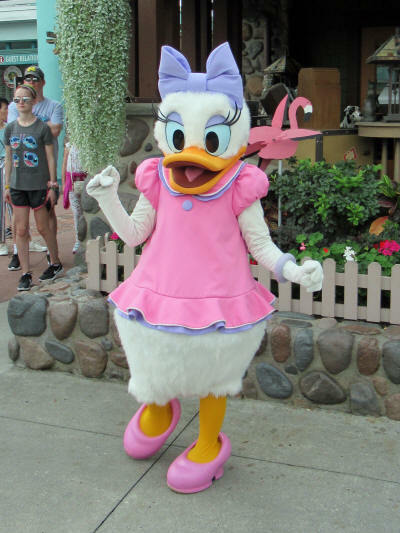 Carol stopped to look for some mystery pin boxes in one of the shops along Hollywood Boulevard as I waited near the exit I was able to capture a few pictures of Donald and Daisy. 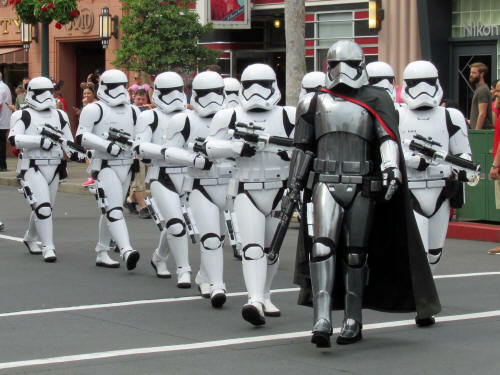 Just as Carol came out of the shop and was heading my way the March of the First Order appeared. This squad of Storm Troopers appear several times a day to entertain Star Wars fans of all ages! On our way back to the campground we diverted our course and headed to Property Control. 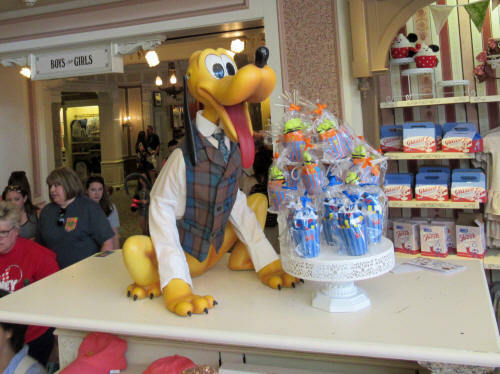 It’s the ‘insiders’ surplus store where Disney sells off surplus stock, inventory that bears last year’s date, etc. It’s always an interesting place . . . sometimes there are good bargains, sometimes there are not. Today was one of the ‘are not’ days. Carol only spent $17 and came out with one little bag. We stopped at Chik-fil-A for lunch and were back home with the puppies by 1:30. We enjoyed a very quiet afternoon at our campsite . . . it was too warm to do much of anything. At about 6:15 we hopped in the car and headed to Sweet Tomatoes in the Crossroads Plaza for dinner. I really enjoy the salad bar, everything is always so fresh and tasty! 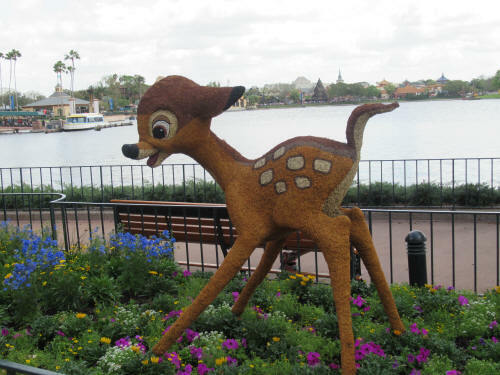 Once we got home we took the dogs out for a short walk, then left them home while Carol and I spent about a half-hour driving around the camping loops admiring the lights and the unique Disney decor. 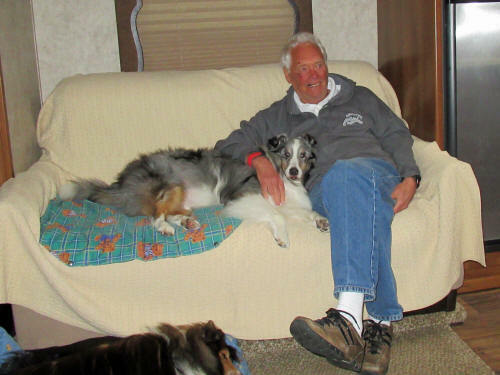 We were back home with the dogs by 9:00 p.m. and enjoyed another evening of TV. We had all the windows open overnight and slept well in the fresh air; we were still in bed at 7:00 but the dogs were restless! It always amazes us how accurate their internal clocks are; we could hear their toenails clicking on the floor as they all paced around fretting about their breakfast. We got up at 7:05 to let them out to do ‘their chores’. 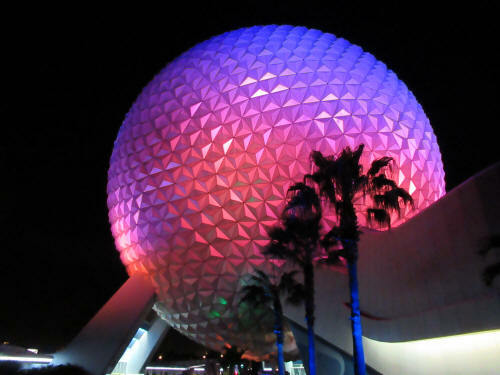 We closed up the camper at 9:00 and headed off to EPCOT. 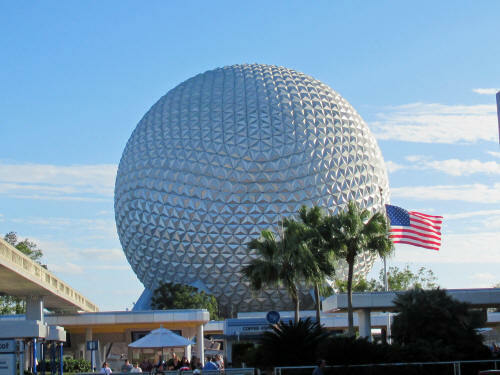 We had two FastPasses for the morning and we were hoping that all of those pesky ‘President’s Day vacationers’ would be gone. 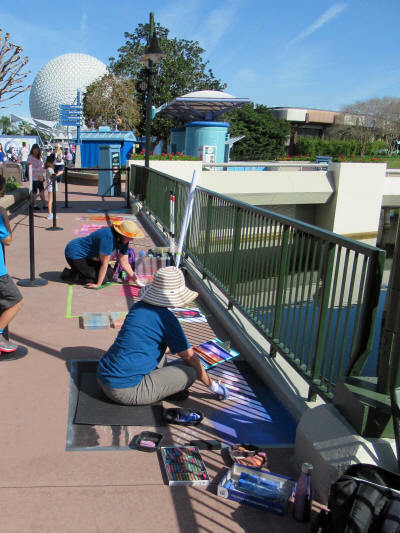 We were hoping for a quiet day at the park so we could enjoy some of the Festival of the Arts kiosks and displays. Boy, were we wrong! Those annoying vacationers were still here! As we pulled up to the parking lot entrance we saw a mob scene. All but four of the entry booths were open and the cars were lined up about thirty deep all across the concourse. It took fifteen minutes to creep and crawl up to the booth. 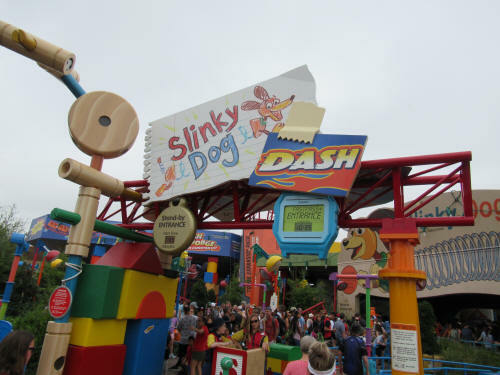 The only line that was short and moving quickly was the entrance line for Annual Passholders, so that’s the one we used. 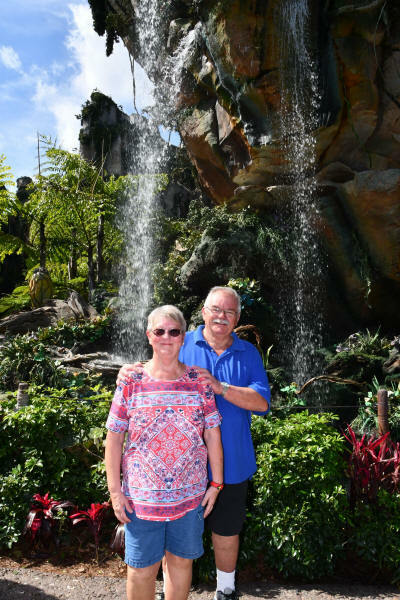 After a quick stop for a PhotoPass picture we wandered through the breezeway into Future World East then crossed the bridge to Odyssey. 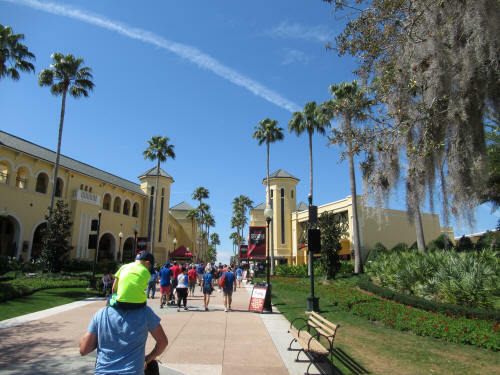 Everything was still closed there so we slowly wandered on to World ShowCase. 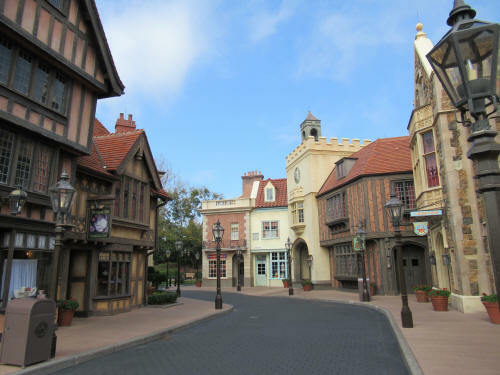 None of the shops or pavilions were open with the exception of Norway. Carol browsed one of the Norway shops, where one of our favourite artists, Larry Dotson, would be signing his works later in the day. There were three prints she just had to have so we agreed to go back later in the day. We doubled back, passing through Mexico again on our way toward Canada, Great Britain and France. It was overcast when we first arrived, but the sky was clear as we left Norway and you could feel the temperature climbing with each passing minute. It was a good day for photographs . . . but not so good for Carol and I. Before we reached France we were sweltering! 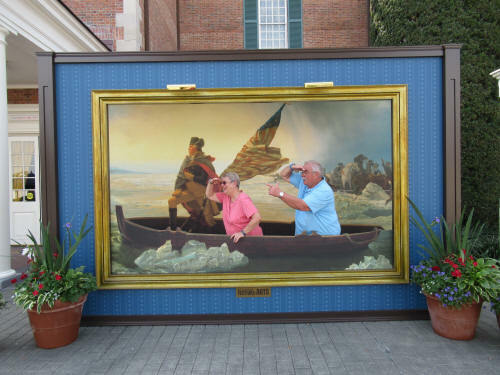 World Showcase is filled with some interesting backdrops of familiar art pieces where guests can walk right into the scene and become part of the painting. We stopped to get pictures at quite a few of them. 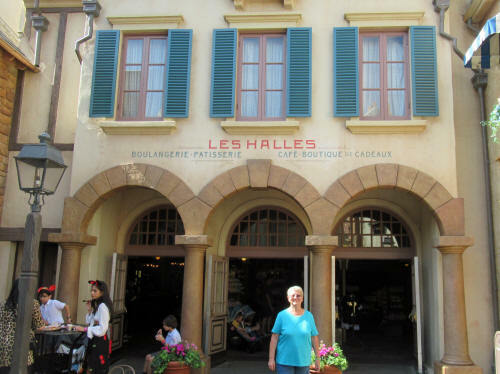 We stopped at the Boulangerie in France and shared a ham and cheese croissant and a strawberry custard tart. Yummy! 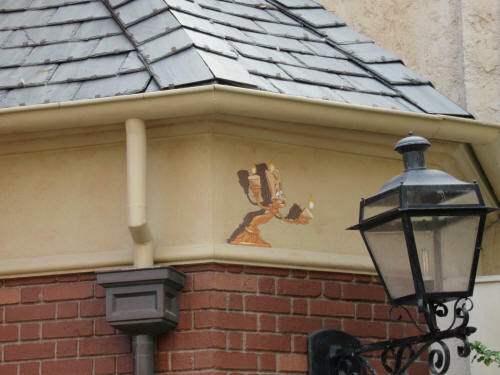 There are also some ‘Easter eggs’ hidden in plain sight on the buildings of World ShowCase . 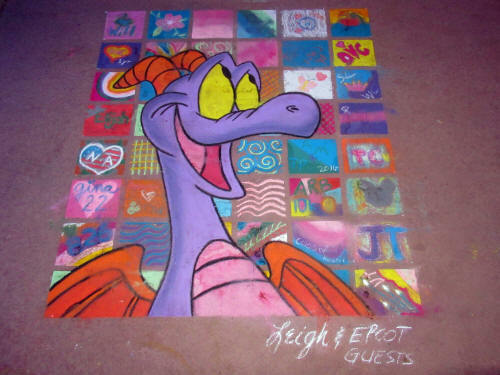 . . pictures of Disney characters that are painted here and there in unexpected places. We found a few of them! 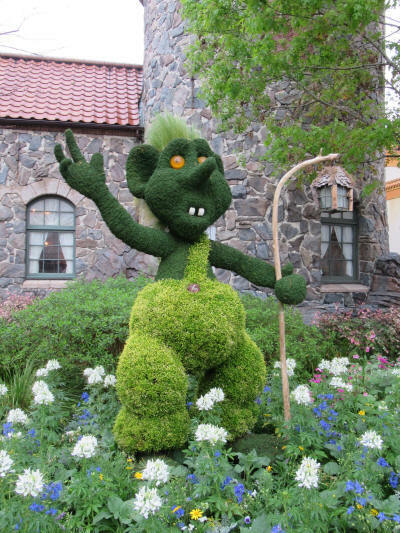 Our slow circuit took us all the way around World ShowCase. We stopped at Norway to pick up those prints and Larry Dotson signed them all for us. 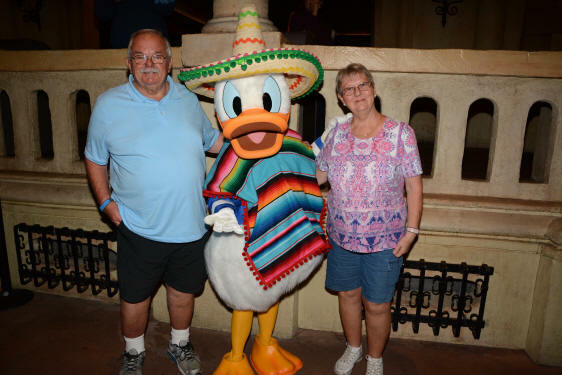 By the time we got to Mexico we were all done. 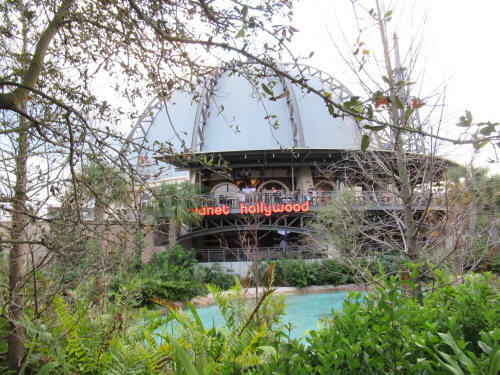 We had soaked in all the heat we could stand so we headed back out through Future World toward the exit. 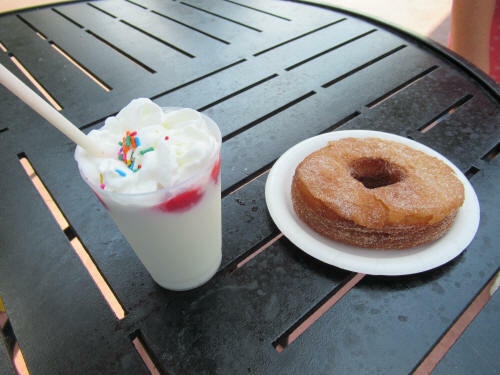 A cronut and a pancake milkshake beckoned as we passed the Taste Track kiosk in Future World. They were both delicious! We were a hot and weary pair as we plodded off to the parking lot and headed home. The dogs were happy to see us when we drove in at 1:00 p.m.
We had a restful afternoon. We sat outside a while, then went back in to cool down. 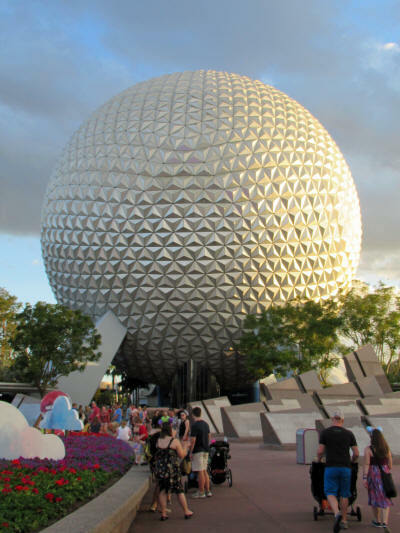 We walked the dogs twice, tossed the ball for them a bit, had a short nap, then fed the pups early so we could head back to EPCOT at 5:00 p.m. 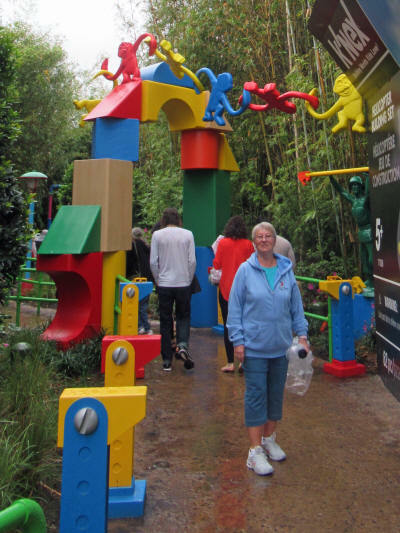 This time there was no line, but the park was equally crowded. 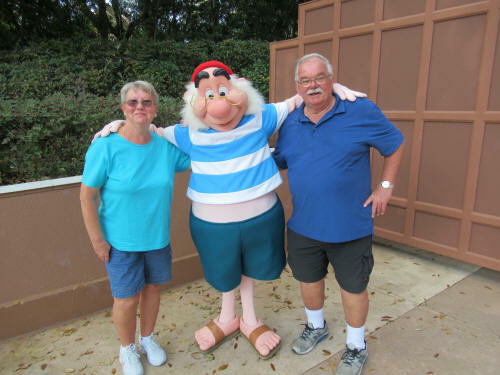 As we entered Carol spotted a PhotoPass photographer with no line so we paused for a quick picture, then carried quickly on to the Port of Entry to catch the Friendship boat from Canada to Morocco. 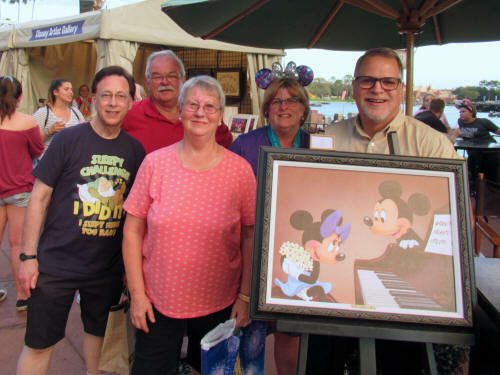 The boat was just pulling in when Carol noticed Disney artist Don ‘Ducky’ Williams at a nearby kiosk where he was signing some of his creations. 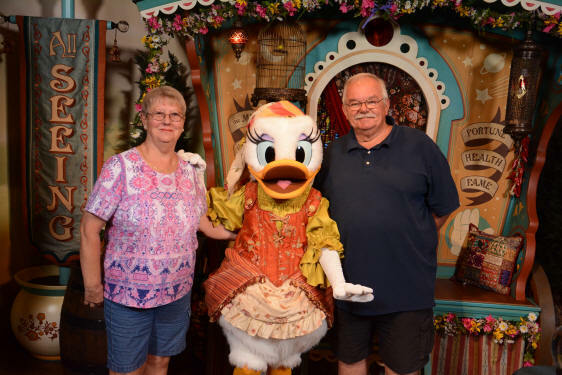 We met Ducky a few years ago on our Alaska cruise so we paused to say a very quick hello. The Friendship boat took us across the World Showcase Lagoon to Morocco and we made a quick walk to Japan which is right next door. 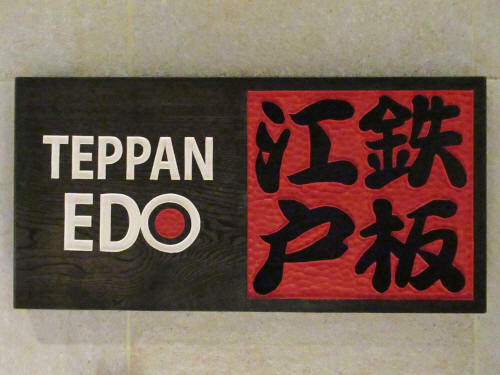 We arrived just in time to check in for our 6:00 p.m. dinner reservation at Teppan Edo..
We were seated within just a few minutes and shared our table with a family from Massachusetts. 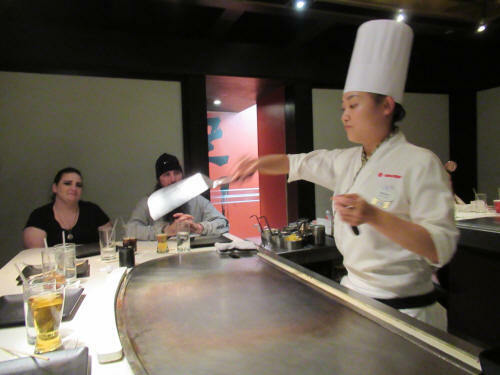 We always enjoy the meal at Teppan Edo and Chef Tomo put on a great show as he cooked everything directly in front of us. Tomo even surprised us with a new trick. 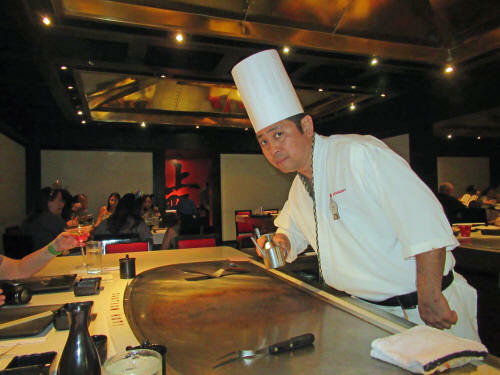 Most of the chefs cut off the shrimp tails and then use their spatulas to flip the tails, one at a time, into the top of their chefs hats. Tomo did it a little bit differently . . . he flipped one tail into his hat then flipped all the rest into a small stainless steel bowl. 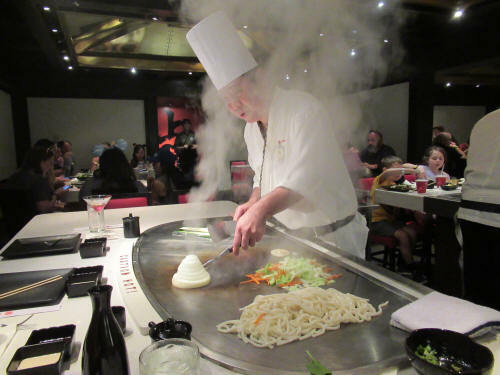 As his grand finale he put the stainless steel bowl on his spatula and flipped it, tails and all, into his hat. How do you say Bravo! in Japanese? Once dinner was over we said a quick goodbye to our tablemates and headed to the Americas Gardens Theatre where we got in line for the 8:00 presentation of Disney on Broadway. 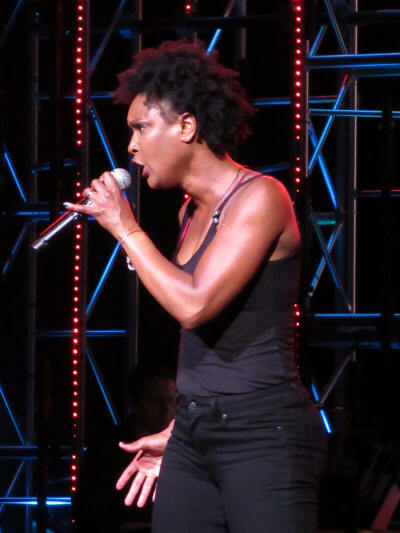 This show is presented three times a night throughout the Festival of the Arts. 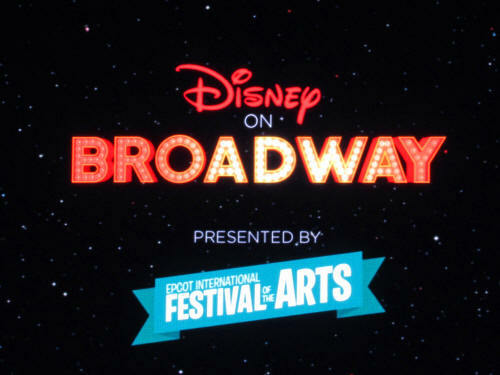 Each show features performers who have starred in Disney productions on Broadway. 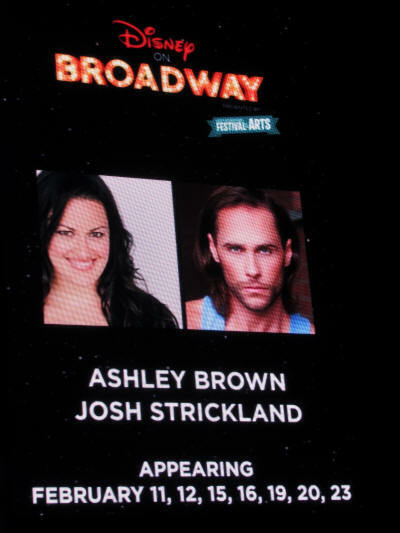 Tonight we were privileged to see Josh Strickland who was the original Tarzan on Broadway and Ashley Brown who was the original Mary Poppins. 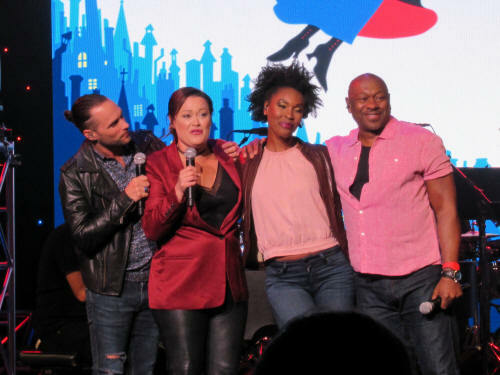 They sang hit songs from their own shows as well as other well known Disney classics. 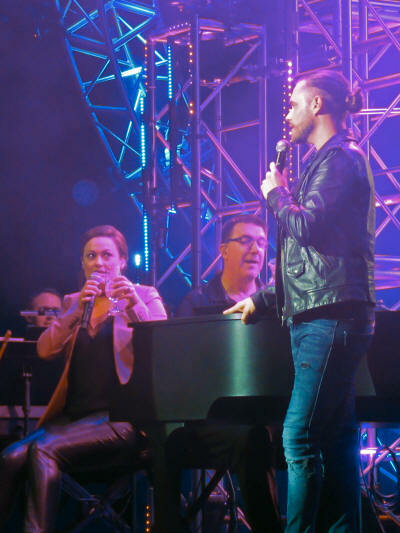 Each of them is a talented and powerful performer in their own right, but when their voices combined in a duet or a harmony it was magic. 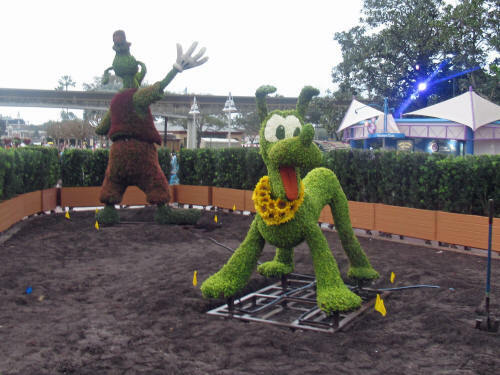 This was one of the best shows I have seen at Walt Disney World. 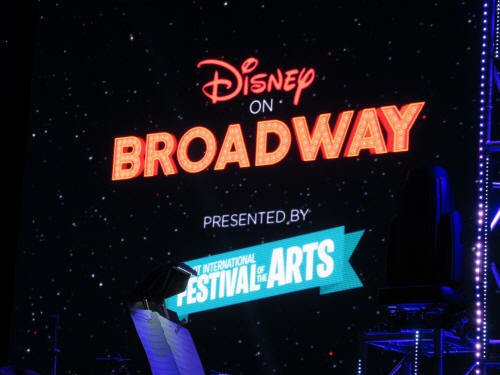 We hope to see another presentation of Disney on Broadway, with a different pair of performers, before we go home! 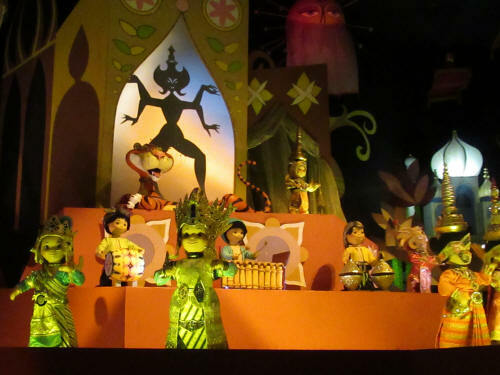 Once the show was over we headed to the exit in order to beat the crowd who would be filing out once Illuminations ended. We were almost at the exit when the fireworks started and they were still going when we left the parking lot. We pulled in at home at 9:15. 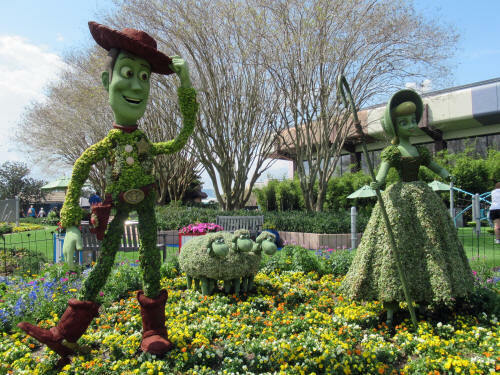 It was another terrific Disney day! This morning it was too damp and sticky to enjoy coffee outside. 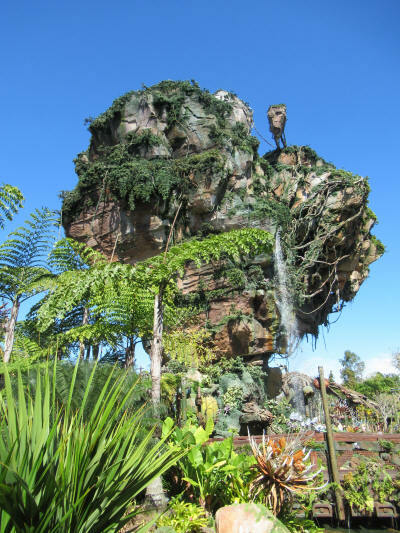 We walked the dogs, sipped our coffee inside and by 8:45 we were on our way to Animal Kingdom. Once again we pulled up to the parking lot to find a huge line-up of cars. Why won’t these people go home? Once we had parked we hustled hurried shuffled toward the entrance gate. 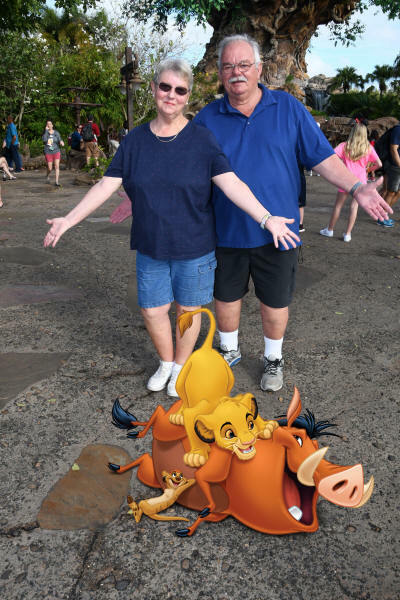 We paused for a special PhotoPass picture with a Lion King theme then headed to the special Annual Passholder entrance. Just like yesterday there was no line there and we were inside the park at 9:05. 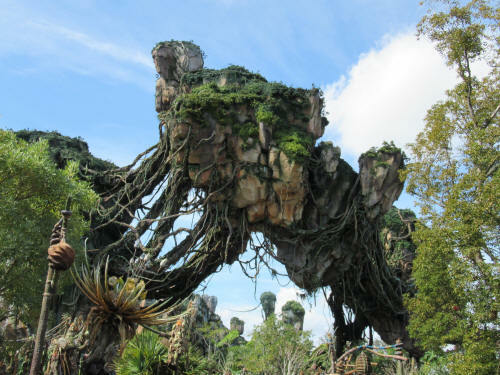 We took the right trail to Discovery Island and encountered DeVine again. 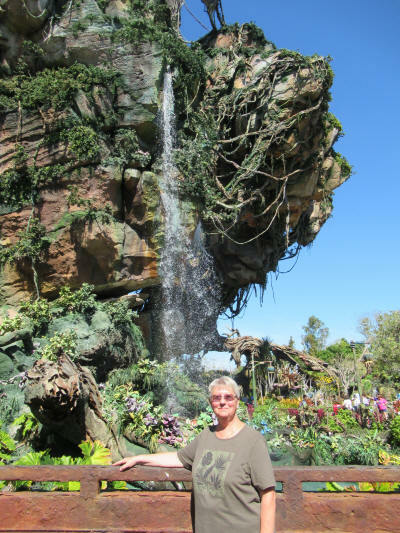 Today she stopped along the side of the trail long enough that Carol could scoot in and pose with her! 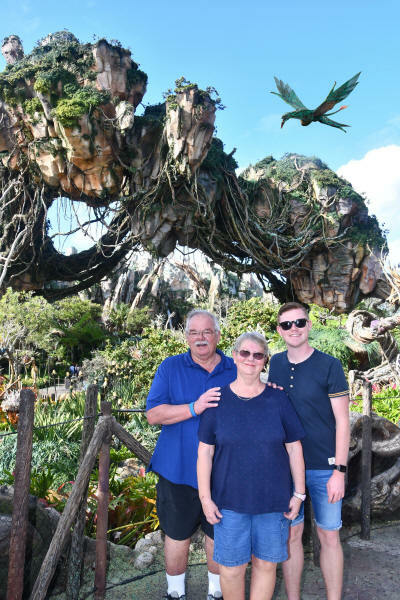 I took a few pictures and we posed for a few PhotoPasses while we waited in front of the Tree of Life where we had agreed to meet our friend Curtis. 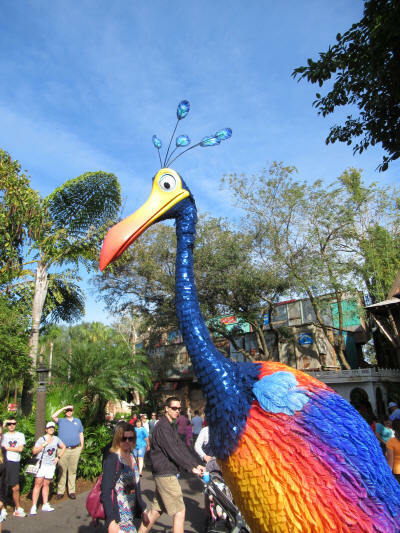 Just as Curtis arrived they announced that ‘Winged Encounters - the Kingdom Takes Flight’ was about to begin. 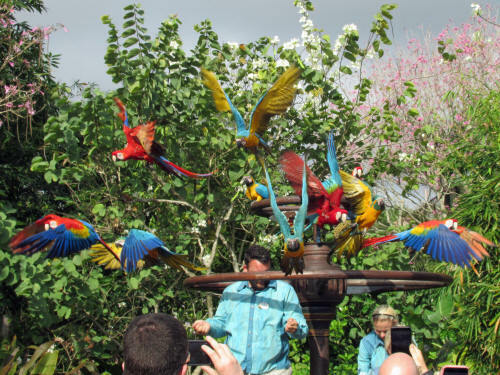 It’s an amazing show featuring most of the birds in Disney’s flock of 63 macaws. 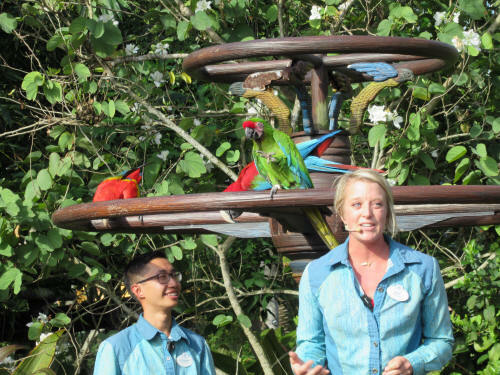 The birds fly in from their home about a half-mile away and perform for guests by flying from point to point around the foreground area in front of the Tree of Life. 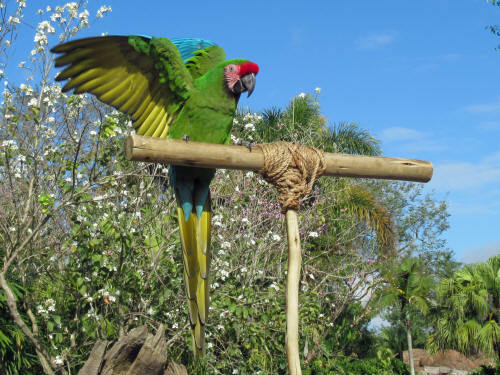 Since we last saw the show they have added a new feature, portable roosts made of sticks lashed together in the shape of a cross. 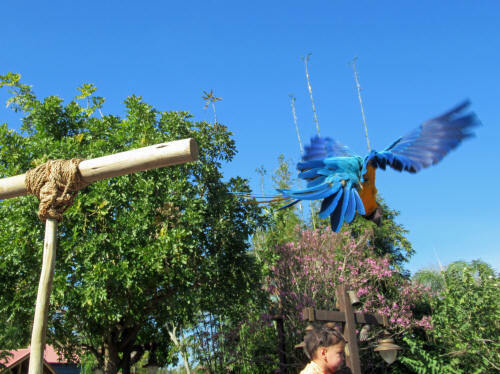 These new roosts are intended to bring the birds closer to the guests, and they certainly achieve that objective. 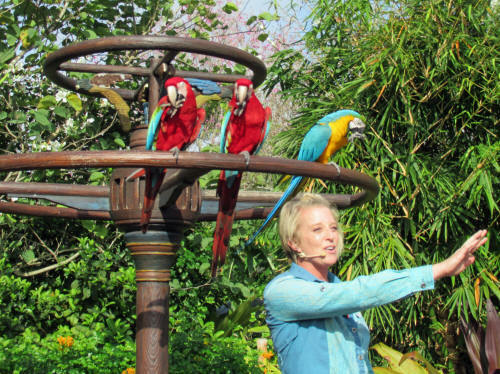 If you want to be pooped on by a macaw be sure to stand under one of those roosts! 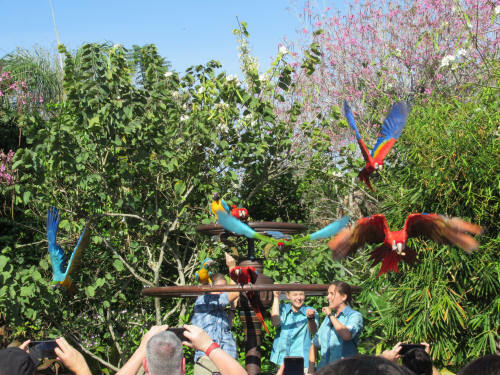 The magnificent birds swoop in low, almost grazing guests’ heads on their way in and again as they make their exit. It’s quite a show to behold! 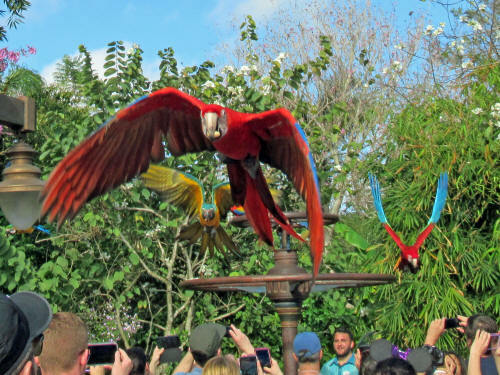 Once the macaw show was over we walked to Pandora where Curtis and I joined the FastPass queue for Flights of Passage. 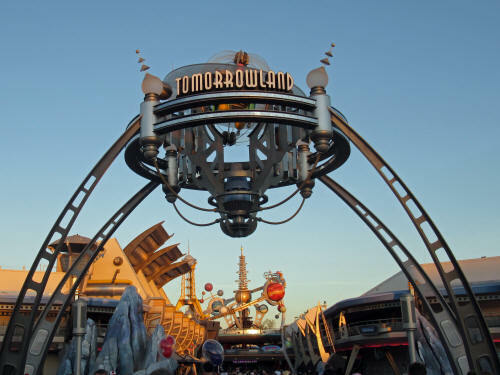 We were happy to have the FastPasses, the park had only been open for 50 minutes and the standby line for the ride was already 3 ½ hours long! 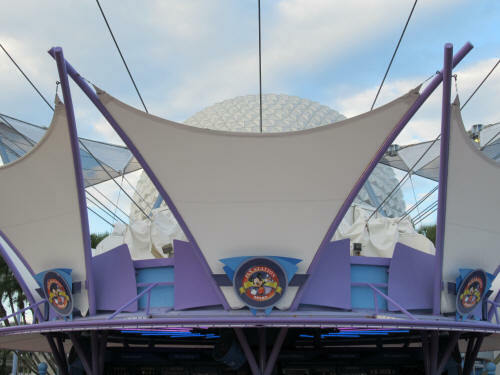 It stretched all the way along the boardwalk to the Lion King Theatre. Yikes! 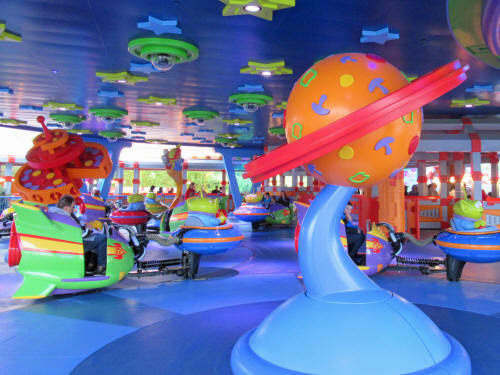 This attraction engages all of the riders senses and gives an amazing sense of motion. 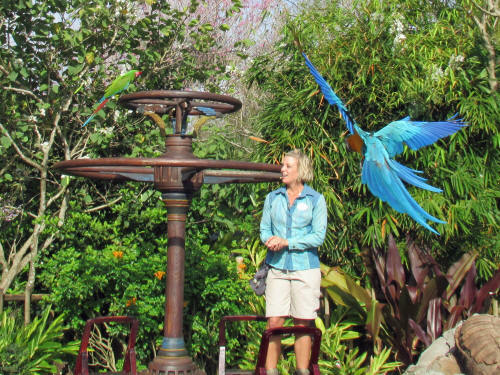 Once each trip is usually enough for Carol, so she wandered around the Valley of Mo’ara snapping a few pictures while Curtis and I flew on the backs of our banshees! 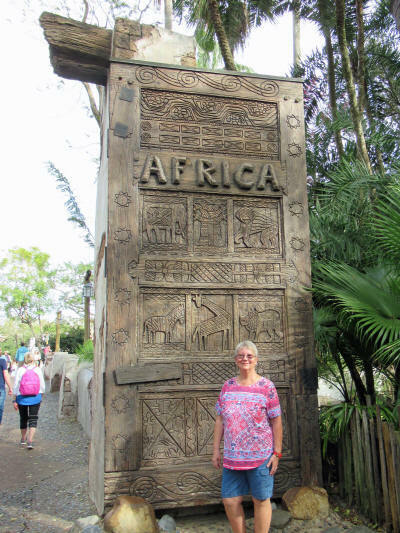 Once we met up with Carol again we walked to Harambe Village where we waited near the entrance to Kilimanjaro Safaris for our FastPass time to arrive. The FastPass line was long, but fortunately it moved very quickly! Once again we had mixed results spotting animals. 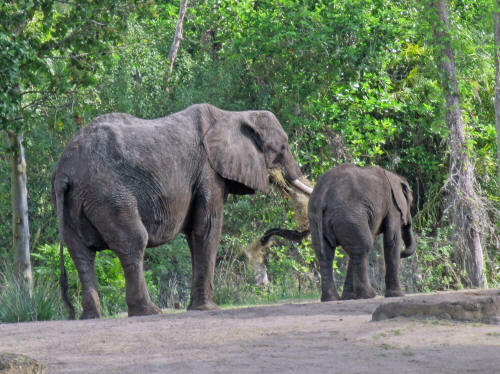 There were a few great sights involving a black rhino, baby giraffes and their mommas, a baby elephant and his mother and lions. 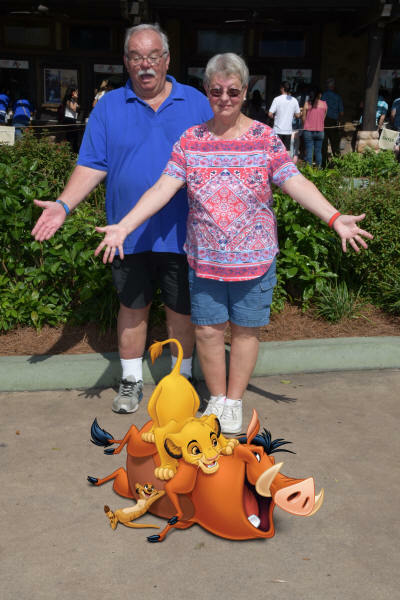 Carol captured her best lion trophy yet . . . she bagged three lions with one shot! 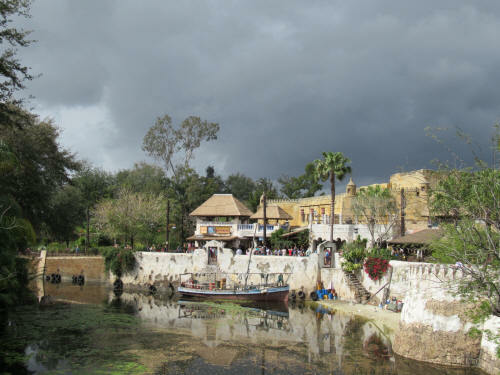 Dark clouds were gathering over Harambe Village as we exited the safari so we hurried toward the exit to avoid the rain. Curtis was meeting his partner Alek and some work associates for lunch while Carol and I had a few groceries to pick up on our way home to the dogs. We made a quick stop at Winn-Dixie and were home to the puppies at about 1:15. 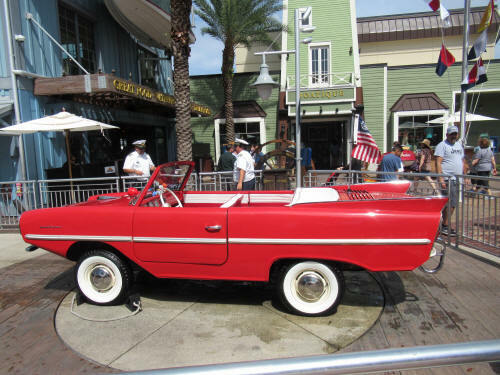 After walking the dogs we had a sandwich for lunch, then Carol took the golf cart to the marina where she caught the launch to the Contemporary Resort to browse through the shops. I stayed home with the dogs - browsing isn’t my thing! 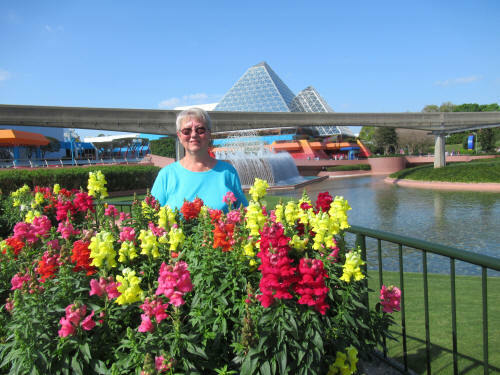 Carol was back at about 3:00 and we spent a few hours relaxing at home before striking out for dinner at Disney Springs. 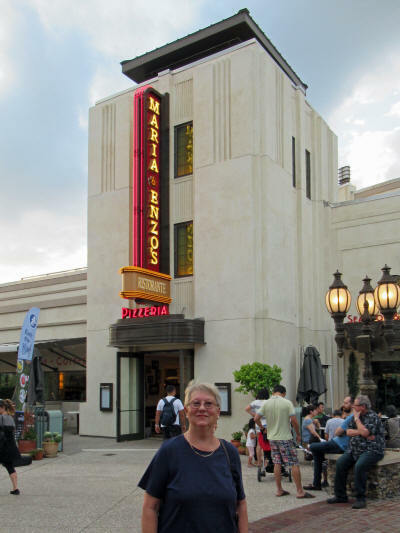 We left at 5:00, parked in the Lime Garage and slowly strolled to Maria & Enzo’s. 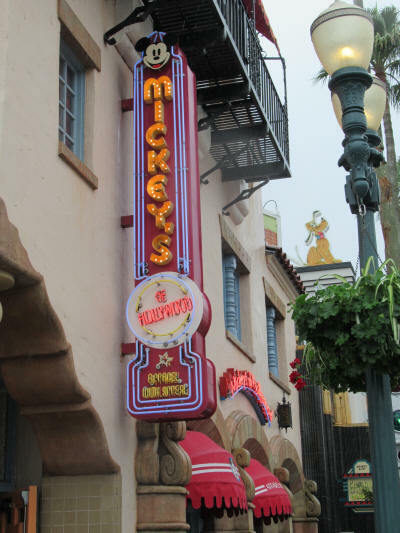 It was our first experience at one of Disney’s newer restaurants. We checked in a bit early for our 6:15 reservation and were seated immediately. 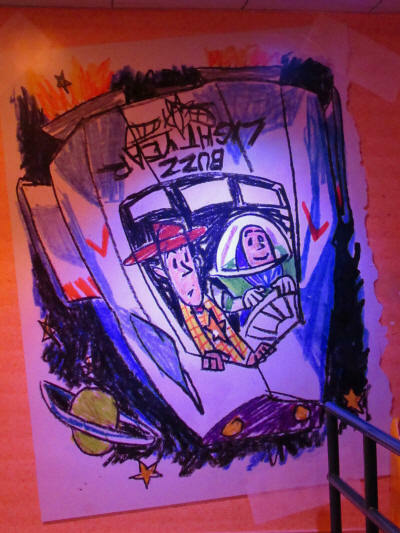 We had a nice table, our window overlooked the Characters in Flight balloon and we watched the Amphi-cars cruise by while we ate. Unfortunately our dining experience was mixed. I ordered my favourite cocktail, a Manhattan. I’m not sure what they used instead of sweet vermouth, but the drink was vile. It was really bad! I sent it back immediately and had a coke instead. For an appetizer we ordered a fried rice ball that was supposed to be stuffed with some sort of meat ragout. There was no meat, no ragout of any kind, it was simply a bland ball of deep-fried rice. Thankfully the tomato sauce it was served with was tasty and made the rice edible. Our entrees were quite good, we both ordered chicken Parmigianina. It was very tasty . . . our only criticism would be the portion size. It was much to large; neither of us ate more than half of our entree. While our main dishes were very tasty, nothing else about Maria & Enzo’s impressed us at all. It’s not a do-over for us! 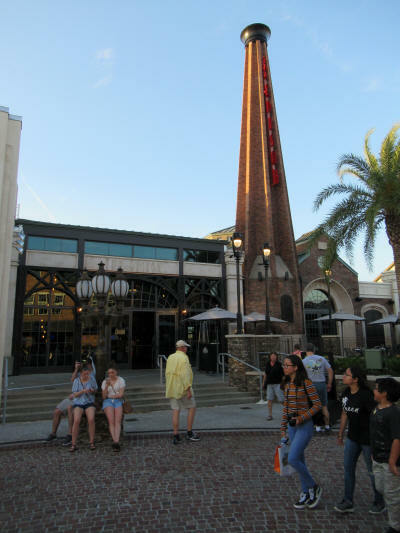 After dinner we took a slow stroll through Disney Springs. 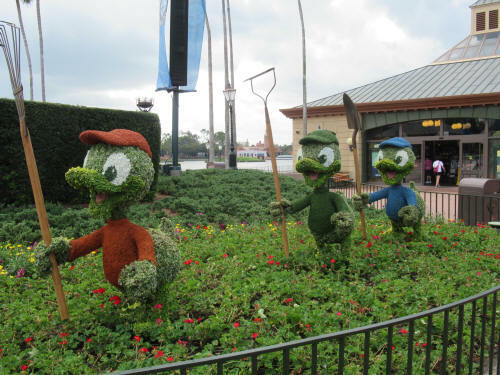 I snapped a few pictures as we made our way to the Art of Disney Store at Marketplace. At the Art of Disney store Carol pointed out two Jim Shore figurines that she desperately needs for her birthday. That’s exactly the kind of subtle hint I can understand so I quickly hauled them over to the cashier! Happy Birthday Carol! My shopping was all done so I adjourned to The Earl of Sandwich where I sat at an outdoor table reading my book while Carol roamed through the Christmas Store and the Pin Station. It wasn’t long before she joined me and we carried on to our final stop, Ghirardelli’s, where we each ordered a milkshake. They were delicious; we sipped them all the way home. 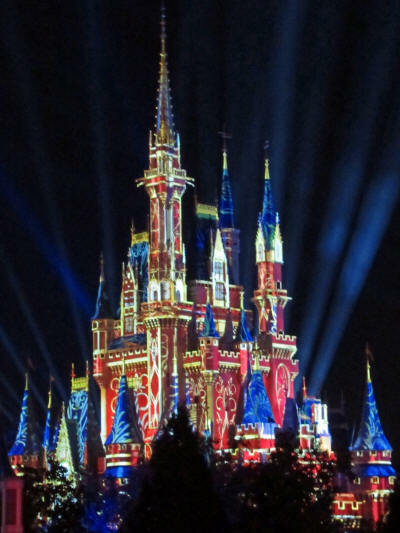 The Happily Ever After fireworks show had just finished when we pulled in at 8:20. Three nervous dogs were very happy to see us! We enjoyed a very quiet morning; there were no park plans until dinner time! We slept in a bit, enjoyed a pot of coffee and played with the dogs. At about 10:00 a.m. we hopped in the car and left to do a bit of shopping. 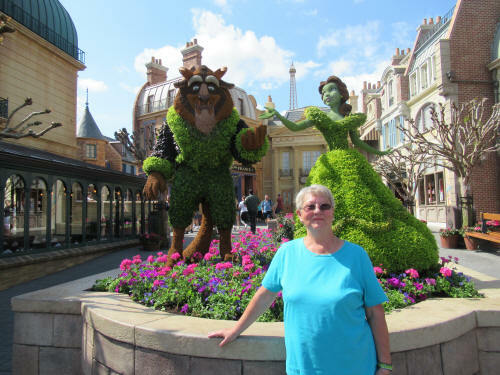 Our journey took us to the Orlando Vineland Premium Outlets where Carol visited the Character Warehouse, looking for Disney bargains, while I waited in the car with my book. 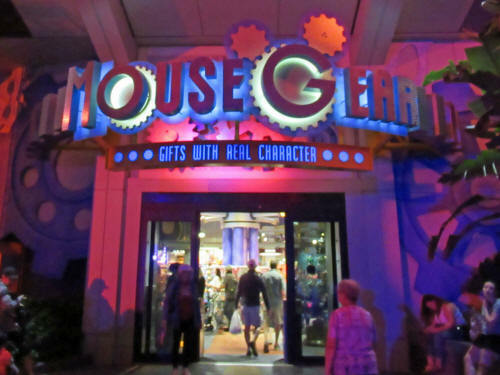 Then we stopped at Walgreens, Dollar Tree and CVS Pharmacy before pulling into Character Corner, a shop on Highway 192 that carries a lot of Disney collectibles. Our next stop was TD Collectibles and finally Booster Packs and Beyond, both of which are also on Highway 192. Carol found a few small items to add to her collection and we returned home at 1:45. We had a sandwich for lunch and then gave the dogs a nice long walk. 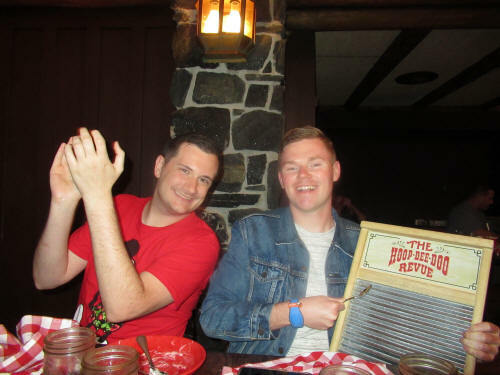 During the day we talked about our planned trip back to Fort Wilderness for Halloween in 2020. 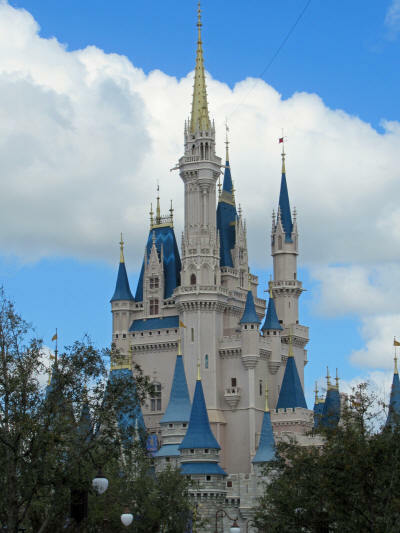 We quickly agreed that 18 months is just too long between stays here, so we changed our plans and booked our next trip for January and February 2020. The travel trailer is booked and we’re just waiting for confirmation from our travel agent that the campsite reservation is done as well. 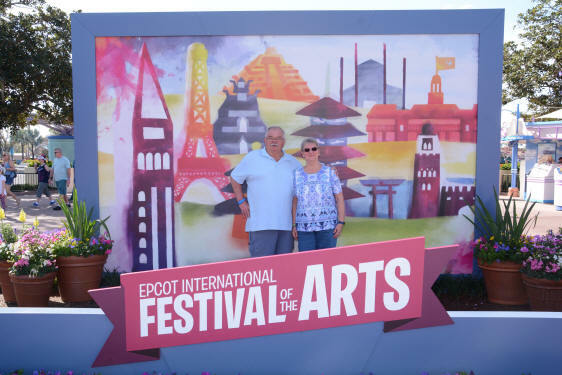 We fed the dogs a bit early and jumped in the car at 5:00 to head to EPCOT where we had a 6:00 p.m. dinner reservation in France and planned to go to the Disney on Broadway show after dinner. 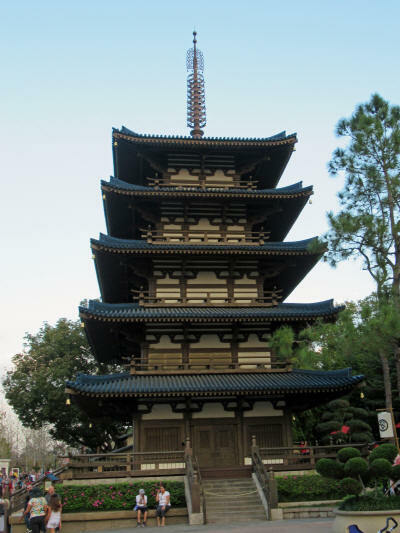 We arrived at the park at 5:20 and took a slow stroll back toward World ShowCase. Naturally Carol had to stop and browse at the Pin Station. 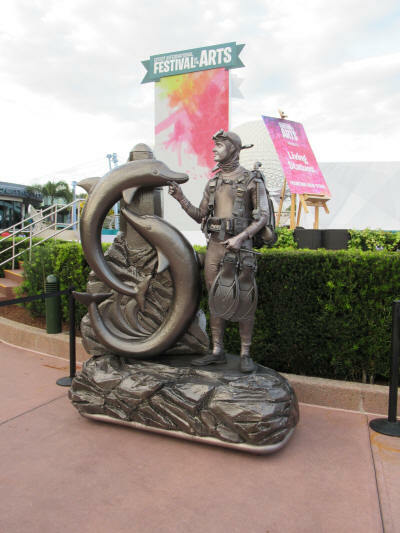 There were three ‘Living Statues’ performing beside the fountain in the middle of the Future World concourse. 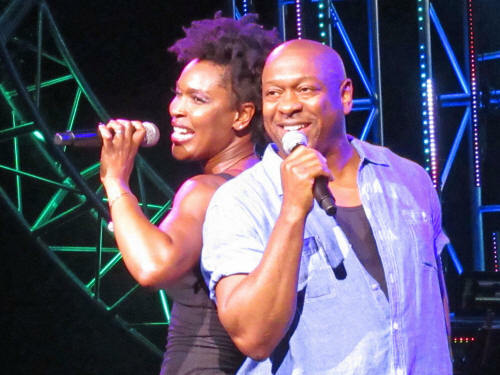 They were terrific performers! 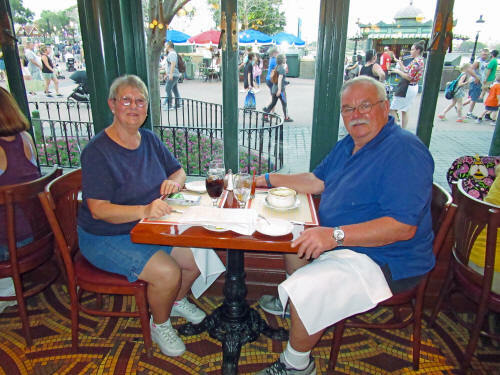 It was about 5:55 when we checked in at Les Chefs de France and we were seated in just a few minutes. 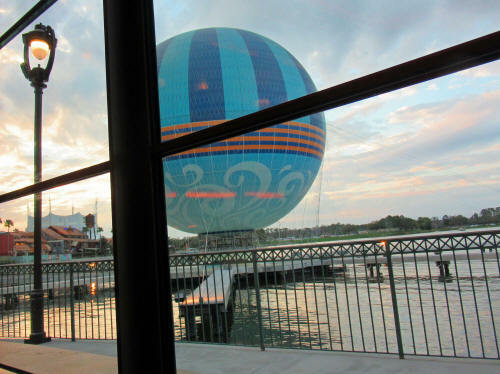 We had a nice table, at a window overlooking the World ShowCase Lagoon. It was a great spot to have dinner and do some people-watching at the same time! Dinner was terrific! 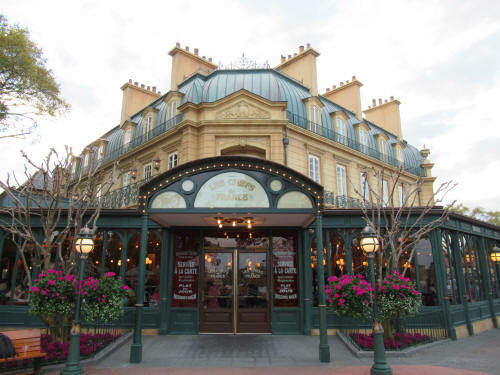 Tonight was the first time we have dined at Les Chefs de France since December 5, 2011 and we don’t understand why it’s been that long! We shared a tasty bowl of French Onion Soup. 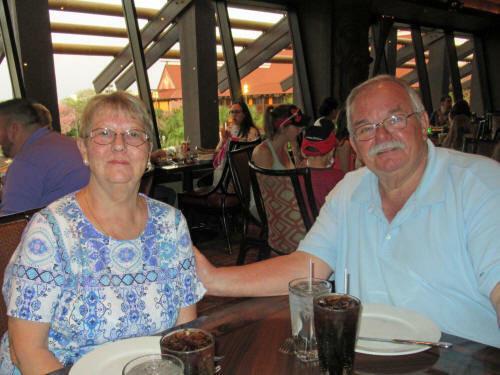 Carol thoroughly enjoyed her Filet Mignon and my broiled salmon was wonderful. Then we finished with wonderful desserts, Crème Brûlée for me and a creamy profiterole drizzled with chocolate for Carol. It was all yummy! 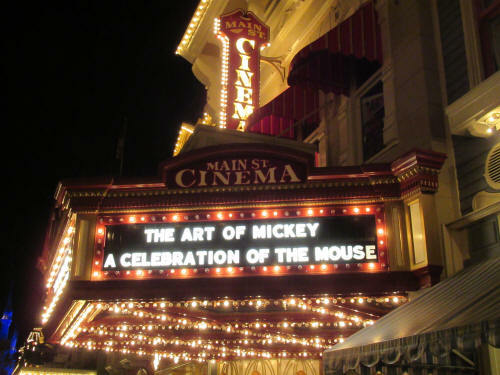 After dinner we hurried to the America Gardens Theatre to wait in the standby line for the 8:00 p.m. showing of Disney on Broadway. 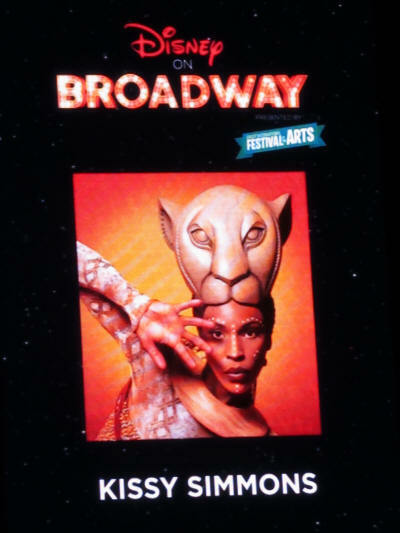 The performers this evening were Alton Fitzgerald White who played King Mufasa in the Broadway production of The Lion King. 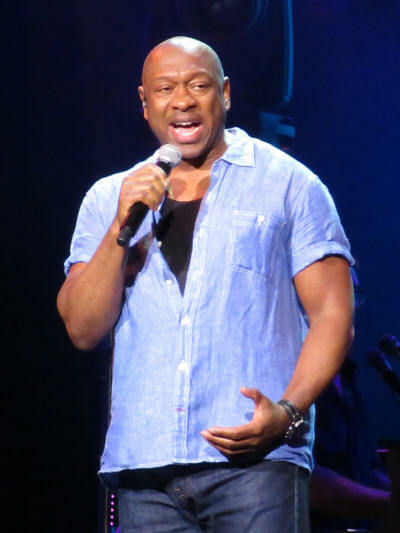 Joining him was Kissy Simmons who played Nala in the same Broadway production. 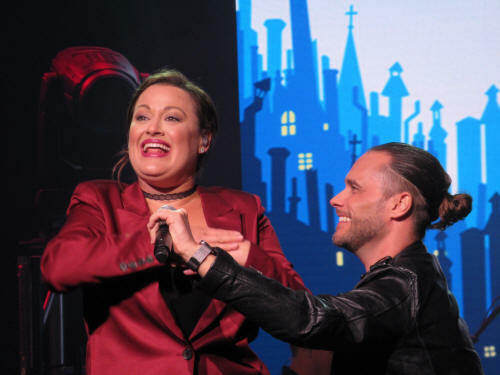 They performed popular numbers from several Disney hits including The Little Mermaid, Hercules, Aida and, naturally, The Lion King. 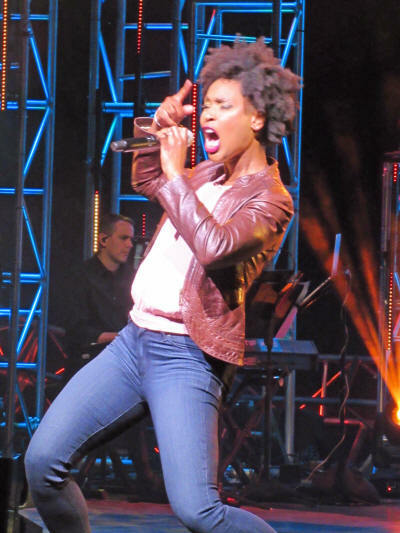 It was another terrific show, it left us wanting more! 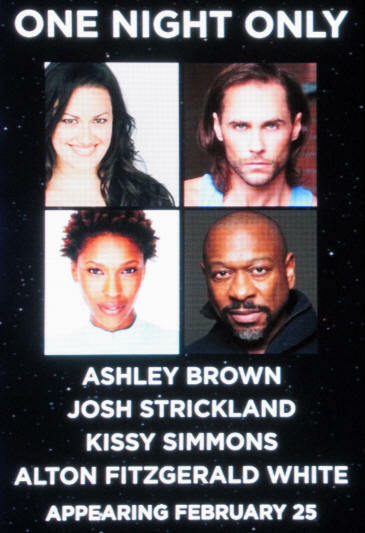 We hope to make the show on February 25th when all four performers appear in the series finale! After the show was over we made a dash to the exit and got to the car just as the Illuminations fireworks show was starting at 9:00. We were home at 9:15 and let the dogs out for a few minutes, then drove the golf cart to the pool where we enjoyed a very soothing swim! 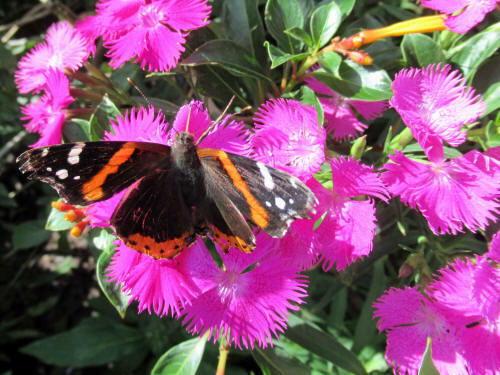 The temperature today was in the high 80’s with 86% humidity. We really needed that swim to cool us down before bed! It was a cool but damp morning. We sat outside with the dogs for a while and sipped out coffee while we listened to the boat whistles. By 9:00 a.m. we were aboard one of the small launches headed toward the Magic Kingdom where we had a few FastPasses to use. Our first stop was at the Fire Hall to pick up some Sorcerer Cards. 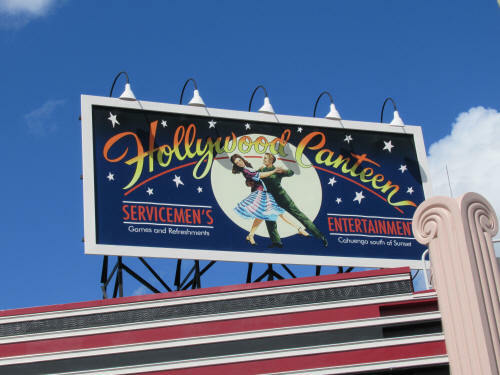 I snapped a few pictures of the Main Street dancers and the ‘Clang-Clang Trolley’ while Carol went to play the Sorcerer game beside Main Street Jewellers. By the time I rejoined Carol she had met up with our friend Curtis. 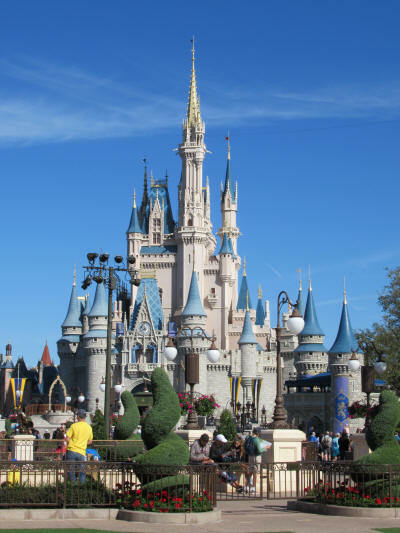 We walked on down Main Street and through Cinderella Castle on our way to the Seven Dwarfs Mine Train where we used our first FastPass. 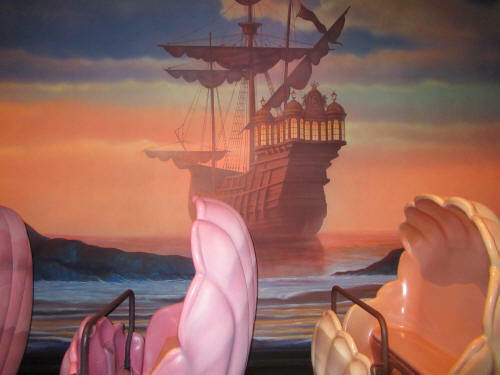 Before leaving Fantasyland we hopped in the standby line at The Voyage of The Little Mermaid and were seated in our clamshells within about 10 minutes. 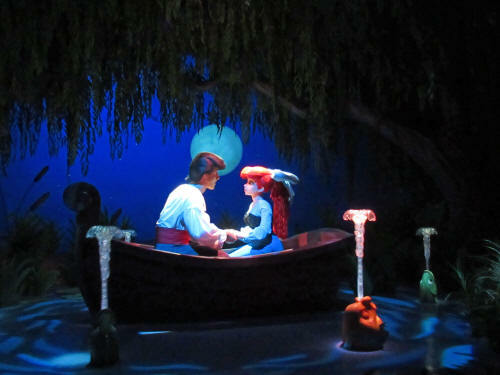 When we finished our adventure with Ariel we headed toward The Haunted Mansion. 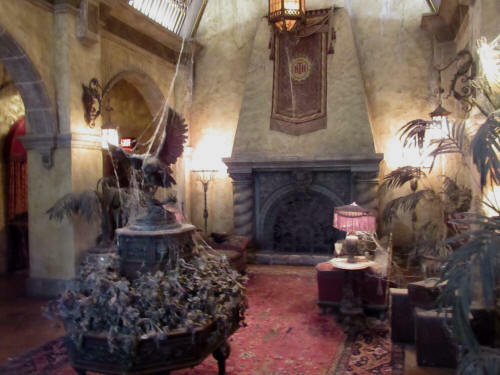 We strolled through Fantasyland and made a quick stop in the Memento Mori shop before joining the standby queue at the Mansion. 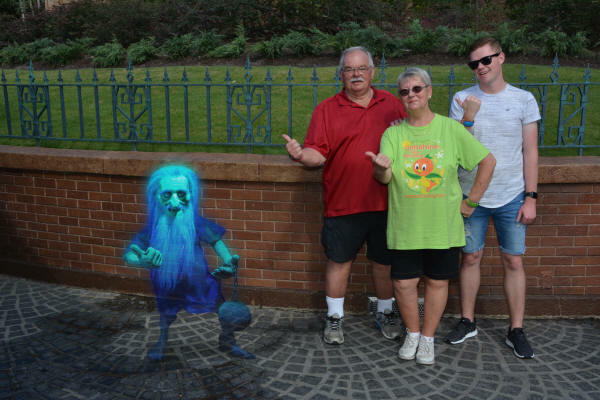 After our Doom Buggy ride we stopped for a picture with Ezra, one of the Hitchhiking Ghosts. 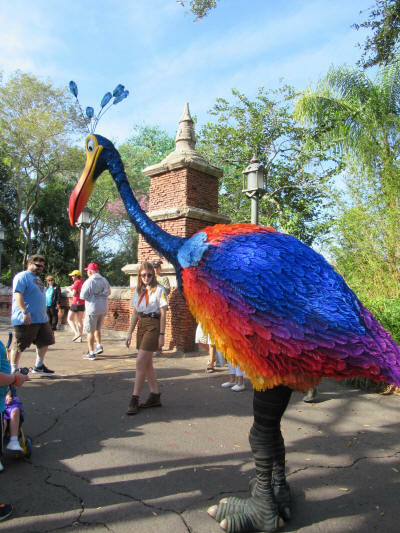 Curtis left us for a while, he’s on a mission to collect photos and autographs from some of the rarer and more obscure Disney characters and was hoping to catch Phineas and Ferb today. 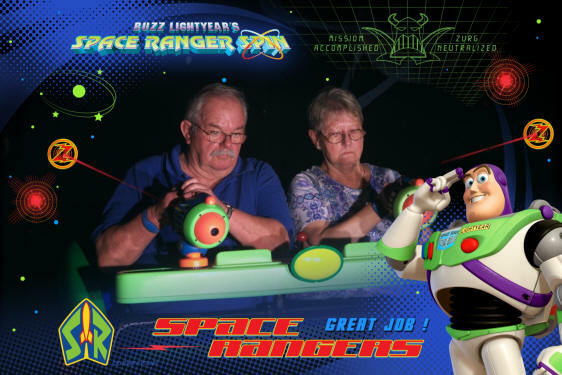 After a brief stop at the pin shop in Frontierland Carol and I headed to Tomorrowland and took a spin through Sector 9 with Buzz Lightyear. 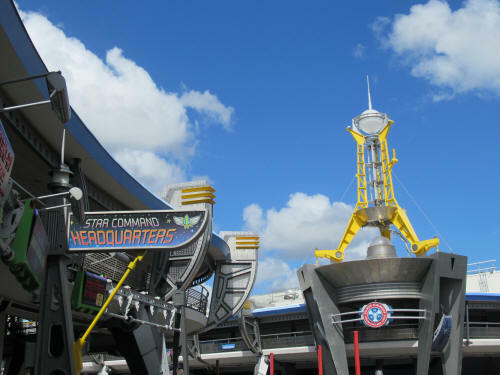 We were finished our intergalactic adventure just a bit before lunch time so we found a shady spot to escape the heat at Tomorrowland Terrace. After resting there for a few minutes we went on to the nearby Plaza Restaurant where we met Curtis for lunch. It was tasty, as always. 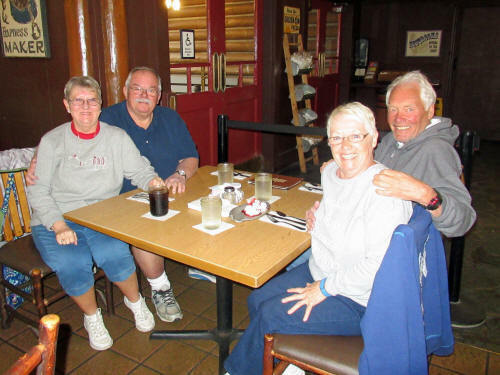 I had my usual grilled Reuben, Carol had her usual Philly Cheese-steak and Curtis tried a new menu item, a grilled chicken sandwich. It must have been good because Curtis didn’t leave a single crumb on his plate! After lunch Carol browsed Emporium while Curtis and I went to the PhotoPass shop to find some missing pictures from a few day before. 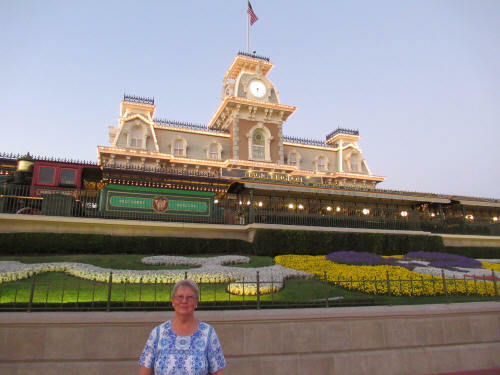 Once we had the pictures all fixed up we headed across Town Square to City Hall where Carol was waiting for us. 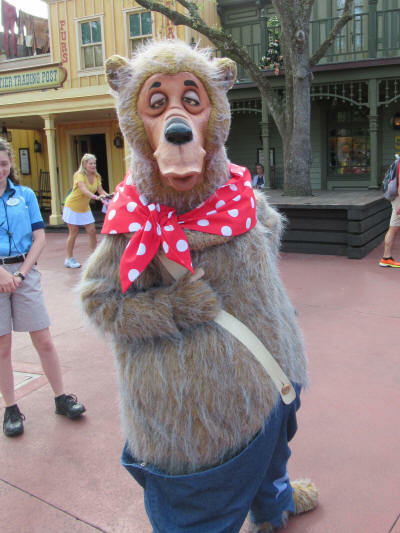 Curtis was going to prowl the park in search of more characters so Carol and I said goodbye and caught a boat back to the campground. We were home with the puppies at 1:30. We had a restful afternoon; Carol did a couple of loads of laundry and I tossed the ball for the dogs. The highlight of the afternoon was when Blue treed a wild turkey. He’s never even noticed any of the critters here before so we were certainly surprised when he tore off in hot pursuit! Our 'bird-dog' was pretty proud of himself! This has been a good trip for critter sightings; we’ve seen the usual cardinals, deer, squirrels, turkeys and armadillo. 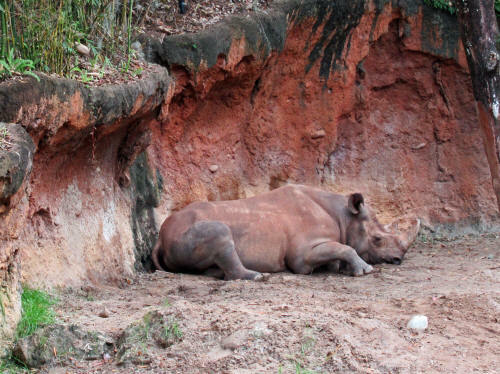 The rarer sightings include otter, macaws and a pot-bellied pig. 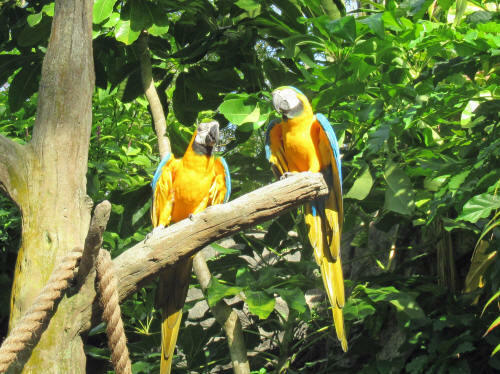 There were two people walking on one of the sidewalks in the campground and each of them had a colourful macaw on their shoulder. Just a few campsites away from us are campers who have their pet pig staying with them in their motor home. 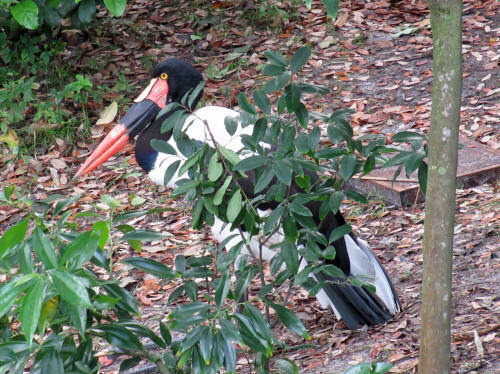 We have seen them out walking it several times! We were home with the dogs shortly after 8:00 p.m. and enjoyed a quiet night of television. Correction! 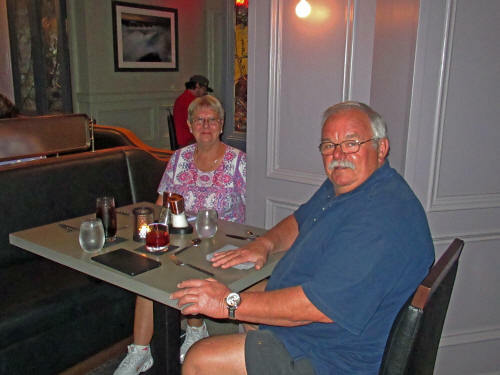 Our last meal at Les Chefs de France was not in December 2011 . . . our friends Scott and Judy from Kingston Ontario e-mailed to remind us that we had dinner with them at Les Chefs de France on February 2, 2012 and saw Remy from the Ratatouille movie. Sorry Scottie . . . it wasn’t that we found the time we shared with you to be forgettable. Honest, it wasn’t that at all! It was an uncomfortable morning. Although it was only 71 degrees at 8:00 a.m. the humidity was 98%. The air was so thick that you had to chew it a bit before you could breathe it in. I was sitting out with the three dogs sipping a coffee when Blue started his ‘grumpy bark’. It’s a soft, almost under his breath, ‘Ruff, Ruff.’ Carol and I think he intended it to mean, ‘I am here and you are in grave danger!’ Unfortunately, he says it so meekly that the meaning comes across as the exact opposite! I thought he was threatening the kids playing next door . 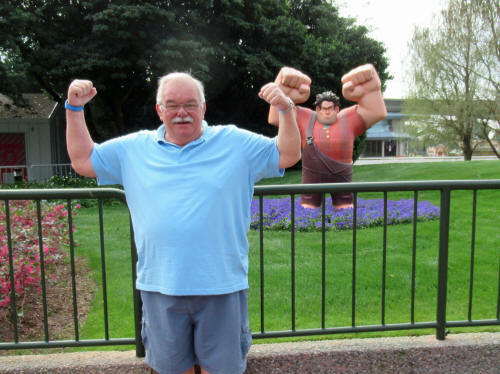 . . but it turned out that he was grumping at a pig! 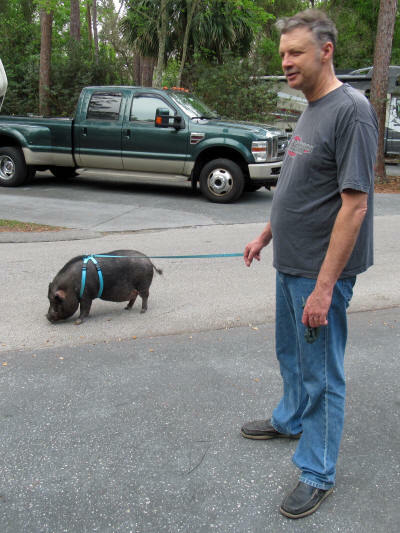 Maxwell, a pot-bellied pig, from Reading PA was strolling past with his owner. 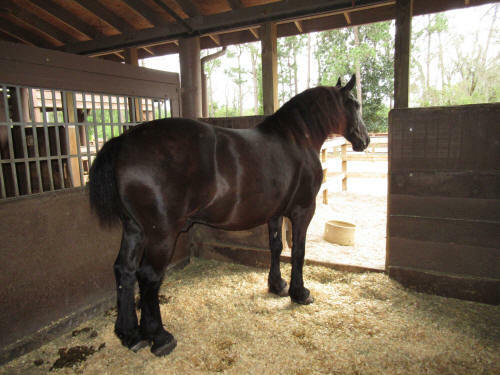 Max is 8 years old and according to his owner he is a big fan of Fort Wilderness! He was kind enough to wait while I went back to get the camera, then pose for several photos! 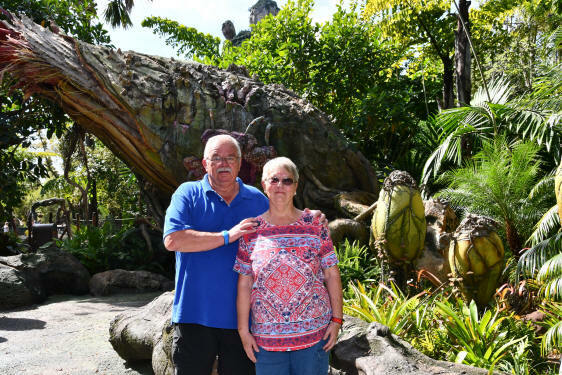 We arrived at Disney’s Hollywood Studios at 9:30 and it was no longer 71 degrees, it was in the low 80’s and climbing quickly. 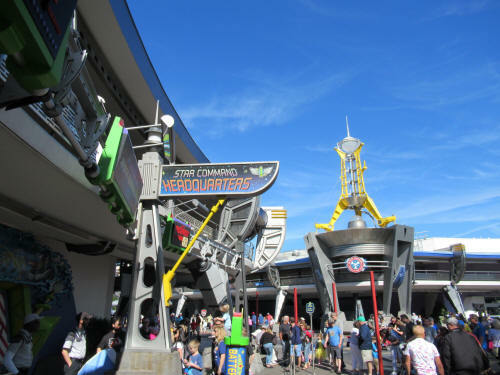 The entry lines were huge and we were delighted to see a very short queue at the Annual Passholder entrance. 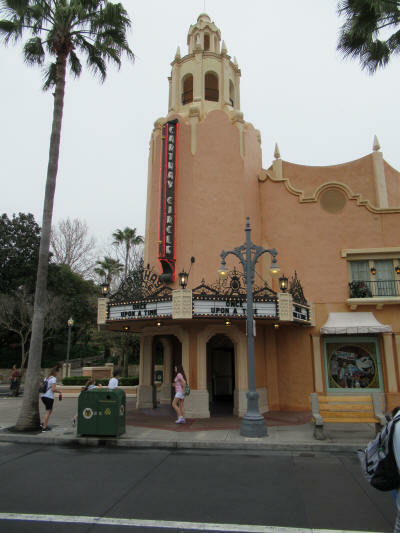 We had to get to Tower of Terror before our FastPass expired at 10:00 a.m. so we scurried down Sunset Boulevard. 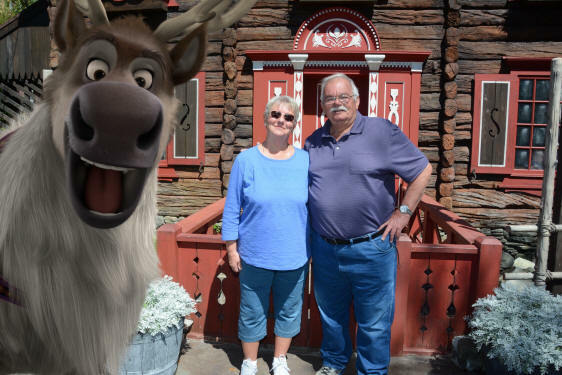 We made one quick stop for a PhotoPass picture. 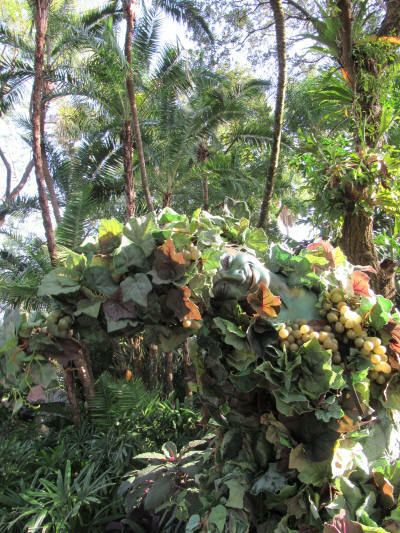 The FastPass line moved very quickly but by coincidence stopped beside the bougainvillea shrubs just outside the lobby. We often comment about how beautiful they are, but we never take a picture. Today we did! 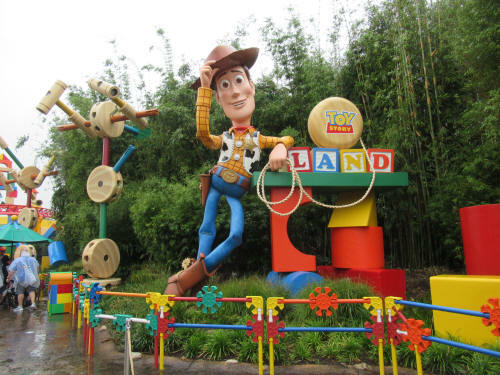 After our plunges in that high-speed elevator we headed across the park to Toy Story Land. 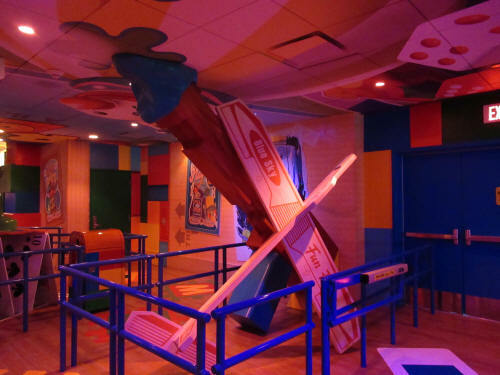 We had a FastPass for Toy Story Midway Mania but along the way Carol got an e-mail telling her that the ride was out of service for a while. 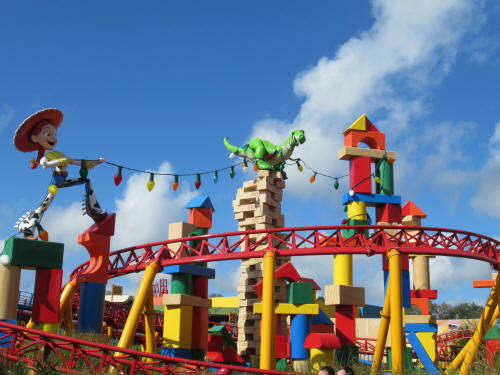 Since we didn’t have anything else we wanted to do, we carried on to Toy Story Land to take a few pictures. 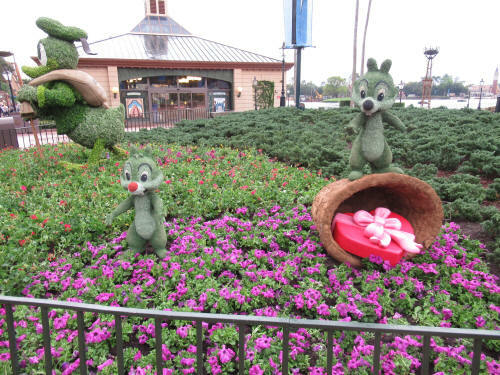 The theming in this new area of the park is really cute! As we passed Midway Mania they were letting people into the FastPass line, so we joined the queue. 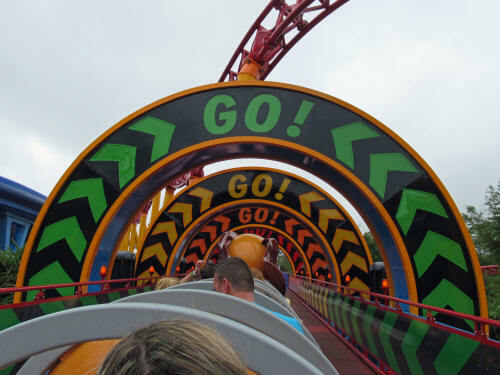 It turned out that two of the three tracks for the ride were down, only one was operating. 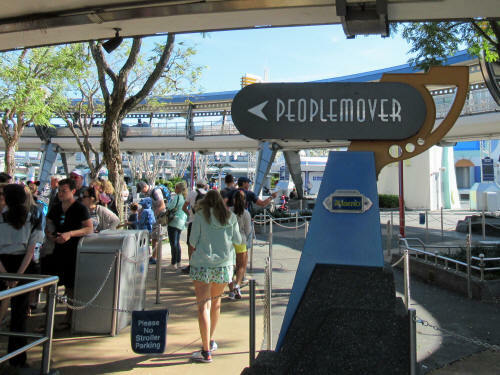 Since the attraction was working at 1/3 capacity they were not admitting standby riders, only FastPass holders. 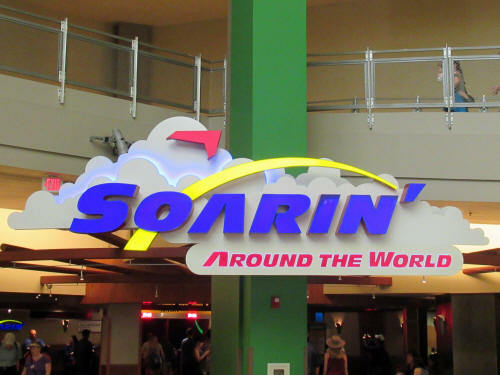 The line moved much slower than usual, but during our 30 minute walk through the building we could look across an empty hall that would usually be filled with standby riders. 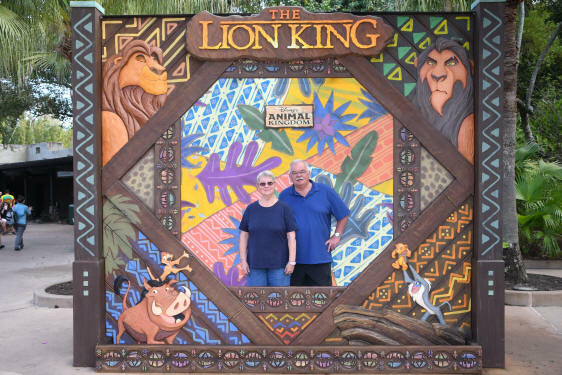 We had a unique opportunity to see all the decor in the new entrance and capture a few pictures. It was well worth the inconvenience! 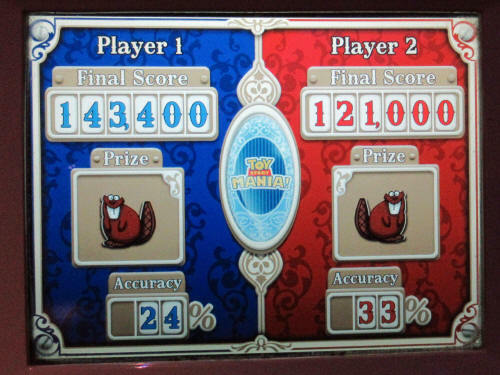 It was 11:15 when we finally exited Toy Story Midway Mania and the heat was stifling. 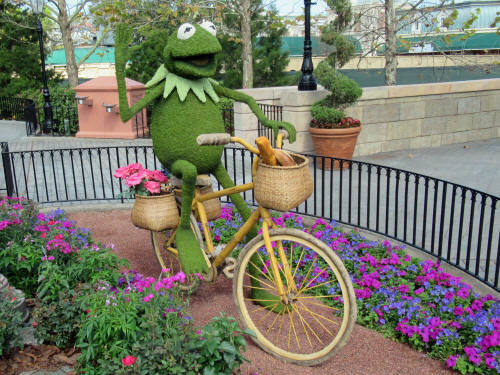 It was approaching 90 degrees, the humidity was still oppressive and we were too hot to use our next FastPass at MuppetVision 3D. 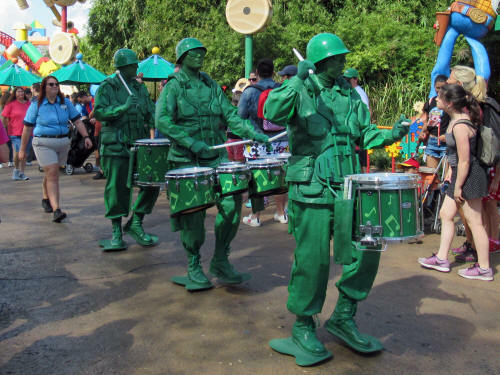 We yielded the sidewalk to some Toy Soldiers who marched by, then made our way to The Commissary where we had an early lunch. 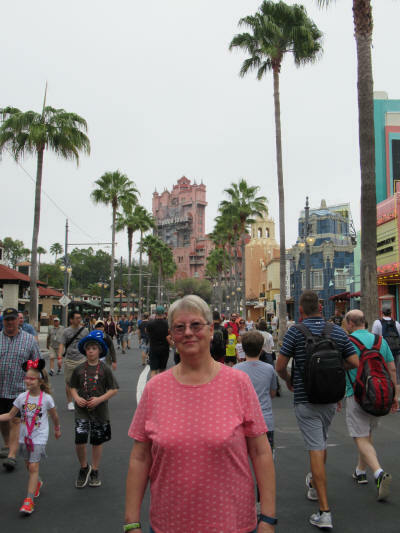 Carol browsed her way through a few shops along Hollywood Boulevard while I waited for her at Sid Cahuenga’s shop, near The Crossroads of the World. She arrived in just a few minutes, laden with a Minnie Mouse teapot and a carrot cake cookie. I approved of both . . . not that it matters! We were back to the campground at about 12:30 and took the dogs for a short walk. 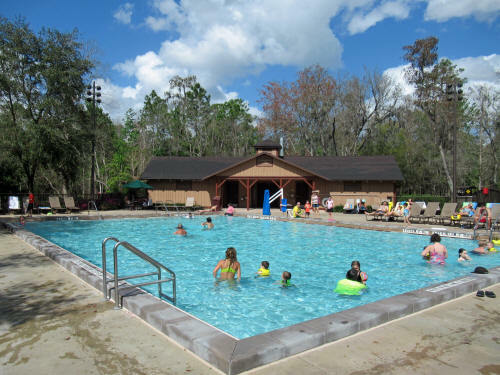 We were pretty quick to decide that we really needed to cool down, so we put the dogs back in the air-conditioned comfort of the camper, put on our bathing suits and took the golf cart to the pool. Aaahhhh! A 45 minute soak worked wonders! 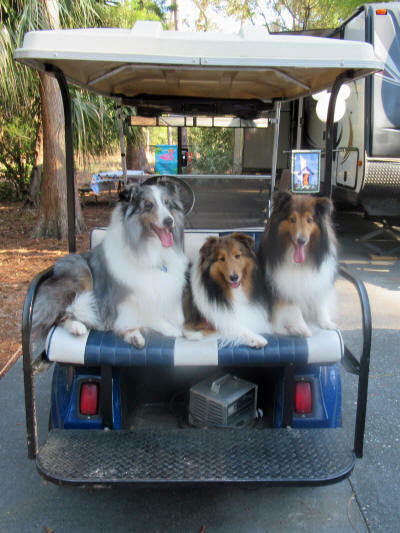 When we got back home we loaded the three dogs on the golf cart and drove them all around the campground. They really do like their rides in the fresh air! We spent a quiet afternoon with the puppies, sometimes sitting out in the lawn chairs, then going in when we got too hot. Yes, we had a nap too! Later in the afternoon we were sitting out in the shade behind the camper when Carol spotted a small brown bird she didn’t recognize. 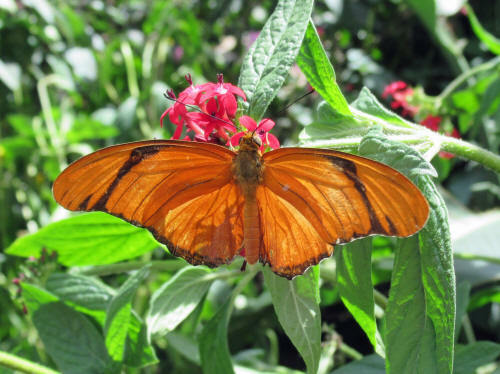 She stalked it for a few minutes with the camera and finally got a picture that was clear enough to help her search online and identify it. 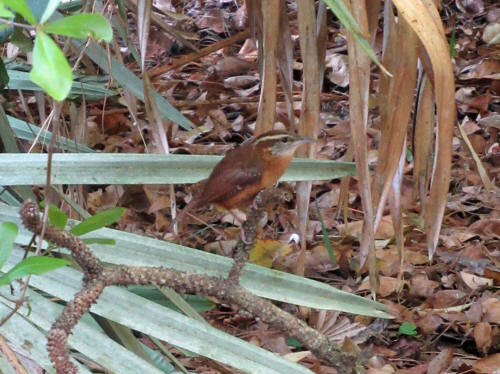 We think it was a Carolina Wren. 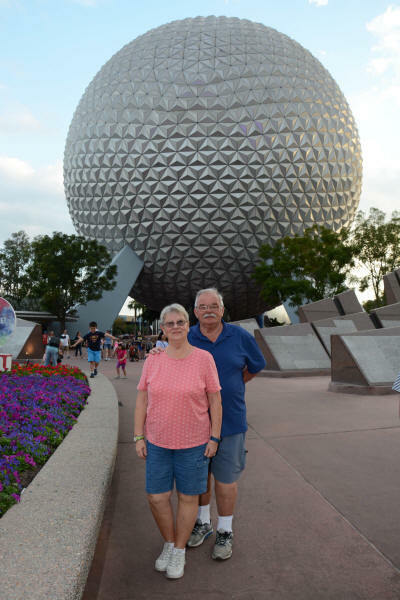 We fed the dogs at 5:00, their regular dinner time, then we headed off to EPCOT. 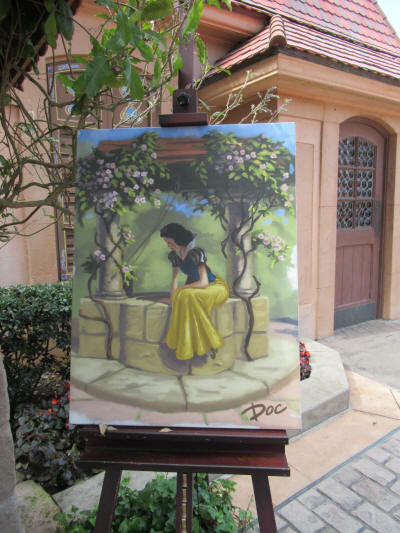 One of Carol’s favourite Disney artists, Alex Maher, was there for signings as part of the Festival of the Arts. 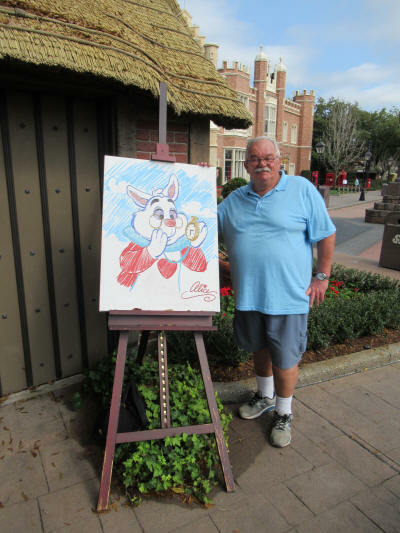 Carol has been admiring one of his prints featuring Bambi and she wanted to have Alex sign it. We had just said hello to Alex and Carol had gone off to buy the print when our friends Gary and Anita Schaengold from Dayton Ohio stopped to say hello. 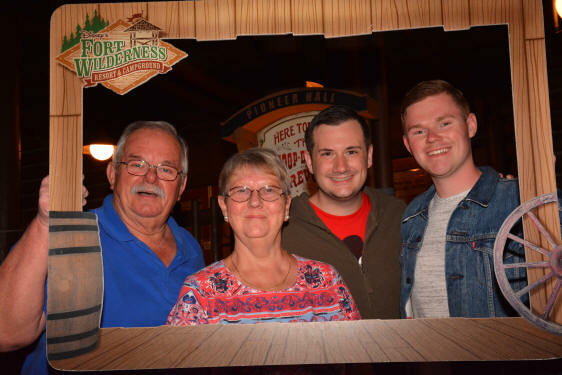 We had a great time visiting with Gary, Anita and Alex; it was like a 30-minute Dayton Disneyana Reunion. 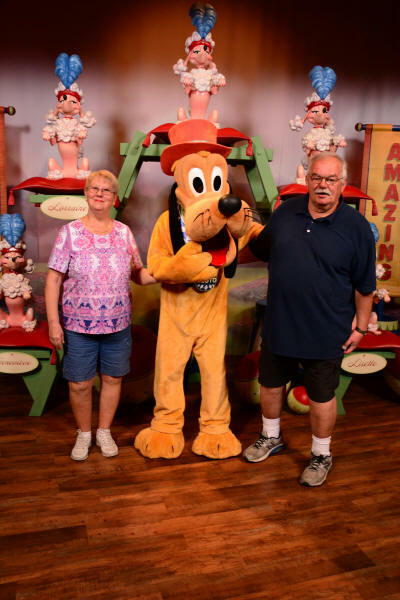 We will see Gary and Anita again this June at Dayton Disneyana and Alex is returning this year as one of the featured speakers. For the first time Alex’s wife Marion will be joining him on the trip to Dayton this year. We began our trek to the exit and we were both really dragging our posteriors by the time we got to the car. The temperature had plummeted to 87° and we were happy to crank up the A/C to the max! 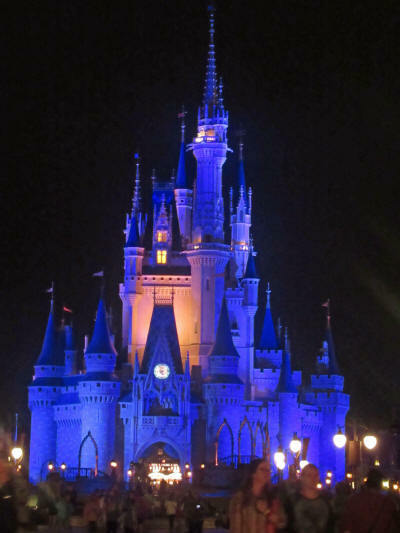 For the first time in over a week we were home with the dogs when the nightly fireworks at the Magic Kingdom began! They seemed relieved! 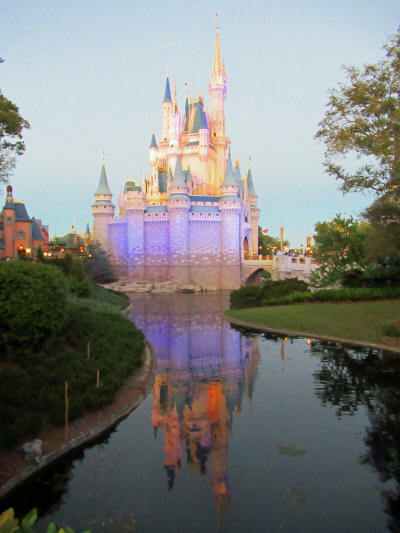 Our morning began abruptly at 5:30 a.m. That’s when the Disney Princess Half-Marathon began with a flourish of fireworks. There were 15,000 runners registered for the event and they were segregated in a number of corrals which were allowed to start at staggered times over a couple of hours. Each corral enjoyed their own private burst of fireworks. The cannonade continued with a loud boom every ten or fifteen seconds, BOOM, BOOM, BOOM, until 8:15. 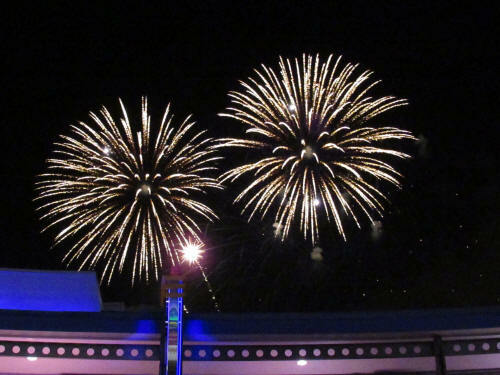 The dogs have gotten used to the evening fireworks from the Magic Kingdom and EPCOT, but they were a bit disconcerted by this morning barrage. We learned very clearly this morning that the boys have not developed their pyrotechnic poopin’ skills! The poopin’ was deferred until after 8:15! 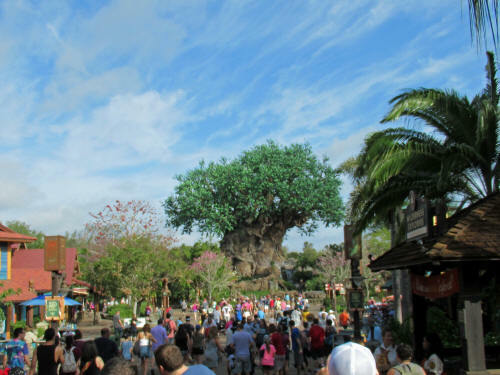 Disney has been announcing for a few days that traffic would be impacted by the marathon and that travel times might be slow, so we left a bit early on our way to Animal Kingdom. 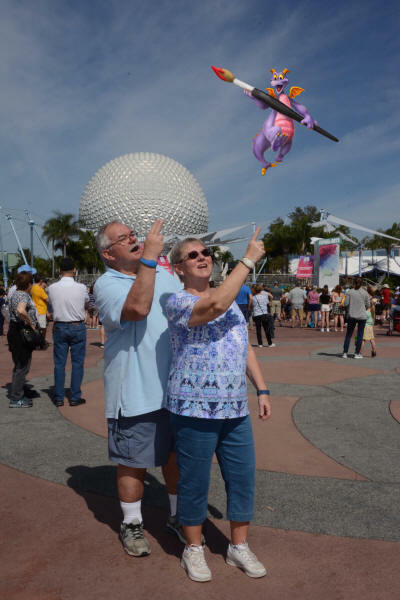 Disney’s forecast was all too true! 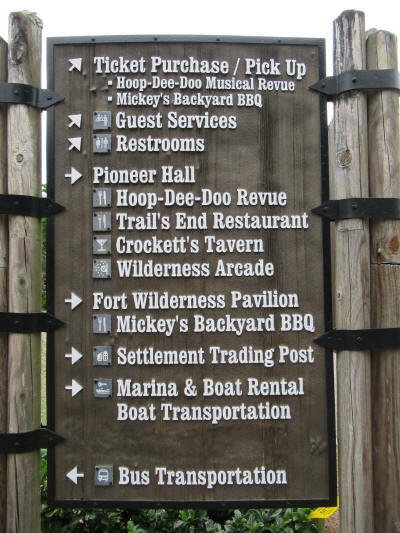 It took us a very long time to make the left turn at the Fort Wilderness exit at 8:45. 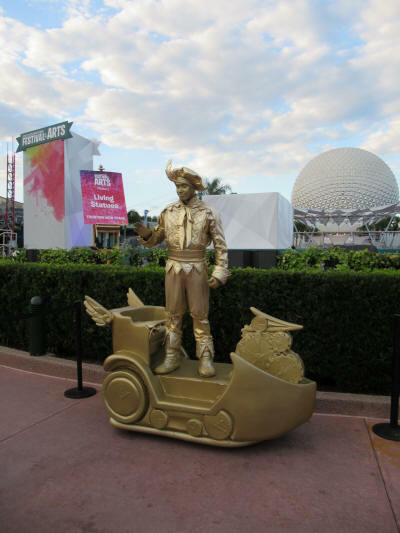 World Drive had been closed for the race and all Magic Kingdom traffic was passing by our front door. 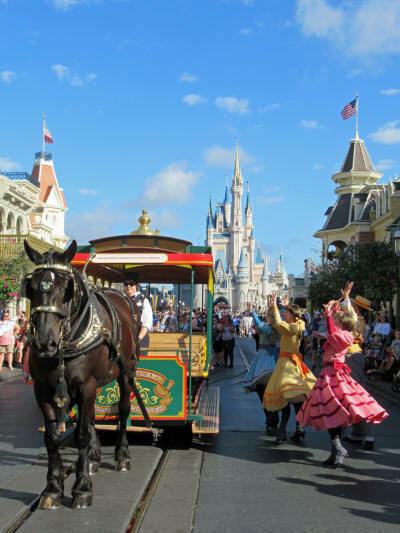 A kind Samaritan finally stopped to let me make my escape and traffic lightened significantly as we left the Magic Kingdom area. 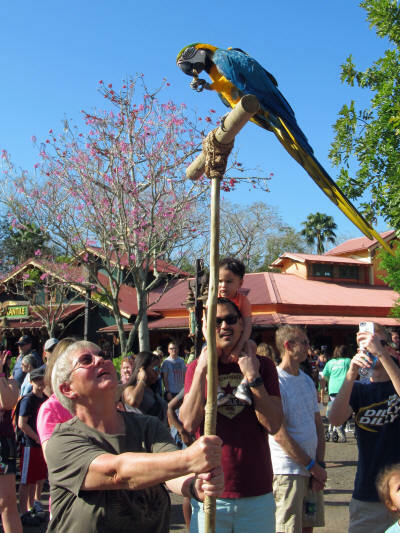 It picked up again as we reached the entrance to the Animal Kingdom parking lot. It was creep and crawl again! 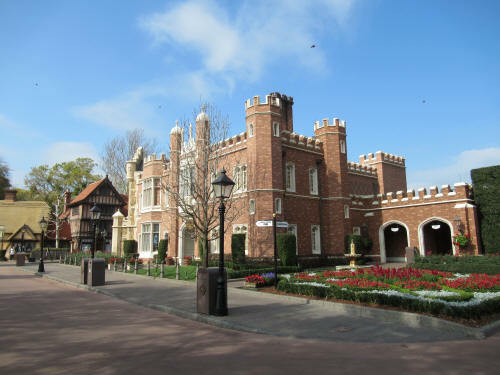 It was 9:25 when we entered the theme park. The normal 15 minute drive took 40 minutes today! 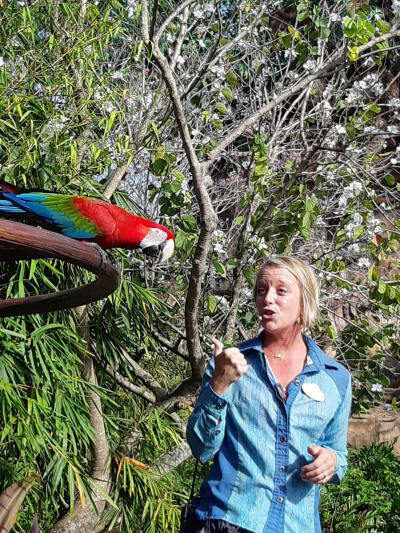 As we approached the Tree of Life the prelude music for ‘Winged Encounters - the Kingdom Takes Flight’ began to play so we staked out a good spot to capture some more pictures of those magnificent macaws! 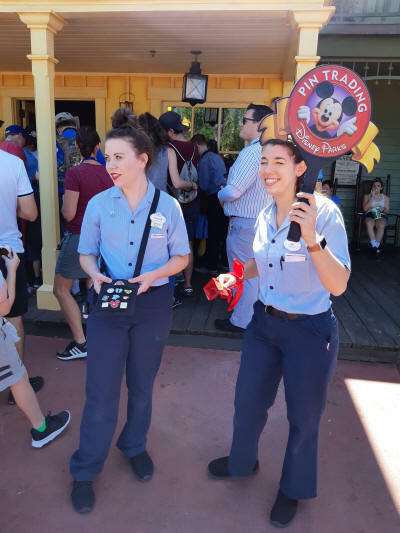 Be sure pick up a copy of the daily time schedule, in the rack beside the park maps, the next time you visit Disney’s Animal Kingdom. 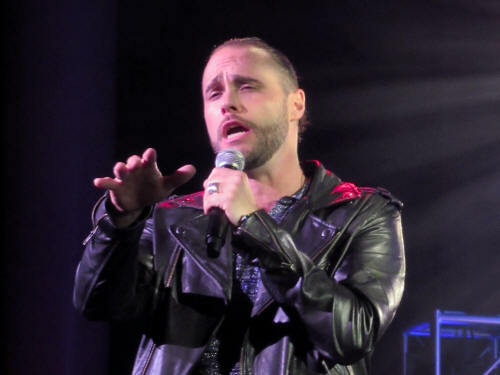 Check to see when this amazing show is scheduled so that you can be sure to see a performance. It takes place several times each day. 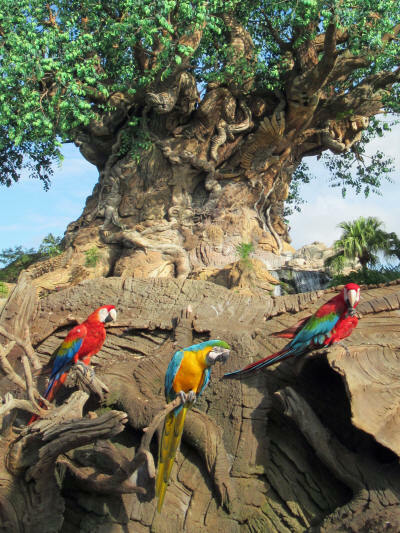 Once the macaws flew back to their home we carried on toward Kilimanjaro Safaris. 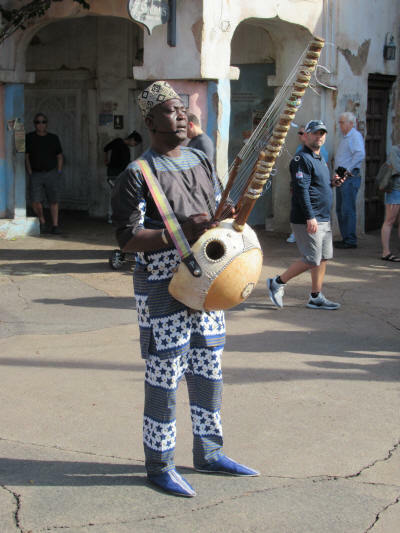 One of the African street performers was playing a Kora as we passed by the Tamu Tamu shop. This unique stringed instrument has no fret or keyboard. Instead it has more strings than any hand-held instrument I have ever seen. It’s played sort of like a harp but has more of an acoustic guitar sound. It’s quite entertaining! 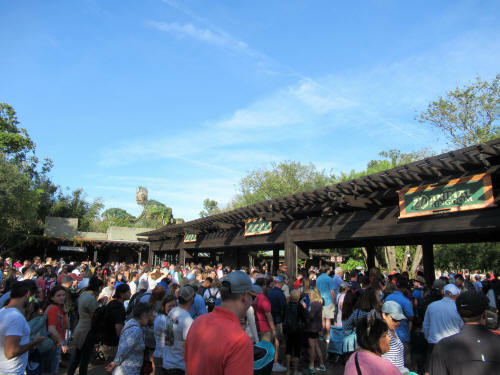 The park wasn’t too busy first thing in the morning, the standby line for the Safari was only 35 minutes long when we joined the FastPass queue. Once again it wasn’t a great safari, we didn’t see all of the animals, but we had some terrific views of those that we did see. 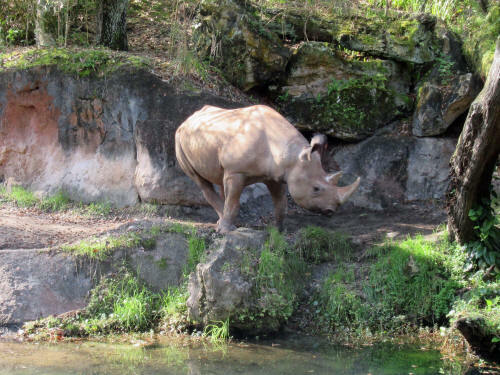 As we exit the safari ride we always take a left turn just past the parked safari vehicle on the right side of the trail. It’s only about 25 yards form where you say ‘Kwaharini” and exit the big truck. 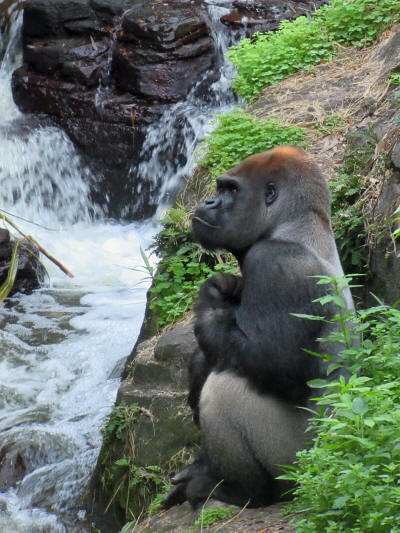 There’s a small viewing area there, and more often than not we see a silver-backed gorilla. 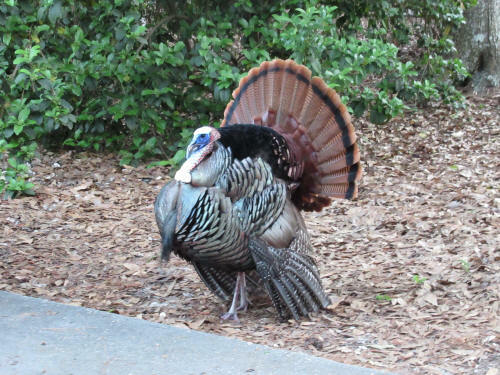 This big guy was posing for Carol today! 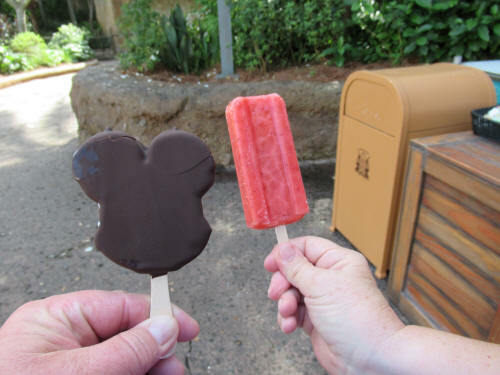 We took the trail from Harambe past the Lion King Theatre and picked up a couple of refreshing cold treats along the way. It was 88° at 10:30 and they sure tasted good! 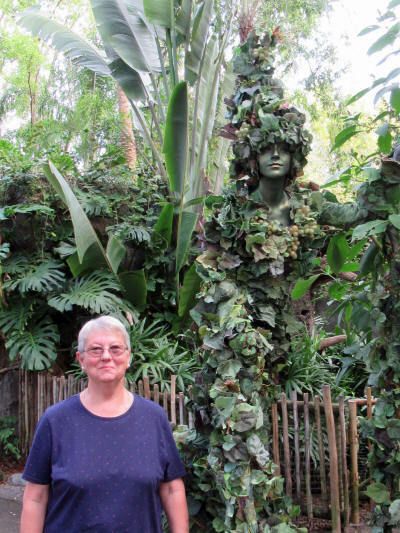 Carol didn’t decide until the very last minute whether or not she wanted to ride Avatar: Flight of Passage. 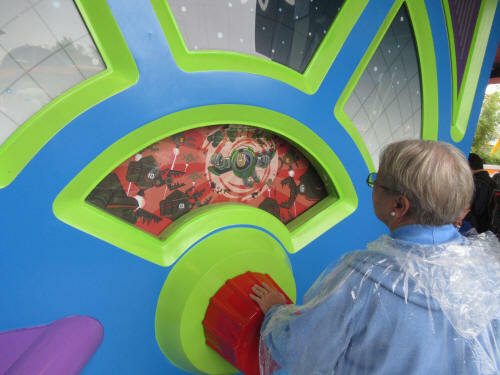 She loves the attraction, but it’s a pretty intense motion-simulation experience and sometimes she feels a bit uneasy when it’s over. 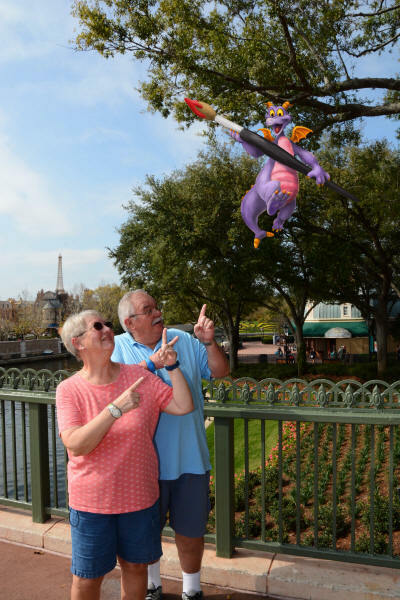 As we approached the FastPass line she decided to give it a shot! 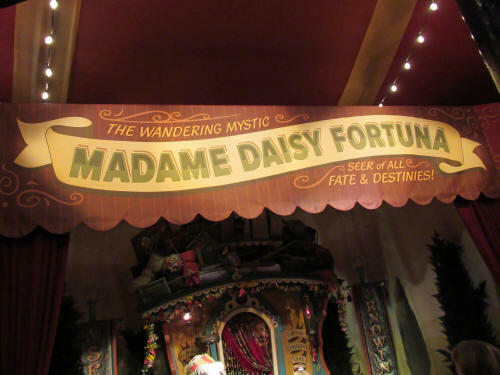 It was odd walking through the queue - we didn’t see another person all the way through the line - until the cast member directed us into one of the boarding lines. 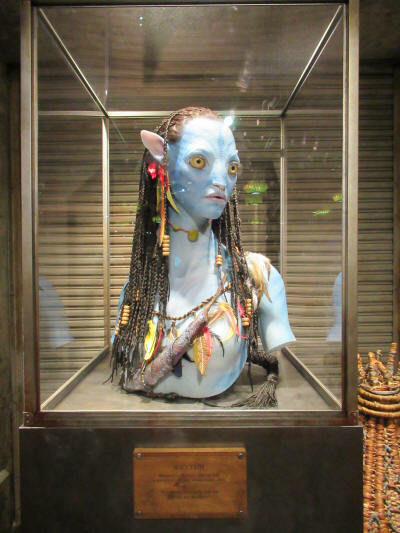 I’ve now enjoyed the Avatar ride more than a dozen times and it just doesn’t get old. Every time I experience it I pick up on something new! For Carol, it could have ended about a minute sooner. She was a little bit ‘off-centre’ when we finished. 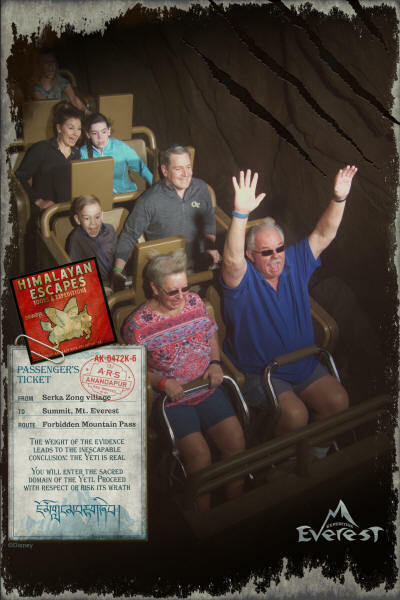 We had another FastPass, this one for Expedition Everest, but Carol didn’t feel up to a ‘coaster ride’ . . . it was over 90° and we quickly decided to skip Everest and head for home. We were home with the puppies by 12:30 and enjoyed a restful afternoon. We tossed the ball a bit for the dogs out behind our campsite and later Carol and I took the golf cart for a spin around several camping loops. 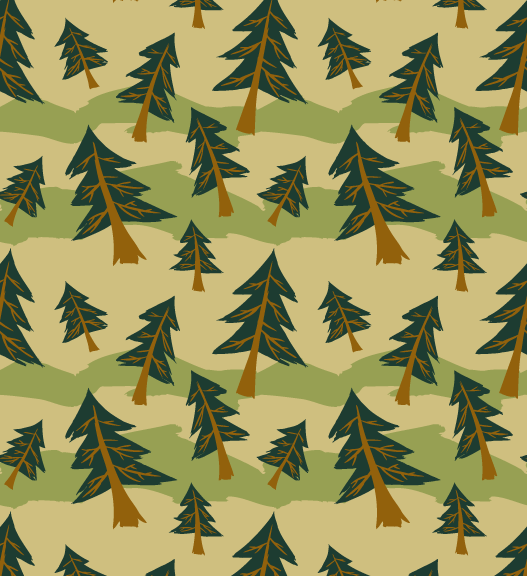 We were looking for campsites we could use in future trips . 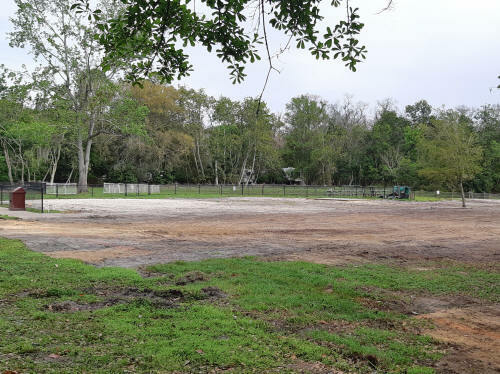 . . we like sites that have a bit of privacy, a large concrete pads, space beside the pad for the dogs to ‘do their business’ and no cypress trees. 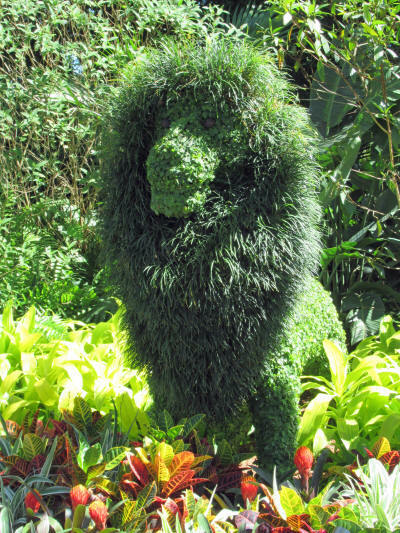 Long-haired dogs and those sticky little cypress fronds are a very bad mix! We found about a dozen sites that fit the bill. Once we get home I’ll draw up some maps of the camping loops and mark those ‘special’ sites on them. 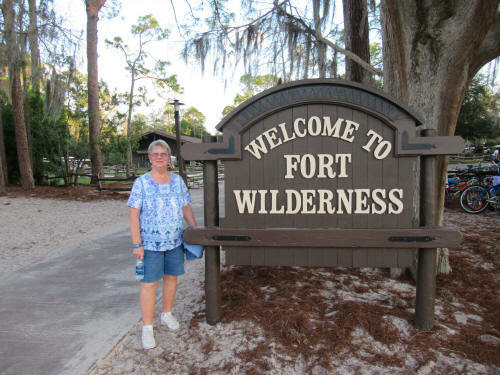 Carol will add the new maps to the toolkit she carried with her when we check-in at “The Fort”. 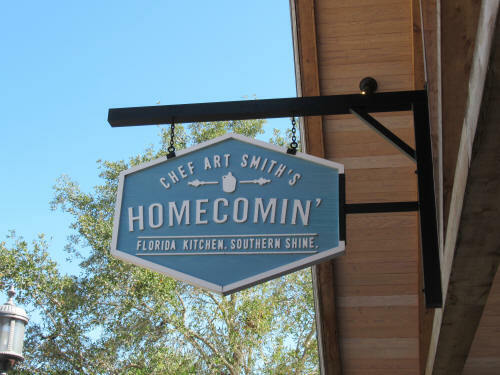 We had dinner reservations at a new restaurant at Disney Springs. The menu looked good when we checked online so we decided to give The Edison a try. The restaurant is well appointed with a late nineteenth century - early twentieth century look and feel. 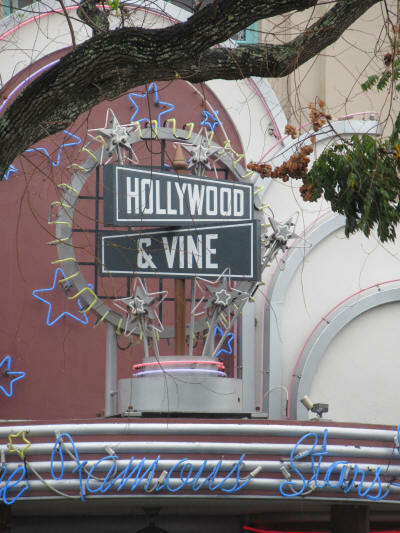 There are old motors and mechanical devices decorating nooks and corners and old silent films are projected on the concrete walls. Carol was OK with the restaurant, I found both the food and drink to be lacking. 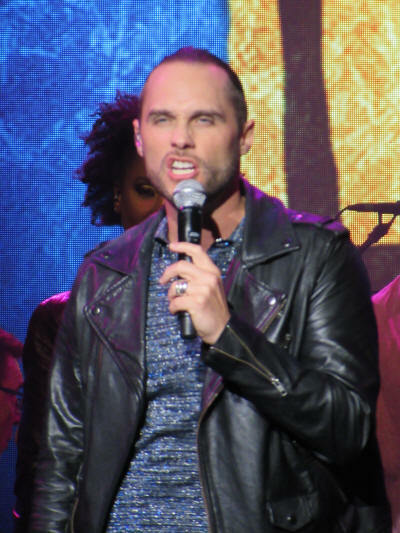 They couldn’t make my favourite cocktail, and I wasn’t at all impressed with the meatloaf I ordered. Carol thought her burger was good, but I’m not sure that The Edison will be on our list again for quite a while! 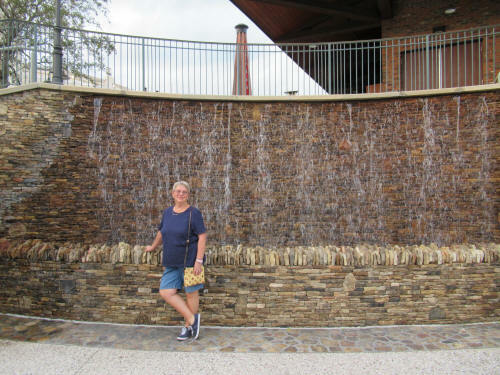 Carol did a quick browse through a couple of Disney Springs shops as we headed back to the parking lot. We were home with the dogs before 8:00 p.m. and spent the night watching the Academy Awards. It was forecast to cool down significantly overnight so we turned off the A/C and opened up the windows before going to bed. When Jak came to wake us up at 7:07 it was refreshingly chilly! I poured a coffee and sat outside shivering contentedly in the crisp, almost-Canadian air. It was a wonderful change! 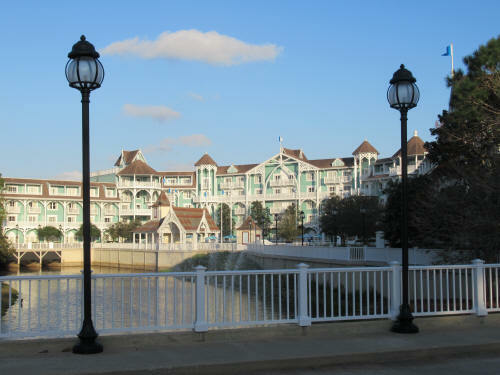 We walked the dogs then took the golf cart to the marina to catch a boat to the Magic Kingdom. The launch had just pulled away as we arrived and we had to wait about a half-hour until the cruiser arrived. It was almost 10:00 before we made it to the park. 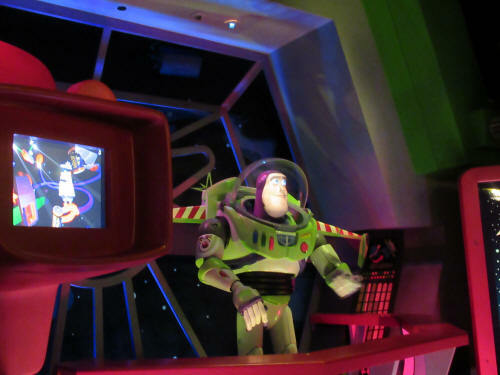 There was a long line or Sorcerer cards at the Fire Hall so we browsed our way through The Emporium and then cut across the hub to Tomorrowland where we had a FastPass for Buzz Lightyear’s Space Ranger Spin. 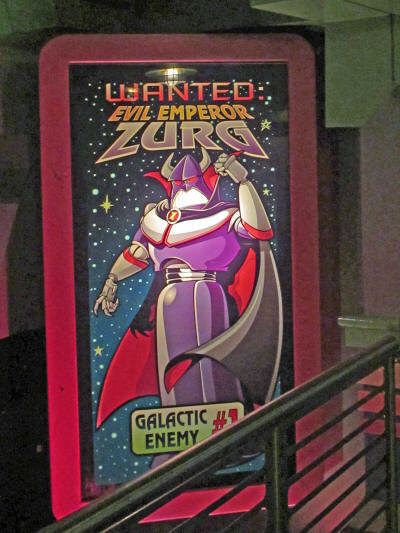 Once we trounced the Evil Emperor Zurg we took a ride on the WedWay PeopleMover. 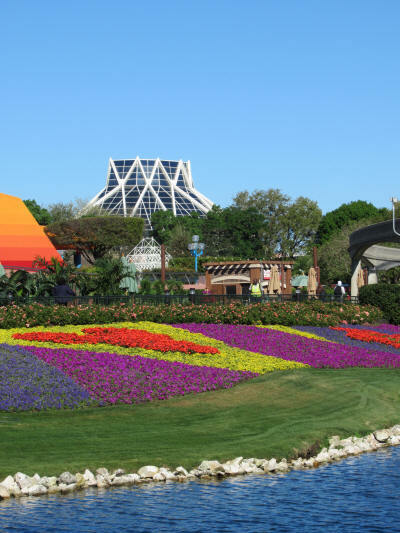 Several generations of younger Disney fans call it the Tomorrowland Transit Authority, but to us it will always be The WedWay! 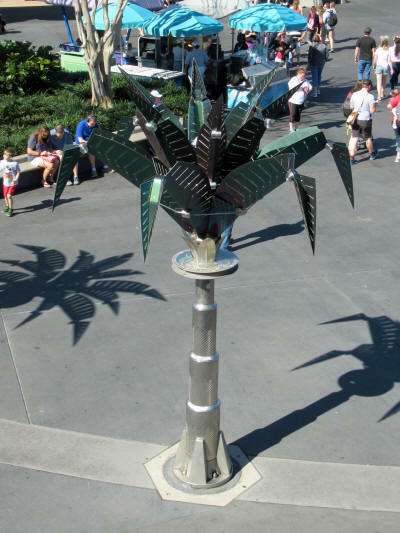 Does anyone else remember when these robotic palm trees used to move in time with the music? 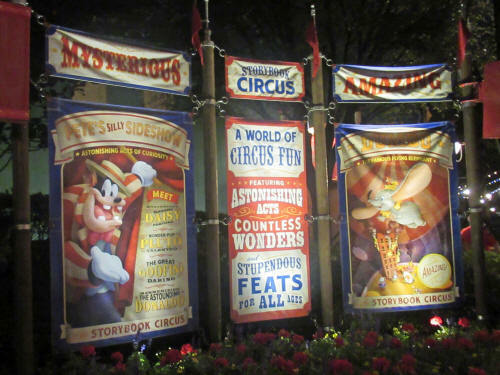 We meandered back to Mickey’s Storybook Circus and captured a few character pictures under the Big Top. 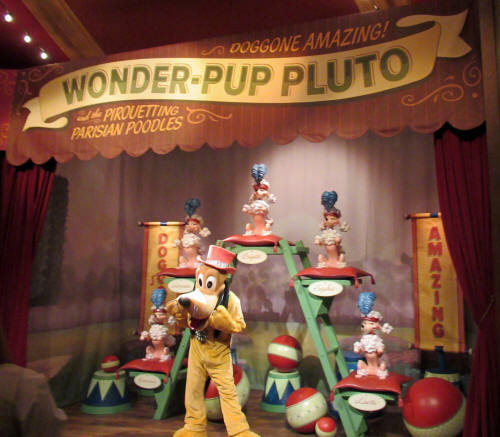 Pluto recently replaced Minnie, he appears beside Daisy Duck and across from Donald and Goofy! 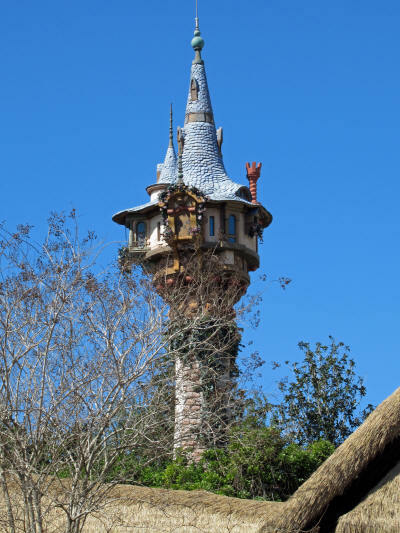 Our next FastPass was for Pirates of the Caribbean so we crossed the park, through The Hub, heading toward Adventureland, passing Rapunzel’s Tower along the way. 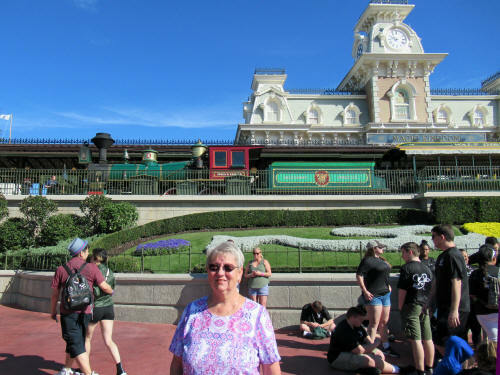 Carol stopped in Frontier Mercantile to check out the pins. 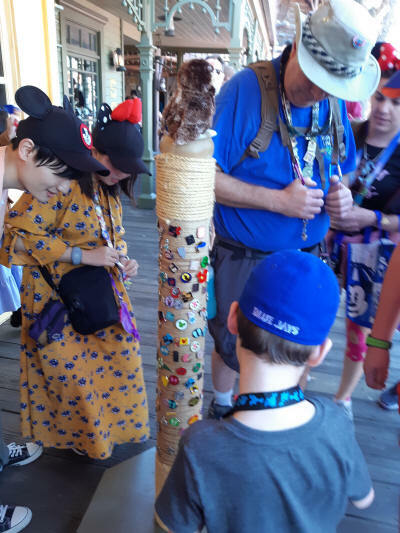 There was a special pin post outside the store, it comes out at noon every day for a 15 minute trading extravaganza. 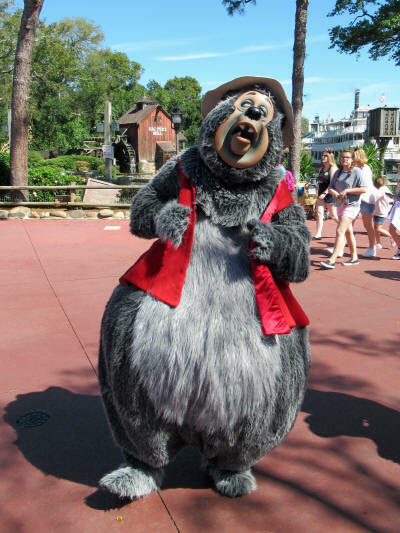 While Carol was busy trading pins I chased a couple of Country Bears up and down the street trying to get a few pictures. They were elusive, but I finally caught them! 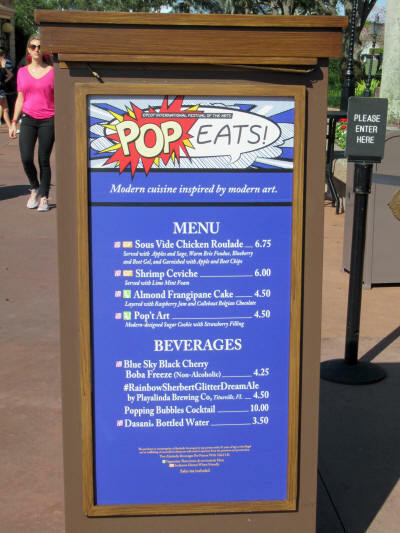 Carol spotted the cart selling egg rolls just after we crossed into Adventureland; we’ve heard very good things about those egg rolls. 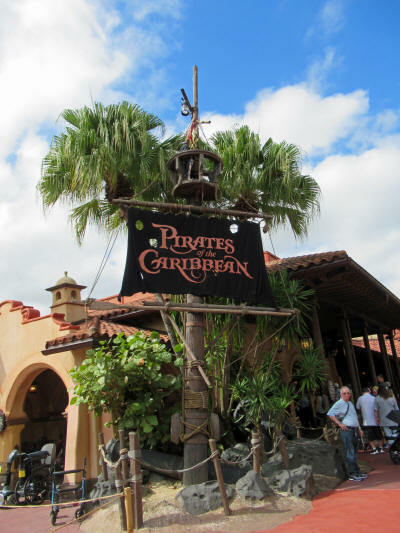 Unfortunately they were sold out so we headed on to our scheduled Pirate adventure. 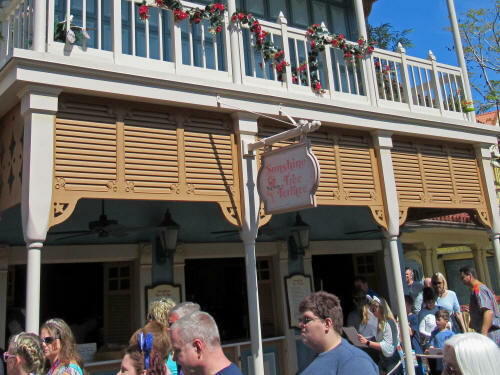 After our swashbuckling ride with Captain Jack and his scallywags we stopped back at the egg roll cart . . . they were expecting a delivery within a few minutes so we joined the line of about a dozen people. I was impressed that so many people were lined up to wait for a snack! After two or three minutes a big red cart rolled up and they began selling the freshly-arrived egg rolls. Carol picked up a tray of two cheeseburger egg rolls which have been very popular. She took one bite of hers, tossed it back in the tray and said, “You can have the rest, I’m going to get a Citrus Swirl.” I ate my egg roll, hoping with each bite that it would get better, but it didn’t. The wrapper was crispy but the filling had the texture of oatmeal porridge and almost no flavour. I tossed the rest of Carol’s egg roll in the trash and picked up a Pineapple float at Aloha Isle. 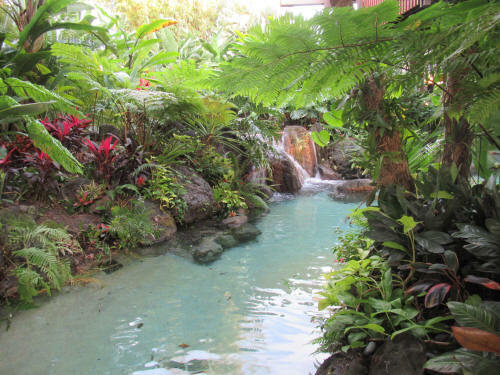 Carol soon returned from the Sunshine Tree Terrace and we sat near Aloha Isle where our ice cream treats cleansed our palates. We really don’t understand why there has been such a fuss about those egg rolls . . . they didn’t suit us at all! 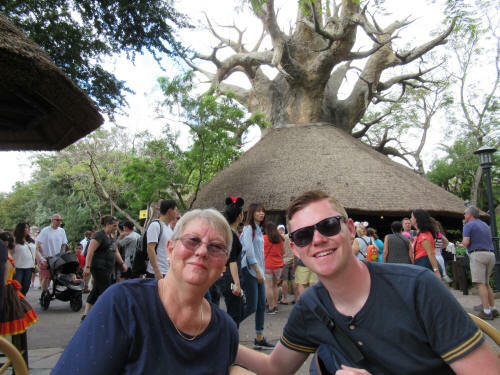 Then it was time for our FastPass at The Jungle Cruise. Yikes! The FastPass line was huge and it was hardly moving! After standing motionless in that queue for a few minutes we checked our watches. It was 12:30 . . . we did a quick calculation - it would take 30 minutes to get through the line, another 15 minutes for the ride, 15 minutes to walk to the dock and 20 minutes to cruise back to the campground. 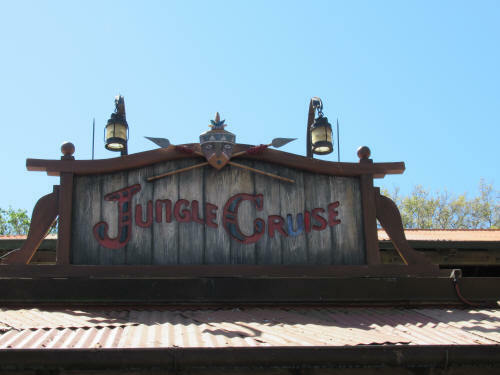 We couldn’t possibly ride the Jungle Cruise and be home before 2:30. That was too long to leave the dogs, so we bailed out of the line! We did a brief browse through The Emporium and picked up our Sorcerer cards as we left the park. The puppies were happy to see us when we rolled up at 1:30. 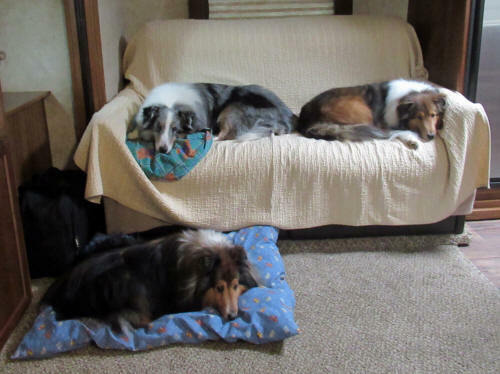 Carol cleaned up the camper, I tossed the ball for the dogs, then we all relaxed for a few hours. 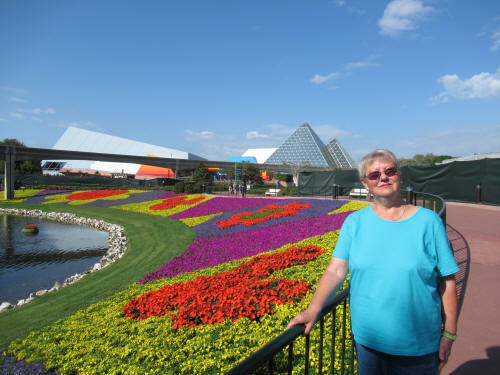 Carol fed the boys about 45 minutes early so we could get away to EPCOT by 4:45. 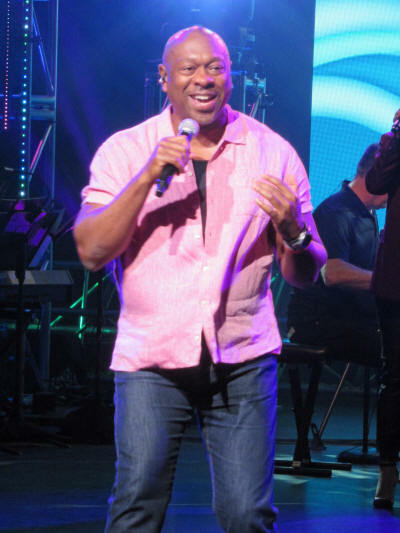 We had a concert to attend! 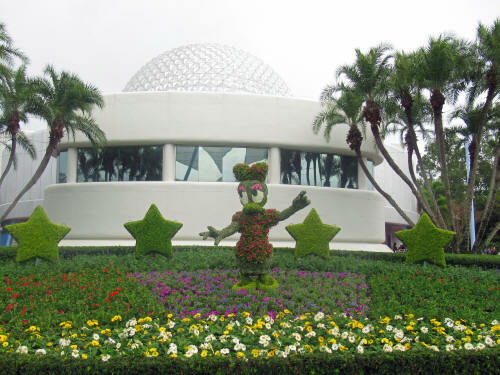 It was about 5:00 when we arrived at EPCOT and made our way toward the America Gardens Theatre. 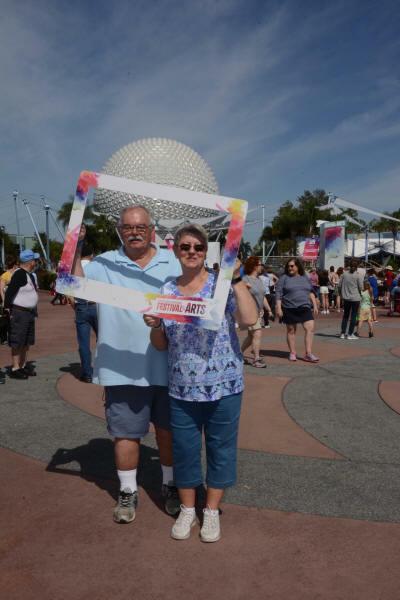 We made a few very quick stops along the way to see some of the Festival of the Arts displays. By 5:30 we were in the queue . 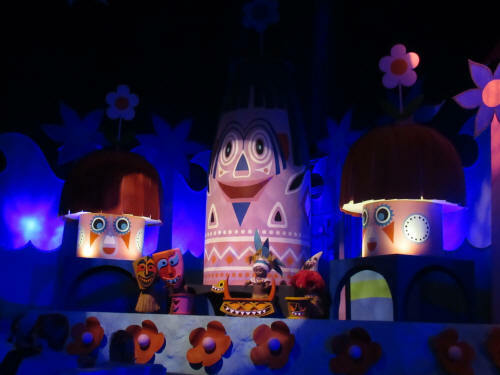 . . the theatre was already filled for the 5:30 performance so we waited in line to be seated for the 6:45 show. 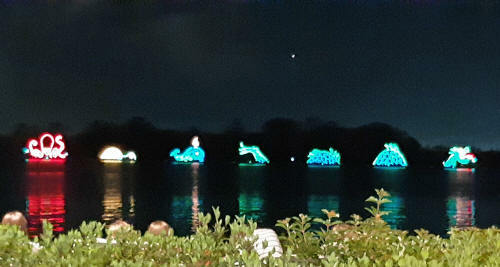 We were only about 40th in line, so we could hear and watch the 5:30 show, from a distance, while we leaned against the railing alongside the Seven Seas Lagoon. 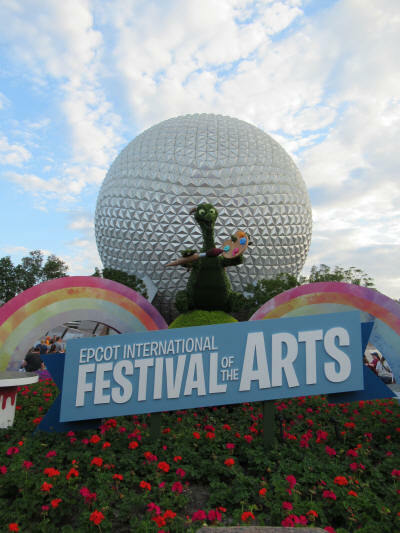 This was the final evening of the Festival of the Arts and tonight’s show featured all four of the performer we had seen in the last two shows. We filed into the theatre at 6:30 and got terrific seats. 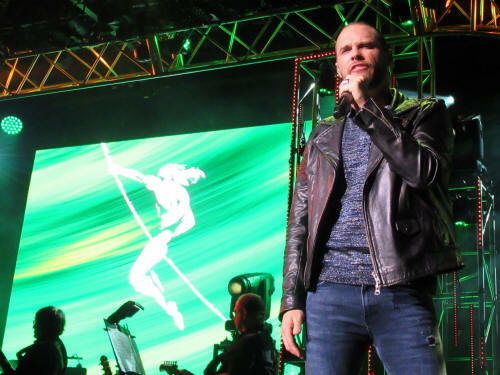 It was a spectacular performance . 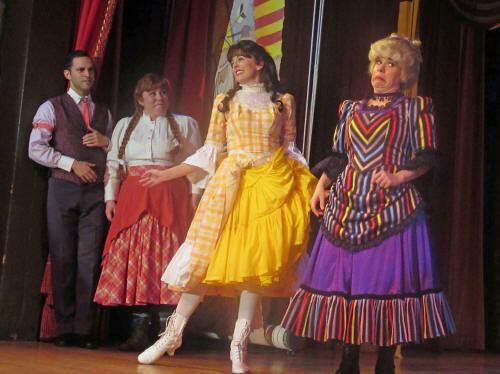 . . it brought the house to it’s feet several times and finished to a rousing ovation! After the show we took a slow stroll back toward Spaceship Earth, stopping to enjoy some of the festival displays and the unique art along the way. 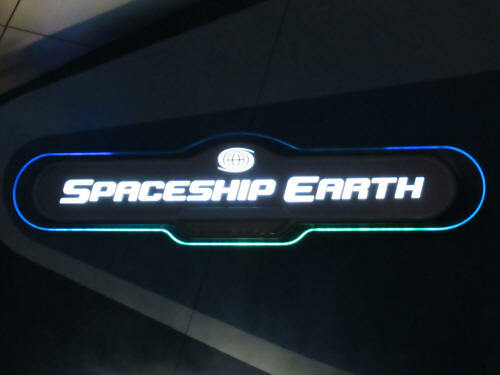 There was no line for Spaceship Earth when we arrived; that’s unusual so we took advantage of it and enjoyed a journey back in time! 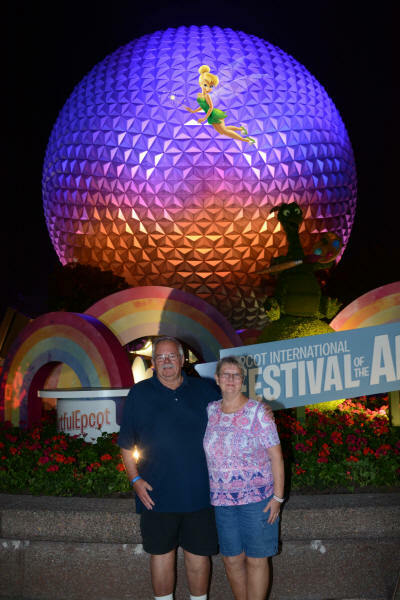 We wrapped up our day by posing for a picture with Figment in front of the giant geodesic dome known as Spaceship Earth. We were home with the puppies just after 9:00 p.m. and enjoyed a bit of television before bed. It was a delightfully nippy 63° when we rolled out of bed at 7:15. We both poured a coffee and sat outside enjoying the refreshing chill of the morning air! It sure is a welcome relief from the heat we’ve had over the past week. 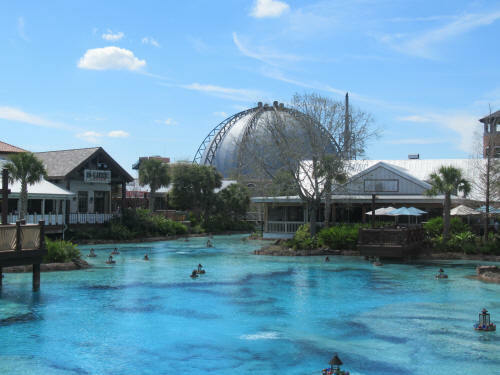 It has felt much more like a Florida August than a Florida February! After a half-hour of chilly bliss I went inside to finish writing and uploading our trip report while Carol took the dogs for a walk. From the canal looking at our site. The trailer you see through the trees is ours! From our campsite looking back toward the canal. At 10:00 a.m. we put the dogs back in the camper and hopped in the car for a quick shopping trip. Carol had a few things to pick up at a grocery store and wanted to check out a nearby discount shoe outlet. 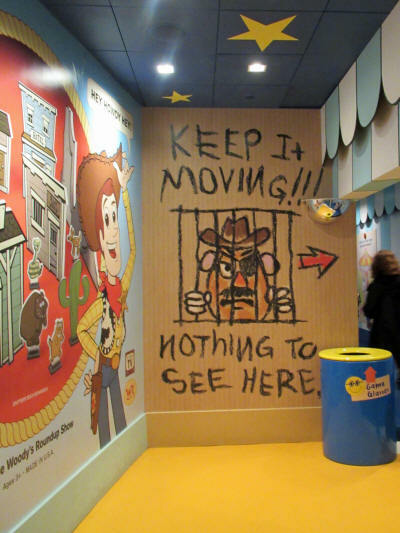 Our first stop was Disney’s Property Control to see if there was any new merchandise being ‘cleared-out’. 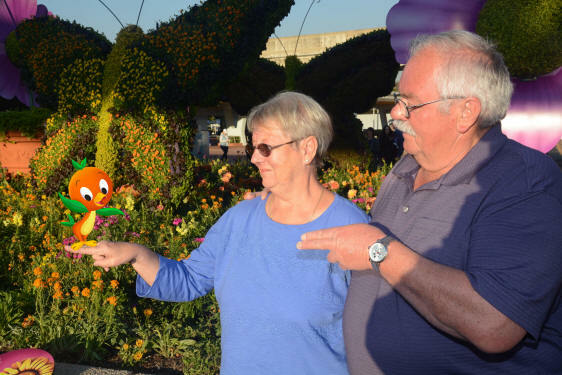 The pickings were pretty slim, but Carol picked up a pins to use as traders. 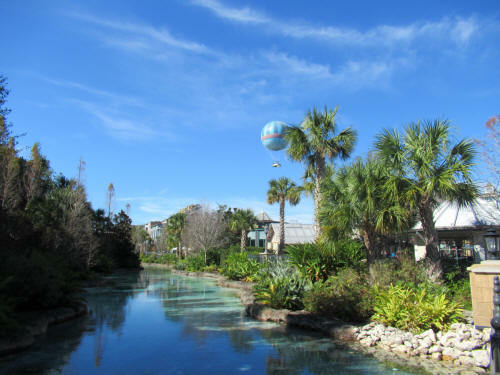 We drove to a Publix Supermarket on Route 192 west of Walt Disney World where we picked up a few things to eat while we’re here and a few things to take home with us. The principal thing we really needed was a box of kleenex, so naturally we forgot that! 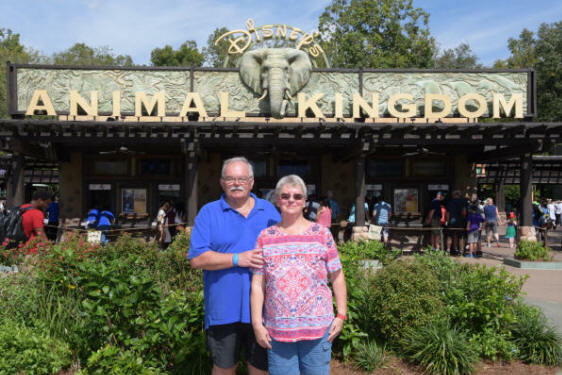 We stopped at the Chik-fil-A restaurant on 192 just west of the Animal Kingdom park, thinking that it wouldn’t be as busy as the one on Route 535. Boy, were we wrong! Like most Chik-fil-A stores , the drive-thru is two lanes wide but in this location you cannot get to the parking area without first spending a few frustrating minutes in the drive-thru lane. The place was very crowded and busy, but the staff seemed to be quite used to it. Our lunch arrived fairly quickly and as always it was hot and tasty. By the time we finished at the restaurant we had had enough shopping. Carol decided to leave the shoe store for another day . . . probably a day without me. She shops more effectively when I’m not lurking anywhere nearby! We were back to the campground and let the dogs out for some ‘chores’ about 1:15. Before long Carol and I hopped in the golf cart and headed to The Settlement. 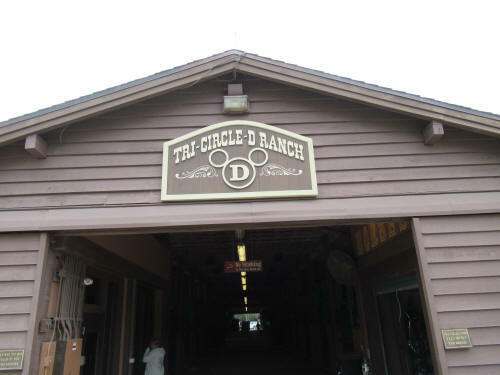 We parked beside Pioneer Hall and walked over to the nearby barns at Tri-Circle-D Ranch. 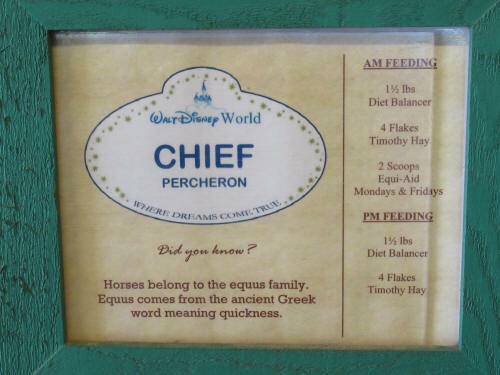 The ranch is home to all the horses that work at Walt Disney World. 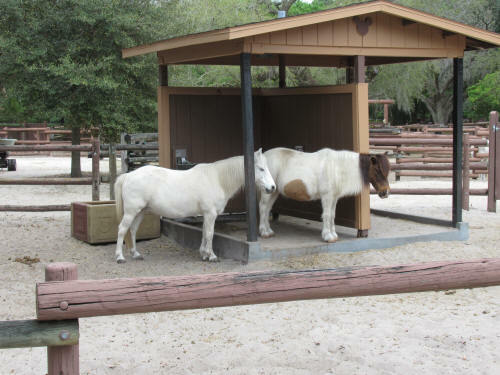 Those horses that pull the trolley up and down Main Street USA, the ponies that pull Cinderella’s Carriage, the parade horses, the horses used for those romantic carriage rides at both of the Port Orleans resorts and Fort Wilderness Campground and the horses from the trail rides at Fort Wilderness, they all call the Tri-Circle-D Ranch home. 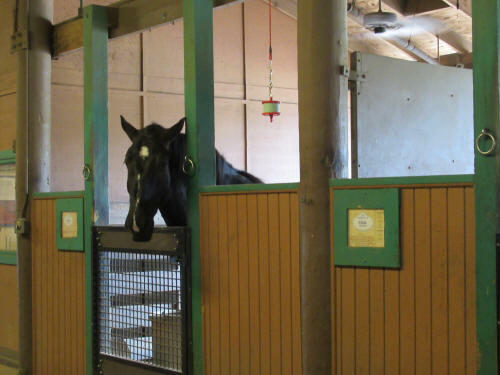 If you want to see those magnificent horses, up close and personal, drop by the barn any day at 12:30 p.m. and take part in the daily tour they offer. 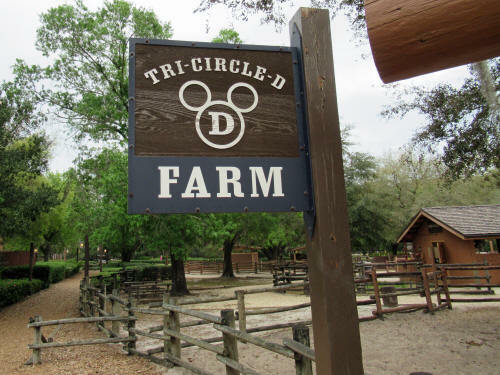 We were too late for the tour today so we wandered through the barn on our own, then visited Tri-Circle-D Farm next door. 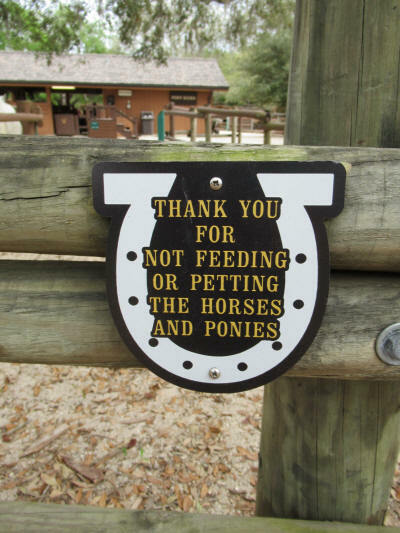 The farm next to the ranch used to be a petting-zoo filled with a variety of farm animals but today the only ones left are a few ponies. Today there were a few youngsters enjoying a pony ride as we walked by. 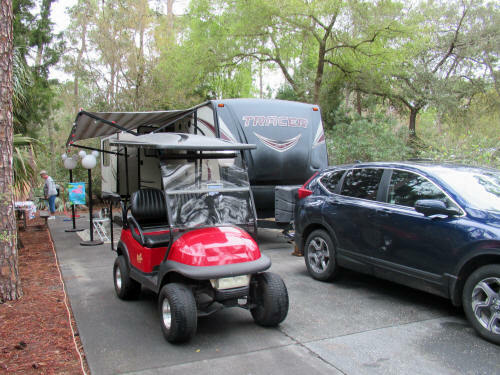 After our tour we carried on in the golf cart and toured a couple more camping loops to look for sites we might like to camp in during future trips. While we saw a few sites in the last remaining loops we were quick to agree, once we had surveyed every loop, that the 700 and 800 loops are where we really want to be! While we were passing through the very last loop on our list Carol spotted a big turkey at the back of one of the sites. The next campsite was empty and I saw something large at the back. I pointed and said, “Is that another turkey?” ‘No,” she replied, “I think it’s a big hawk sitting there!” I stopped the golf cart and handed her the camera. 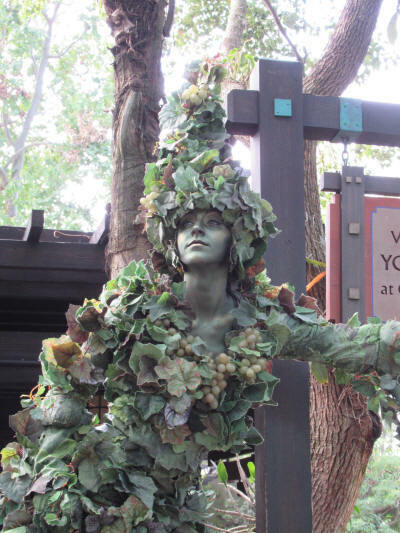 She crouched and tip-toed ever so quietly through the leaves and pine needles . . . I was holding my breath . . . all was deathly quiet . 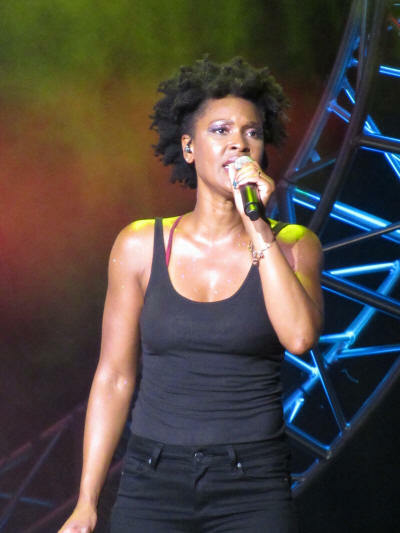 . . when she suddenly said “‘Damn!”, straightened up and stomped back to the golf cart. 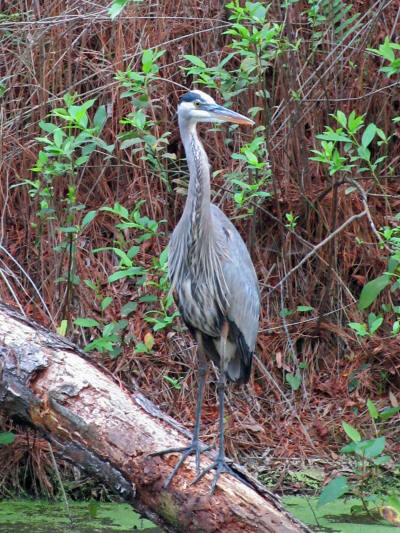 She had successfully snuck-up on a cypress tree stump! We were back home with the dogs at 2:45 and settled in for a well deserved nap! 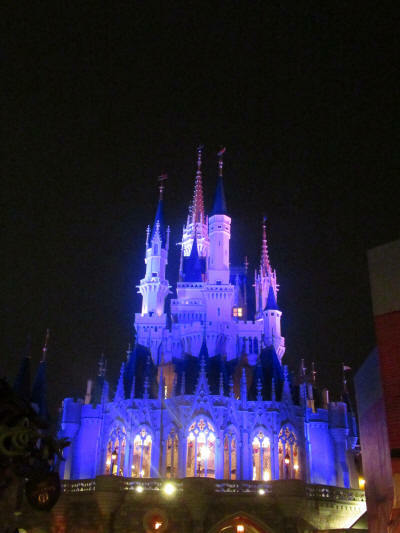 It was raining lightly as we left for the Magic Kingdom at 6:30. 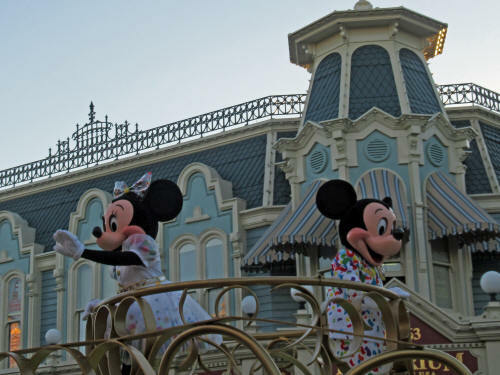 There was a special event for Annual Passholders, the park was open, only for Passholders, from 10 p.m. to midnight. We had to wait again for the boat, it sure will be nice when they get that second cruiser back in service! 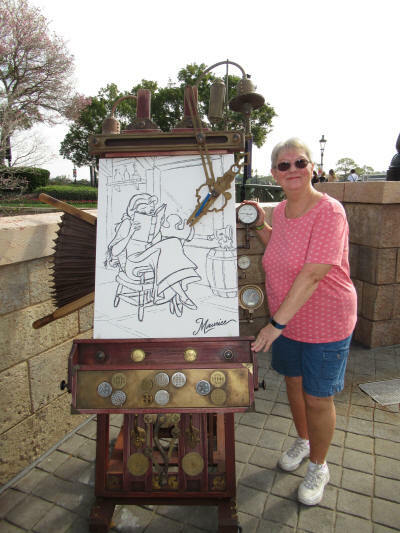 We stopped at the Main Street Cinema so Carol could activate her sorcerer game but our MagicBands didn’t work. We had to go to the Fire Hall to reset the bands, then the game worked just fine. I snapped a few pictures while Carol played. 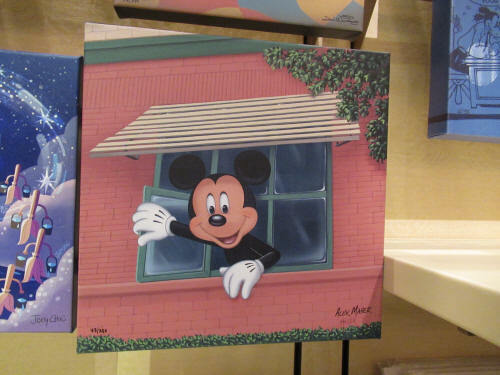 We both like this piece by Alex Maher featuring Mickey looking out a window at Disney’s Burbank Studio. 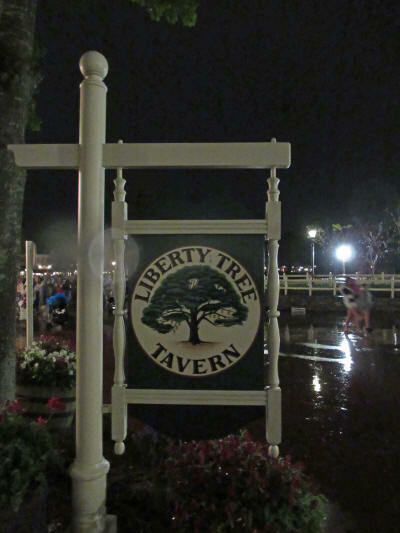 Once Carol had cast a few spells we headed to Liberty Square for dinner at Liberty Tree Tavern. 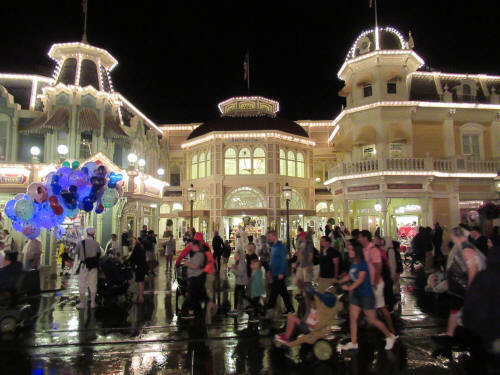 As we walked up Main Street there were a few people waiting for the 8:00 p.m. fireworks but most were filing out of the park because of the drizzle! 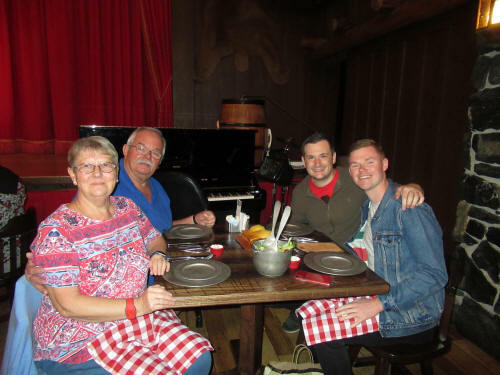 We had a much better table than the last time we ate at Liberty Tree and we really enjoyed our meal, although we still miss the characters there! 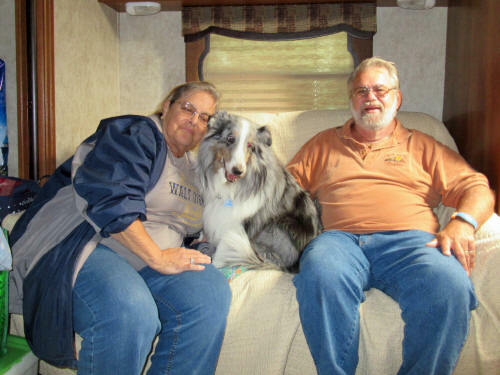 We could hear the ‘Happily Ever After’ fireworks booming away while we ate and thought about poor Blue shivering and quaking back in the camper! After dinner we hopped into a Doom Buggy and rode through the Haunted Mansion. What a treat; there was absolutely no line - it was a ‘walk-on’. 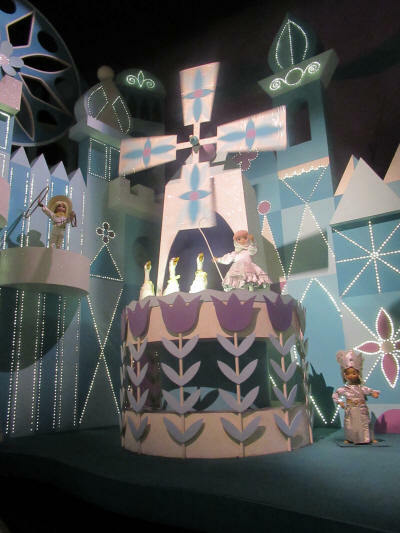 We walked up the hill to Fantasyland and by the time we got to It’s A Small World they were checking wristbands for the special Passholder event. After we watched all those cute little dolls we entered the standby queue for Peter Pan. 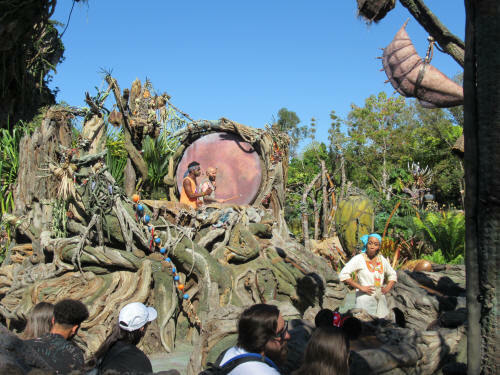 Although this is a ride we never miss, it’s probably the first time in twenty years we’ve been in the standby line. 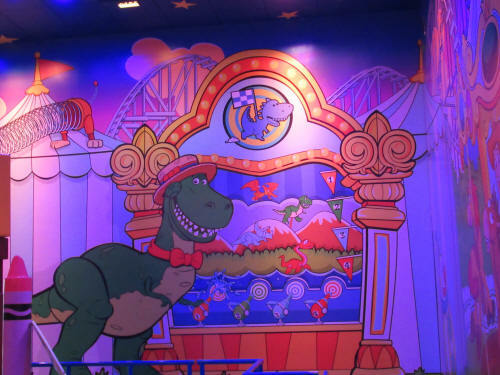 There was some new art and theming we had never seen before. 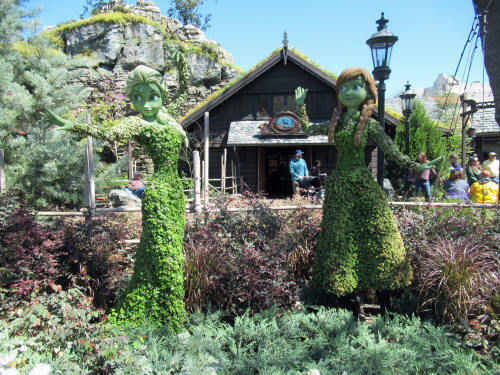 After our ride through Neverland we stopped for a special Photo-op with a prop from Rapnuzel. 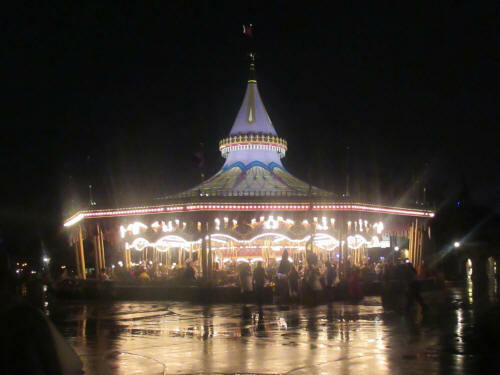 As we crossed Fantasyland and approached the carousel Carol surprised me and said, ‘Let’s ride!” I picked one of the highest horse and climbed awkwardly up onto it. I thought that if I picked the highest I could be sure that I’d be able to get off! Well . . . the dismount wasn’t pretty! The horse was about 18” higher when it stopped. There was no way my feet could reach the ground as I stood in a stirrup, so I had to hold on tight with my arms and slither down. It felt like I was dislocating my hip! Carol found it delightfully funny though! 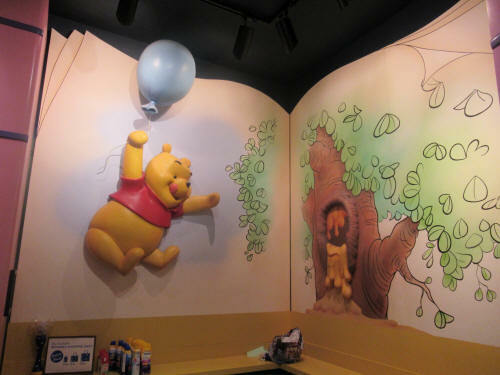 Next on our agenda was a ride with Winnie the Pooh. It’s been a few years since we’ve ridden in a honey pot! 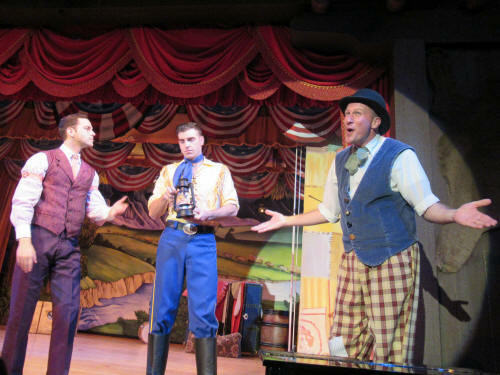 We headed to the Big Top for another Passholder special PhotoPass. 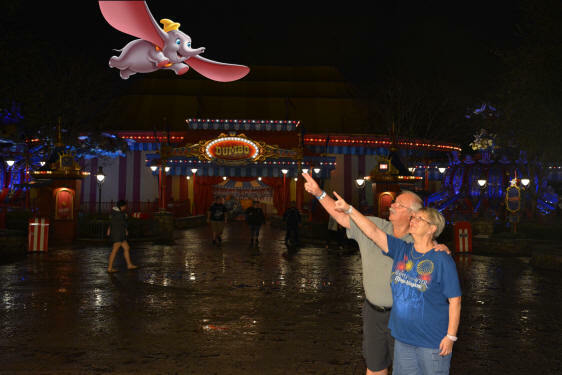 This time it featured a special fly-by with Dumbo. Carol had one more surprise in store for me! 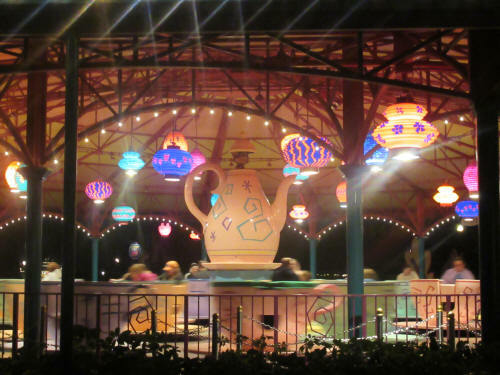 As we passed the Tea Cups she stepped in the queue. 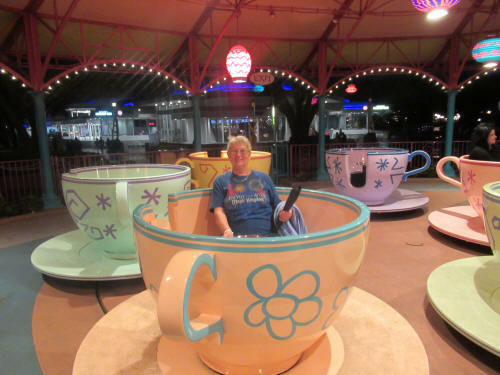 She doesn’t like the Tea Cups . 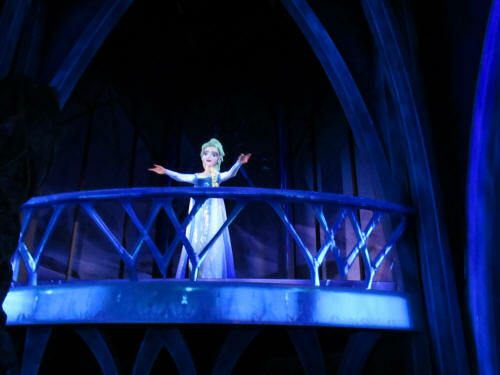 . . she doesn;t like the spinning! Can’t you see that in the pictures? 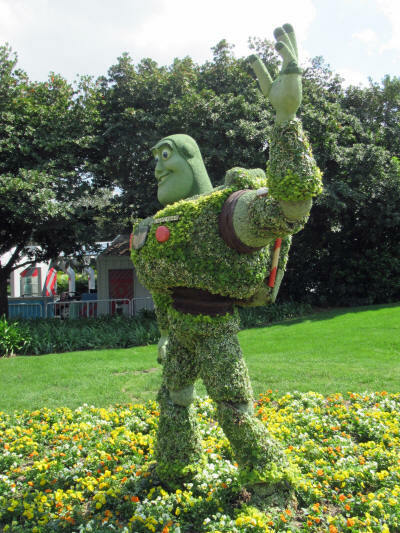 We were beginning to tire, and we were both limping a bit from our ride on that wooden horse, so we took a quick spin with Buzz Lightyear and headed toward Main Street. 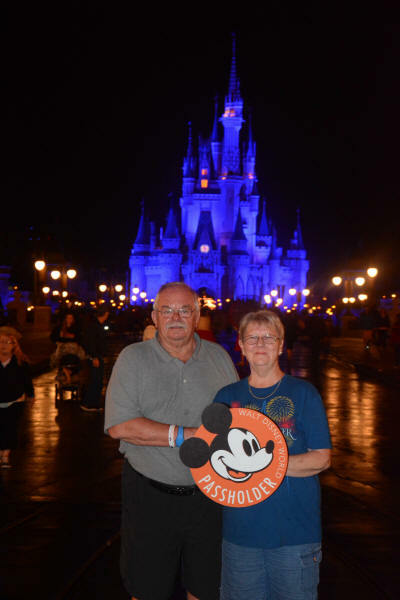 There was one more special PhotoPass on Main Street, this one with a special “Annual Passholder” sign. 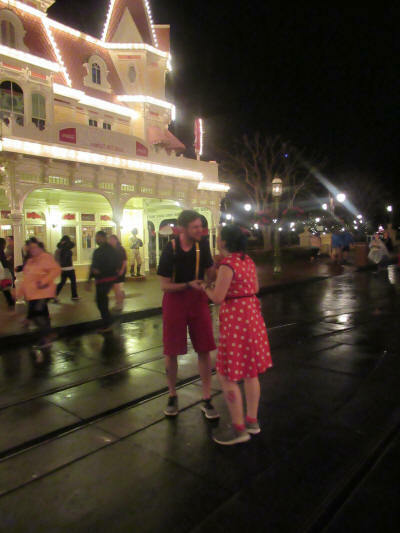 While we were lined up for the PhotoPass this Mickey created quite a stir and generated a loud cheer as he dropped to a knee and proposed to his Minnie! Best wishes to the happy couple. Carol and I caught the boat back home; the dogs were happy to see us when we pulled in at 12:10. What a great night! I woke up looking for the horse that had trampled me . 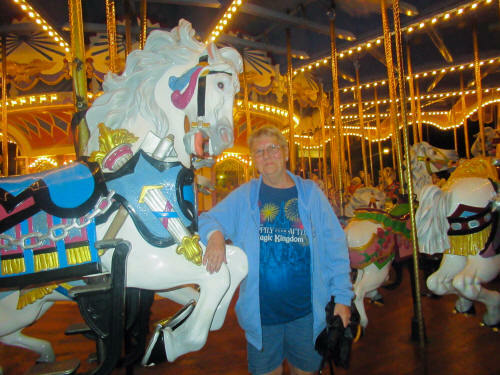 . . oh yeah, it was a wooden horse from that carousel. 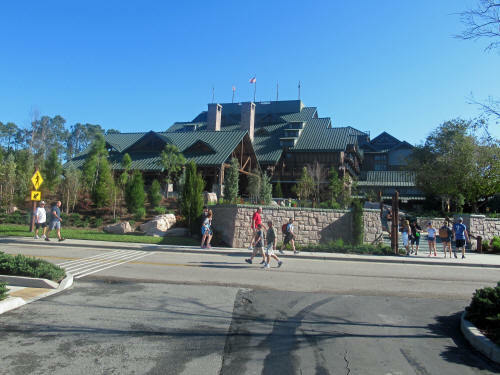 We had a quiet morning with the dogs and then left just after 9:00 for Wilderness Lodge where we were meeting friends Al and Jane for breakfast at the Whispering Canyon Cafe. We had a nice breakfast, then sat yakking with them from 10:00 until noon. After we said goodbye to Al and Jane we drove to Rack Room Shoes on Route 192 where Carol found a new pair of sneakers. 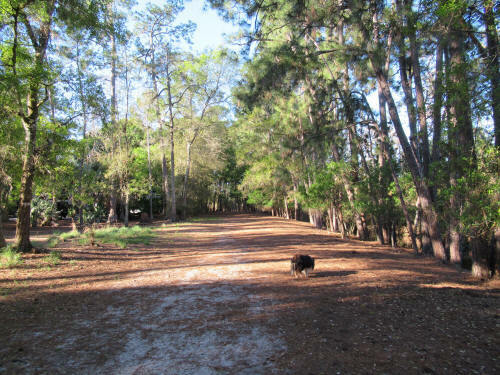 We were back home with the dogs at 1:30 and enjoyed a quiet afternoon at the campground. 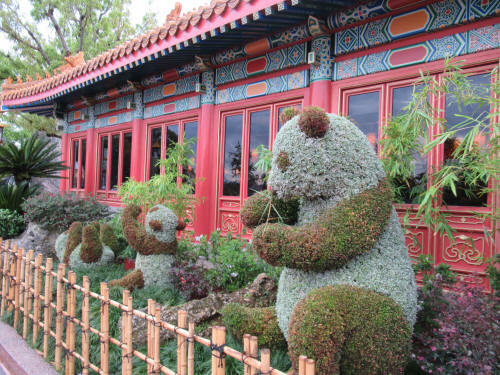 There was a brief rain shower just before we left at 5:00 for EPCOT and our 6:00 p.m. dinner reservation at China’s Nine Dragons Restaurant. 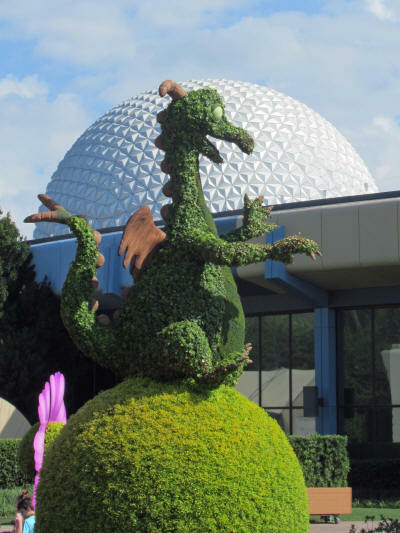 They are busily setting up for the Flower and Garden Festival which begins next week so we started our way around World ShowCase checking out the new topiaries that are being installed. We made our way as far as China by 5:50 and checked in a bit early for our 6:00 reservation. 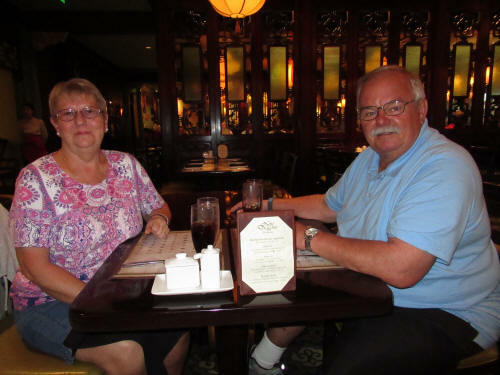 We were seated right away at Nine Dragons and enjoyed a very nice dinner. 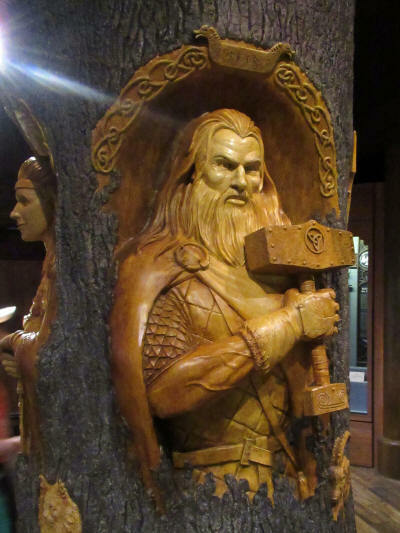 After dinner we walked back to Norway and checked out the Norse Gods in the Stave Church. 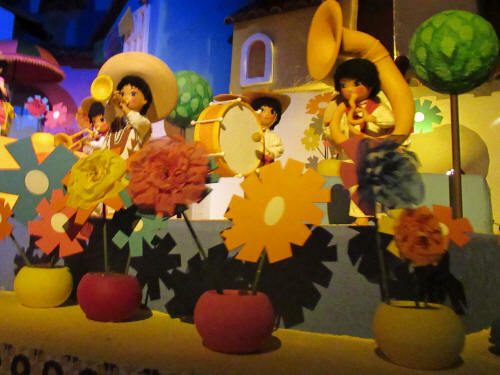 We carried on to Mexico where we took the Gran Fiesta Tour. 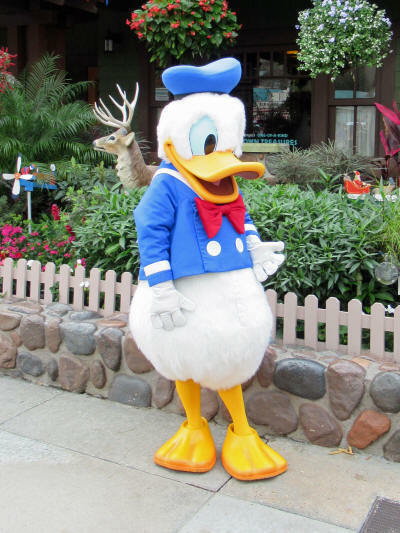 Donald was posing for PhotoPasses as we left and the line was very short, so we stopped for a quick picture! 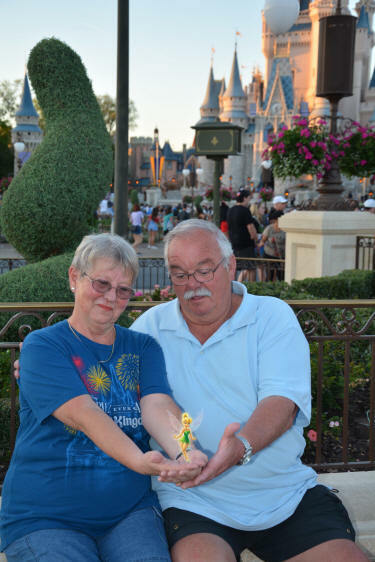 On our way out of the park we stopped for a final picture with Tinker Bell. We were home with dogs by 8:15. 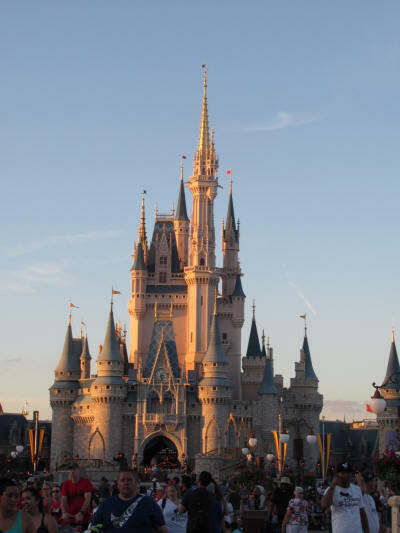 We were up at 7:00 this morning and spent a couple of quiet hours with the dogs before heading out for the Magic Kingdom. We caught a launch at the marina at 9:15 and stopped at the Fire Hall to pick up Sorcerer cards. The line was long so we decided to pick them up later. 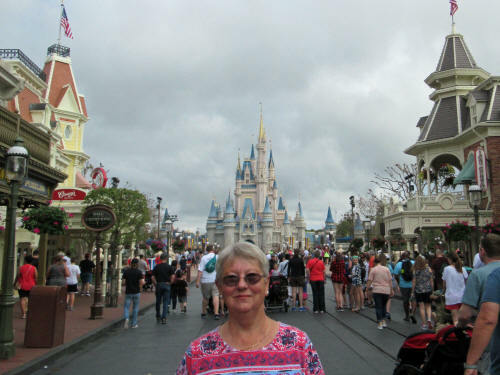 We strolled up Main Street USA, stopping in a few of the shops along the way but there were no treasures that caught Carol’s eye today! 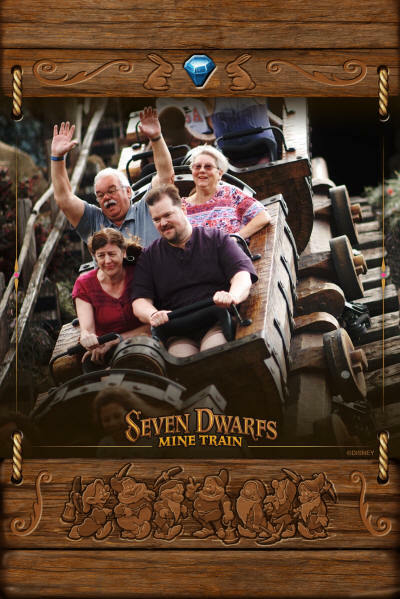 We looped through Tomorrowland and on to Fantasyland where we joined the FastPass queue for the Seven Dwarfs Mine Train. 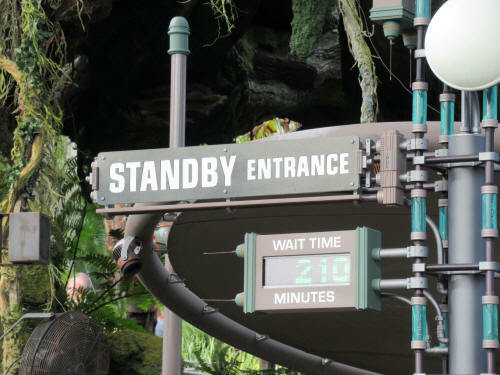 It’s a cute little ‘mini-coaster’ but I’m not sure that I’d ever wait in the standby line, it’s almost always over an hour long! 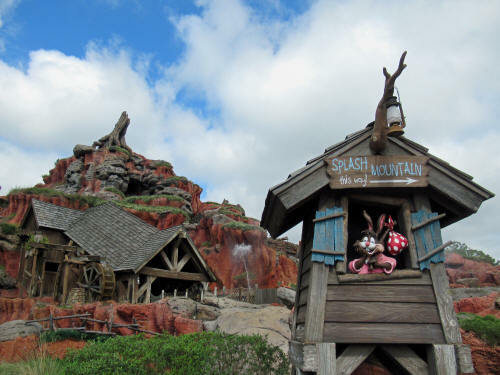 Our next FastPass was for Big Thunder Mountain Railroad so we headed to Frontierland. Naturally Carol had to stop at Frontier Mercantile to check for newly arrived pins . 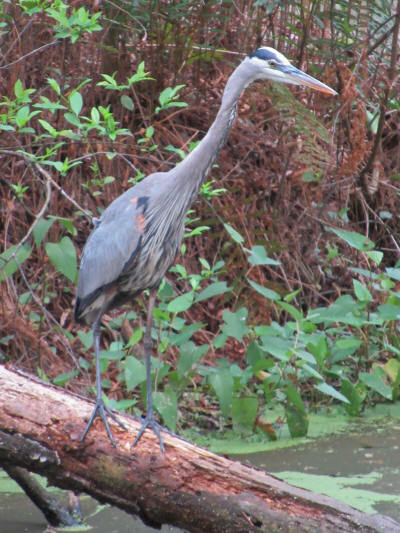 . . so I spent a few minutes stalking some of the local wildlife. 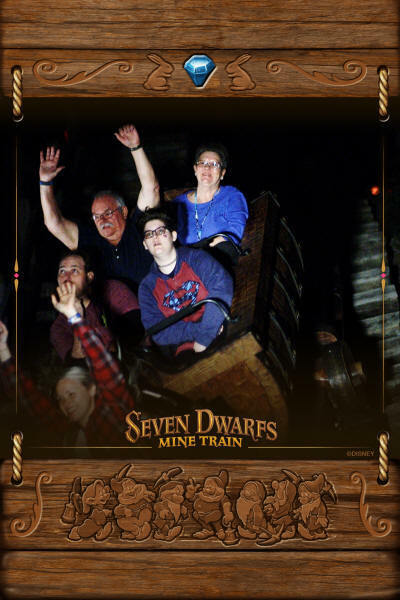 When we finished our wild ride through the wilderness on our second runaway mine train of the day we headed to Adventureland. 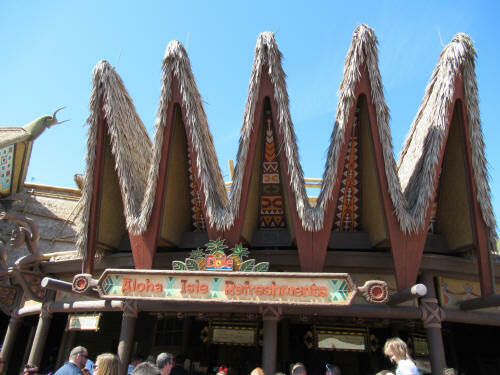 We were a bit early for our FastPass at Pirates of the Caribbean and the day was getting quite warm, so we stopped at Aloha Isle for a cool treat. 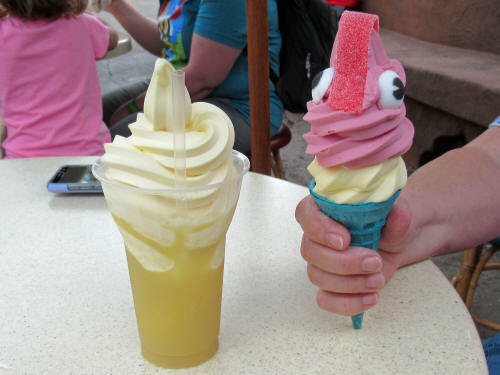 I had my usual, a pineapple float and Carol tried the new ‘Hei Hei Cone’. It’s a cone with pineapple and raspberry ice cream, with a few added garnishes that make it look like Hei Hei, the chicken from the Moana movie. 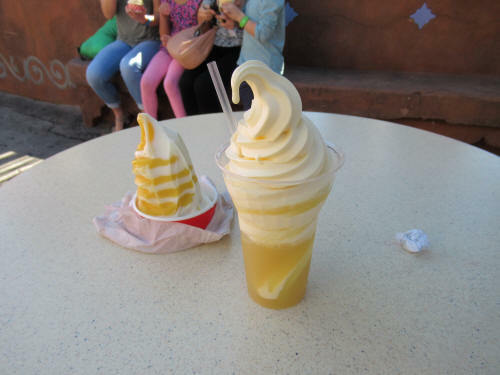 Carol said it was good but it will never replace her citrus swirl! When we were done our treats it was time to go swashbuckling! It was about 11:20 when we finished our ride with the pirates and it was time to head back to the dogs. 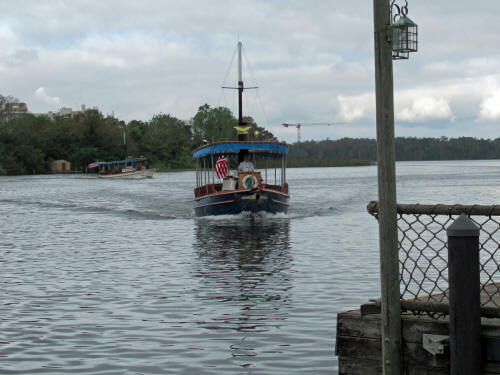 We caught a launch at the Magic Kingdom dock and passed a few fishing charters on our way back to the campground. 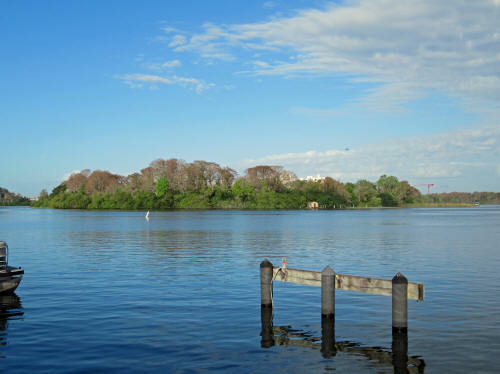 This one was drifting just off the shore of Discovery Island. Back at our campsite we let the dogs out to stretch their legs and do a little latrine duty before we put them back in the camper. 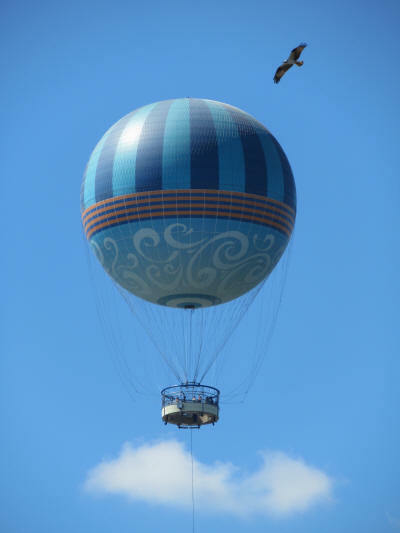 It was time to head to Disney Springs! We’ve been here for two weeks and haven’t had lunch at Earl of Sandwich yet. That’s highly unusual! We strolled through a few shops on our way to Earls, then I enjoyed an ‘All American’ sandwich while Carol had a Tuna Melt. 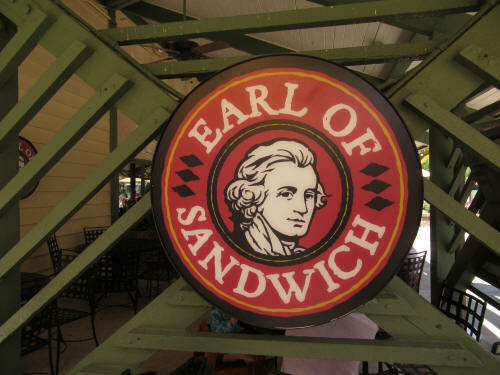 If you haven’t tried Earl’s you really should; the sandwiches are great! 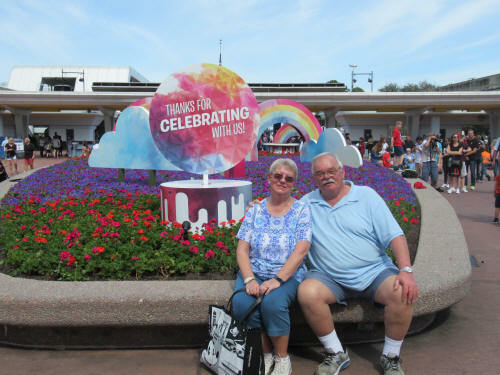 I waited at a shady table outside Earl’s while Carol scoured the pin store and the Christmas Shop, then we hopped back in the car to head home. We spent a relaxing afternoon with the dogs. They enjoyed a walk near the canal behind our campsite where we tossed their tennis ball and gave them a bit of exercise. At 4:15 I took Carol and her pin-trading bag down to the marina in the golf cart. 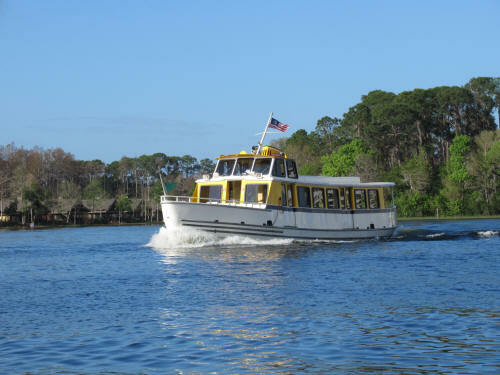 She caught the boat to the Contemporary Resort where Disney was hosting a special pin trading event. I stayed home to dog-sit and enjoyed some quiet time sitting outside reading my book. Carol called at 7:50; she tired and hungry! She had done some good trading, but the event was too big for the small room it was held in. It was overcrowded, the room was hot and Carol had had her fill of it! 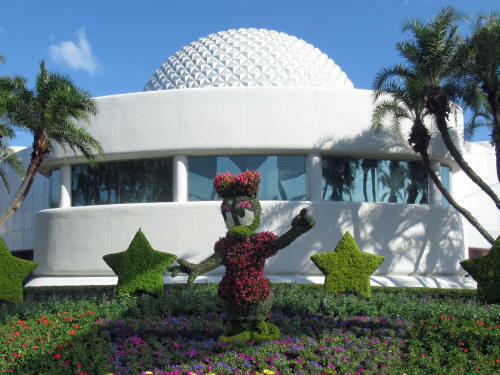 I drove over to the Contemporary, picked her up and we went to Flippers Pizza in the Crossroads Plaza for a late dinner. The dogs had been missing their Momma and they were happy to see her when we pulled in at 9:30. We had nowhere to go this morning and nothing to do! As you might expect, we woke up early. Carol was up at 6:30 and I followed fifteen minutes later. After several cups of coffee we decided to have a late breakfast at Trail’s End Restaurant before heading out on a brand-new adventure. We were going to a spring training baseball game. 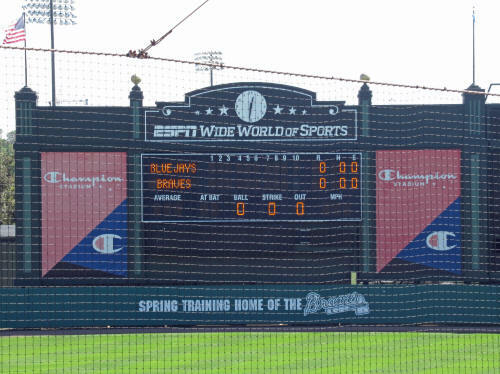 The Atlanta Braves were hosting Canada’s team, the Toronto Blue Jays at the ESPN Champion Stadium in Disney’s Wide World of Sports complex. 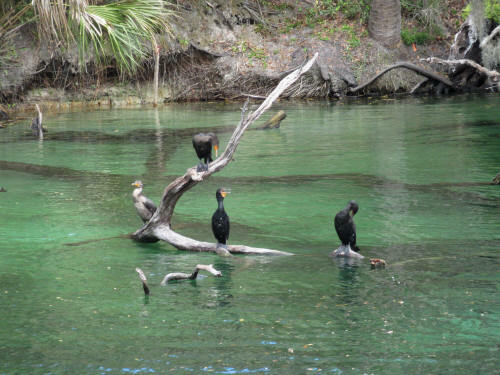 It’s only a few miles from the campground! We spent most of the morning with the dogs. 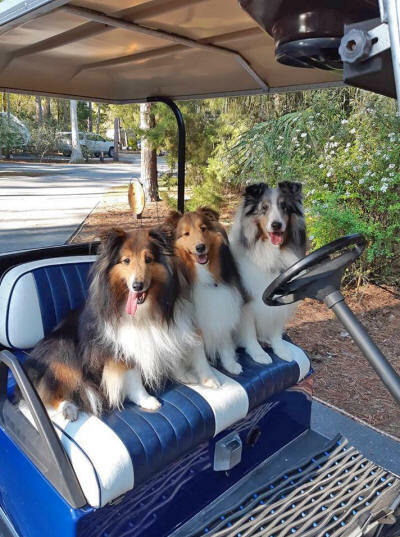 Since the off-leash dog park is closed for refurbishment the boys haven’t been getting too many golf cart rides and they must have been missing them because they really enjoyed the long ride we gave them today! We took them to the dog park and showed them the construction site so they’ll know what to expect next year! The berm where the railway track ran is almost all gone and the sand from that berm has been used to raise and level the rest of the park. 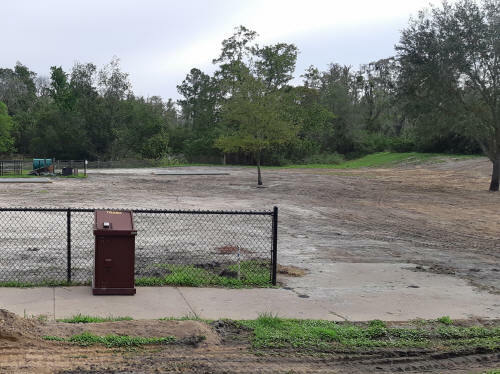 If the current boundary is any indication, it looks like the park will be about 30% larger and it may be split into two sections, perhaps separate areas for large and small dogs. We stopped for a few minutes to chat with our friend Hilda in the 400 loop just as Robin, an Indiana friend crawled out of her tent beside Hilda’s camper. The ladies admired the dogs for a few minutes, then it was time for our breakfast. At 10:30 we dropped the dogs back off at home and headed to Trail’s End. 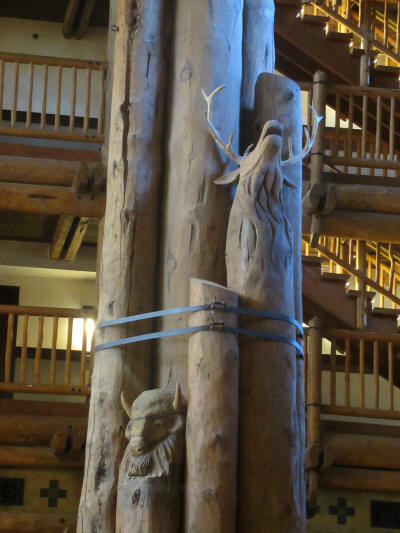 They have a wonderful buffet breakfast with a distinct western flair. 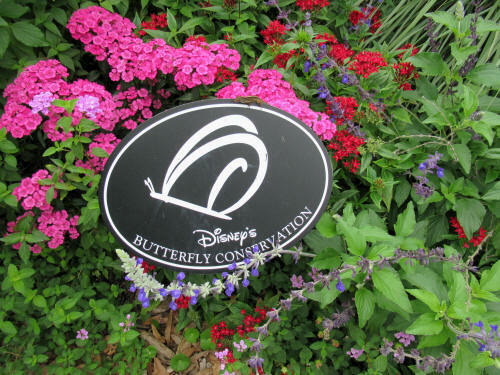 It’s one of the best values on Disney property and it’s pretty much a hidden gem! Please don’t tell anyone how good it is! 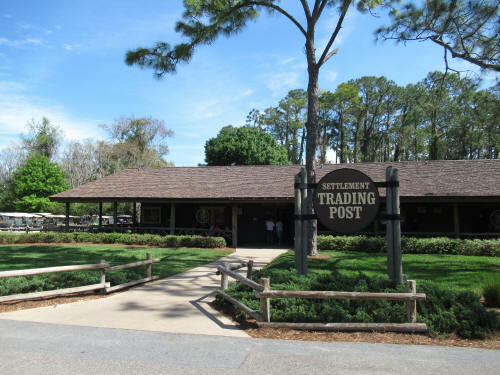 We stopped in at the Settlement Trading Post for a quick look around then headed back to the campsite. It was time to head off to the ball game so we walked the dogs one more time, then hit the road! 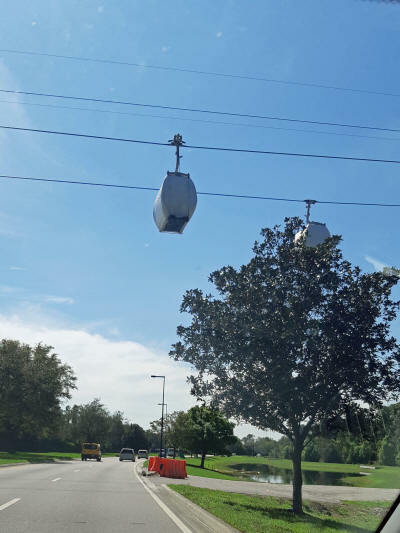 As we drove along Victory Way and passed the Art of Animation Resort the gondola cars on the new skyway transportation system were being tested. It’s the first time we’ve seen anything moving on the overhead lines. 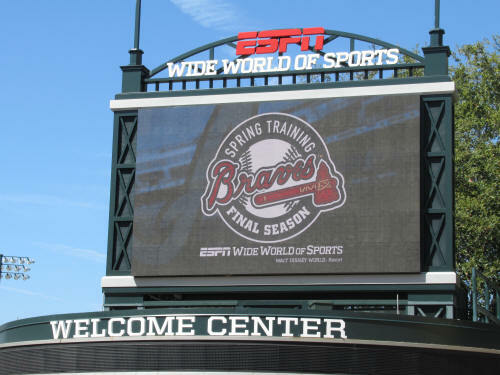 Before long we were at Wide World of Sports and approaching the Champion Stadium. 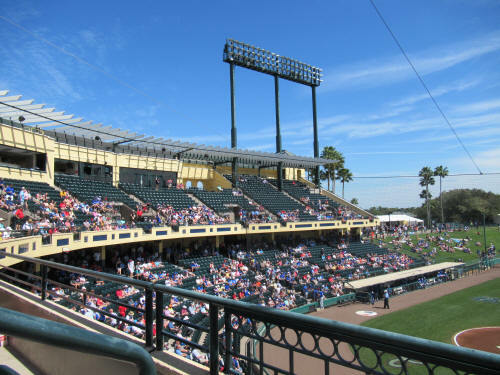 It’s the largest stadium used in Grapefruit League Spring Training and also the only park with a second deck. The seating capacity is 9,000 and today was the first game of the year there. The park looked to be about half-full, a much bigger crowd than I had expected. It also looked as though more than half the fans were wearing Blue Jays colours! I guess snowbirds like baseball! 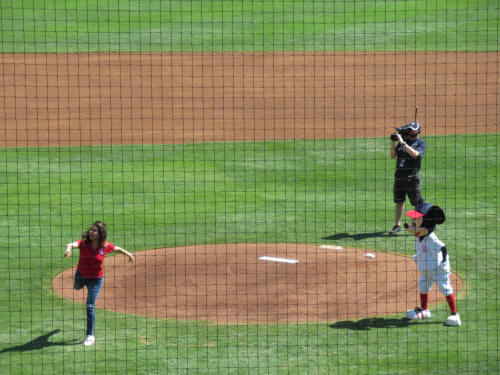 A local TV Newscaster threw out the first pitch with Coach Mickey standing nearby! Canadian fans were delighted when the leadoff batter, Jonathan Davis, hit the game’s second pitch for a home run. 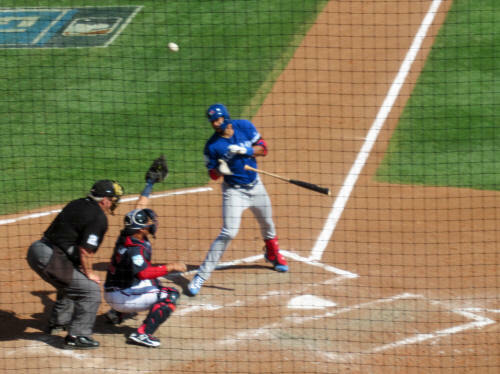 Then the crowd went wild when the very next batter, Lourdes Gurriel Jr. hit the first pitch he faced out of the park. After only three pitches the Jays were up 2 - 0! The Jays sent seven batters to the plate in that first inning and led 2 - 0 until the third inning when Atlanta battled back to tie the game up. 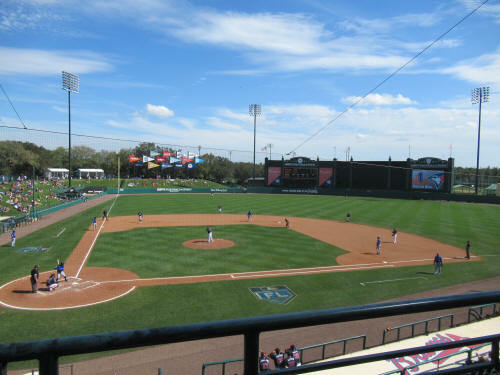 Carol and I had great seats in the second row of the upper deck but we were in direct sunlight on a hot Florida day! 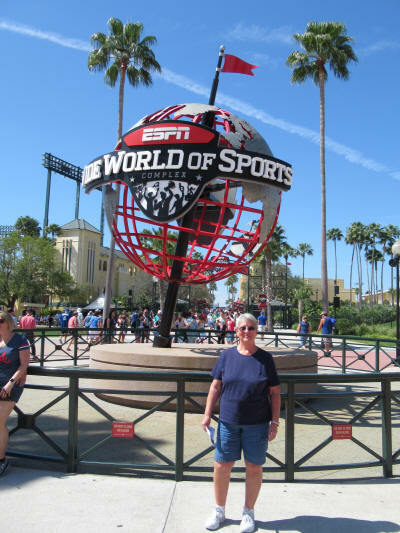 Before the game began Carol went out to buy a hat to protect her from the sun. The Blue Jays have the bases loaded with two out. They didn't score! 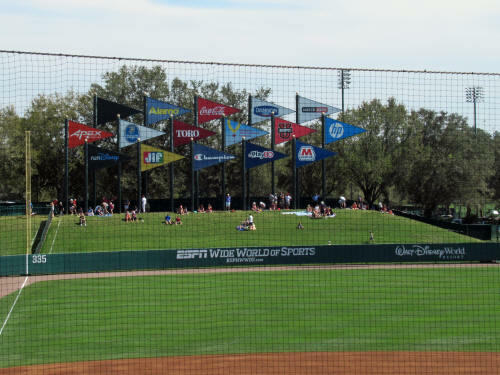 After two innings we went back near the concession area to cool off in the shade a bit before returning to our seats. 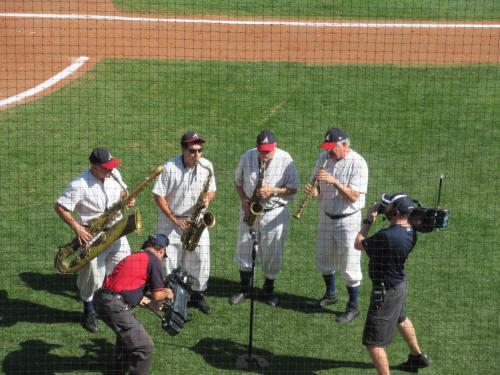 In the later innings of the game the sun had shifted behind our backs and we had partial shade . . . what a relief! 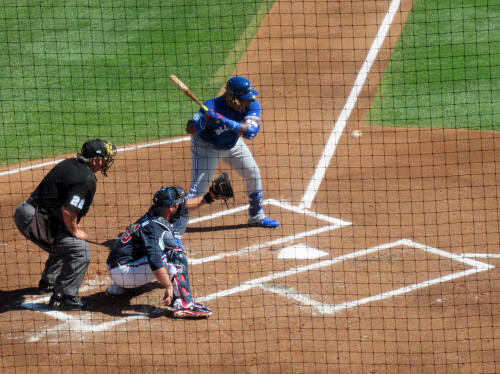 Kendrys Morales left the game when this pitch hit him on the forearm. We stayed for seven complete innings before we had to head home to let the puppies out. The score was tied 3 - 3 when we left and we heard later that Atlanta had won the game in the 9th inning with a walk-off home run. The gondola cars were still running as we returned home. 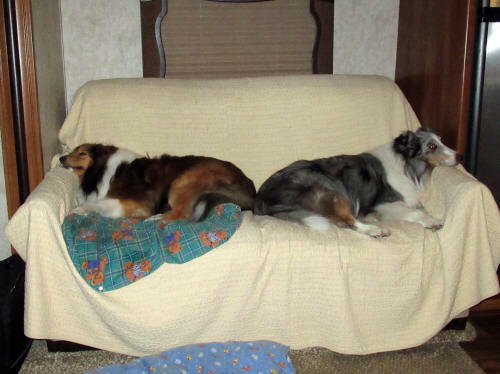 We were home with the dogs just after 4:00 and huddled in the air-conditioned camper cooling off before settling in for a short nap. 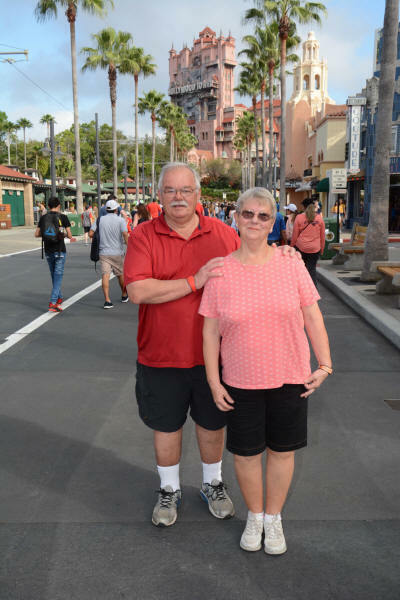 All that time in the hot sun had sapped our energy so Carol cancelled our FastPasses for the Magic Kingdom and we drove to Disney Springs for dinner. Carol had been there last August, but it was my first time at Chicken Guy. We each had the three piece chicken tender combo; it was tasty and filling. 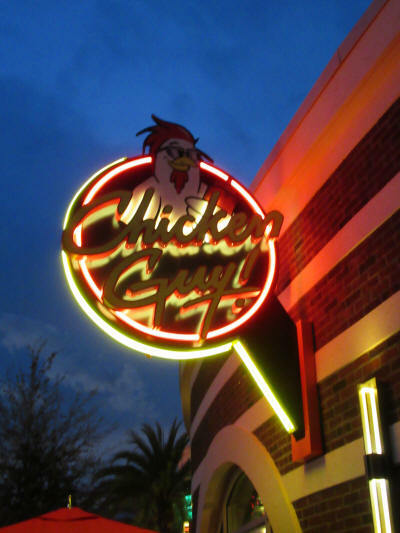 I have found most of the new food venues at Disney Springs a bit disappointing, but we’ll be going back to Chicken Guy. 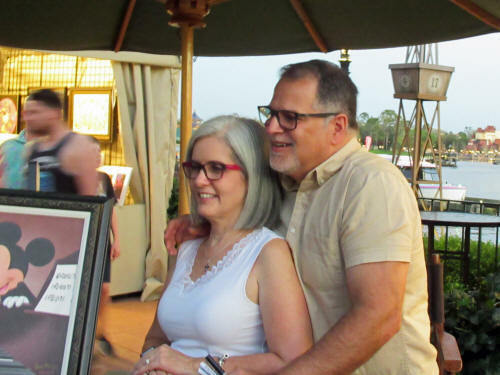 We walked all the way across Disney Springs to the Christmas Store where Carol picked up a decoration she had bought the day before. It had been personalized for us and was ready for pickup. 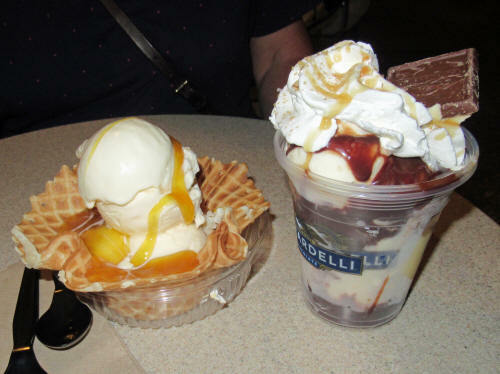 Naturally the long walk made us hot and we decided that the best way to cool off was with a couple of sundaes from Ghirardelli’s. It was a great decision! We were back with the dogs at 9:15 and spent a quiet evening at home! We slept until 7:00 this morning, and enjoyed a bit of quiet time with the dogs. I sat outside with the three of them while Carol got ready to head out for the morning, then she walked them while I had a shower. 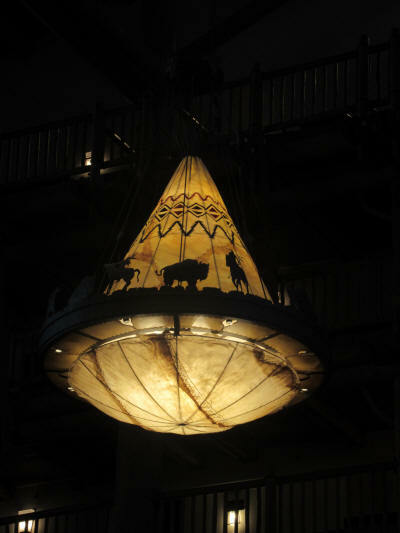 We were on the road just before 9:00 and arrived at Animal Kingdom by 9:15. 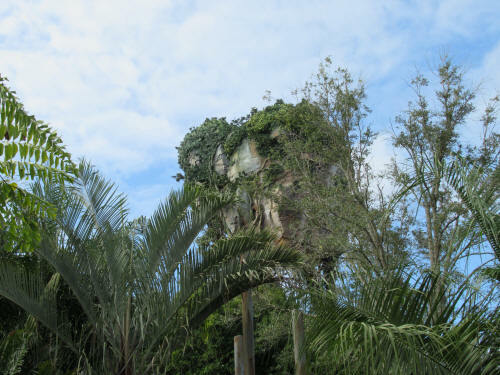 As we walked up the right hand (Eastern) trail toward Discovery Island we spotted DeVine peeking out of the foliage. She really can disappear when she tries! Can you see her? 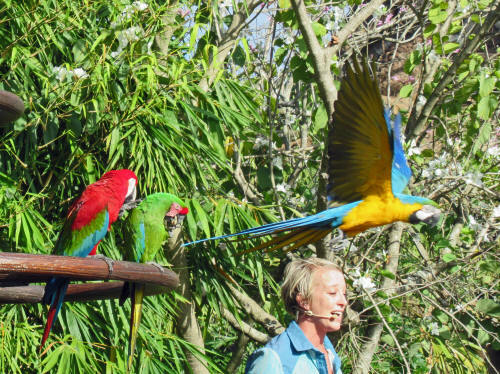 As we approached the Tree of Life we spotted the young ladies in the blue shirts setting up for the ‘Winged Encounters’ macaw show. 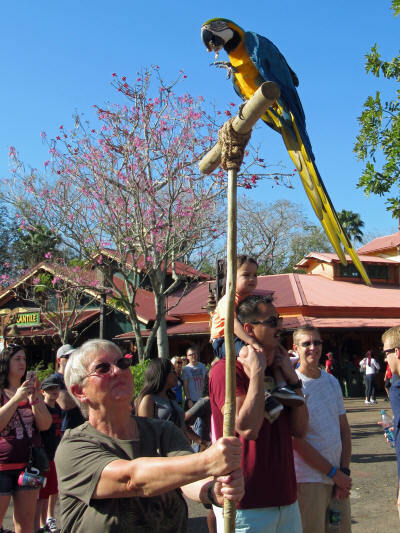 Carol asked if she could hold one of the roosting posts . . . her wish came true! 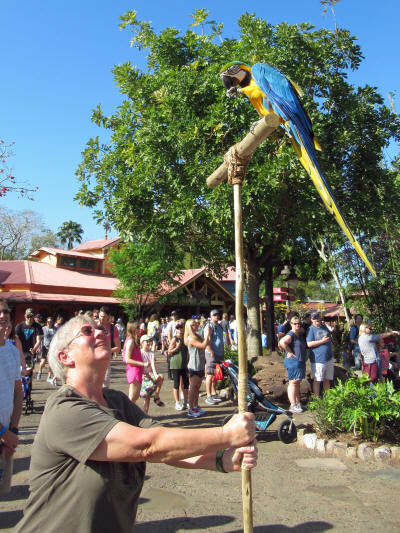 Carol held the post while one of the bird handlers poked almonds into several holes drilled in the top rail of the post. As the birds roosted on the bar during the show they enjoyed a fresh snack. 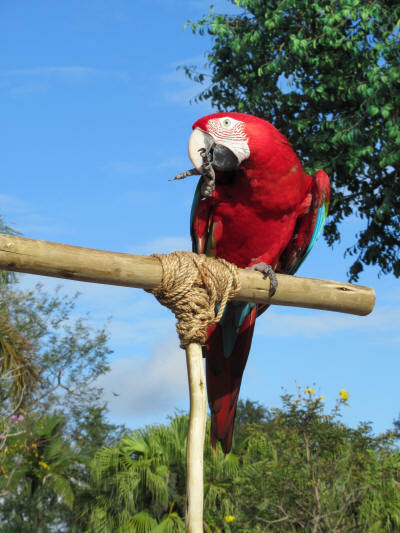 Take a close look at Carol’s blue macaw and you’ll see it enjoying a morning snack! 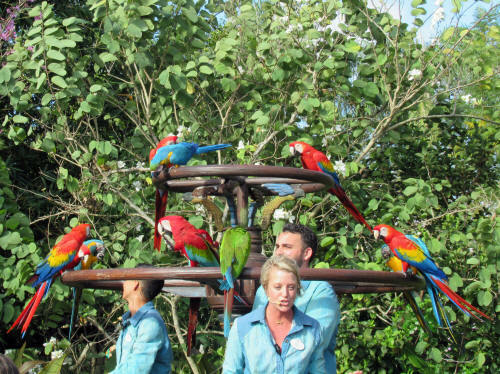 Once the almonds were all gone Carol’s macaw was quick to fly back and join his friends! 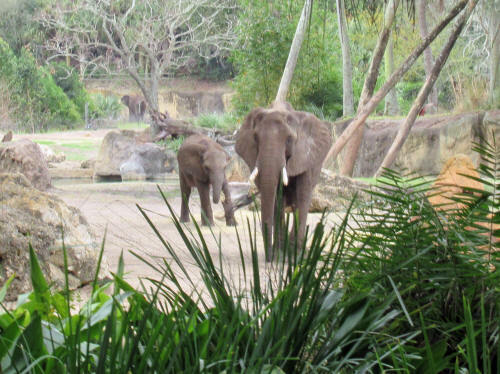 As soon as Winged Encounters was over we scurried to Harambe; it was time for our FastPass at Kilimanjaro Safaris. 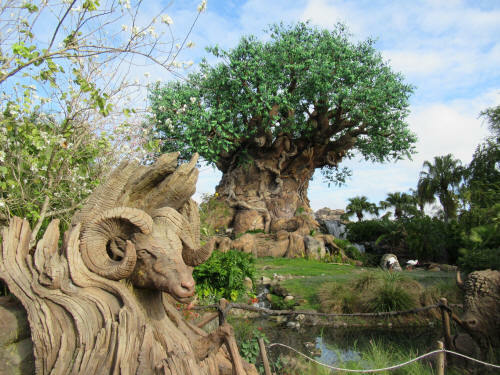 The safari adventure is one of our favourite Disney attractions; it’s one we never miss. 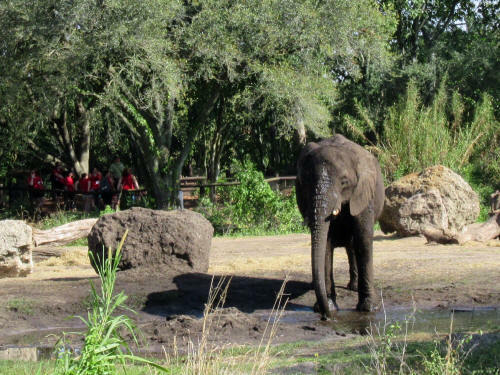 Unfortunately today’s safari was the worst we have ever had! It was horrible! The terrain was the same as always and the animals were plentiful. 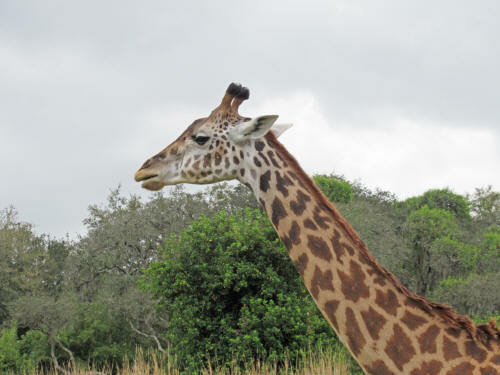 It was our driver, Chris, who made the safari a miserable experience. 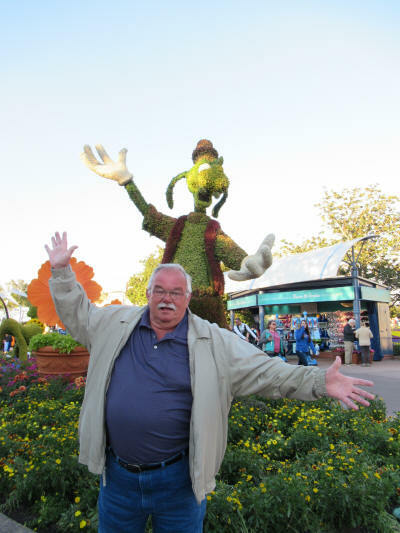 He must have been a frustrated actor or comedian; he totally forgot about Disney’s normal script for the ride and used exaggerated accents, dialects, affectation and inflection to deliver his bizarre tale. Occasionally his staccato bursts of dialogue were so fast they were impossible to understand . 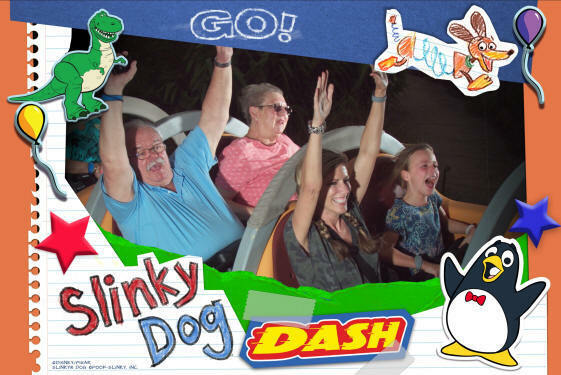 . . they were the best parts of the ride! Chris also did his utmost to make our ride uncomfortable and dangerous. Bumps are always part of the ride and they do add to the realism of the experience, but Chris took it to dangerous extremes. We were in the first row, directly behind him and watched over his shoulder as he continually rocked the steering wheel to make the truck rock and sway. At the same time he was tapping the accelerator pedal with his foot to make the truck buck and lunge. At one point Chris joked that it was dangerous to stand up in a safari truck . . . in Chris’ truck it’s dangerous even when you’re sitting. 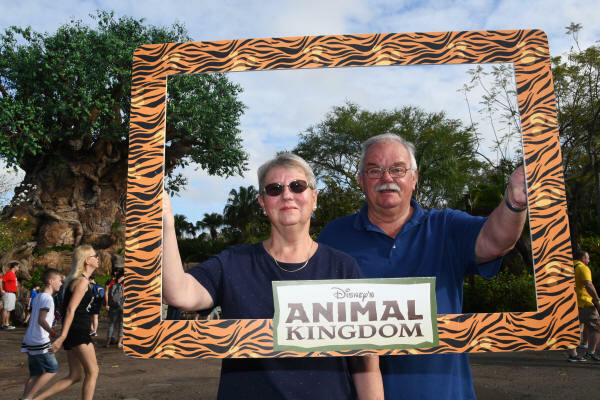 We normally take several dozen pictures during each safari ride. Today Carol put the camera away after just a few minutes. It was impossible to take pictures when you were hanging on for dear life. 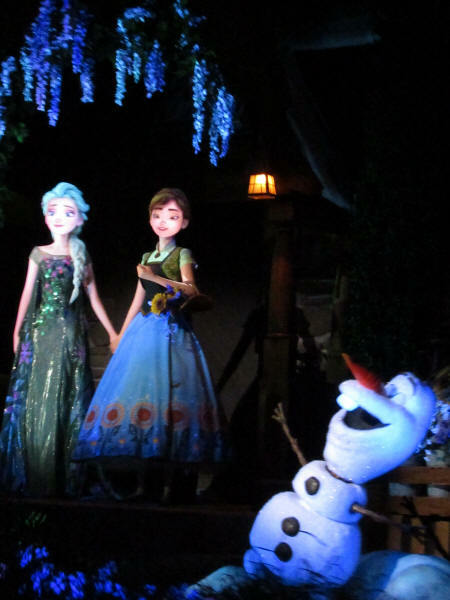 Today was the only time I’ve ever written a complaint to Disney about a specific cast member, I hope it’s the last. 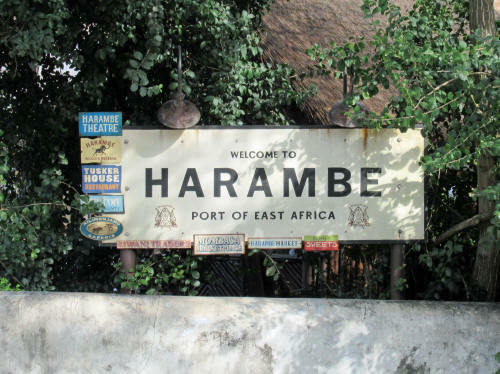 After the safari we took our usual brief detour. 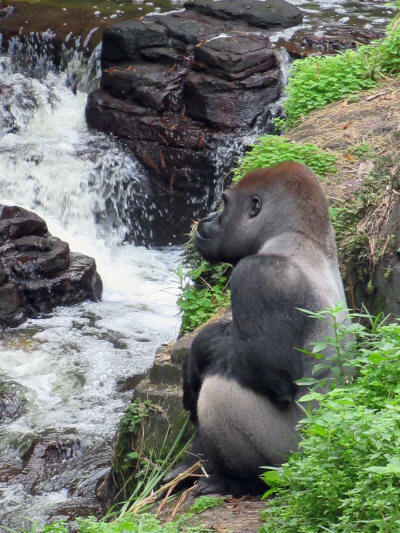 Just to the right after you get off your safari truck there’s a viewing area that looks out over the back of the Gorilla Trail and there are almost always a silverback gorilla or two there. 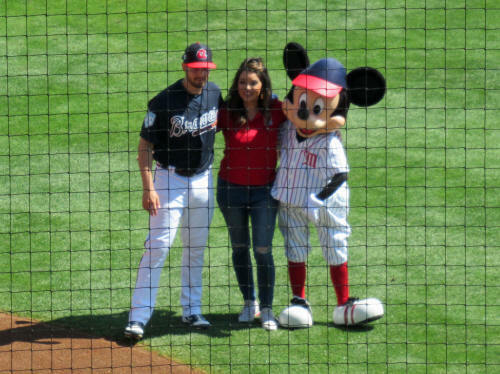 Today this big guy was there. 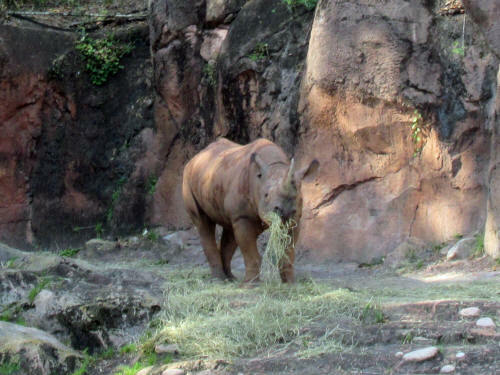 We watched him for a few minutes while we recovered from that wretched safari ride. 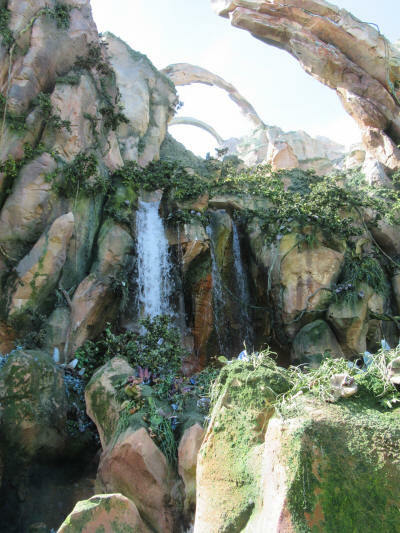 Our final FastPass of the day was at the Na’vi River Journey. 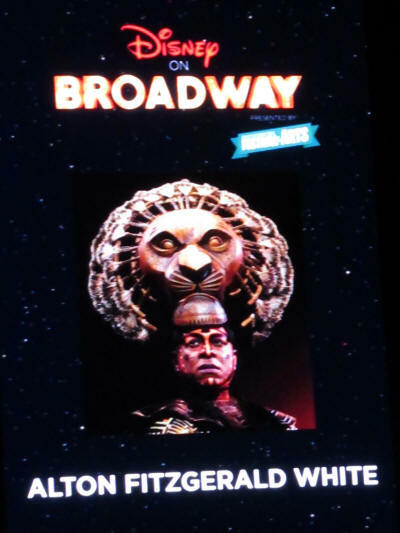 Yikes - the standby line was 95 minutes long. 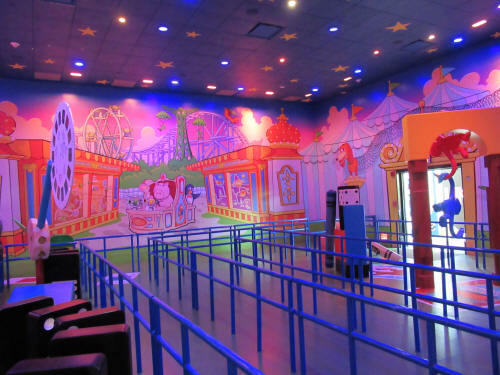 It’s a cute ride, but there is no way I would ever wait over an hour-and-a-half in line to ride it! 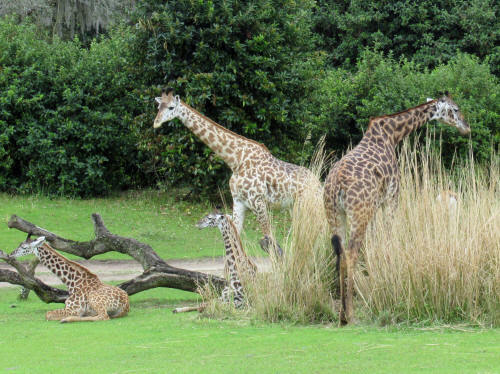 We left Animal Kingdom about 11:00 and headed home to spend a quiet afternoon with the dogs. Carol made sandwiches which we enjoyed on the patio then I tossed the ball for the boys for a few minutes. Since the off-leash park is closed they are not getting as much exercise as they usually do while they’re here. We try to let them off-leash for several short ‘play-times’ every day. 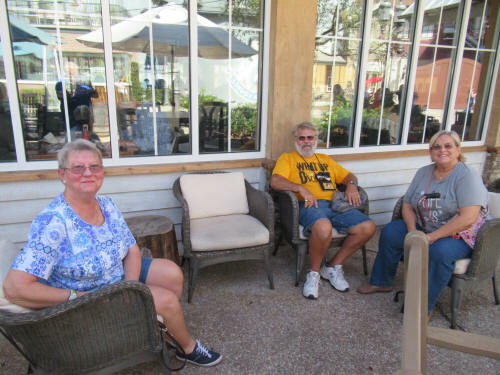 Carol and I took a golf cart ride and looked at a few more campsites that would suit us on future trips and we stopped along the way to visit with friends Hilda, Kevin and Robin. At about 3:00 p.m. the afternoon heat drove us inside and the first thing you know we were napping! We had dinner reservations at the Ale and Compass Restaurant at Disney’s Yacht Club Resort so the dogs had their dinner a bit early. By 5:30 we had walked the boys and hopped in the car for the short drive to the Yacht Club. Dinner was terrific, we shared a delicious bowl of Lobster and Corn Chowder then we each had the Bacon and Vermont Cheddar Burger. It was a nice meal in a very attractive setting. 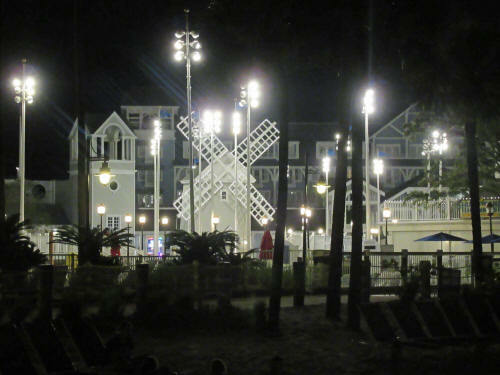 After dinner we walked around Crescent Lake from the Yacht Club to Disney’s Boardwalk. 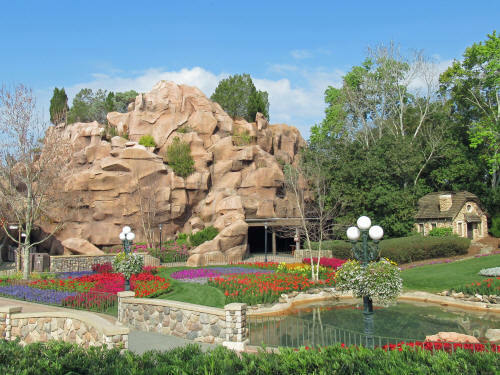 It’s a pretty area during the day and even prettier when it’s all lit up at night. We saw several street performers as we strolled the boardwalk but tonight they all concluded their shows just as we approached. We stopped at Ample Hills to try their ice cream, we’ve heard nothing but good things about it! We each tried two scoops of their most popular flavours in one of their home-made waffle cones. 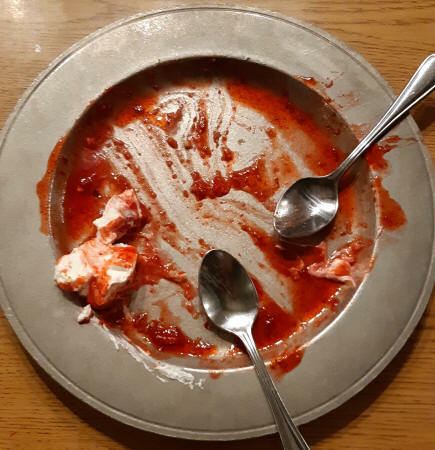 We agreed that the ice cream tasted better on the little sampler spoons than it did in the cone, and mid-way through our treat each of our cones began to fall apart. It was a disappointing and messy experience! We’ll stick to Beaches ‘n Cream in the future. We caught a boat back to the Yacht Club and were back home with the puppies about 9:15. We were both up at 7:00 a.m. and took our coffee outside to enjoy the cool morning air. We had no park plans for the morning and we were looking forward to some quiet time with the dogs. Before long we heard a very odd bird calling, again and again. 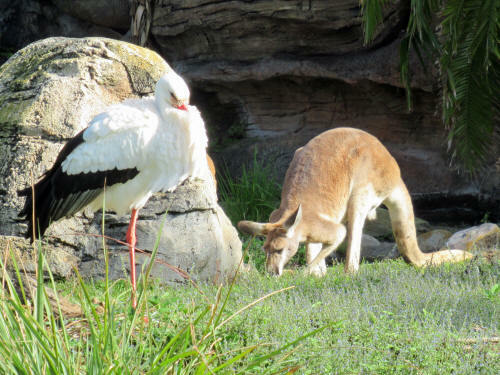 Carol thought it was a turkey, I suspected it might be a pterodactyl. I stayed with the dogs while Carol went to stalk the mysterious bird. She found it behind the campsite across the road from us, sure enough it was a lone turkey calling to find the rest of it’s flock! 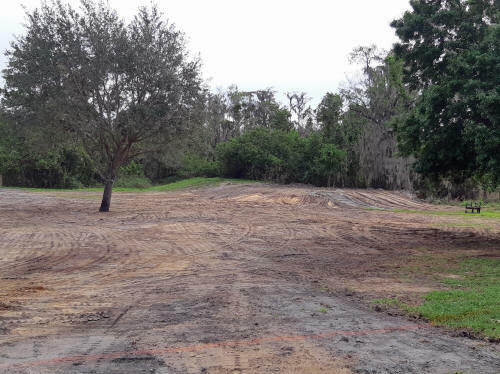 We tossed the ball a while for the dogs then took them for a nice long golf cart ride to check progress on the dog park renovations. 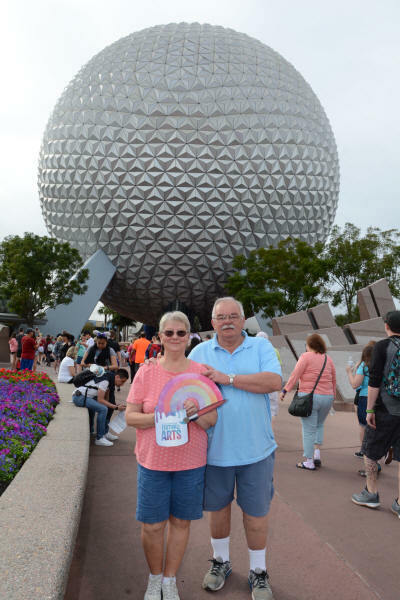 We took them for a walk along the canal and tossed ball some more before we left about noon for Disney Springs. 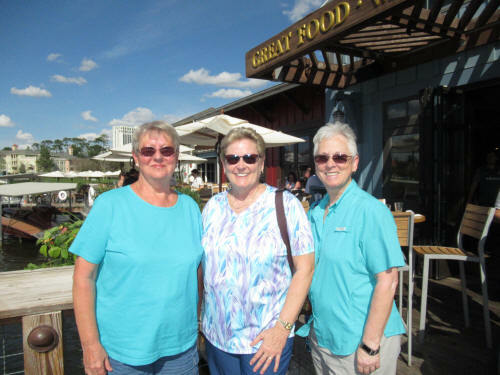 We were meeting friends Deb and Linda for lunch at The Boathouse. We got there a bit early and strolled around snapping a few pictures while we waited. 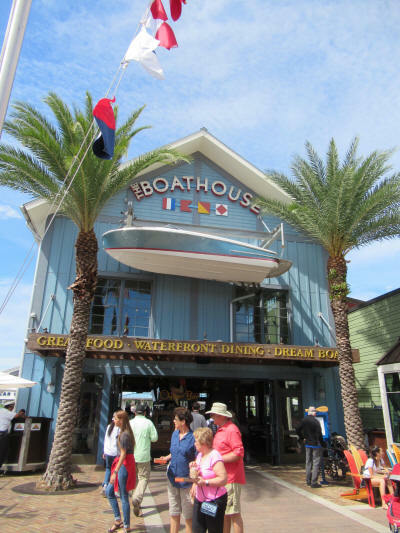 We always enjoy The Boathouse and we always enjoy the time we spend with Deb & Linda so it was a perfect afternoon. We yakked with them until 3:15, then it was time to get back home to the dogs. 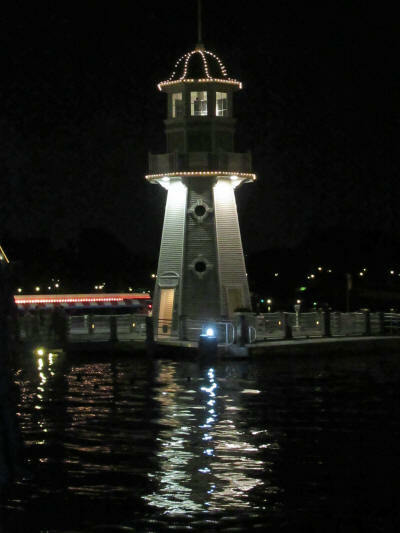 We relaxed for a few hours with the boys and caught a boat to the Magic Kingdom at 5:30. 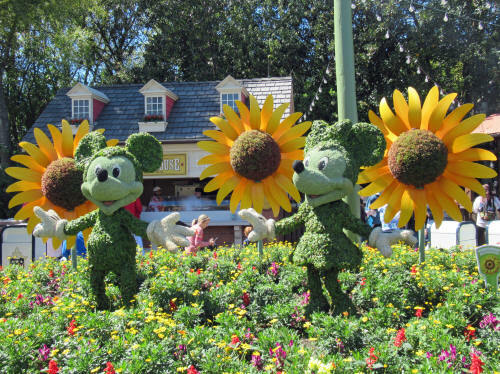 When we arrived at the park we were surprised how short the line was at the entrance gate. We soon found out that the line was short because everyone was already inside! The place was jam-packed! 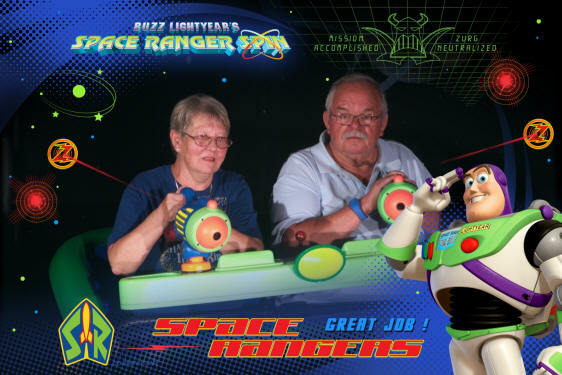 We went straight to Buzz Lightyear and cashed in our first FastPass. 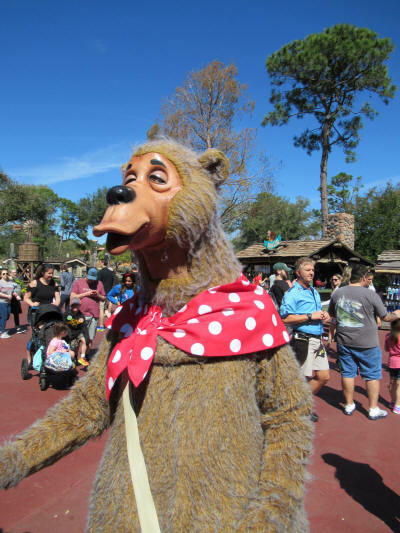 Then we fought our way across the park, through The Hub to Frontierland where Carol popped into the pin store for a quick browse while I watched the Country Bears do some sort of line-dancing routine on the street. 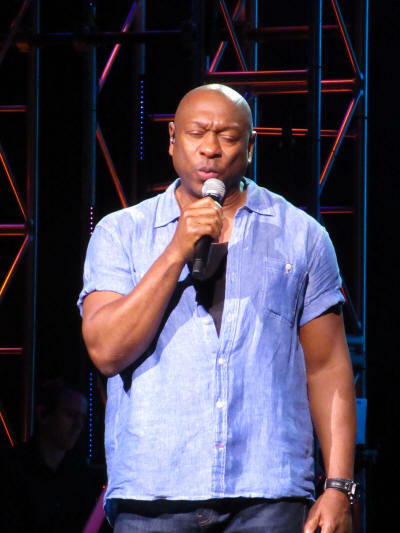 I gotta tell you that Big Al may be a talented actor and a great singer . . . but he sure can’t dance! 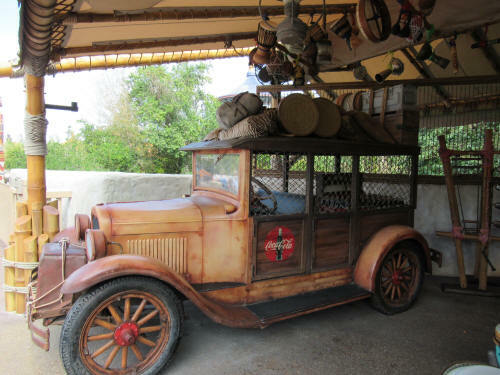 We had a nice ride on the Jungle Cruise. Our skipper was KD and she was very animated and entertaining. 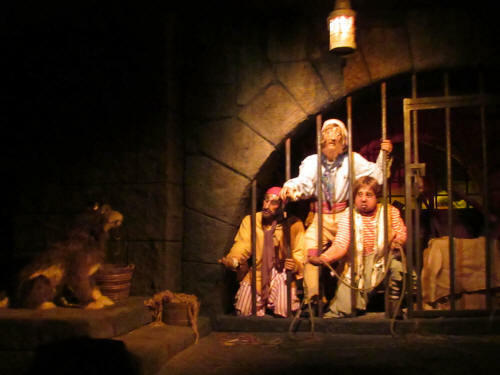 After our cruise we decided that it was just too crowded; we had had enough, so we skipped our FastPass for Pirates of the Caribbean and headed to the exit. 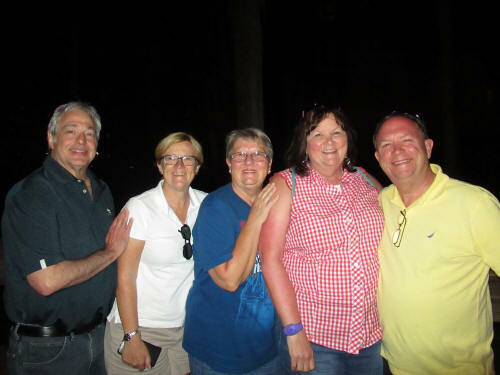 The two couples were on their way back to the lakeside cabin where David and Cathy were staying and they invited us to come along and watch the ‘Happily Ever After’ fireworks from their veranda. 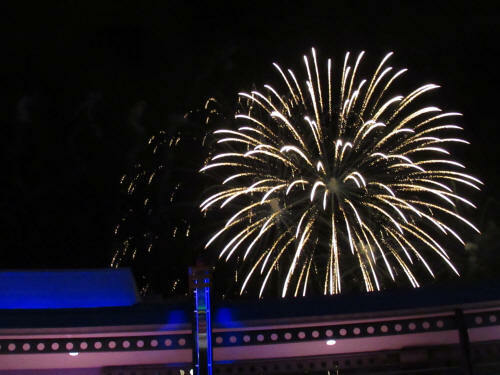 The cabins are beautiful and we had great sightlines for the fireworks. It was nice catching up with old friends during the fireworks show. We hadn’t seen either couple in a few years! It was almost 9:00 when we left for dinner at Geyser Point. 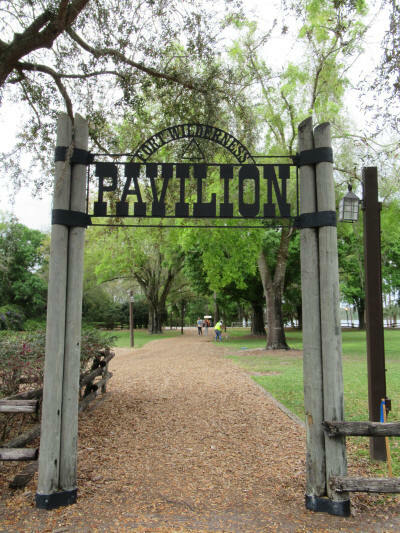 It’s a nice venue; we sat in the open air and enjoyed crispy chicken sandwiches on the shore of Bay Lake as we watched the Electric Water Pageant. After a tasty dinner we caught a boat back to the campground. We were home just after 10:00 p.m.
We enjoyed another quiet morning sipping coffee outside in the cool morning air. Carol spotted a deer across the canal and went on a camera safari. She spotted at least four deer and caught a great picture of these two. 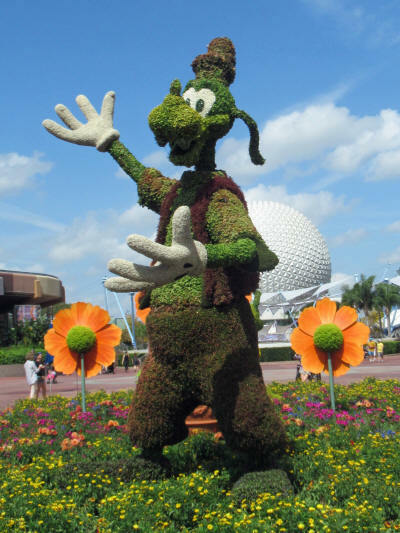 We left for EPCOT at 9:15 and were entering the park at 9:30. 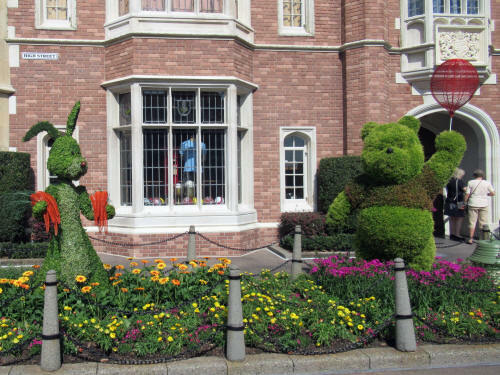 Our plan was to see as many of the topiaries as possible before the Flower & Garden Festival starts. 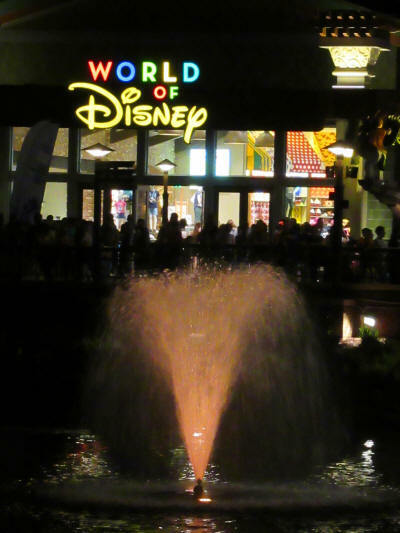 We walked up the centre concourse past the fountain, snapping pictures as we went. 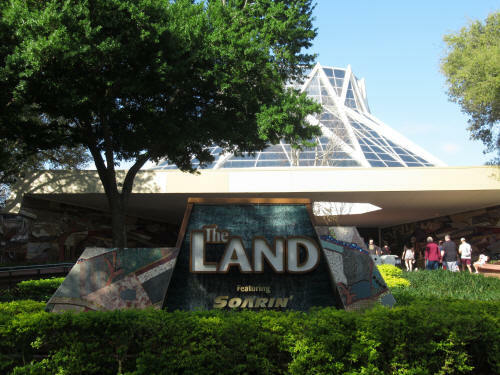 We cut through the Rose Garden to The Land pavilion and rode Living With the Land. 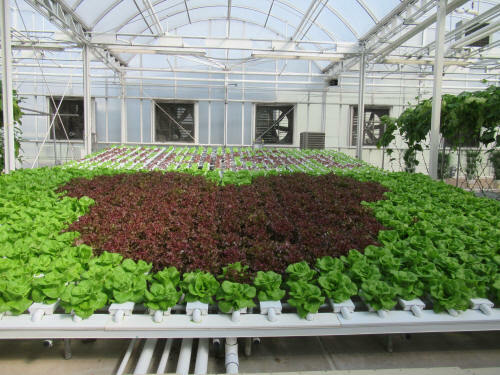 Carol always snaps a bunch of pictures in the hydroponic greenhouses! 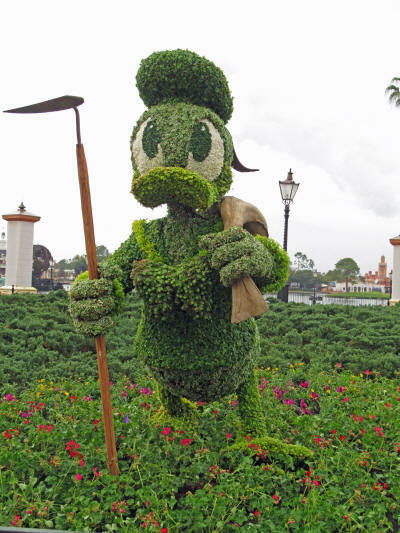 We continued our topiary trek south, through the Rose Garden, to World Showcase. 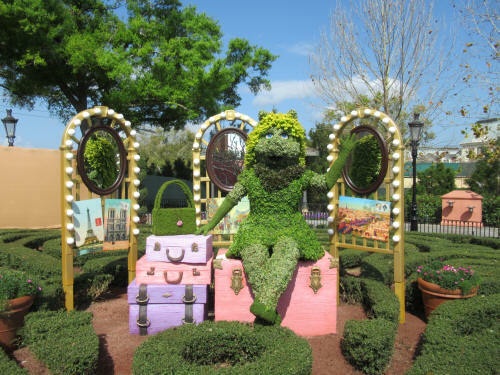 We turned right and slowly strolled to France, snapping topiary pictures all along the way. In France we stopped at the Boulangerie for a snack and cold drink. The French bakery always has terrific pastries. It was all tasty! 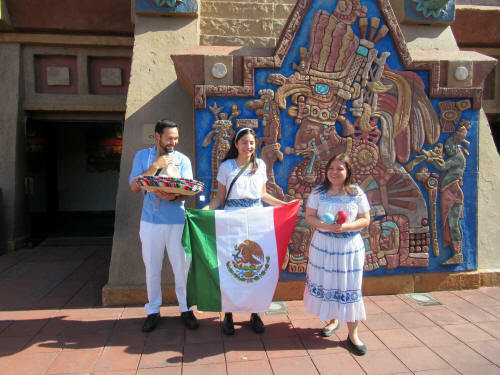 It was 11:00 a.m. when we finished our pastries and that meant that the shops in World Showcase were open. We headed back to England and browsed through the shops filled with unique British merchandise. 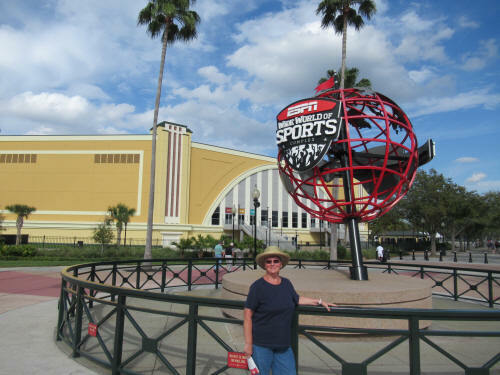 We stopped at WorldShowPlace, where Carol attends the EPCOT Pin Event each year and joined a few hundred other people to watch some funny video clips for the America’s Funniest Video TV Show. 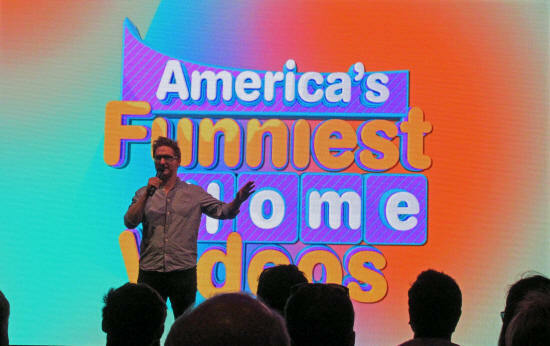 There were 9 clips in all and we each voted for what we thought was the funniest. I voted for the runaway squirrel, Carol picked the dog who was excited to get a treat! 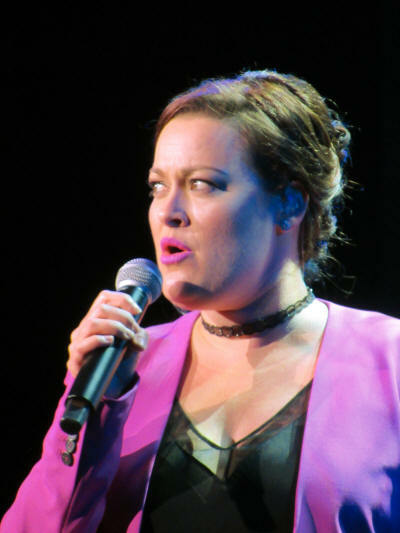 The episode will air in early May. Everyone who participated was rewarded with a free t-shirt! Been there, Done that, Got the t-shirt! 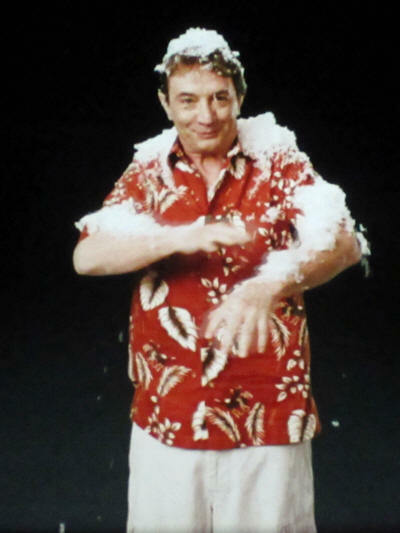 Our next stop was Canada where we browsed the shops and then watched the ‘Oh Canada’ CircleVision show hosted by Martin Short. It’s probably the last time we’ll see the show. A new film is in production and it’s expected to be introduced later this year. 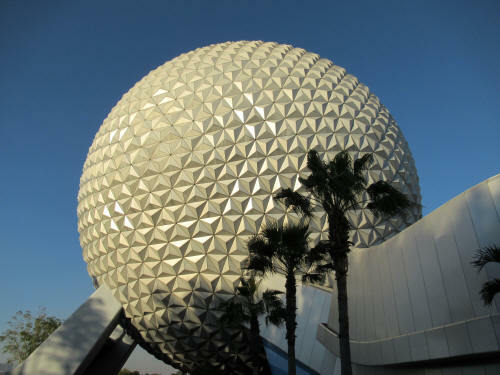 We continued our slow walk toward the exit and turned right to pass through Future World East before we exited. 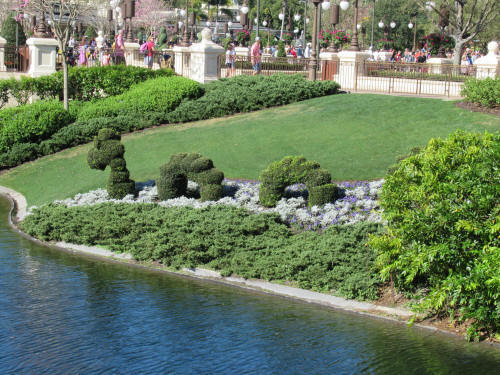 There were a few more topiaries there. 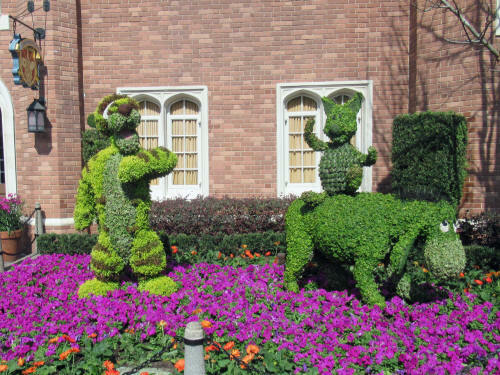 What’s with Bo Peep? 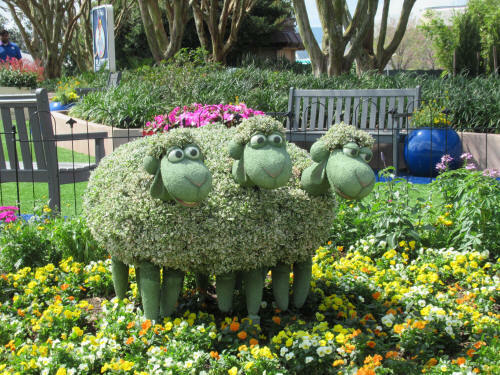 Why does she have a three-headed sheep? We were back home with dogs at 1:30 and enjoyed a quiet, relaxing afternoon. We tossed their tennis ball a bit, had a nap and then tossed the ball some more. 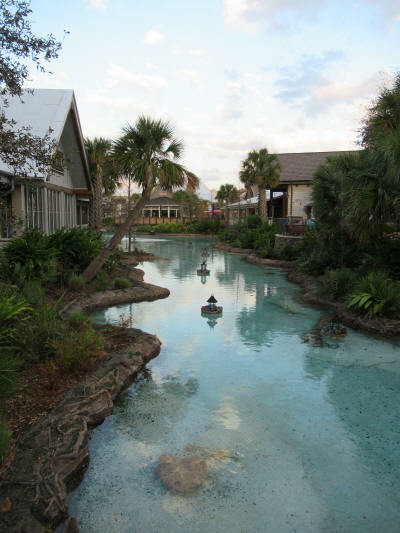 Carol fed them a bit early and we walked them along the canal before leaving at 5:15 for the Beach Club Resort. We checked in early for our 6:15 reservation and were seated almost immediately. As always, we had a nice dinner and naturally followed it with sundaes for dessert. As we were eating our entrees friends Elaine and her son Adam from Richmond Hill walked past our table. We enjoyed a brief chat with them then left to head home to the dogs. Back at the campground we hopped in the golf cart and headed to The Settlement Trading Post. 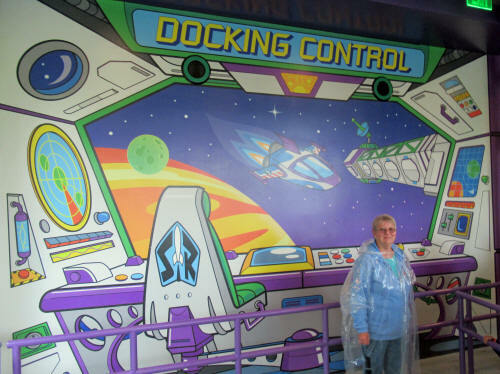 Carol made it in time to be the second person at the pin trading board. Tonight we were home in time to sit with the dogs through the fireworks show. They were very relieved when the fireworks were over! We woke up to a chilly and dreary day. Our various phones, tablets and computers put the temperature at 7:00 a.m. anywhere between 56° and 63°. The sky was heavily overcast and the ground was damp from a recent shower or drizzle. There was no coffee outside today! 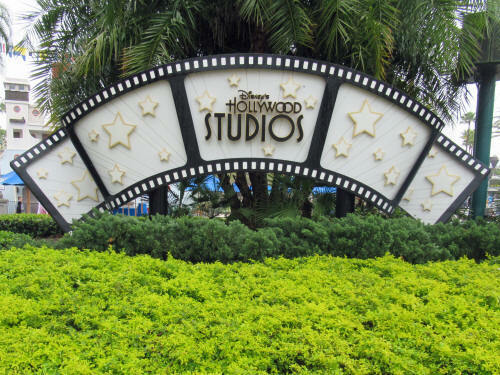 We wanted to get to Hollywood Studios as soon as the park opened in order to visit the Guest Services office. 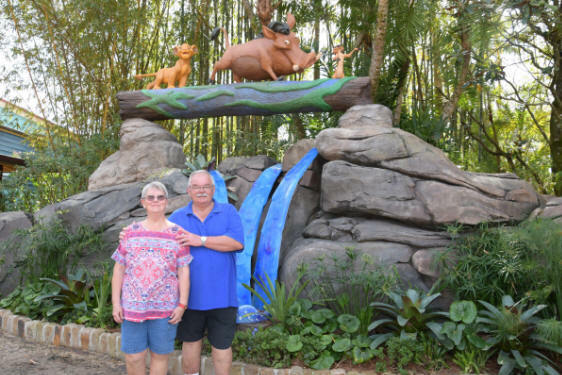 As a result of my recent complaint about our safari driver Disney had offered us some appeasement in the form of two extra FastPasses. We had to go to Guest Services to set them up. 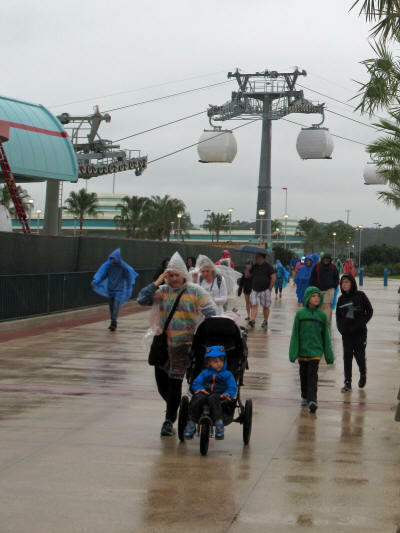 There was a heavy drizzle when we pulled into the parking lot and it continued as we walked past the new Skyway station. The cars were in motion this morning as they continue to test the new system. 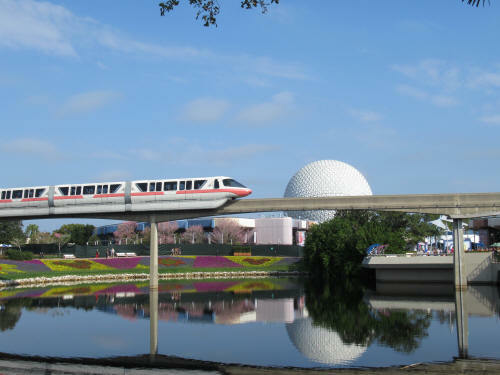 I cannot believe how much Disney is spending to install this new transportation link . . . and I cannot imagine that it will ever move enough people to justify that cost. Each car is supposed to hold about 10 or 12 people and the cars are not air-conditioned. 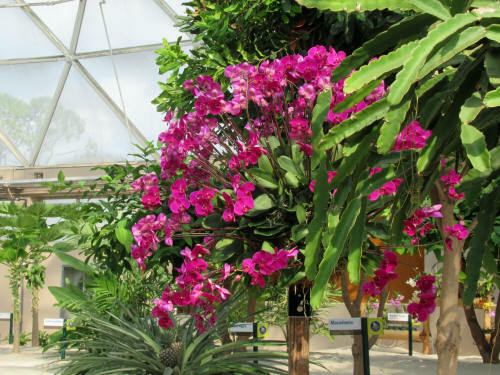 I cannot imagine hanging in a glass cage without air-conditioning in the Florida sunshine. 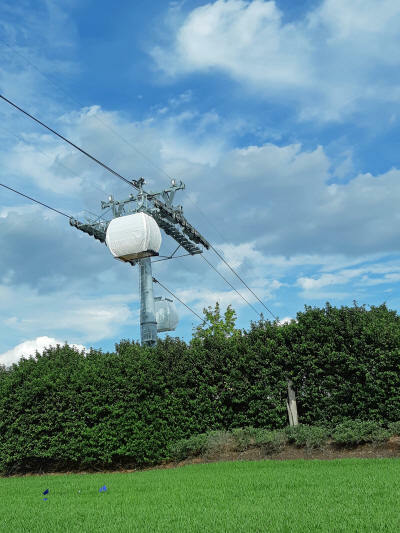 The gondolas use exactly the same system that is common on ski slopes all around the world. The cars slow down as they pass through the station, but they never stop unless there is an emergency. I suspect that when a family tries to push their Zamboni-sized stroller through the door of a moving gondola, or when Granny Clampett tries to drive her rented scooter in, an emergency will almost always arise. 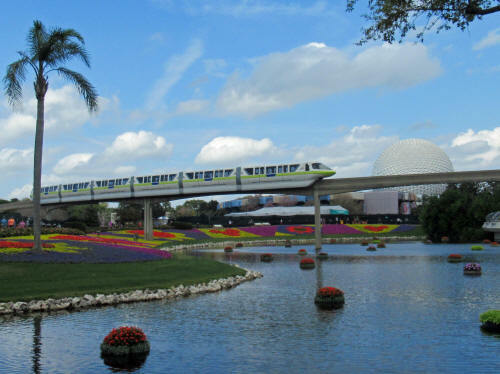 Perhaps I’m being too cynical or too pessimistic, but in my opinion the skyway is doomed to fail. It is an albatross that has yet to fly! 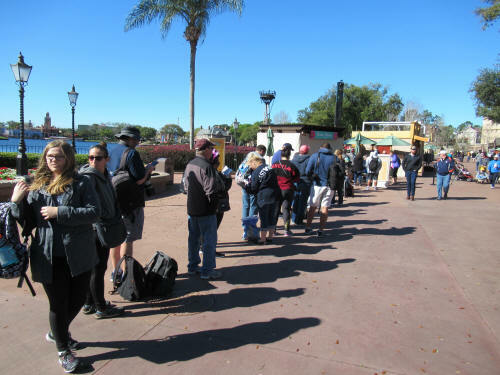 We had hoped to avoid a line by arriving early at Guest Services but the line was already well established when we got there at 9:00 a.m. Fortunately the queue moved quickly . 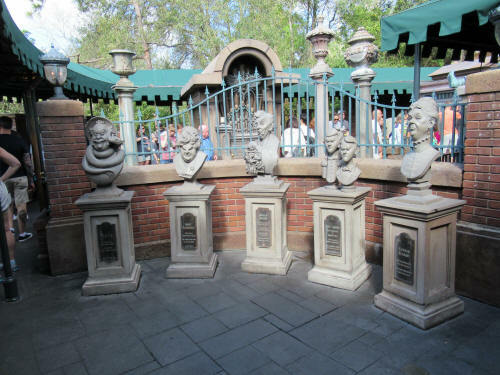 . . unfortunately the FastPasses for the rides we really wanted to see were on the ‘blocked-out’ list. 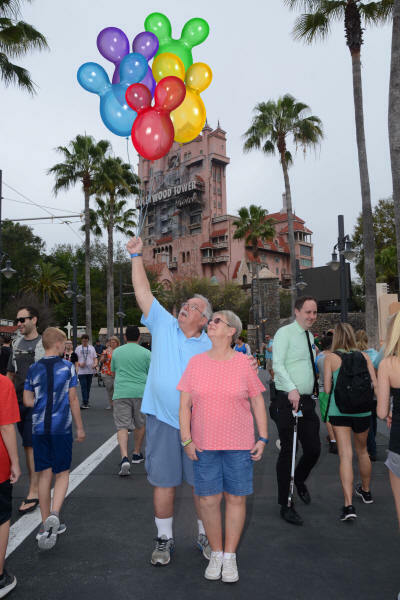 So Disney’s offer of extra FastPasses wasn’t anything more than an empty gesture today, but they don’t expire so Carol might be able to use them when she’s back in August or we both might use them next January. We’ll hope for the best! 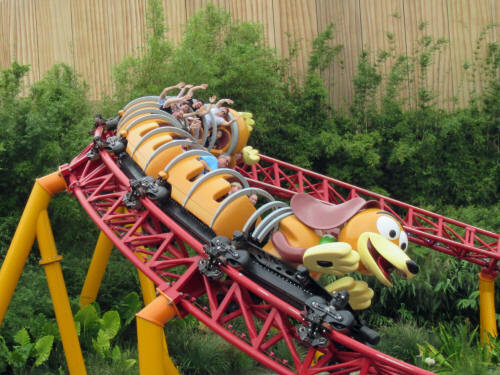 By 9:15 we had finished up our unsuccessful negotiations at Guest Services and we carried on, through a wet and un-crowded park, heading to Toy Story Land. 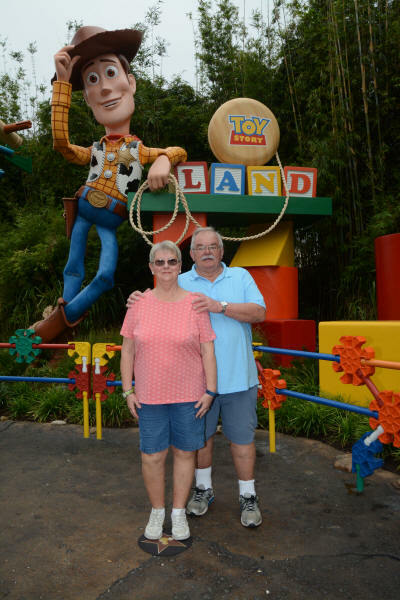 Carol had booked a few FastPasses months ago and the first was at Toy Story Midway Mania. It was raining heavily by the time we got there! The FastPass queue was empty, but it is incredibly long. 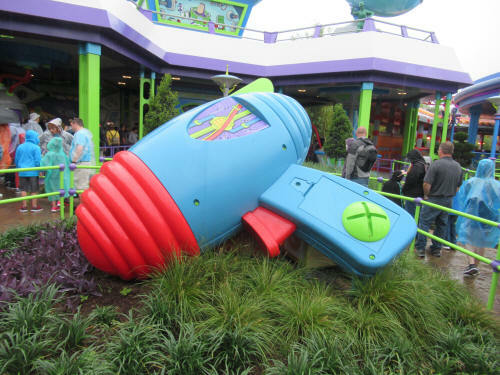 To make the existing attraction a part of the new Toy Story Land they had to move the entrance to an area that had previously been the rear of the building. 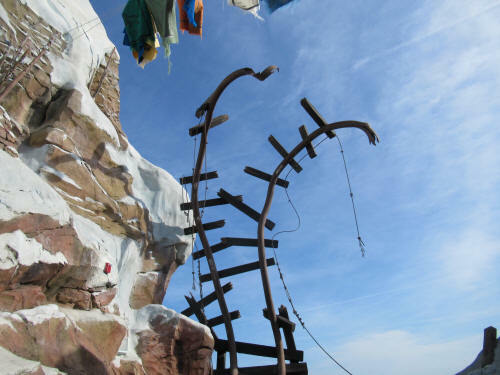 That means that once you enter you have to thread your way all around the perimeter to the opposite side of the structure to board the ride vehicle. This old geezer was tuckered by the time we began our ride. Then when we were done we had to thread around to the other side to find the new exit . . . whew . . . it’s a long way! 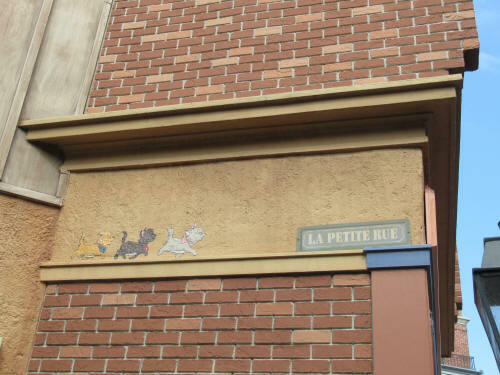 Fortunately there is some cute artwork along the way to distract you from your exhaustion. 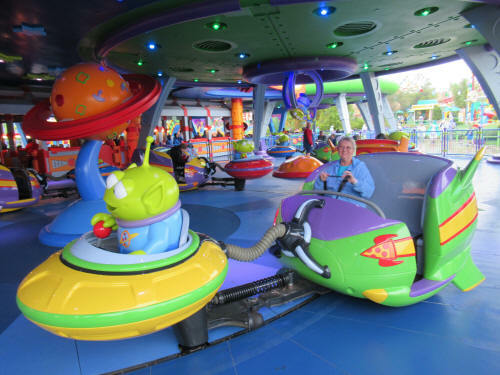 The one FastPass we had really hoped to get at Guest Services earlier was for Alien Swirling Saucers. 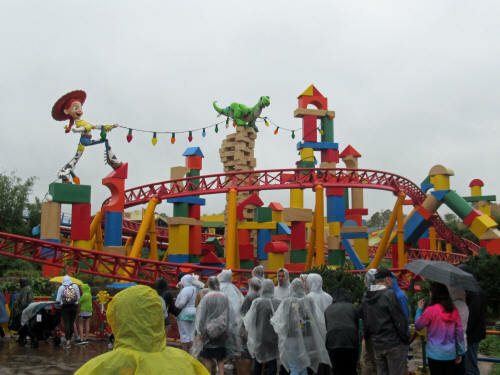 It was one of the ‘blocked-out’ rides, as were both of the other rides in Toy Story Land. 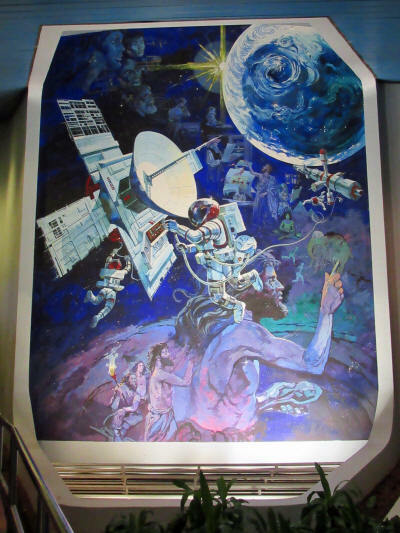 The standby line for the Saucers was shorter than we had ever seen, only 35 minutes. No doubt because of the rain! We decided to join the queue and take advantage of the short wait time. Carol flipped up the hood on her poncho and handed me her umbrella. I don’t normally like to carry an umbrella but in today’s steady downpour I made an exception. It helped me stay somewhat dry. 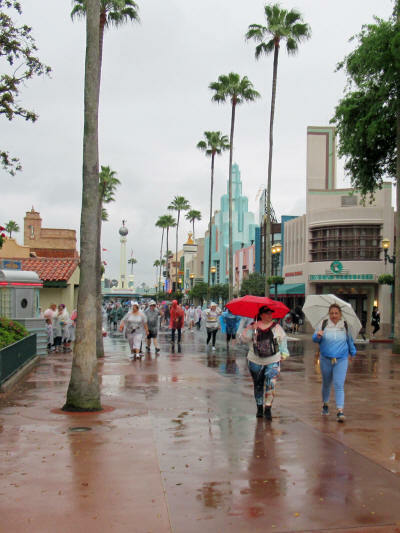 Before long we had moved to the covered part of the queue area and I could take a few photos without risking a drenching! 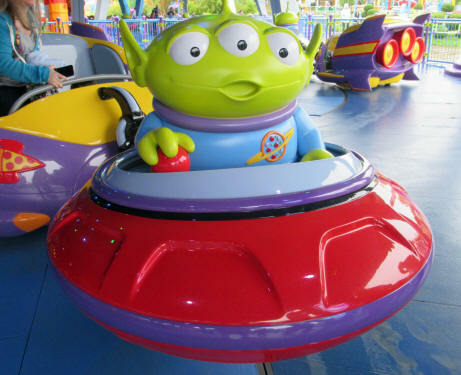 It’s a very cute ride. 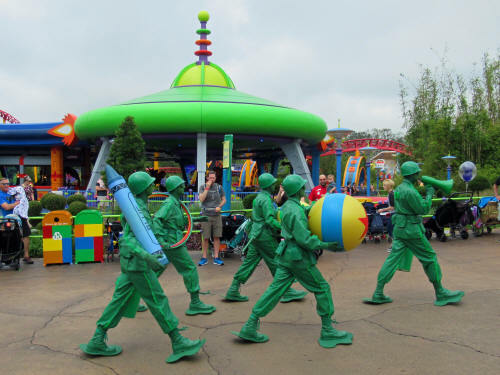 The track is identical to Tow Mater’s Junkyard Jamboree at Cars Land in Disneyland’s California Adventure Park, but Tow Mater and his tractors have been replaced by the little green aliens from the Toy Story movies. 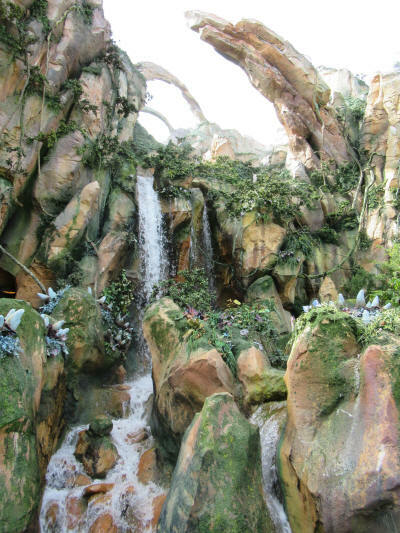 The theming is very well done! 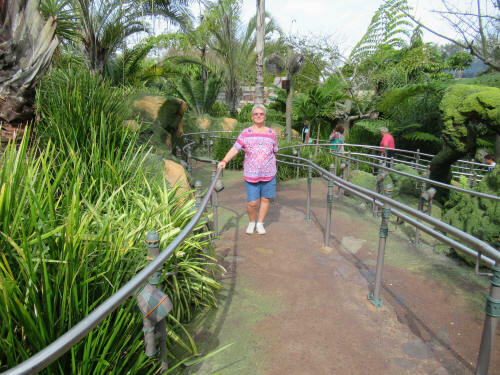 Carol gave it a ‘hand’s on’ trial and she approved! By 11:00 a.m. we were damp and chilly so we decided to skip our last two FastPasses and head out. 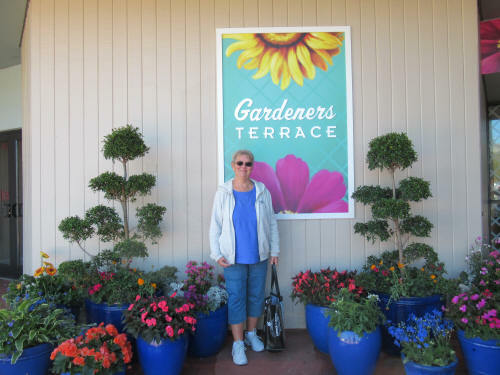 Carol browsed through a few of the shops as we made our way to the exit. I took advantage of the light crowd to get a few pictures while she shopped! We met at the Crossroads of the World and plodded and sloshed our way through the parking lot. We pointed our car westward and made our last stop of the trip at Property Control. Very little had changed since our last visit, but Carol did find a good bargain on an Alex and Ani bracelet. We had lunch at Chik-fil-A and got back to the campground at about 12:30. 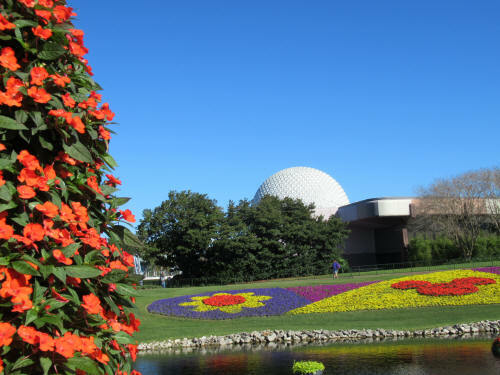 We wanted to get as much packing as possible done today so we’ll be able to spend as much time as we can at the EPCOT Flower & Garden Festival when it opens tomorrow. 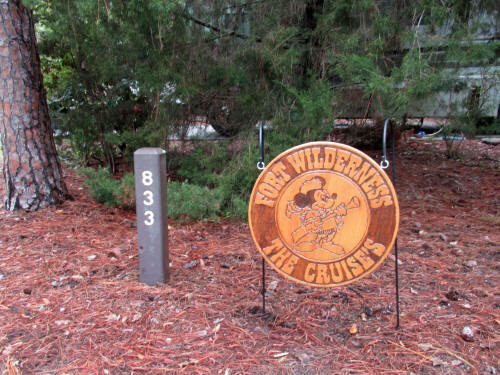 We took the last Mickey Mouse lamp post apart and delivered it to our friend Hilda, took down all the exterior lights and our wooden campsite sign. Carol wiped all the sand and grit off the many extension cords while I cleaned up the rope lights that lined the concrete pad of our site. Carol packed up the inside of the camper, filling two big plastic totes and a laundry basket with our clothing, food and all sorts of little stuff. I packed some of our gear away in the car and got the back seat all set up to house the dogs for our two-day trip home. By 3:00 p.m. we had done all of the pre-packing we could; it was time for a nap! 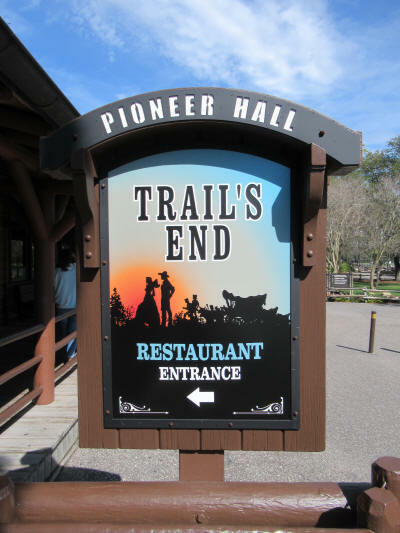 We had a 5:40 dinner reservation at Trail’s End Restaurant here at the campground. It was so cool when we took the dogs out before dinner that Carol had to pull my jeans out of the tote she had packed them in. It was a damp 59 degrees, much too chilly for shorts! We even turned on the furnace in the trailer! We always enjoy dinner at Trail’s End and tonight was no exception! Our server, Joy, was terrific. 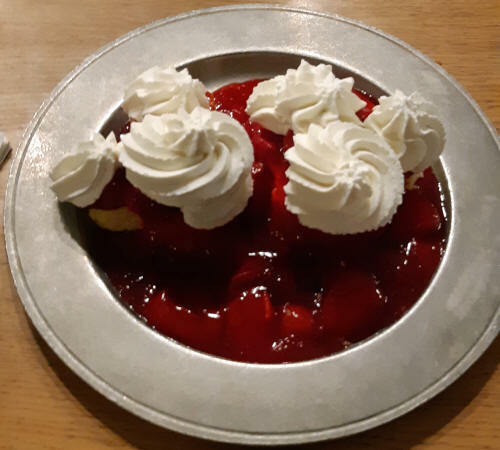 She told us that the dessert table had changed about a week ago and the strawberry shortcake had been replaced by strawberry tarts. We both tried the tarts and neither of us finished . . . they were nowhere near as good as the shortcake. When Joy saw that we were disappointed she went to the kitchen and prepared a special dessert, just for us. 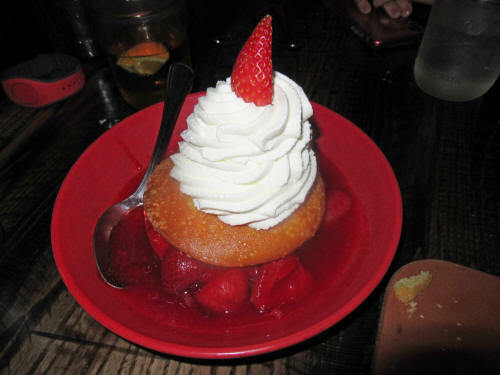 It was a double portion of the strawberry shortcake served at the Hoop Dee Doo Musical Revue. We were both full after a nice meal, but we really appreciated Joy’s kindness so we forced ourselves to finish it. Thanks Joy! We were home at about 7:15 and spent a quiet night with the dogs. It took a couple of hours for the strawberry shortcake pains to subside! Brrr! It was a cold morning, 45° with a forecast high of 59° in the afternoon. 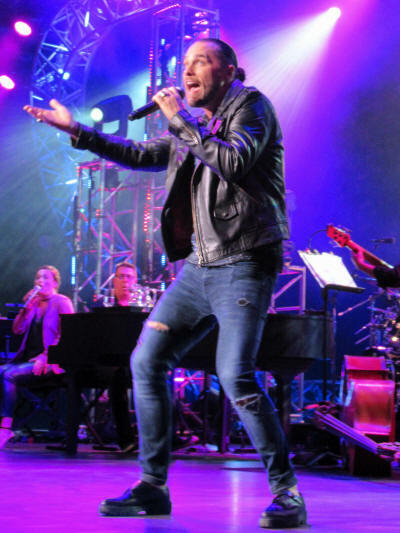 It would definitely be a ‘jeans and jacket’ day! We drank our morning coffee inside. 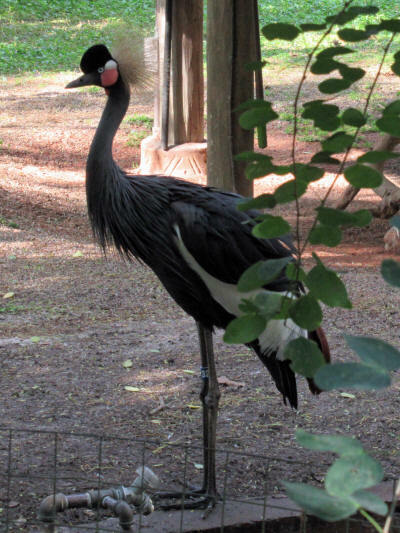 Carol saw a large bird land in a nearby tree and went to investigate. She was soon back and asked for the camera. Before I had time to join her she was back; she had spotted an owl but folks walking a dog roused it just before she could snap a picture. Too bad! 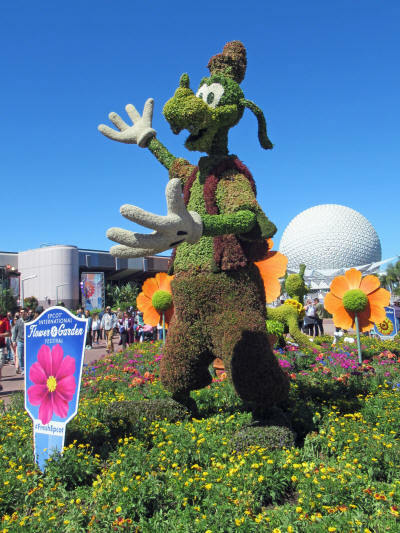 We walked the dogs and left for EPCOT at 8:40 to enjoy the first day of the annual Flower & Garden Festival. 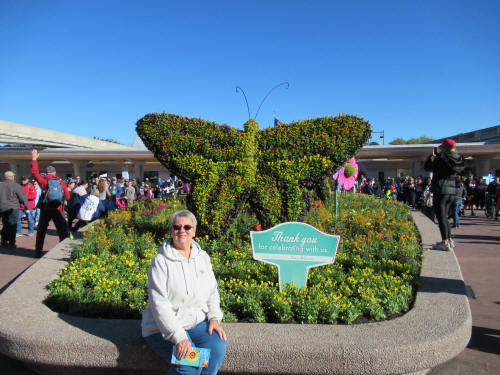 When we arrived at the park at 9:00 Carol headed straight to Pin Central and joined the big line for Limited Edition pins for the Flower & Garden Festival that were being released that day. 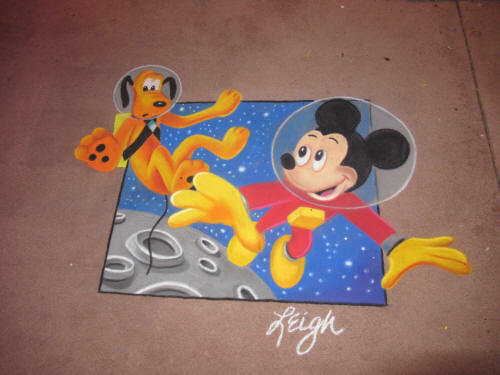 I went to Mouse Gear for the Annual Passholder magnets featuring Pluto, they were also a brand new release! 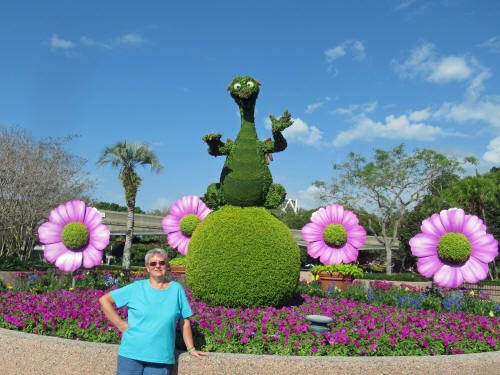 Carol still waiting for pins when I got back with the magnets so I walked up concourse taking pictures. 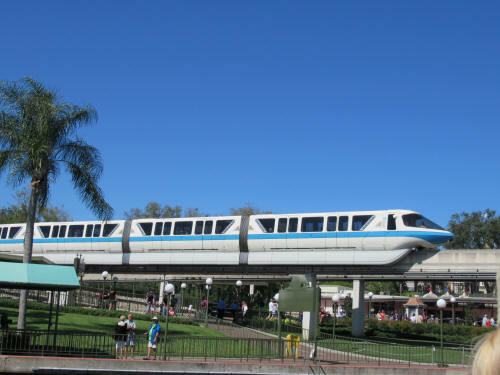 Just after I took this picture of the monorail I noticed a line forming at the Citrus Blossom kiosk. 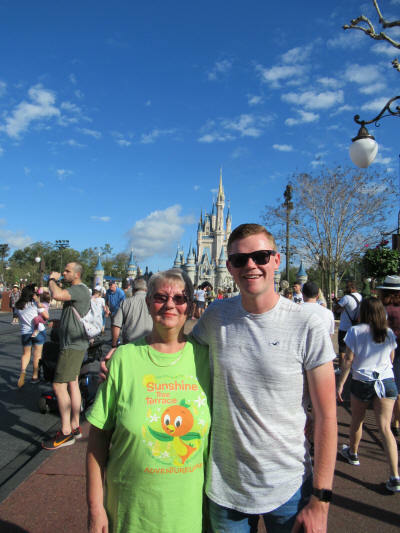 They were serving an orange slushy drink in a new Orange Bird sipper cup and I knew that Carol wanted some cups so I got in line at 9:30, only about 40 people back from the kiosk. 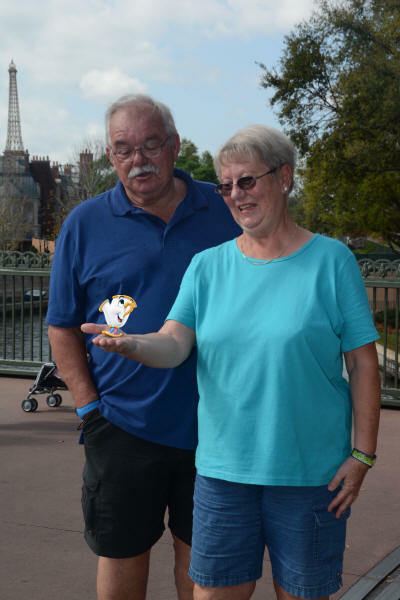 Carol came about a half-hour later with the pins she wanted and joined me in the sipper cup line. It’s really hard for people who aren’t Disney collectors to understand, but the line stretched all the way back past the Port of Entry shop. It was huge! There had to be more than 300 adults lined up to buy little plastic sipper-cups! Fortunately there were a few people we knew in the line with us, so we had some time to chat with them. 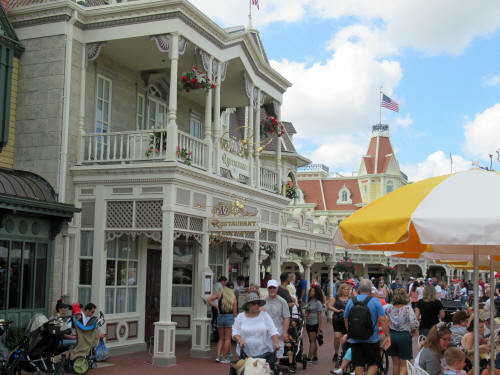 I had been standing in that line for 90 minutes when the shop opened at 11:00 The line moved quickly and soon we were enjoying our sipper cups filled with Orange Cream Slushy. The drink was tasty but very sweet. 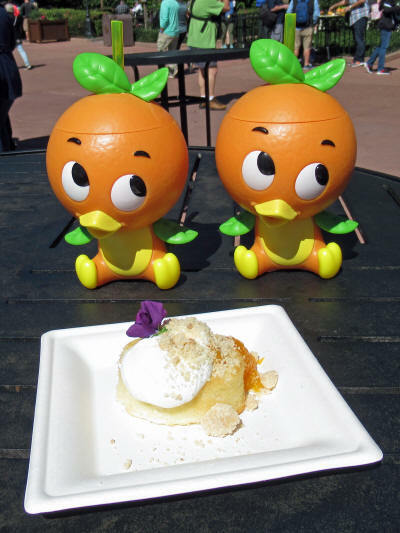 The Orange Shortcake we shared was also very good. 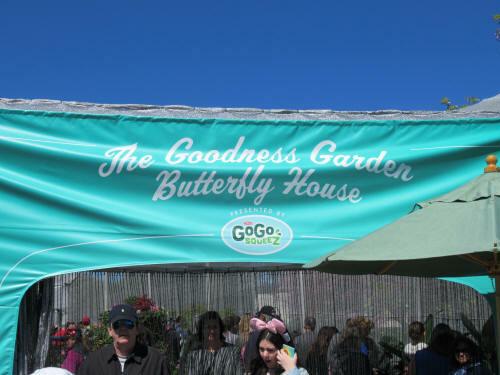 We walked on through the Rose Garden to the Butterfly house and checked out all the butterflies. It was still very cool so they weren’t as active as they would be later in the day. We carried on across the concourse to the old Odyssey Restaurant building. 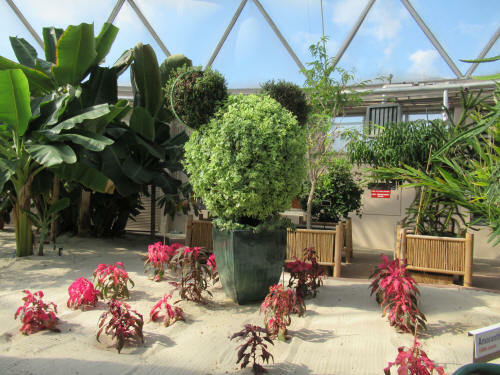 It is housing the Festival Centre this year. 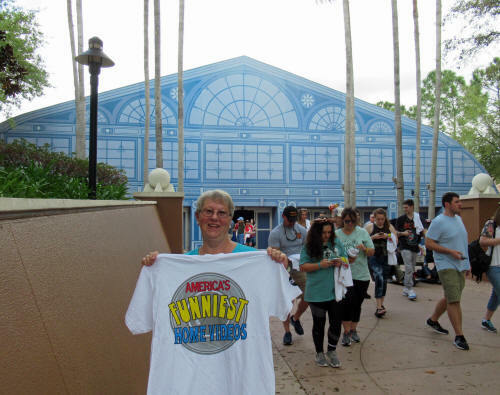 Carol lined up for some more ‘special’ merchandise she just had to have. 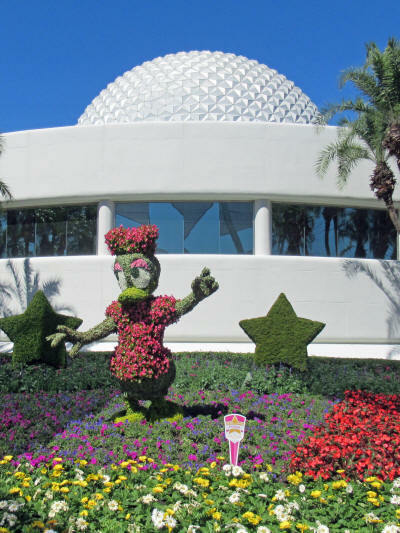 She picked up an Annual Passholder Mug and MagicBand, a Minnie Mouse watering can, a fridge magnet and a Flower & Garden Festival Trash Can salt shaker. No home should be without a trash can shaker! 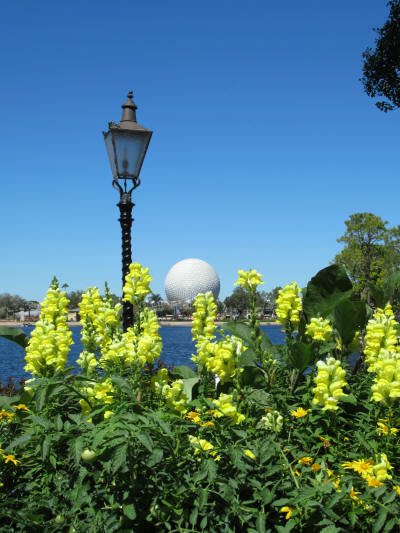 It was noon when we finished shopping and began our clockwise trek around World ShowCase. 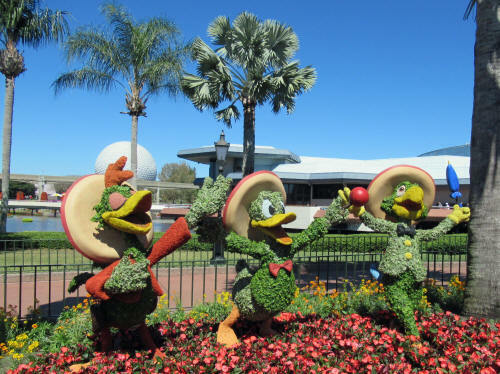 We started at Mexico and slowly strolled through the nations admiring all the topiaries the floral displays. We located all but one of the bees that are on display at a dozen different spots around the park. There is a scavenger hunt game, when you find them all and fill all the squares on your scavenger map with stamps you can exchange the map for some snazzy sew-on patches. Spike the bee can be elusive sometimes. By the time we arrived at Morocco we had just missed boat and had to wait a long time for the next one. Carol stopped at the Port of Call shop and swapped her scavenger map for patches while I went to car and waited. She caught up soon and we were home at 2:30. Al & Jane came to see the dogs at 3:30 and we had our final visit with them. 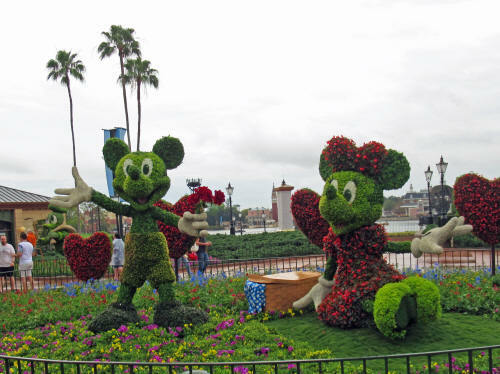 We won’t be seeing them again until June, when they hope to be at Dayton Disneyana. 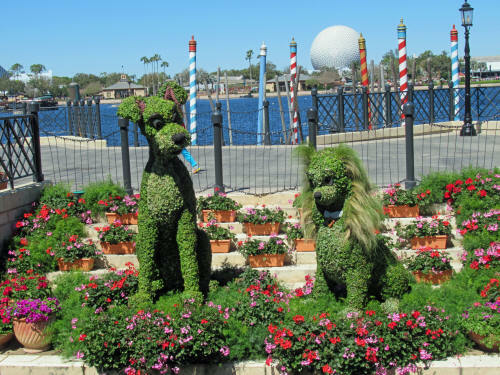 We fed dogs a bit early and left at 5:15 to return to EPCOT. 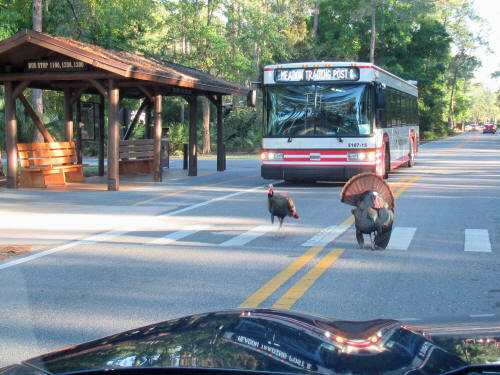 There was a bit of a traffic jam in the campground and it slowed us down for a couple of minutes! 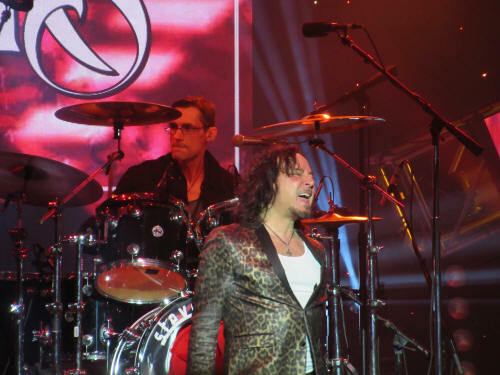 At EPCOT we caught the Friendship Boat to Morocco and walked ‘quick-step’ to the America Gardens Theatre where we joined the standby line for Steve Augeri, the former lead singer for Journey. 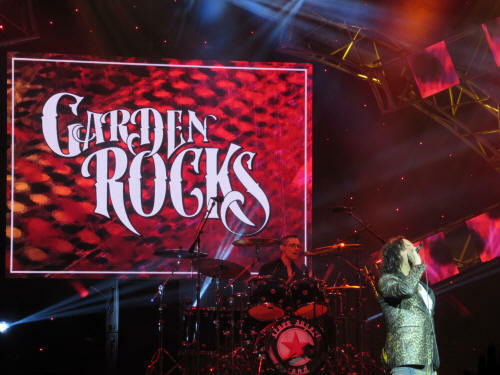 He was the first performer in ‘Garden Rocks’, a series of free concerts held throughout the Flower & Garden Festival. 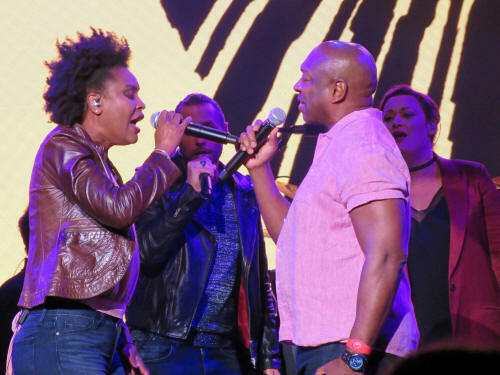 We have attended several similar concerts over the years and it’s always fun to be there . 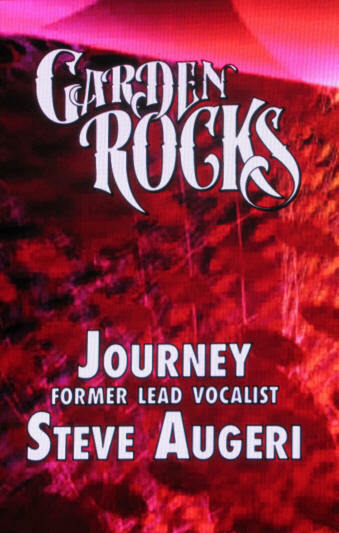 . . but Steve is another artist who we’re going to add to our list of performers who should have retired long ago! 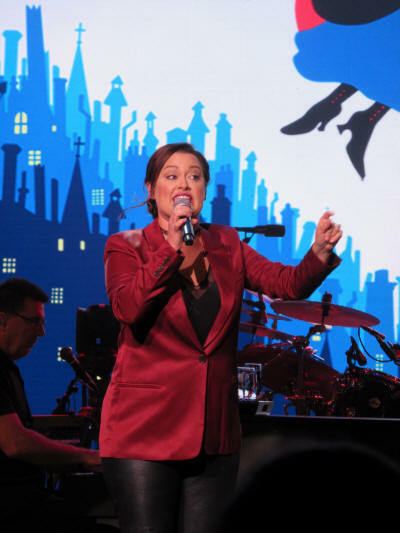 There were a few old time Journey groupies in the crowd who were having a whale of a time – but Carol and I were not among them. 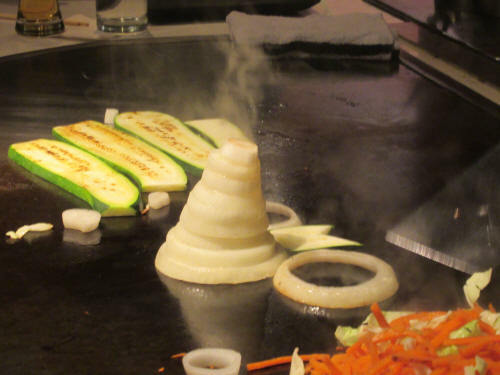 As soon as the concert was over we once again ‘quick-stepped’ – this time to Japan where we had a 7:10 reservation for dinner at Teppan Edo. We arrived about 10 minutes late and were seated very quickly! 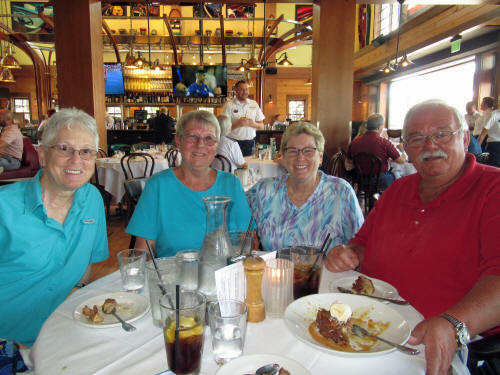 Carol and I shared our table with a family of six from Fresno California and had a nice time chatting with them. Mako was our chef and she was obviously quite new in the role. It took quite a few attempts before she finally landed a single shrimp tail in her hat! Mako was young and still learning but the meal was tasty and her ‘presentation’ was amusing! 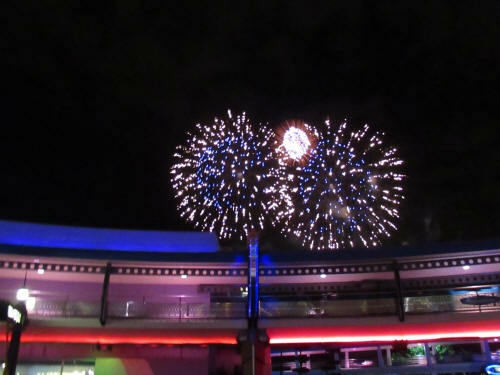 After dinner we dashed to the exit while Illuminations was underway. We made it to the parking lot before the fireworks ended so we dodged the crush of people that would follow in just a few minutes. 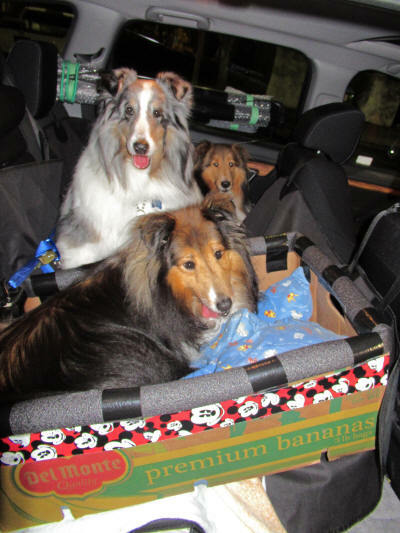 We were back home with the dogs at 9:30 and started packing the car in readiness for our trip home. We were off to bed early, there was a long drive ahead! I had set the alarm for 5:30 but we were both wide awake at 5:15. Carol and I each hit the ground running. She fed the pups while I showered, then I walked them while Carol packed a cooler for our trip and gave the trailer a final scrub. We loaded the dogs in the back seat in the ‘Jak-in-the-box’ configuration and drove away at 6:55, a full five minutes ahead of schedule. 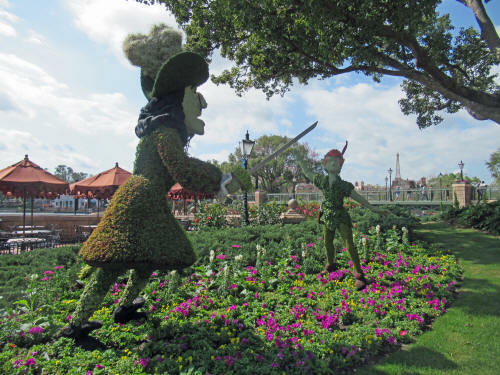 As always there was a slowdown through Orlando; the construction there may never end! 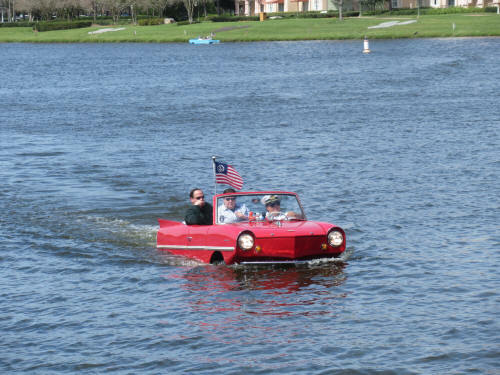 It was clear sailing across the rest of I-4 and onto I-95. In Georgia we once again spotted a series of flashy billboards for Peach World, talking about dancing peaches. “We didn’t see any dancing peaches!” Carol said. 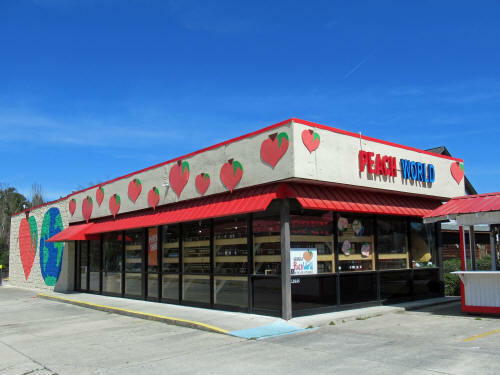 I pulled off the freeway at Richmond Hill and we found the International Headquarters for Peach World. That little lean-to on the side of the gas station we stopped at on February 11th was just a small ‘branch-office’. We gave the dogs a stretch and Carol bought a great big jar of canned peaches to bring home. We sat in the parking lot and ate our sandwiches that Carol had made the night before. Even if you don't speak English you should know that you're at Peach World! The rest of the day was a blur of asphalt, gas stops and rest areas. Traffic moved well everywhere except Charlotte North Carolina where we always seem to hit rush hour. We may have to adjust our schedule next time so that we pass through Charlotte a few hours earlier! Our 680 mile drive ended as we pulled into the Red Roof Inn at Wytheville Virginia at 7:15. 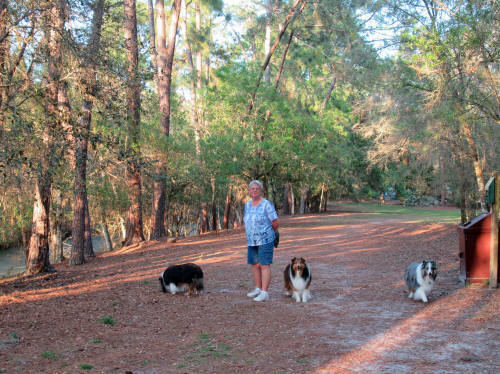 Carol walked the dogs and fed them while I dashed off to the Peking Restaurant to pick up our dinner. Their fresh-made egg rolls, General Tso Chicken and fried rice made a nice meal! We watched a bit of TV and tottered off to bed early. We had 733 miles to travel today so the stops were quick as could be! Traffic was light and the weather was clear so we made good time! We encountered a snow shower around Staunton Virginia and had to slow down to 60 MPH for about 30 minutes; then the snow stopped, the road cleared and I reset the cruise control to 75 MPH. We stopped for a quick lunch at Burger King in Lickdale Pennsylvania where we found a booth beside the window, overlooking the dogs in the car right outside. 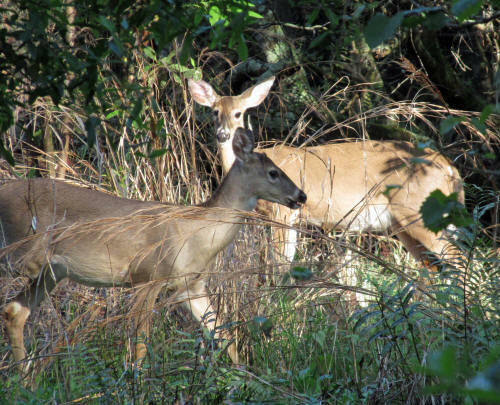 In New York State, between Binghamton and Syracuse, Carol spotted a few deer on the hillsides along the road. There were enough of them that soon she started counting . . . when she got to 50 she stopped counting! There had to have been about 200 deer in a stretch of about 15 miles. There were so many of them that a driver ahead of us was entering them in the Waze program and our GPS was alerting us regularly. Our only shopping stop was at the Christmas Tree Shop in Mattydale New York. Carol was unbelievably quick; she was done shopping before I was done my restroom stop! There was a short line at the border and after a few quick questions we were back in Canada at 6:30. We crossed the final span of bridge over the St. Lawrence River and pulled into our driveway at 7:00 p.m.
Carol fed three hungry dogs while I began unpacking the car! It was a great trip but it’s always nice to get home!